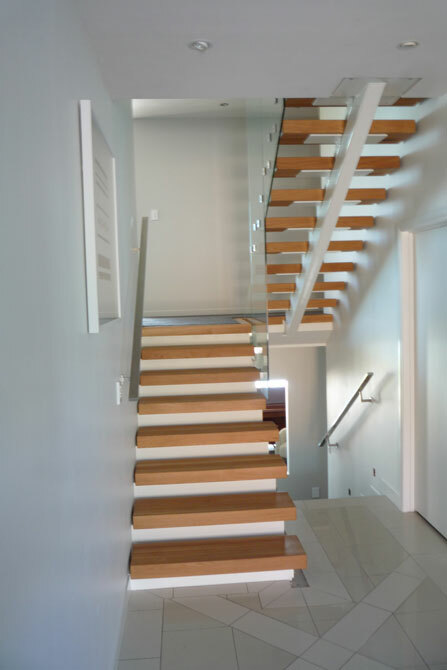 The modern marvels of architecture have helped staircases transcend practicality and functionality in order to include breath-taking stair designs that can make your stairs the focal point of your residential or commercial space. 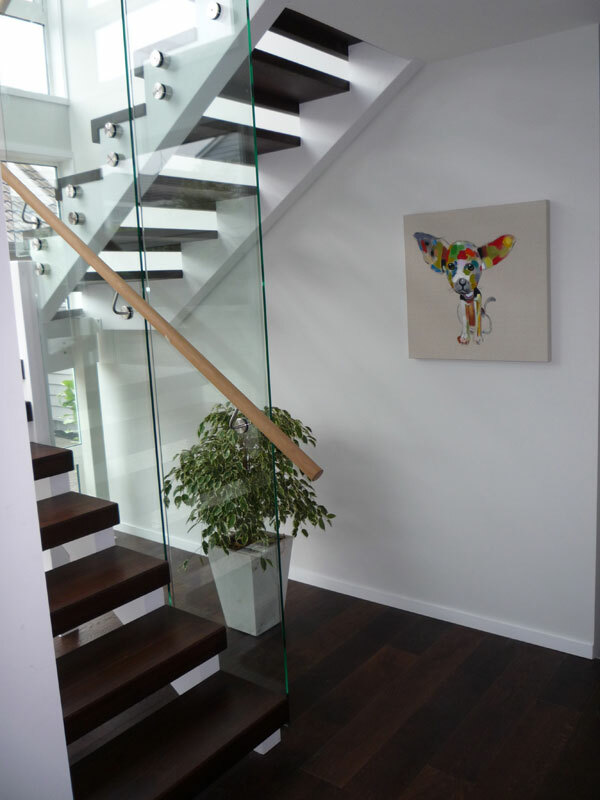 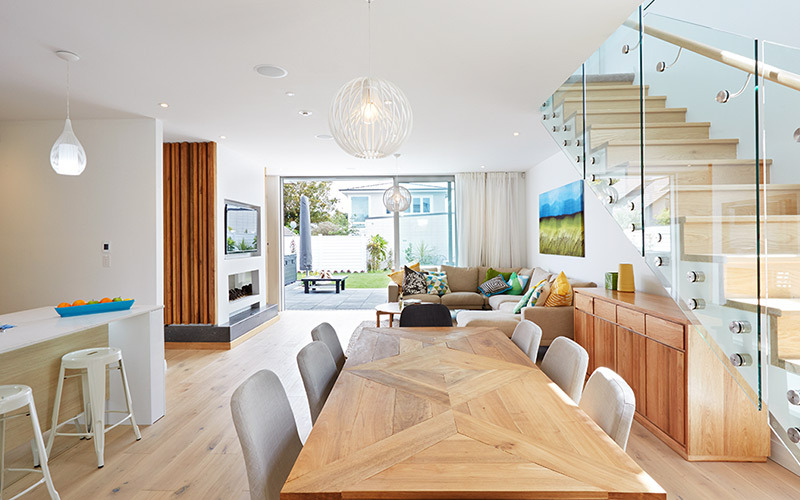 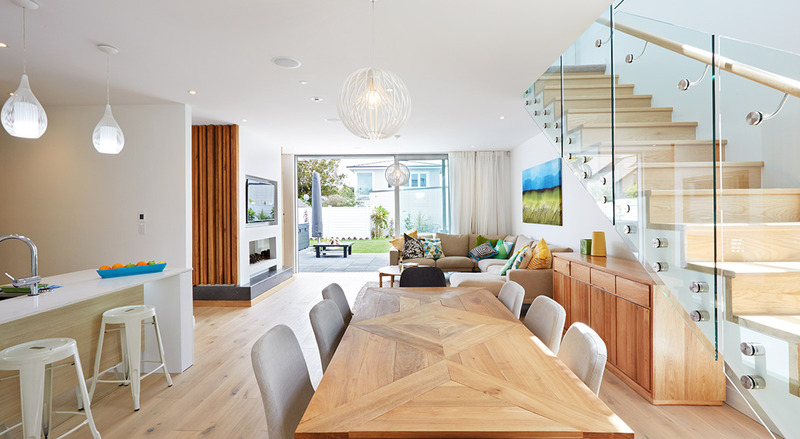 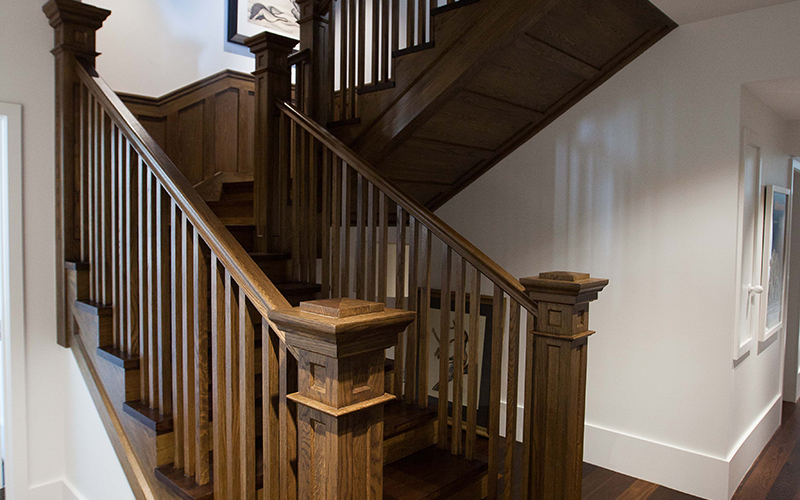 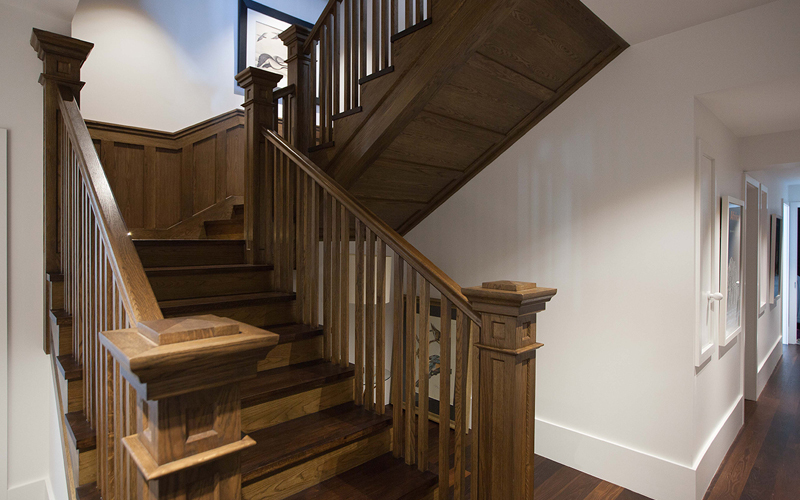 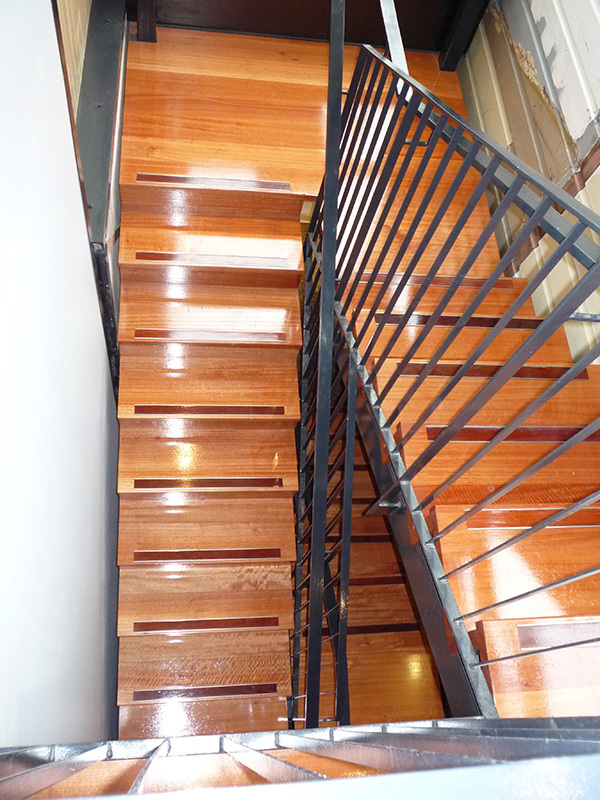 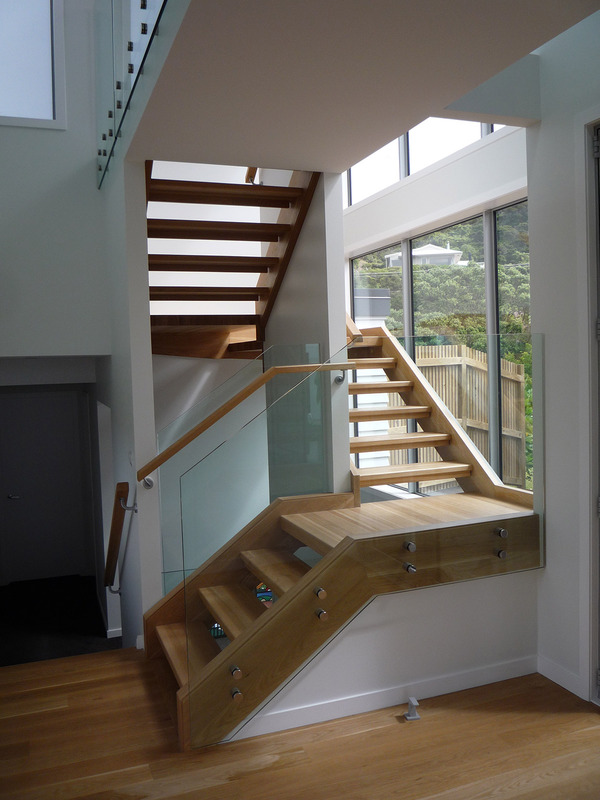 Ackworth House has been designing, manufacturing, and installing staircases in New Zealand for more than 40 years. 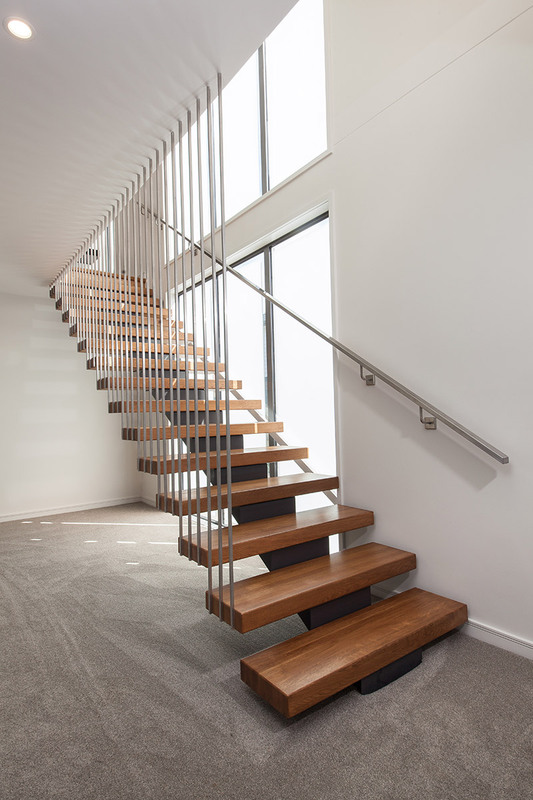 We have a vast array of staircase design ideas that can be customised to blend or to stand out in your existing architectural blueprint. 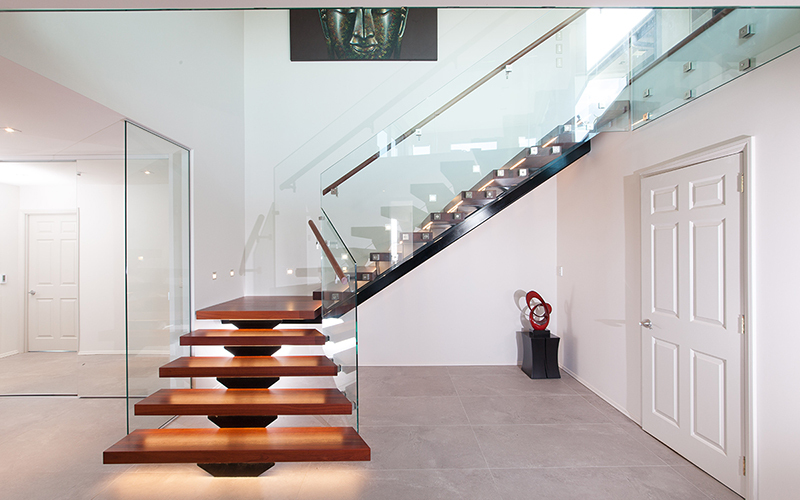 Aside from our conventional designs, our Ascendo floating stairs series has seven styles you can choose from. 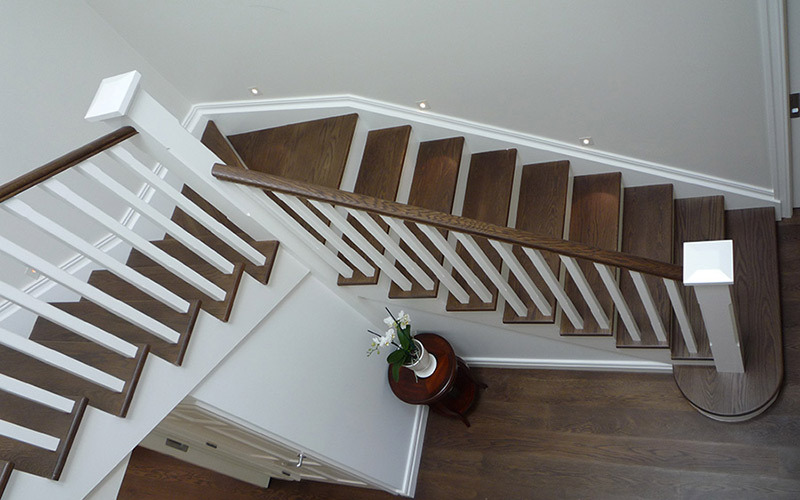 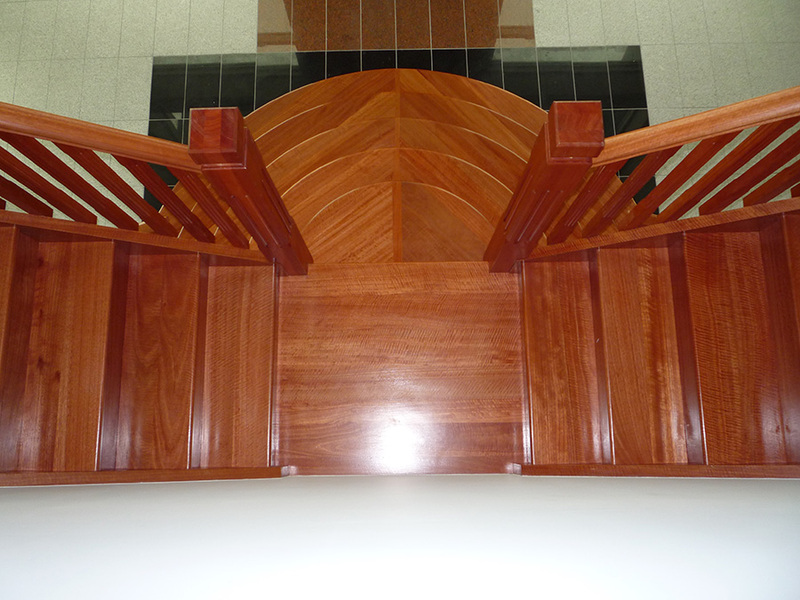 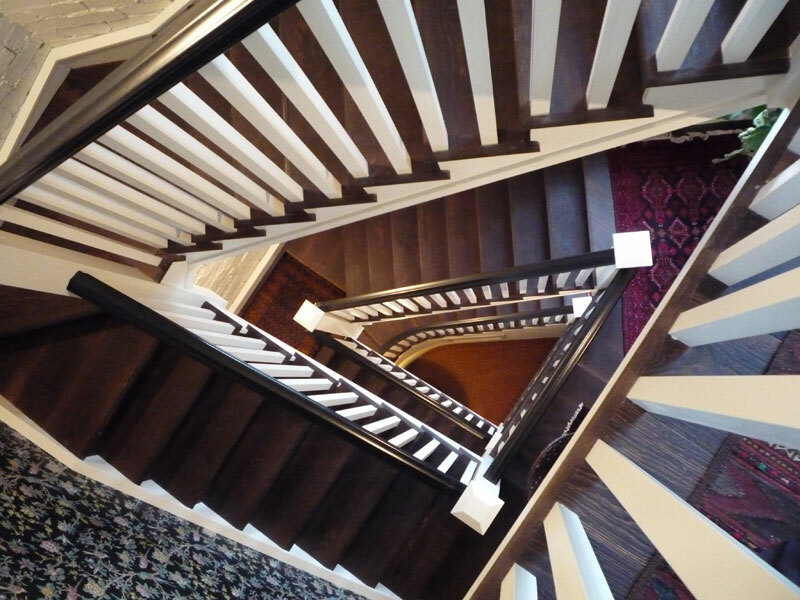 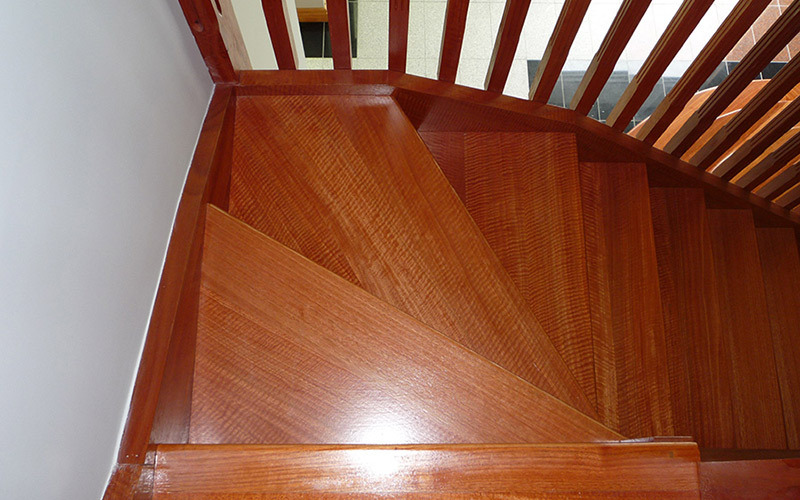 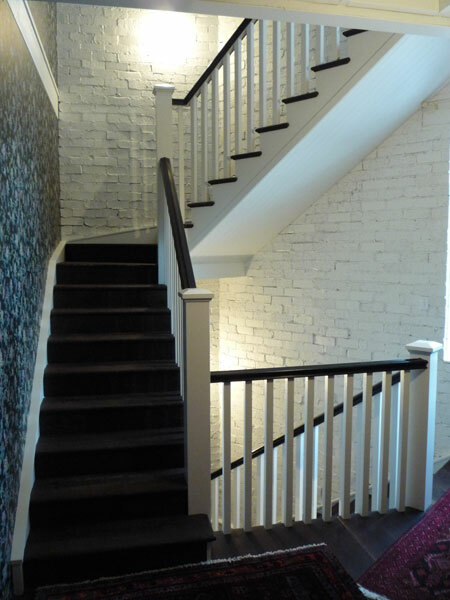 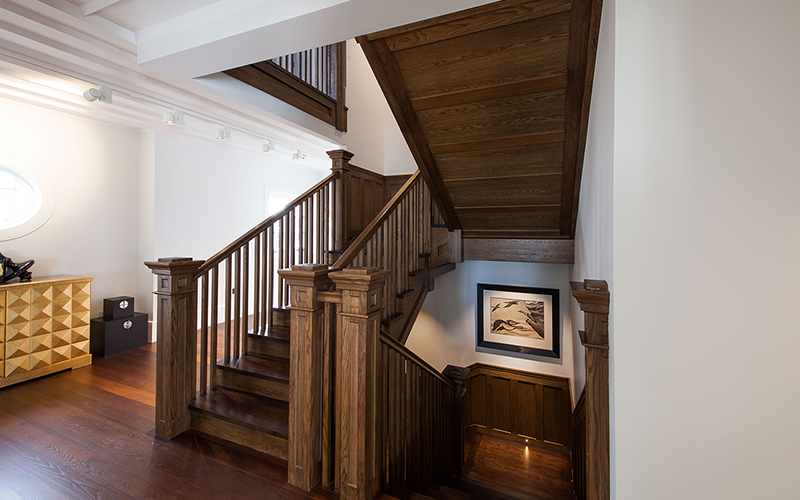 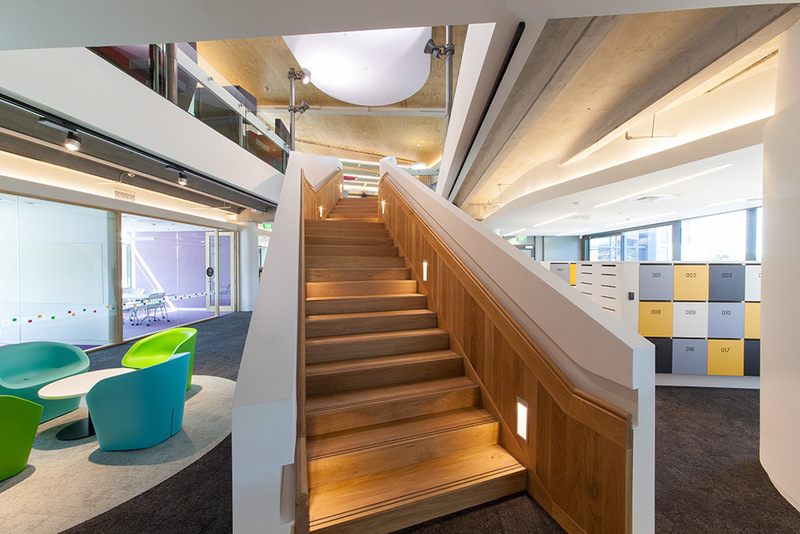 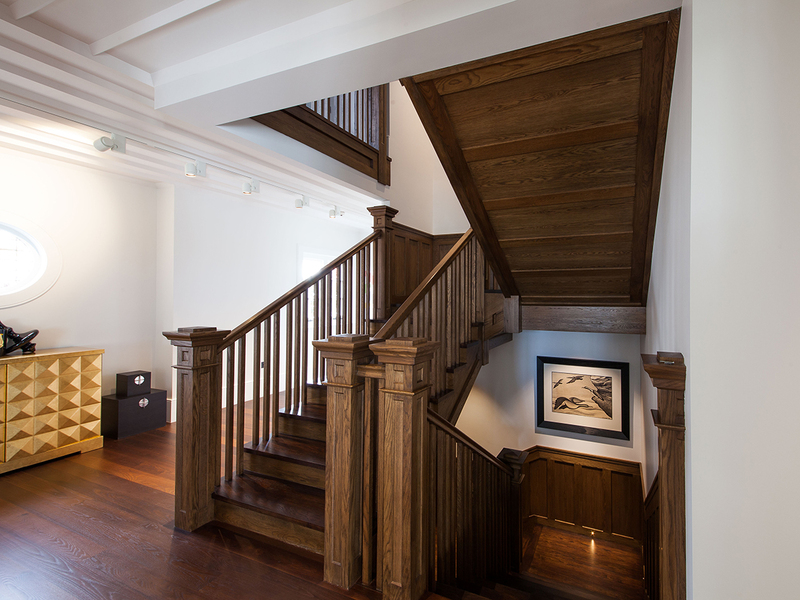 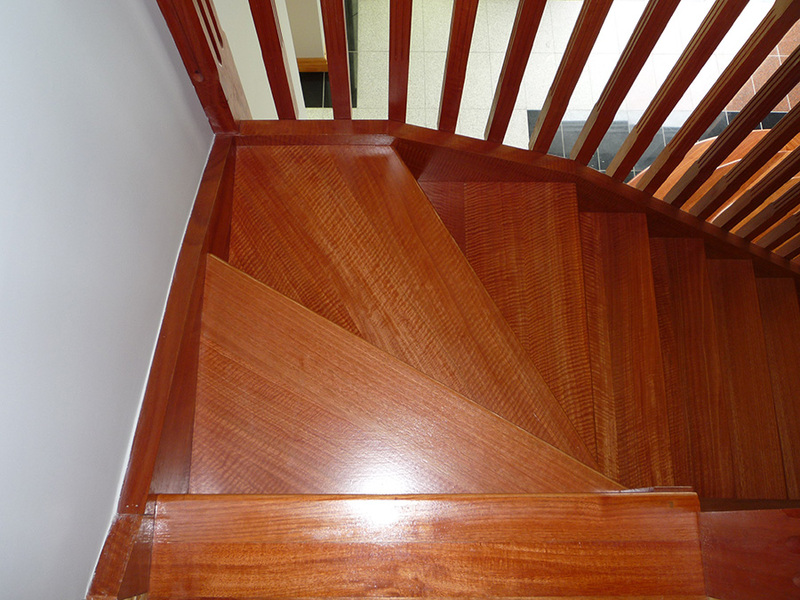 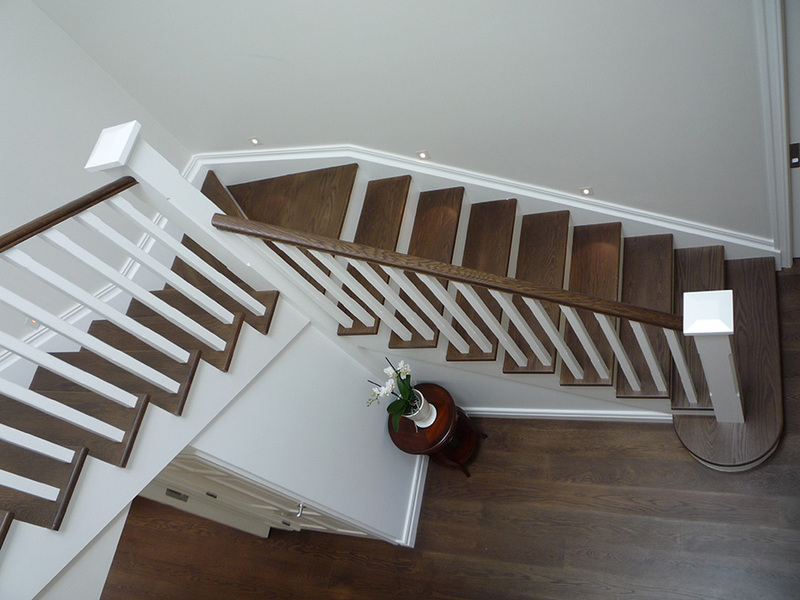 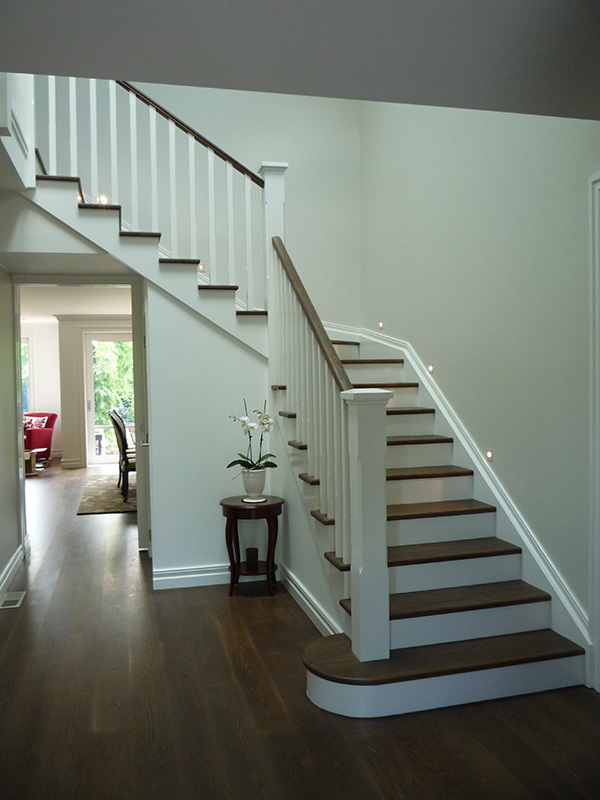 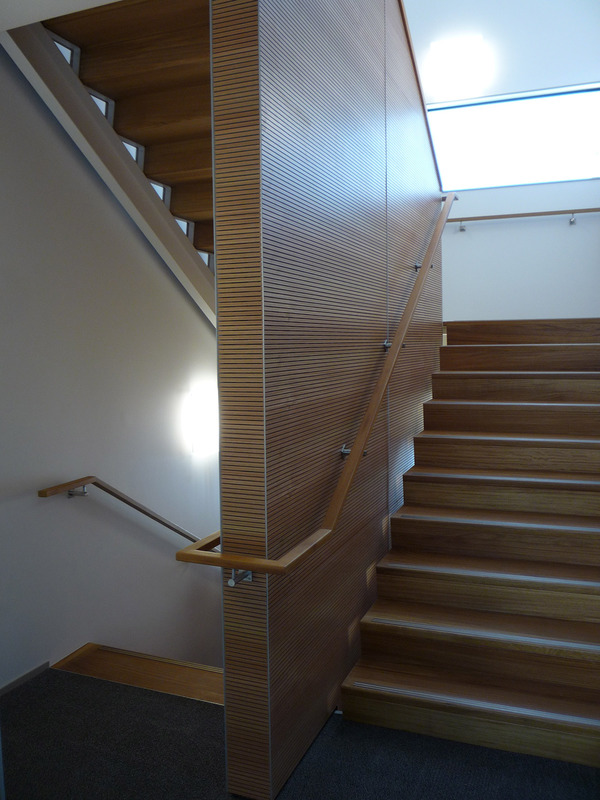 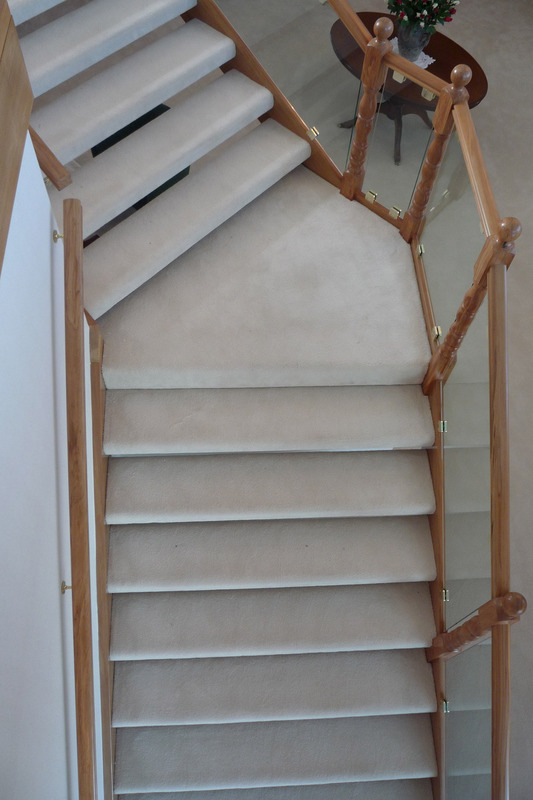 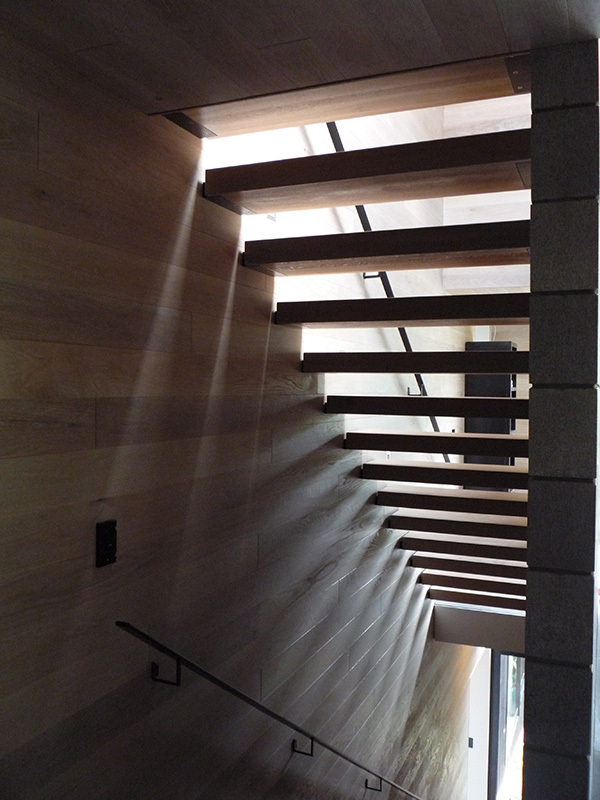 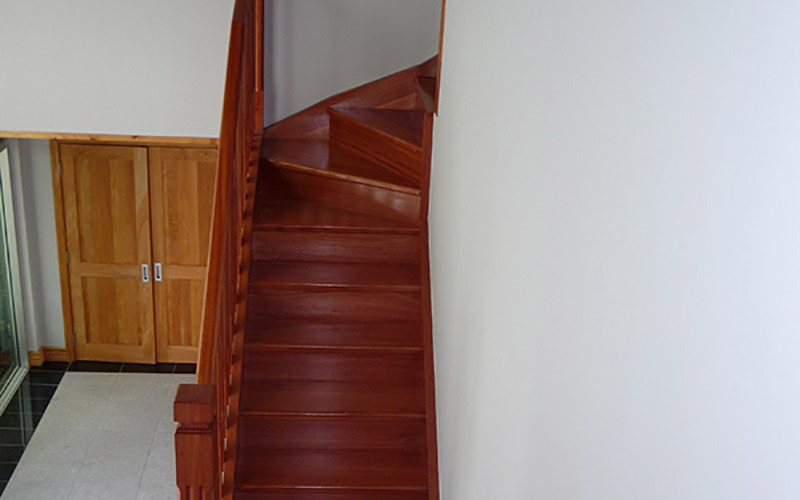 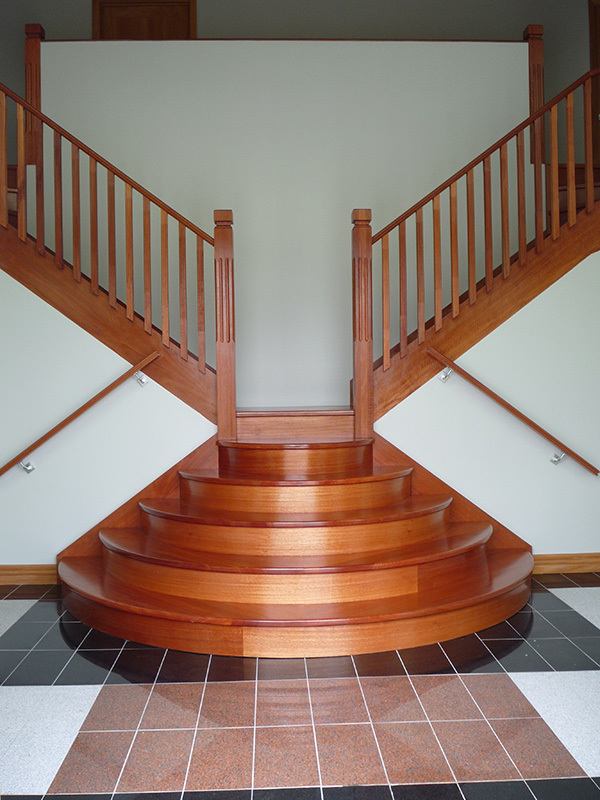 Here is a gallery of some of the staircases we have built over the years. 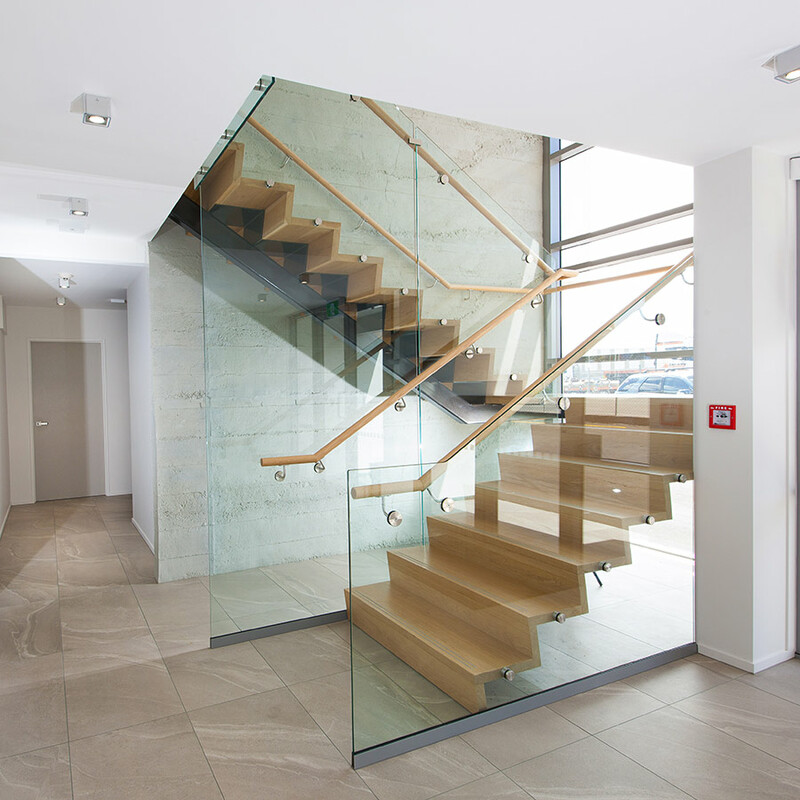 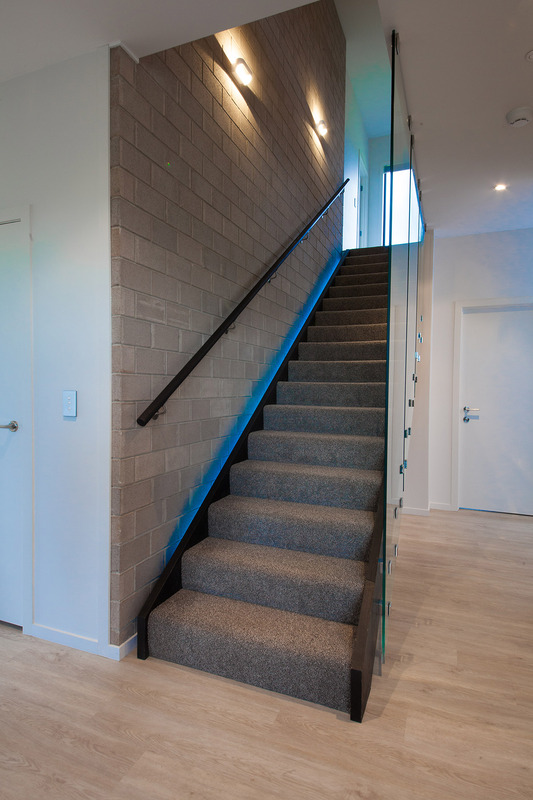 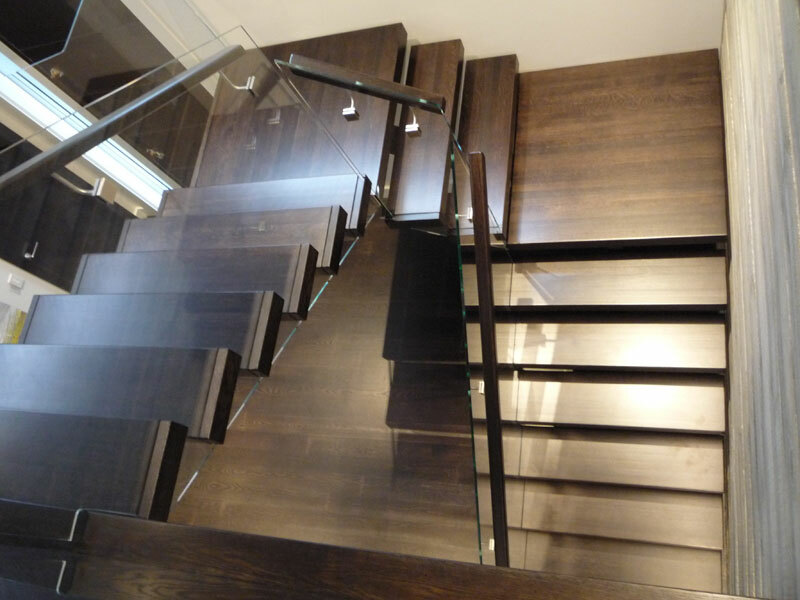 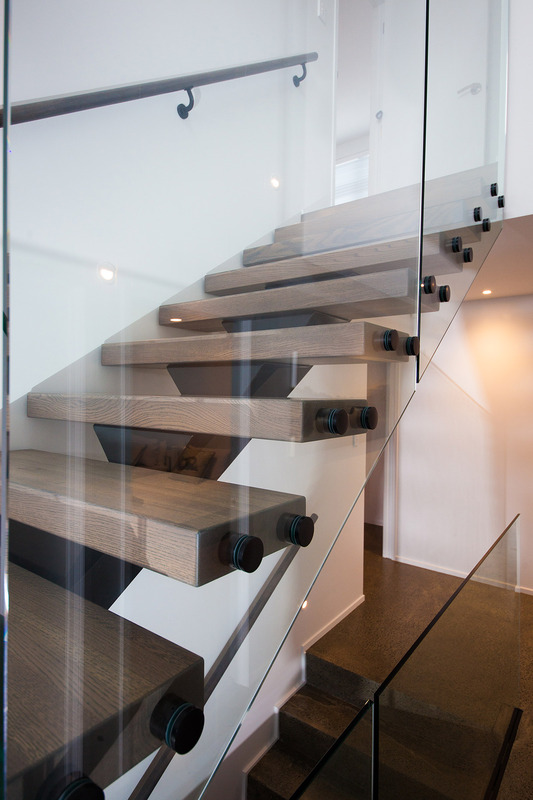 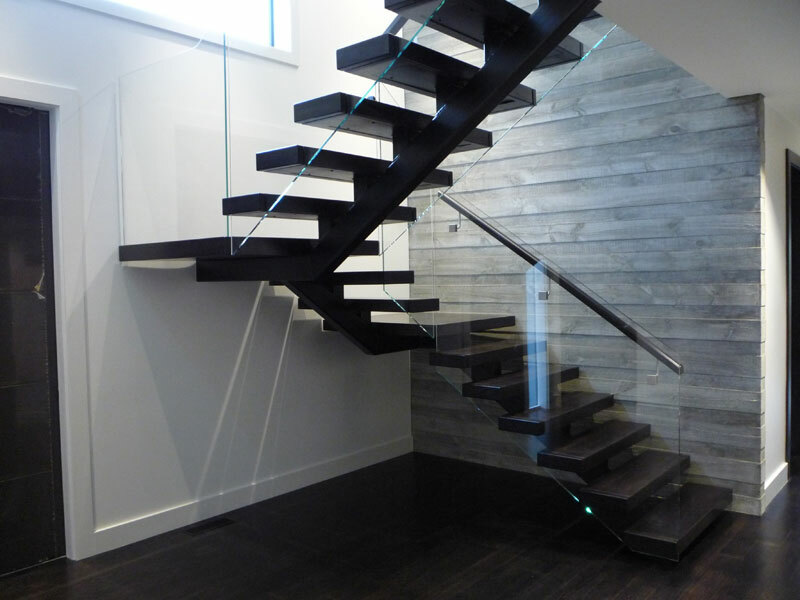 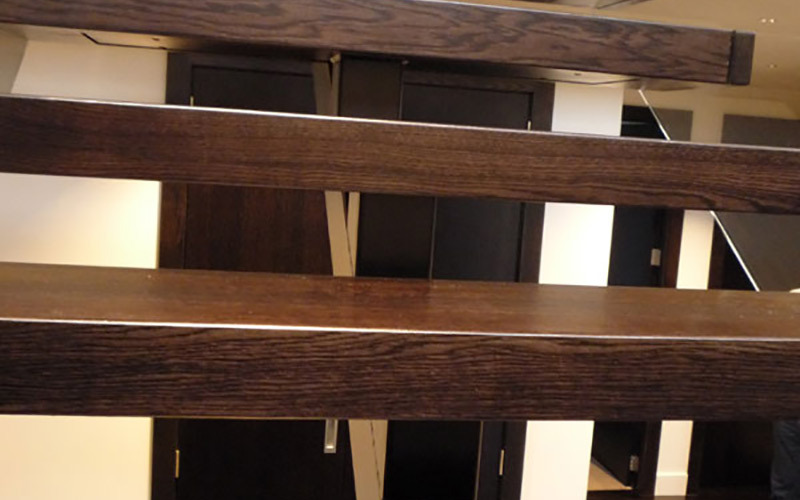 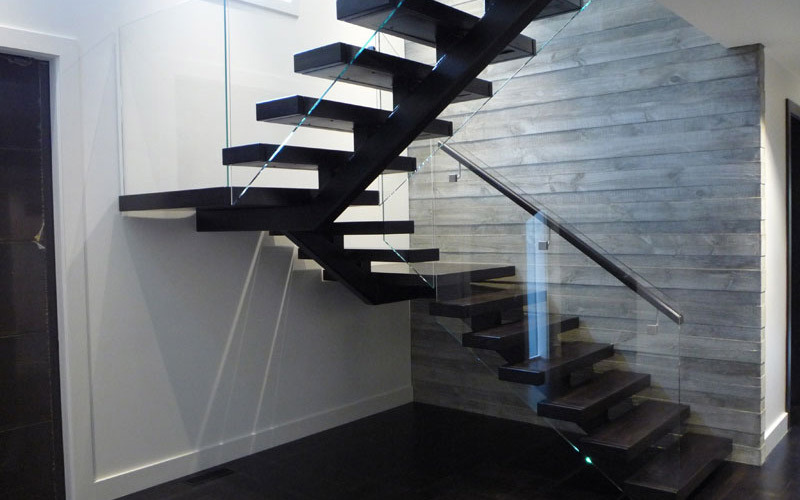 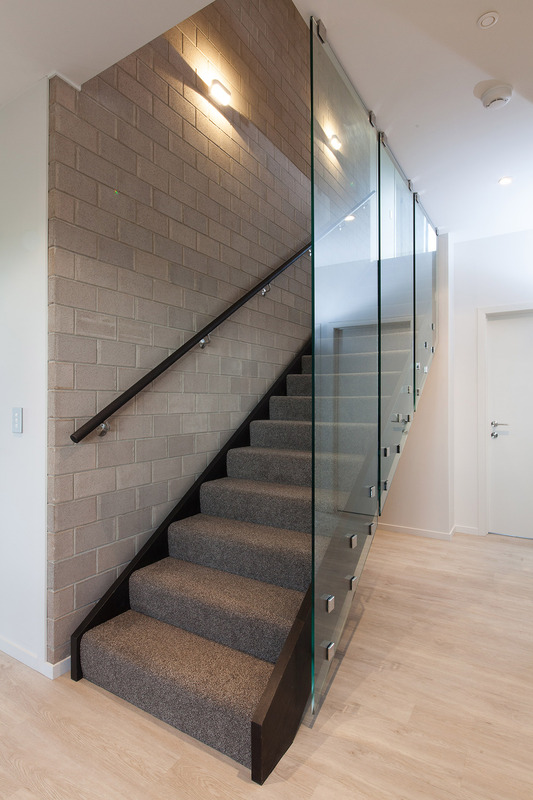 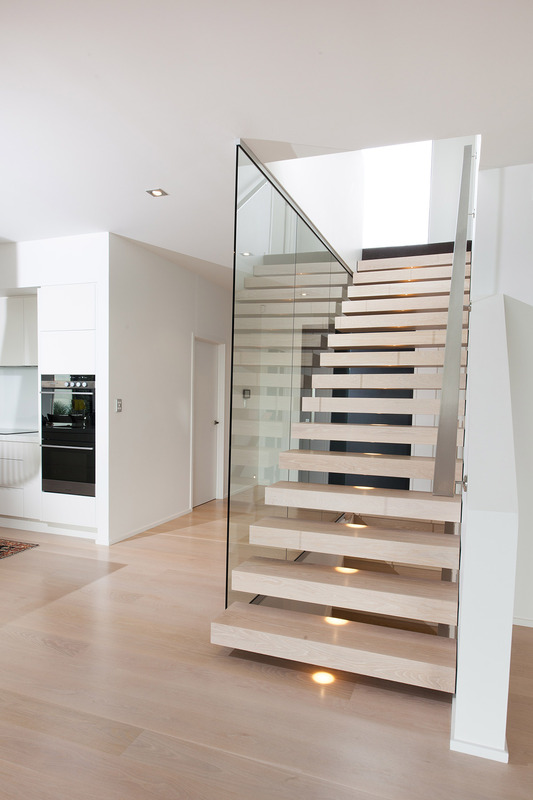 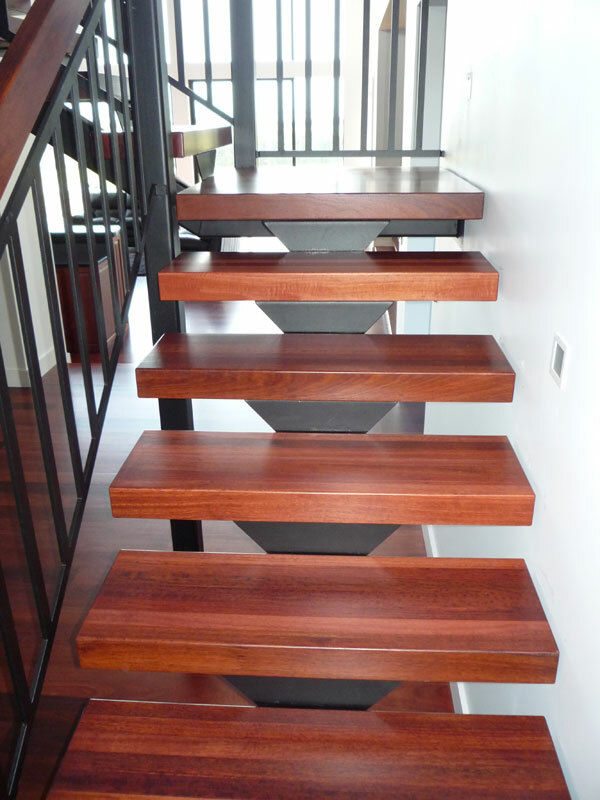 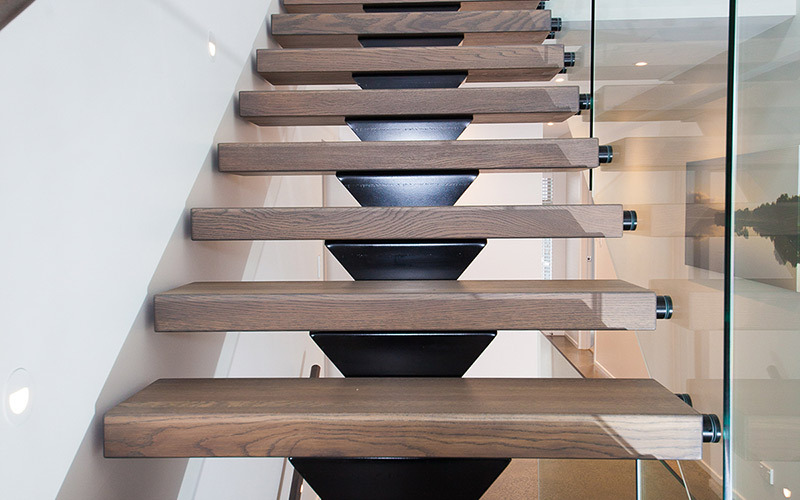 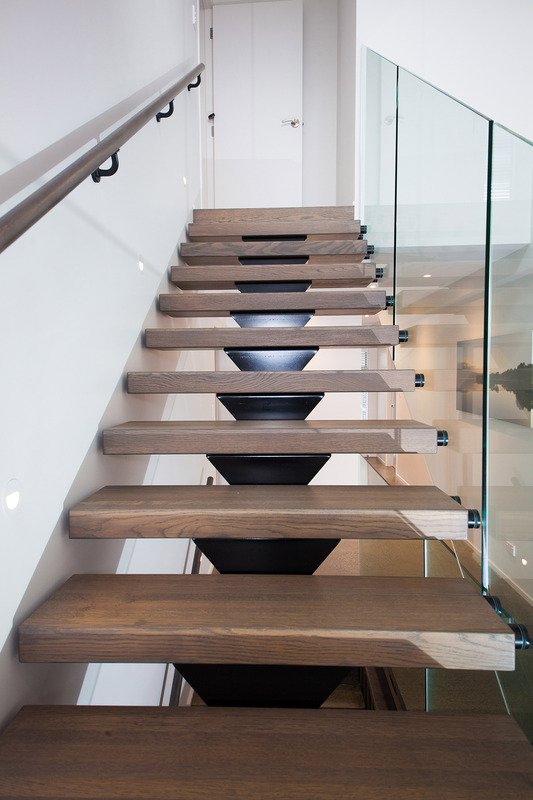 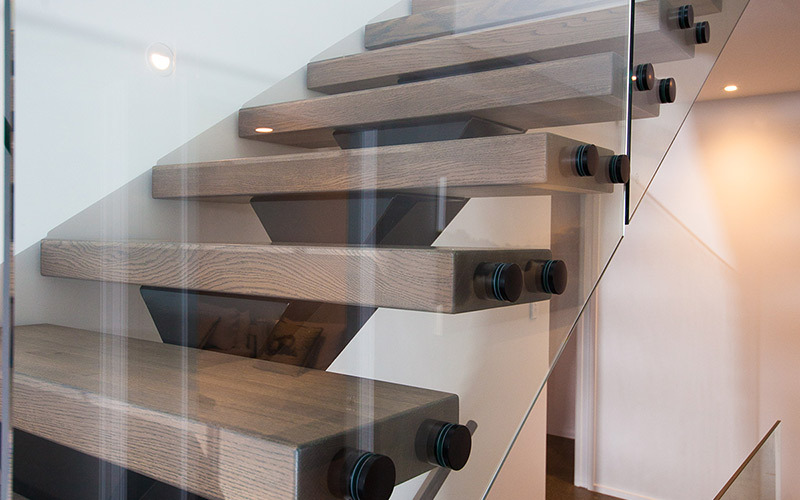 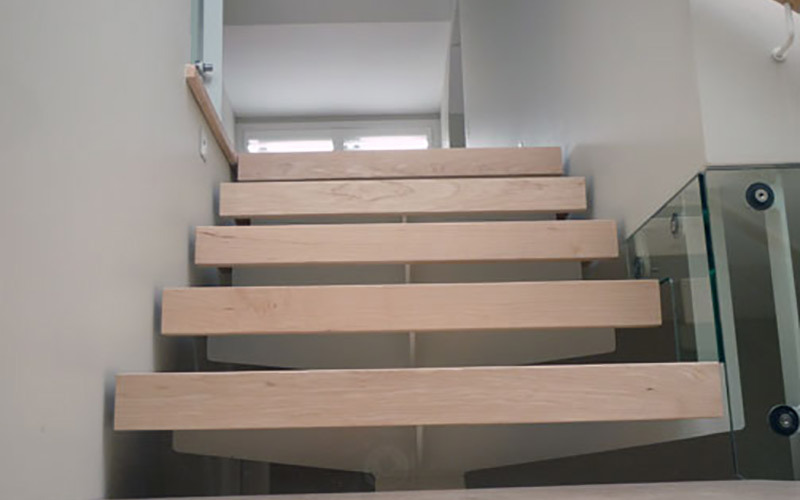 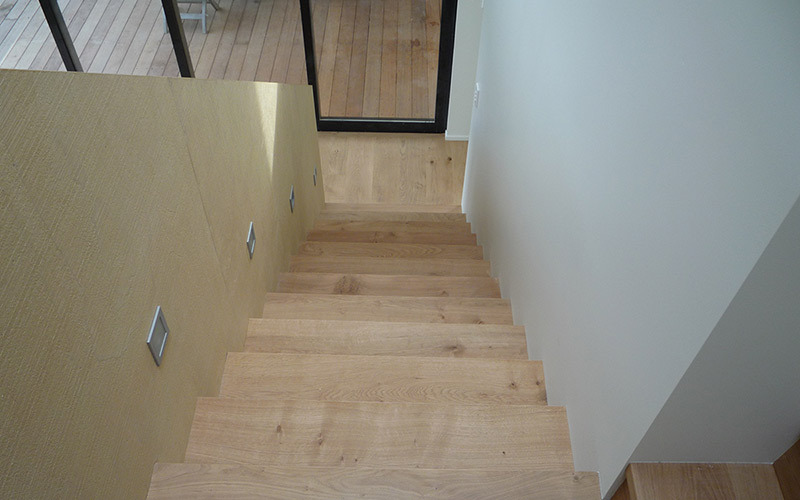 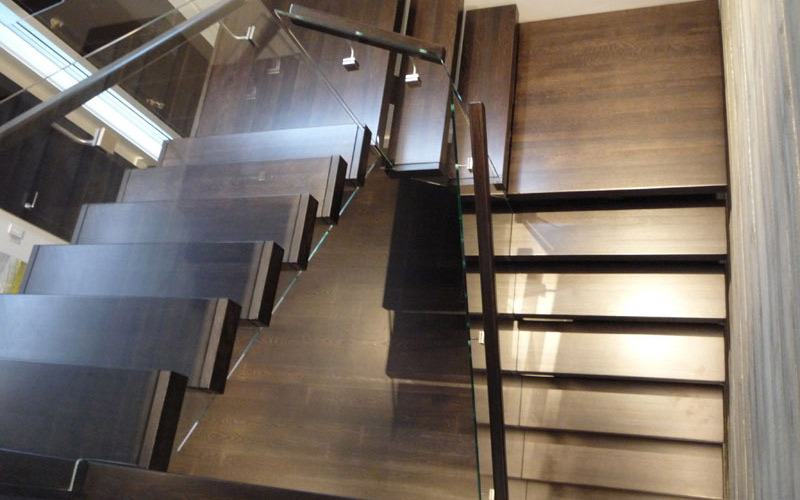 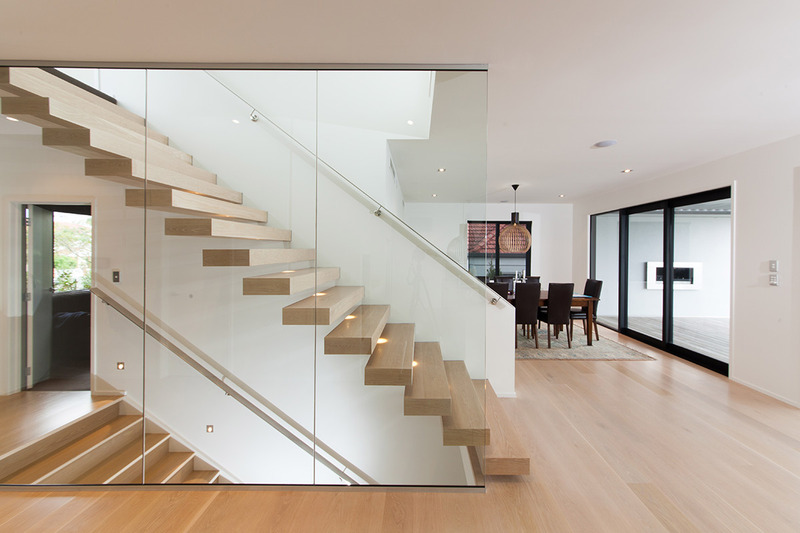 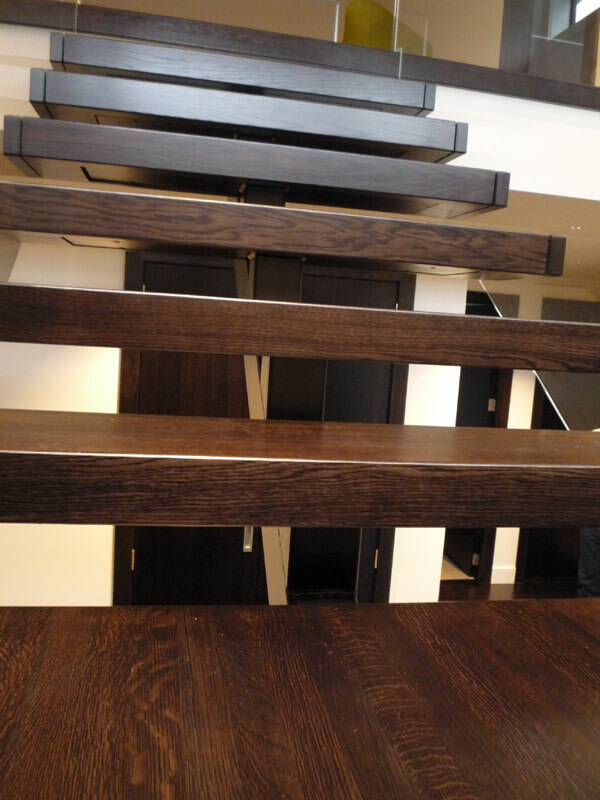 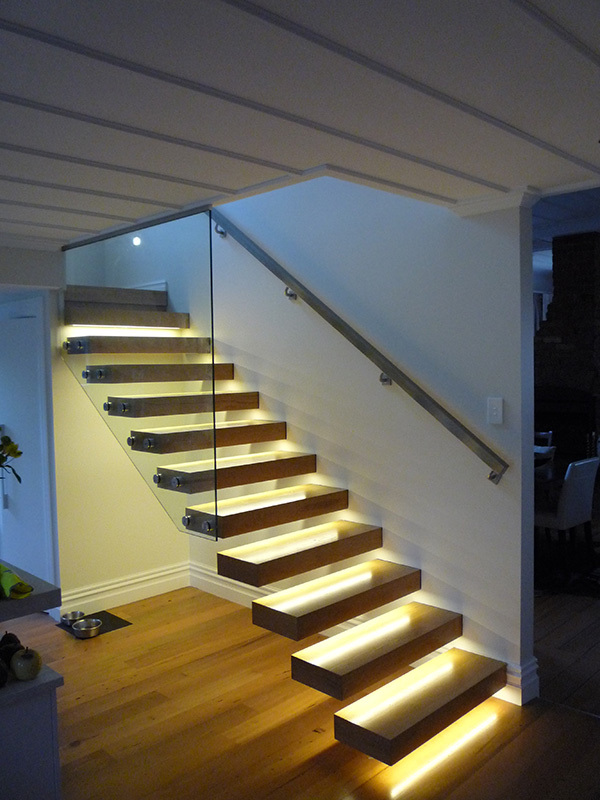 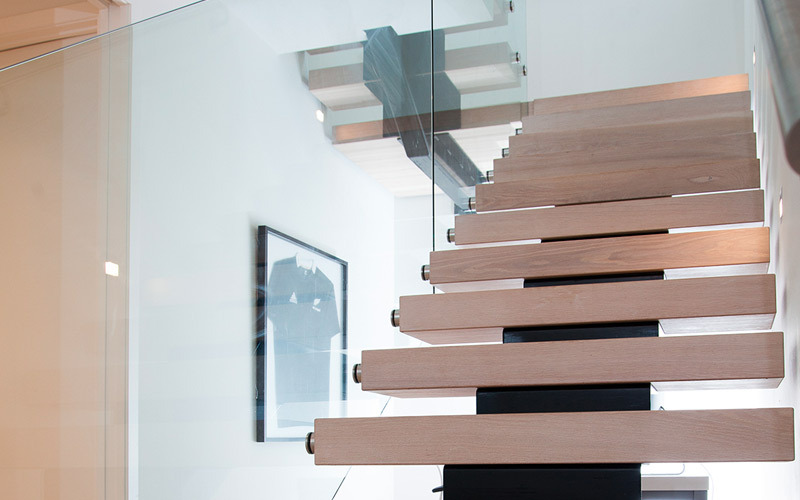 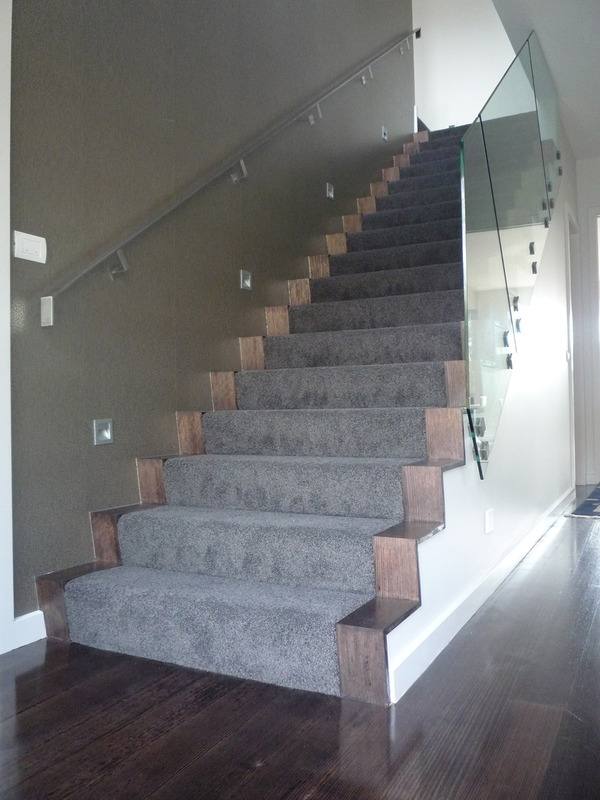 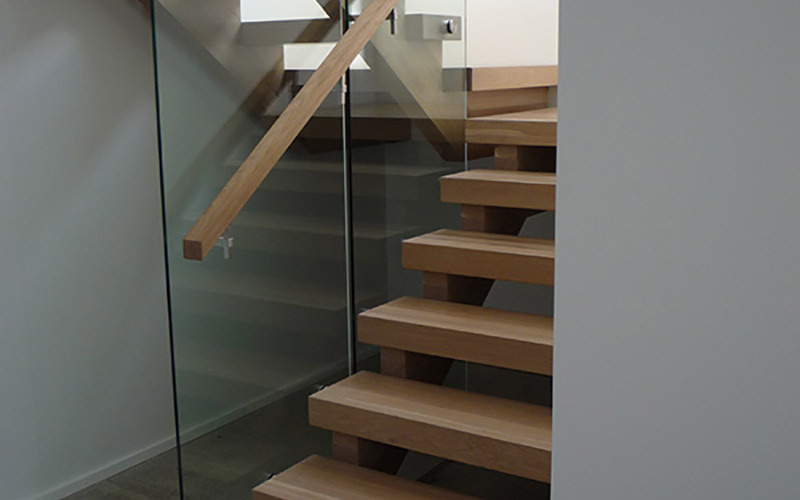 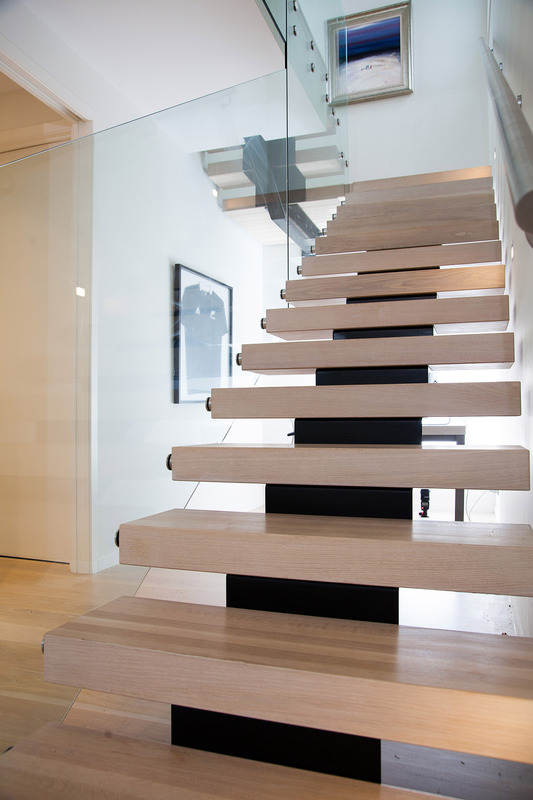 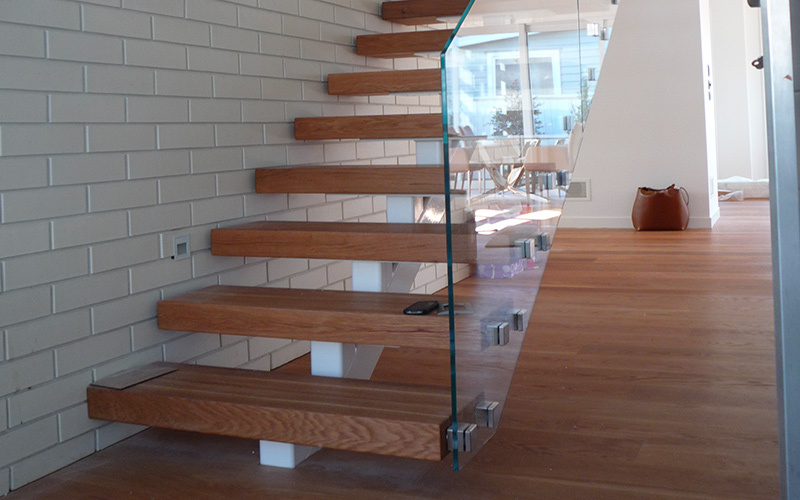 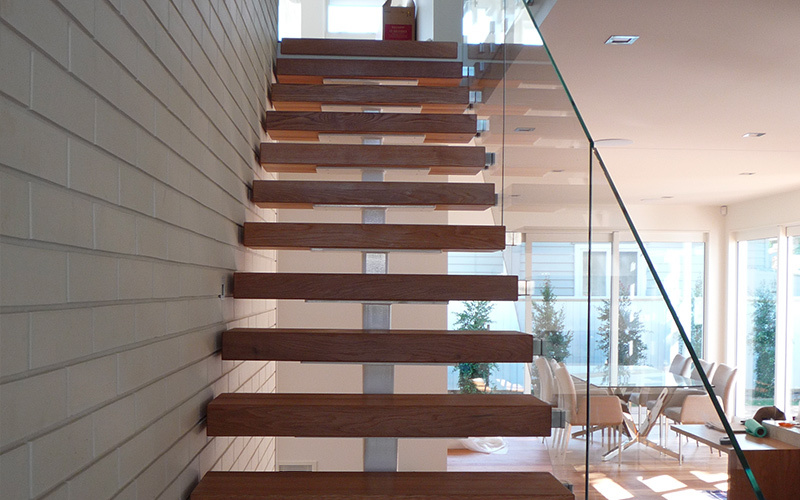 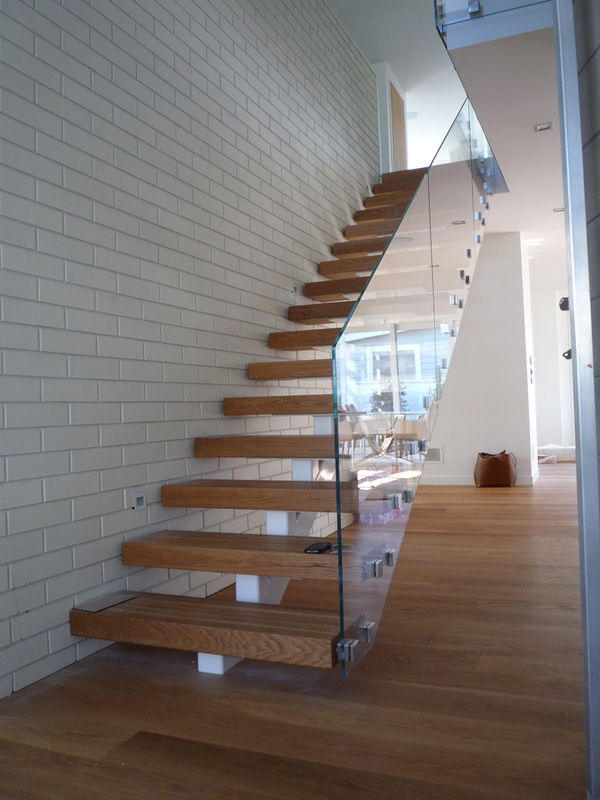 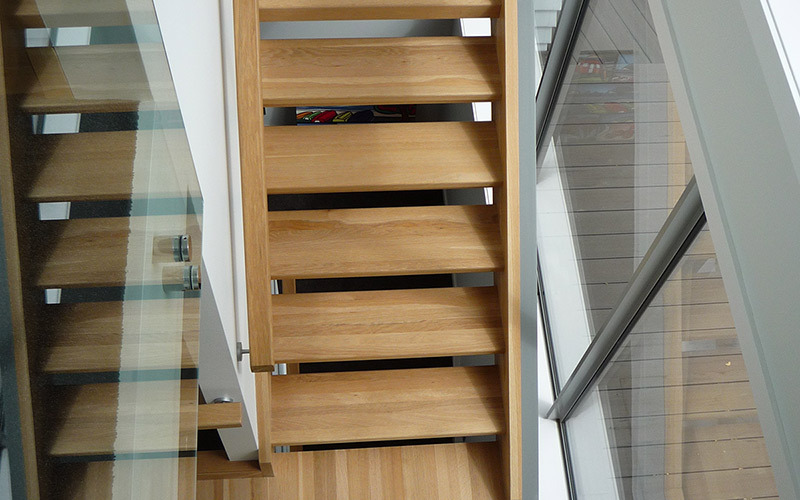 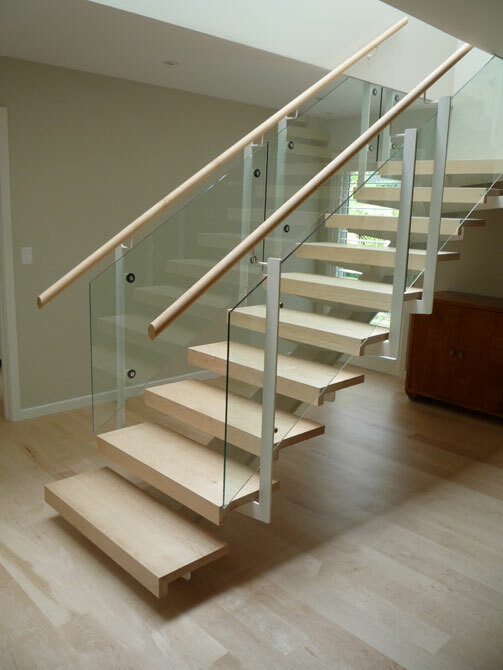 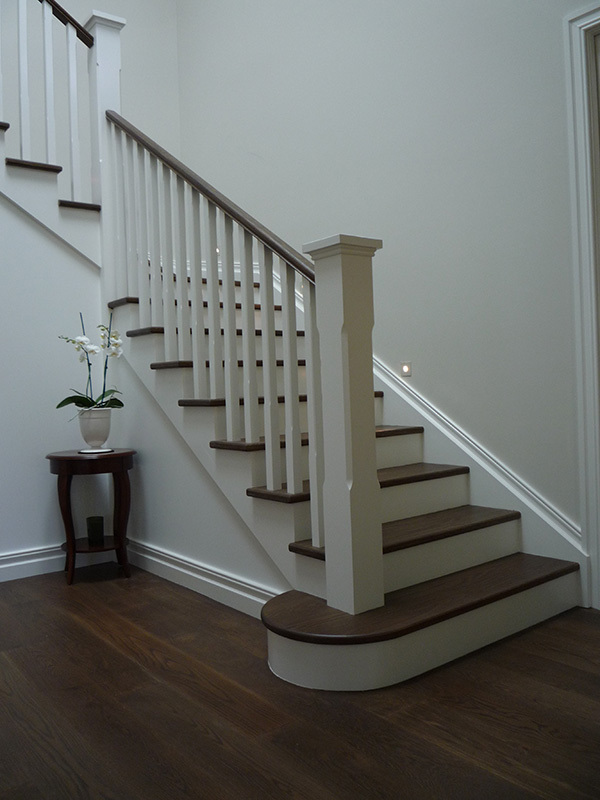 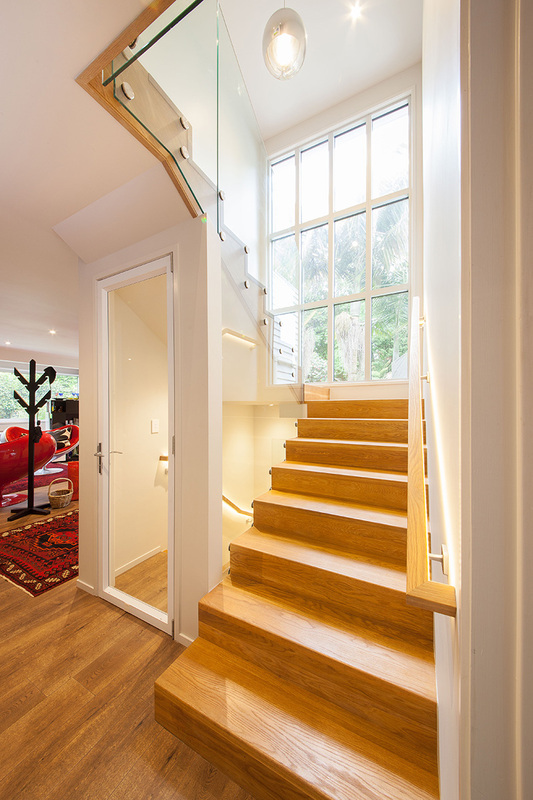 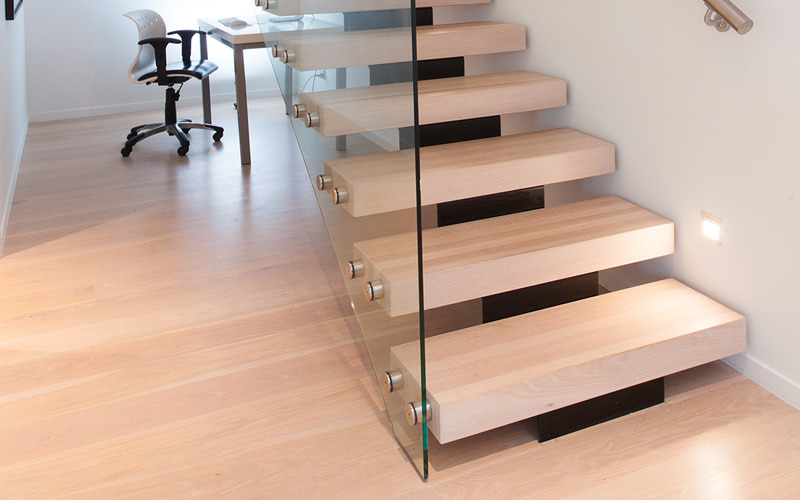 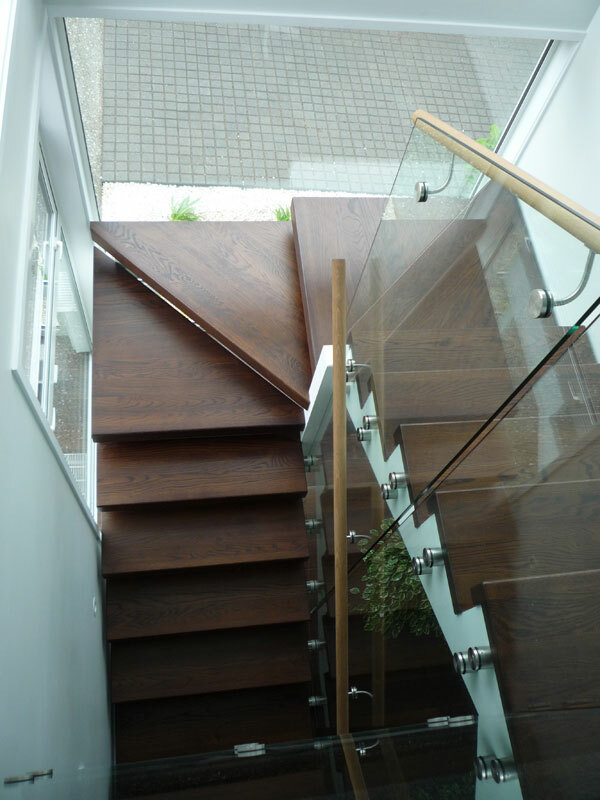 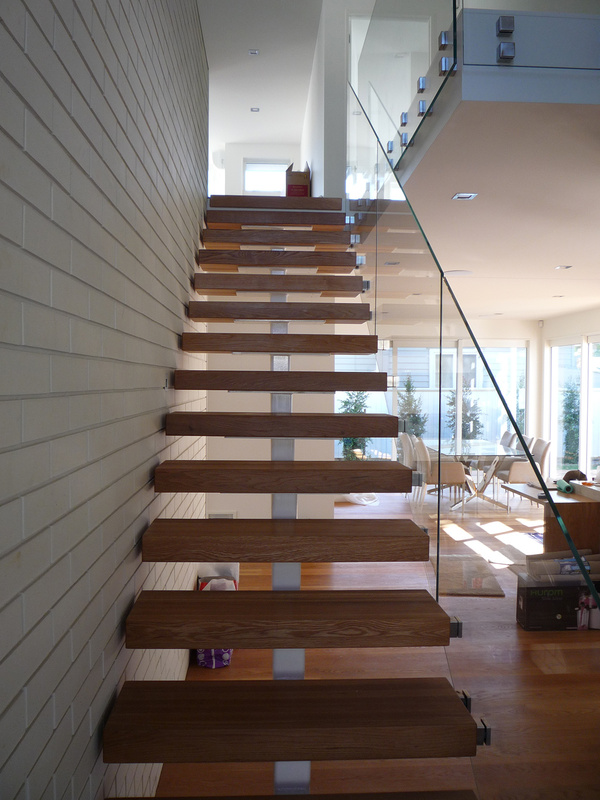 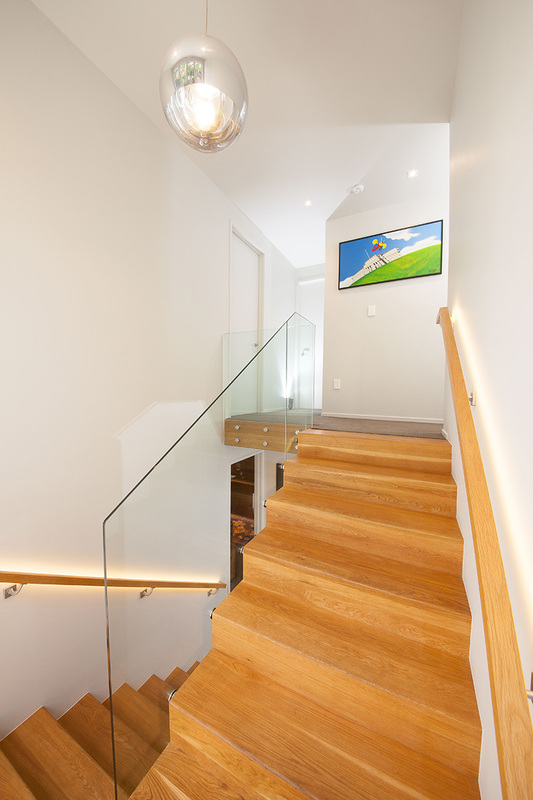 To get the full effect of floating stairs, consider installing our Centrum design in your home or office. 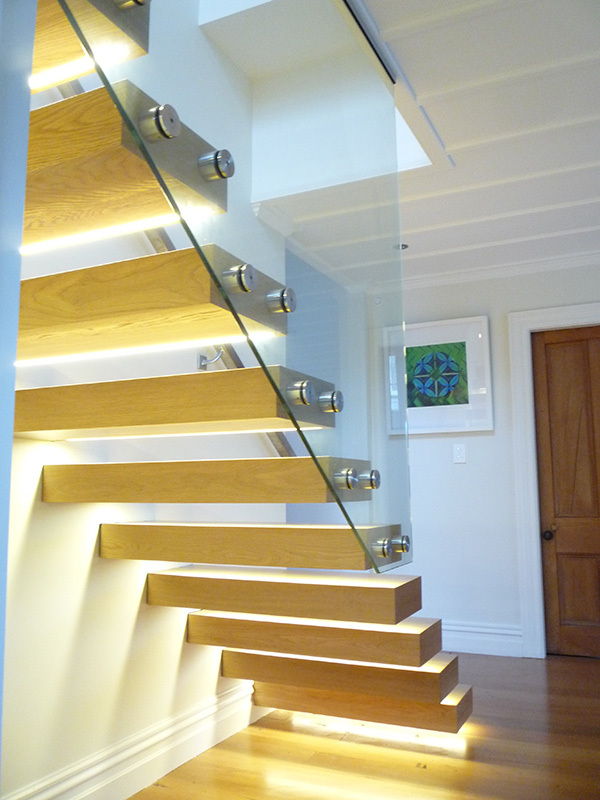 Its solitary steel stringer underneath the treads add to its illusion. 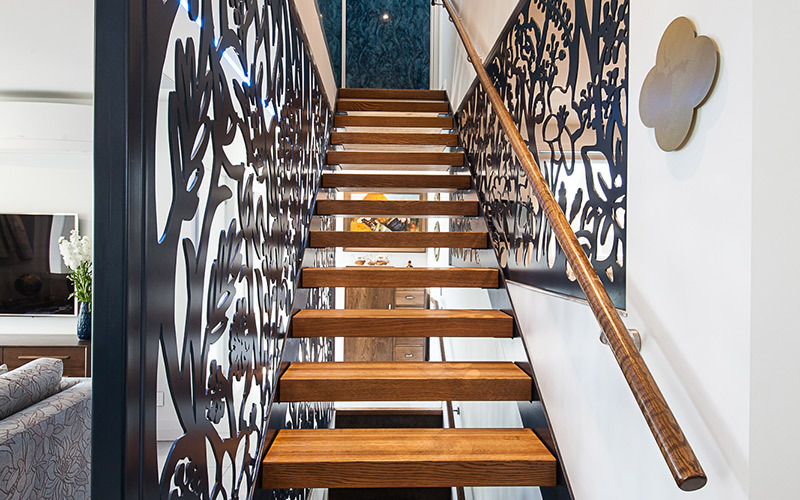 Whether you paint them dark or light, these steel stringers elevate any space’s overall look with their modern flair. 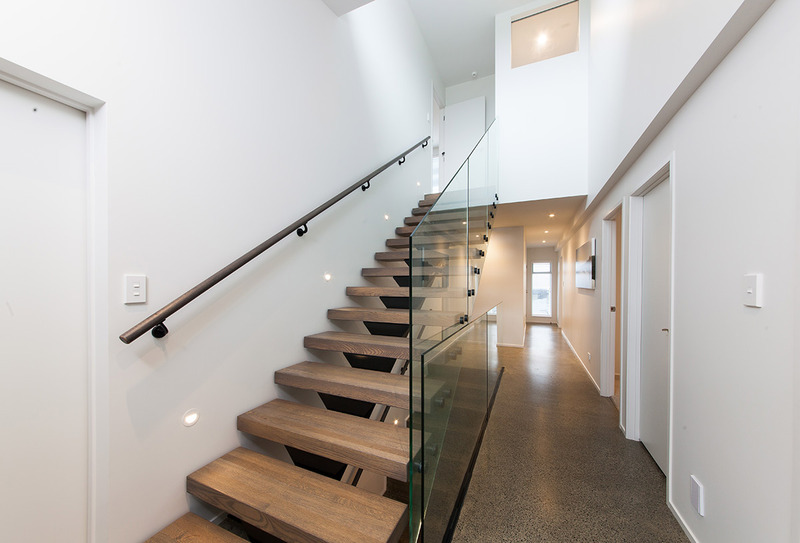 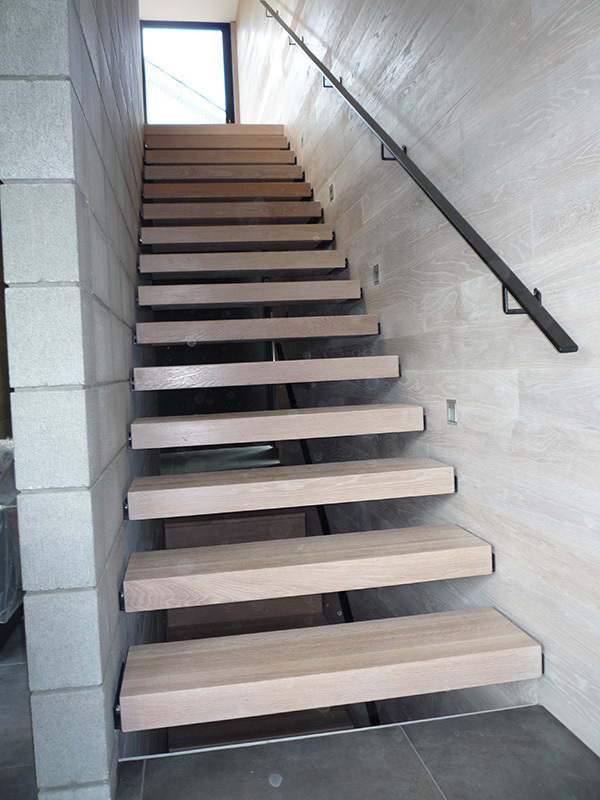 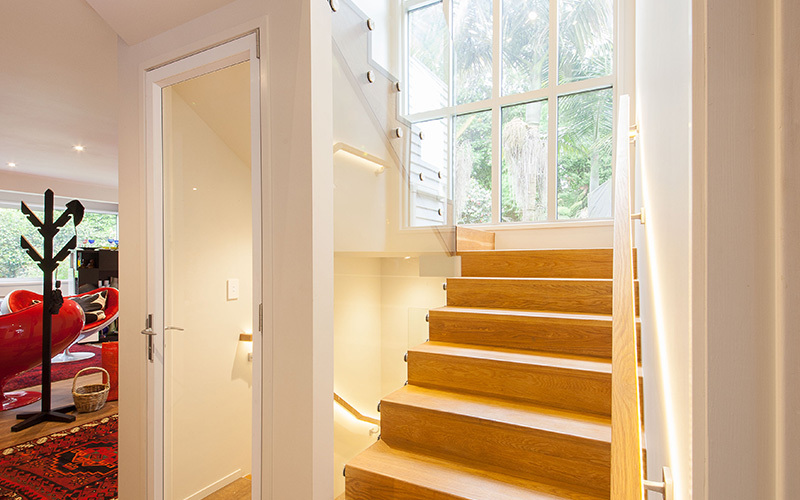 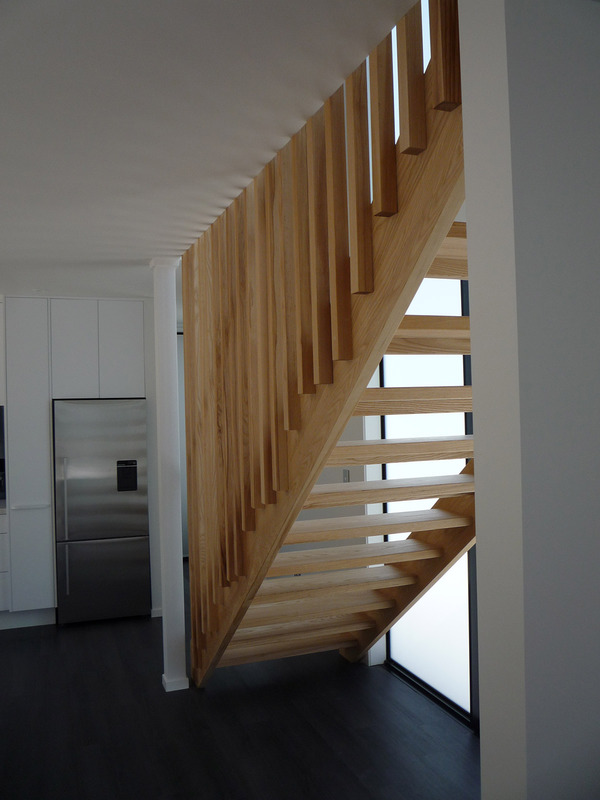 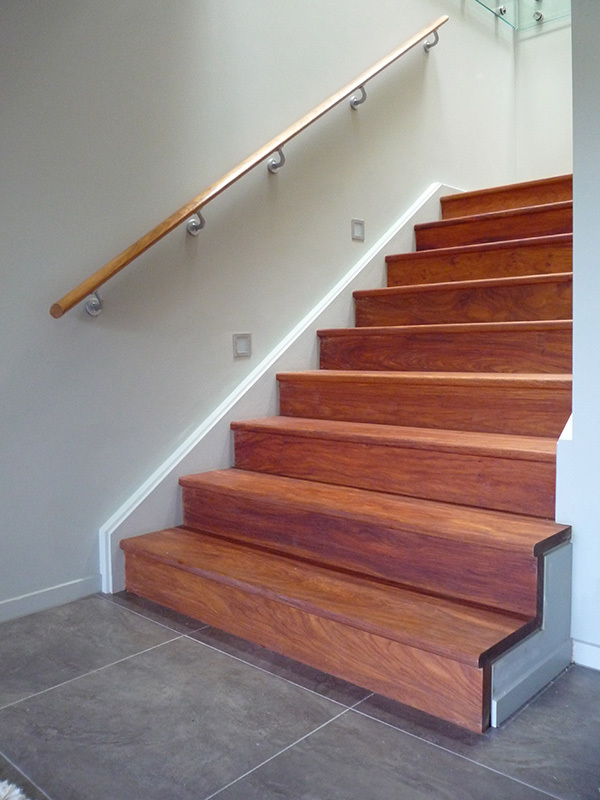 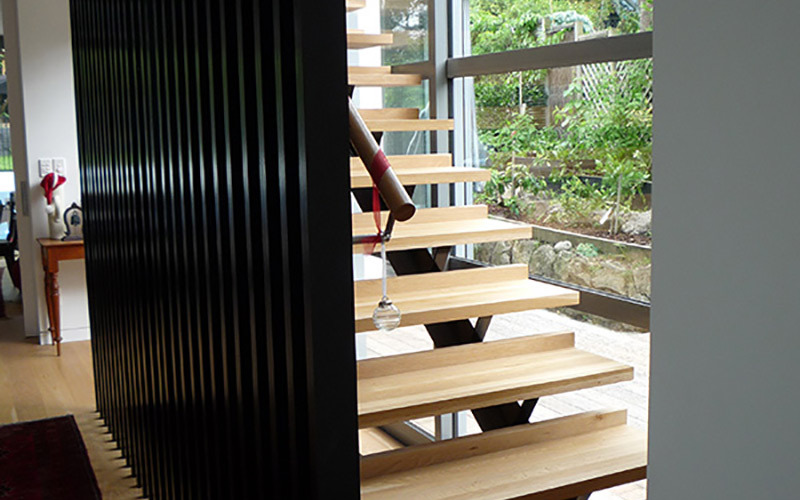 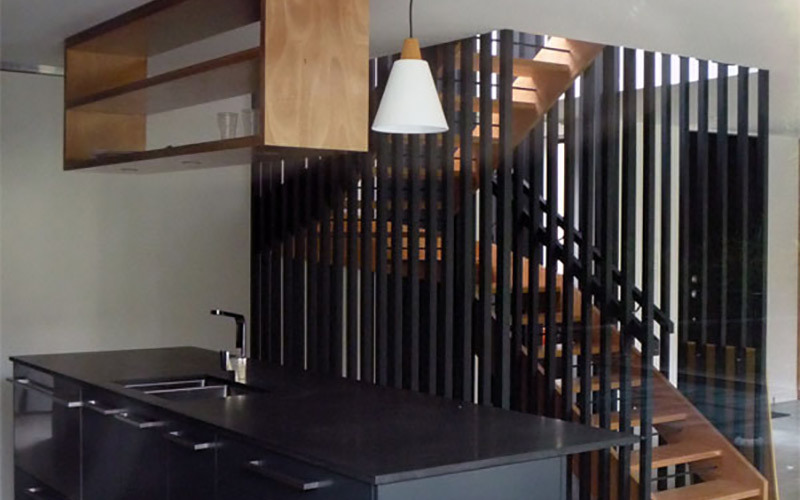 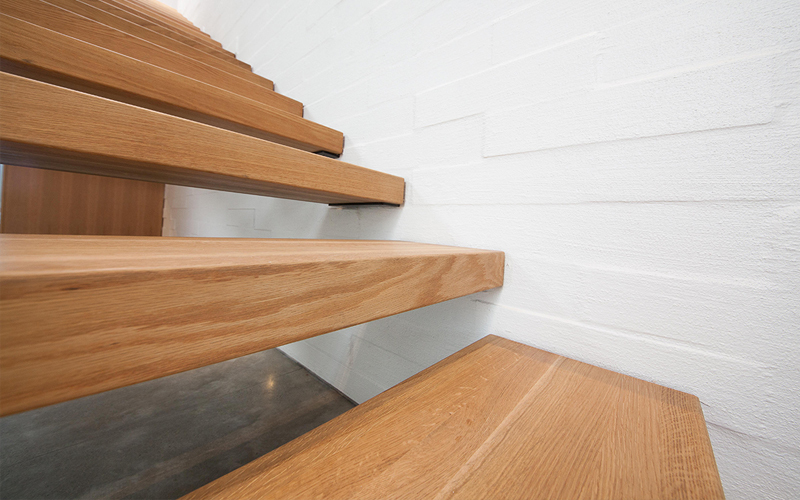 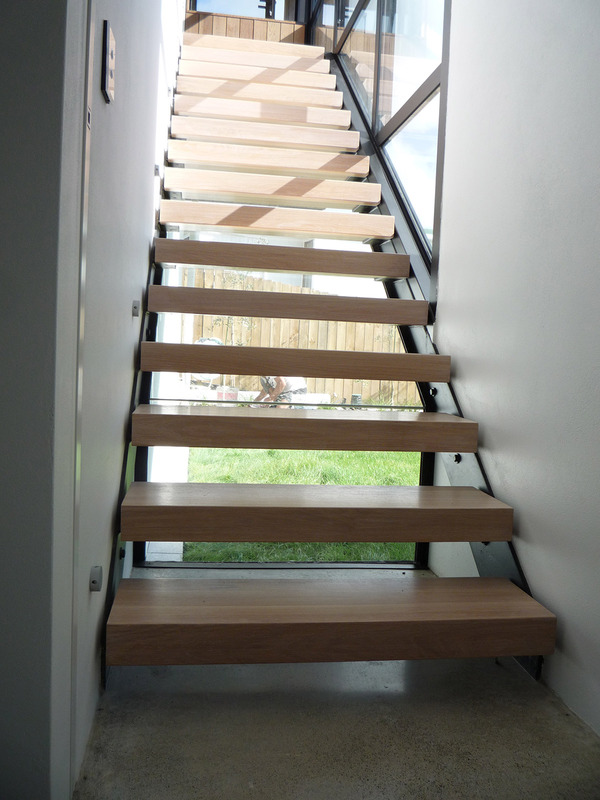 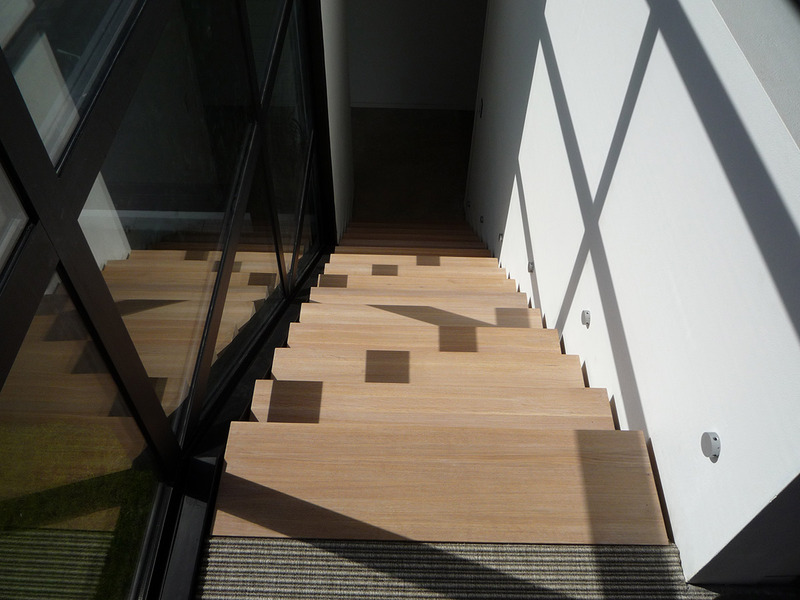 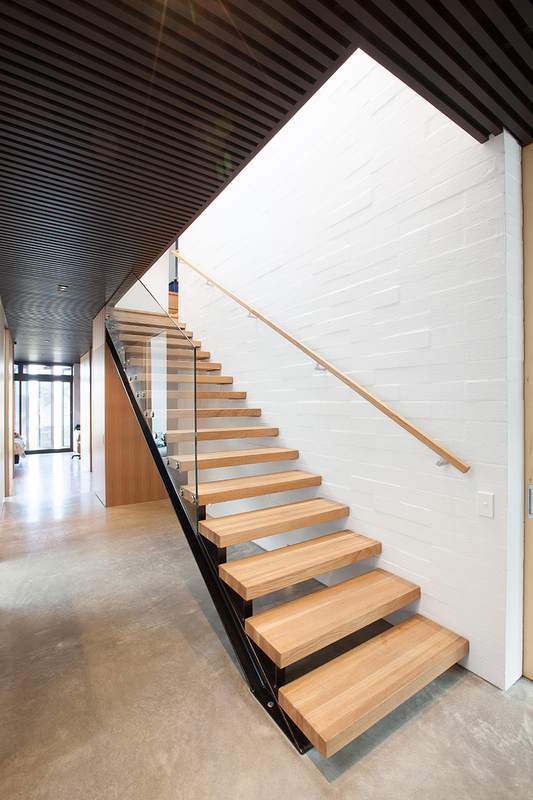 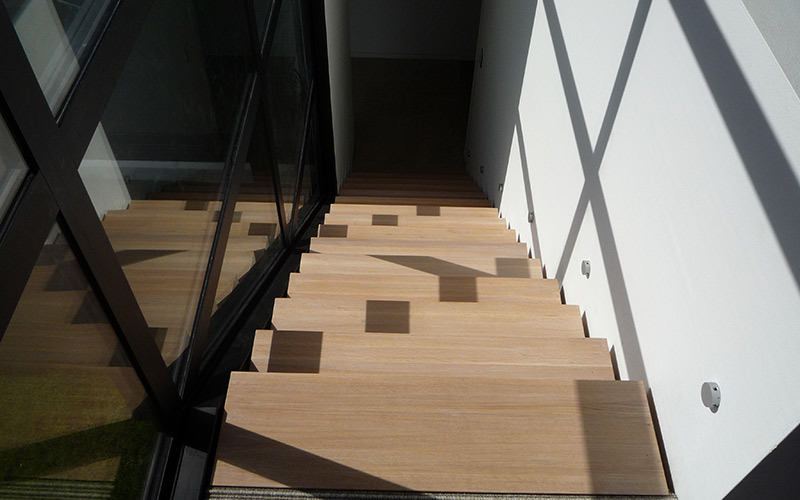 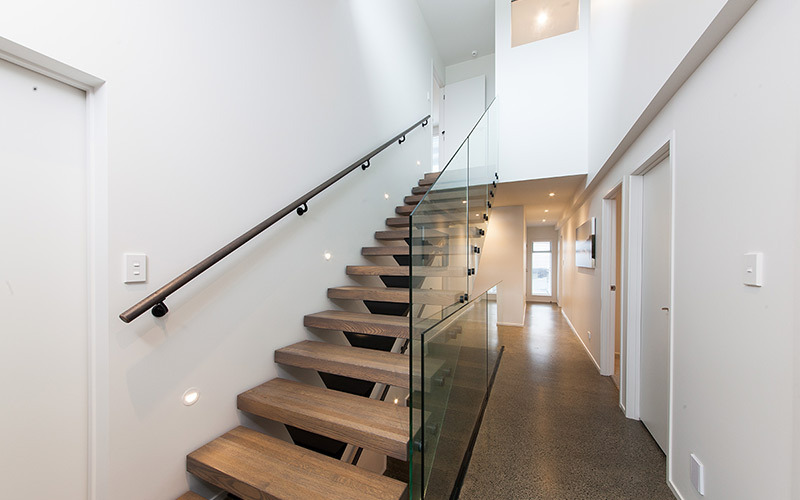 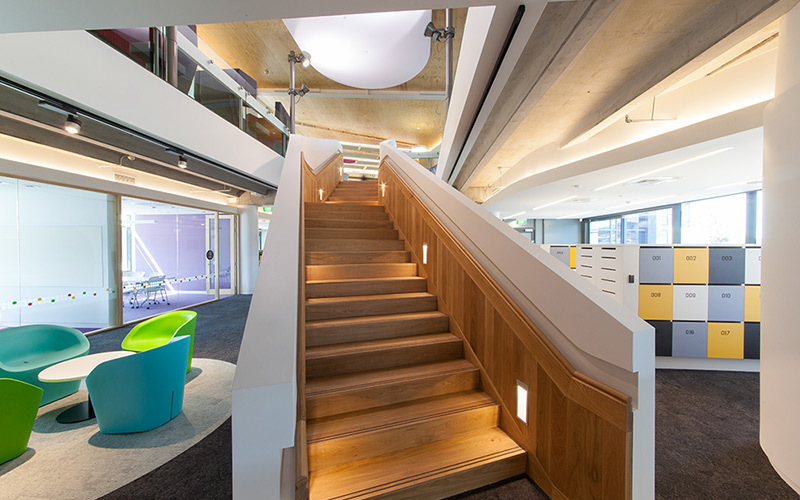 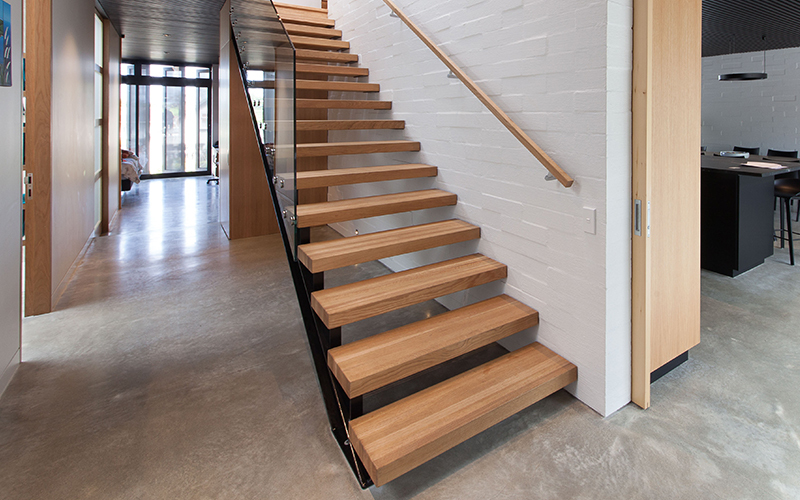 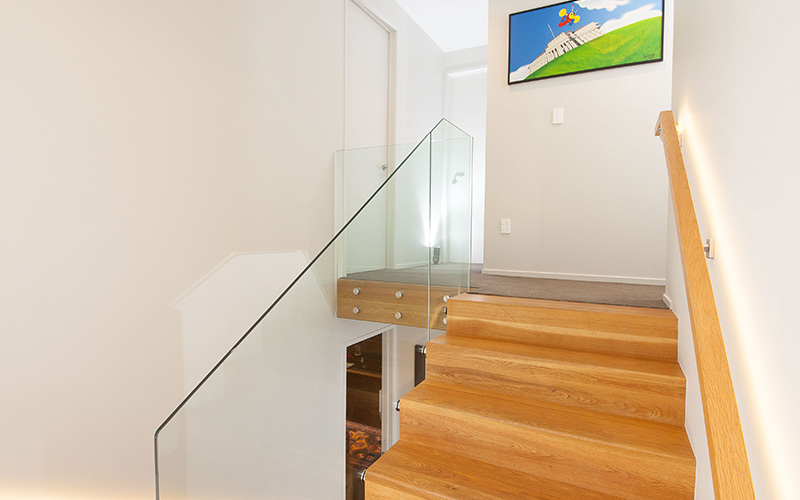 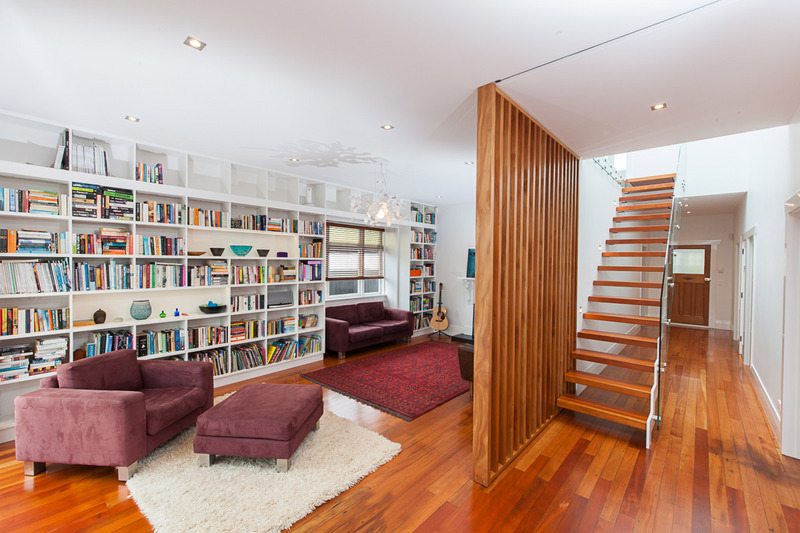 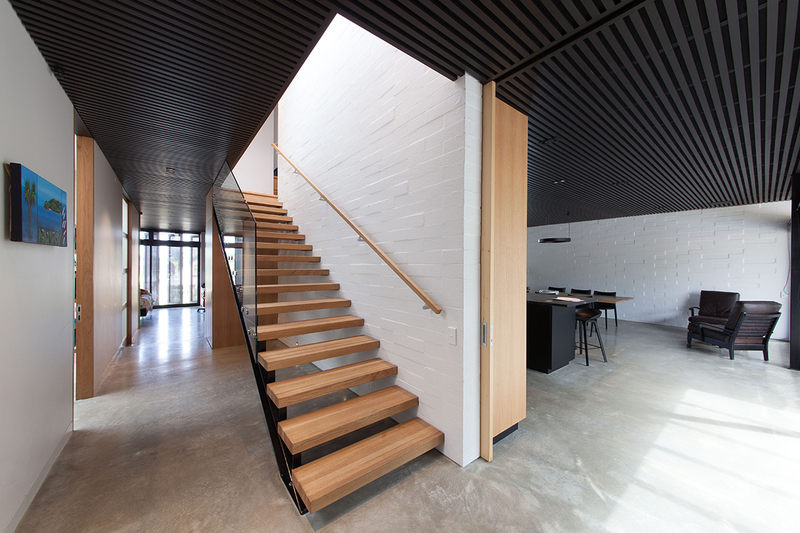 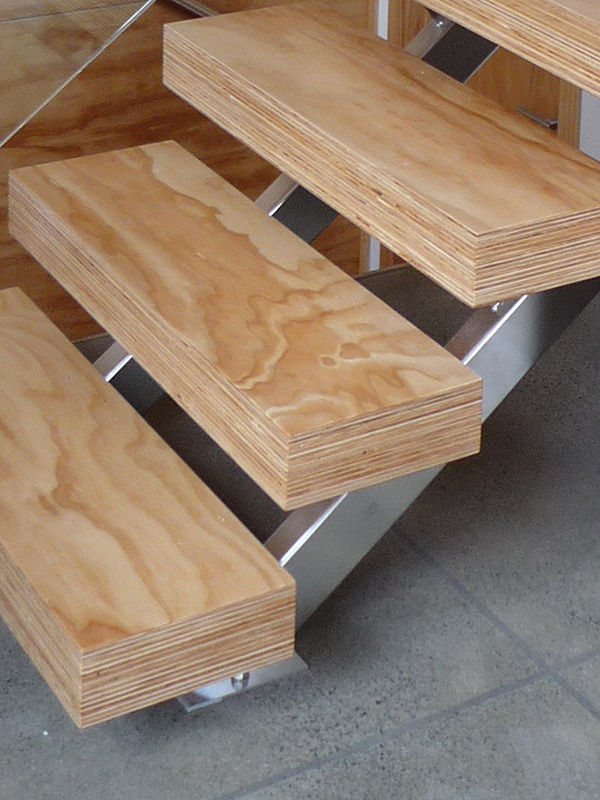 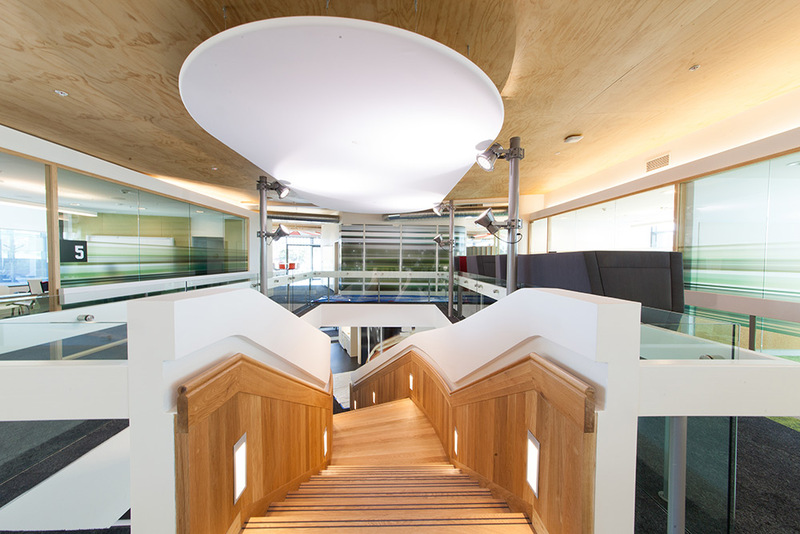 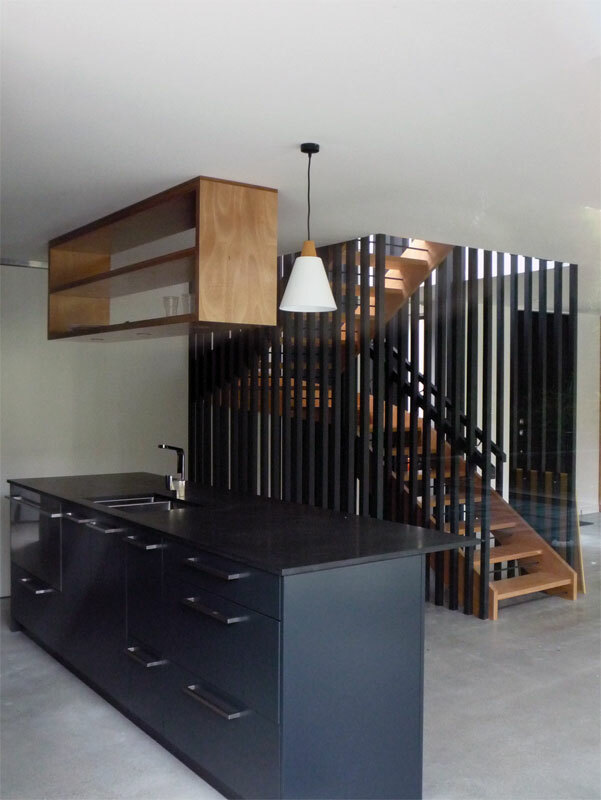 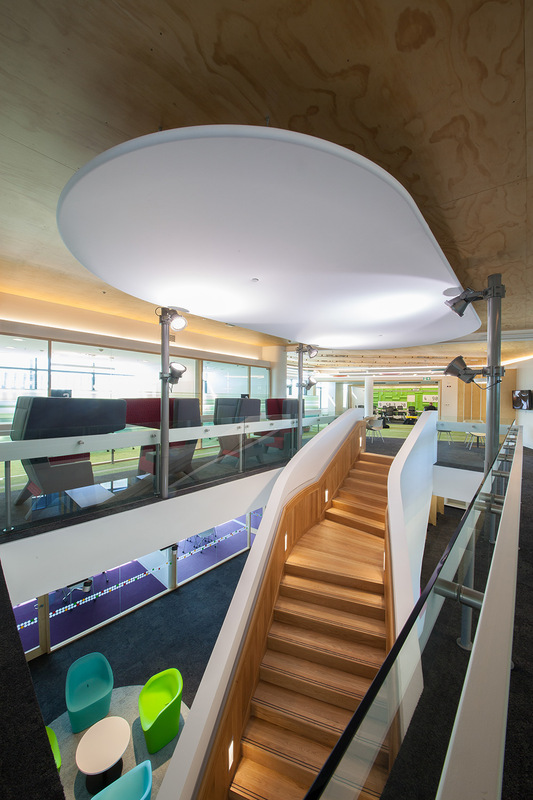 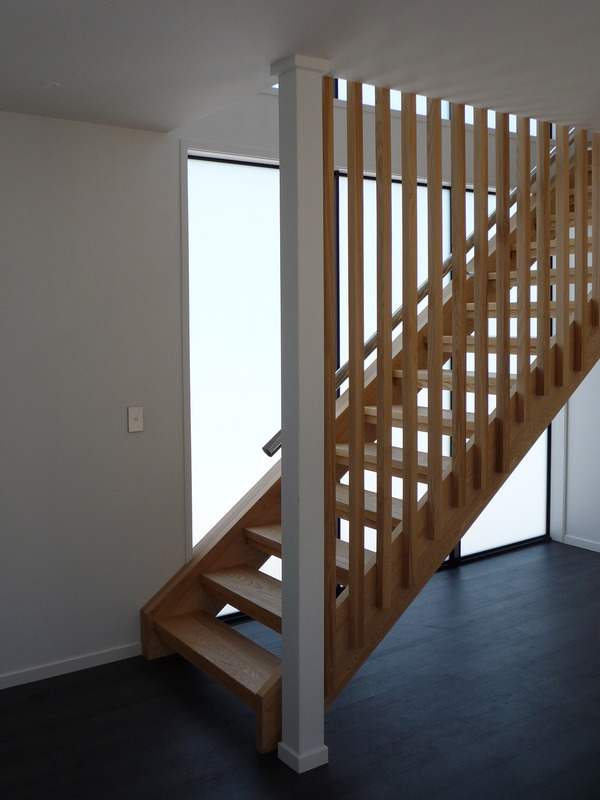 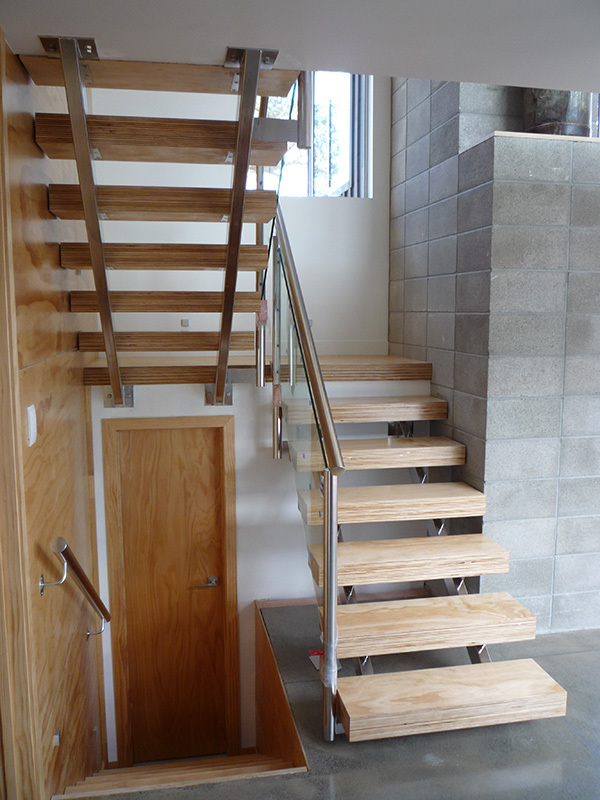 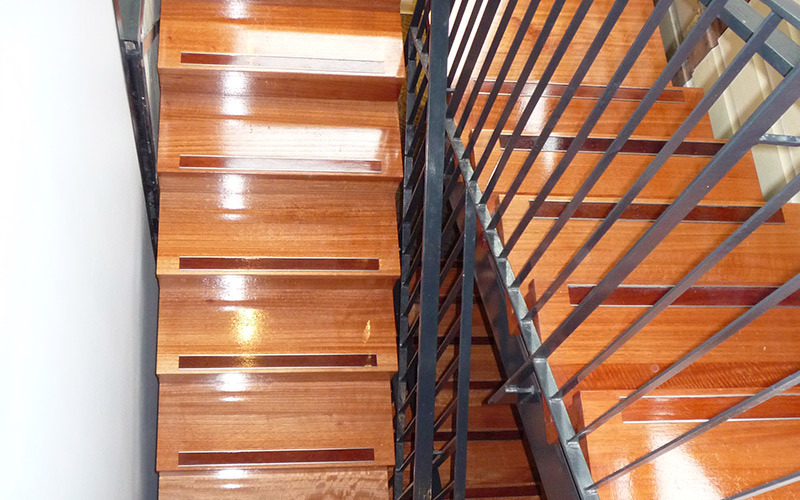 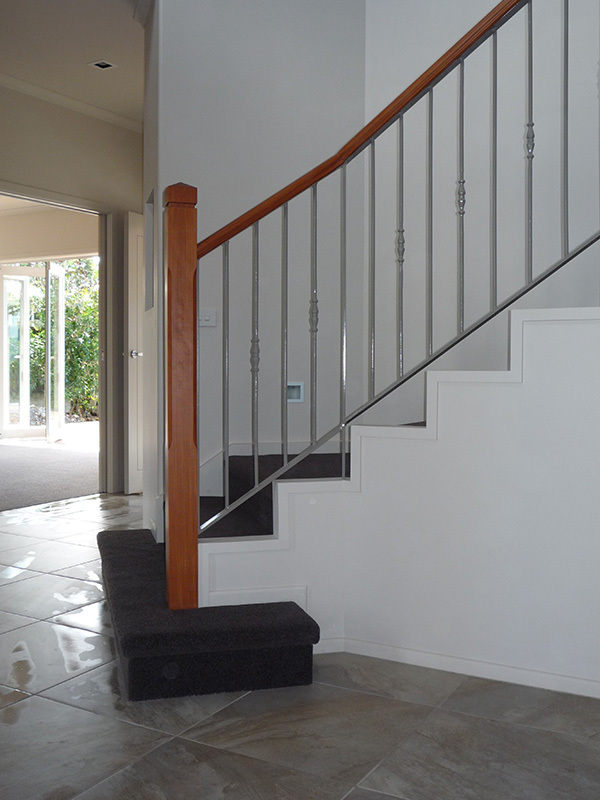 Paired best with timber step treads, our Centrum design is a favourite among New Zealanders. 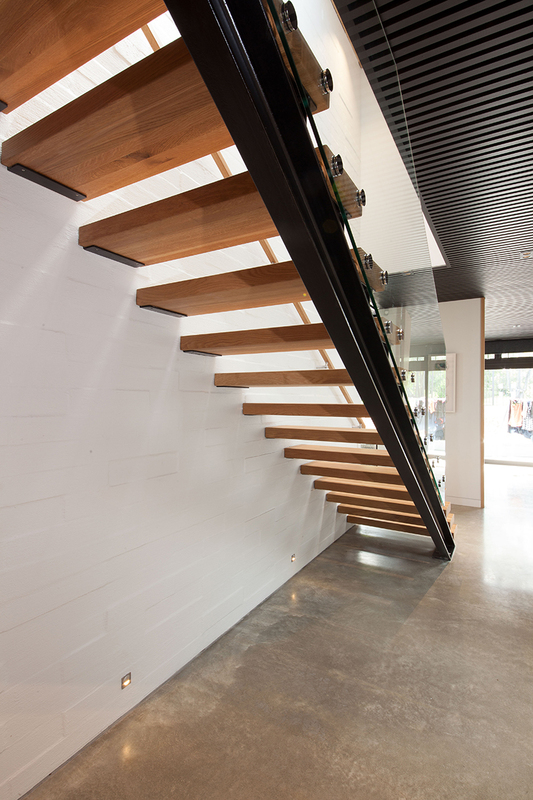 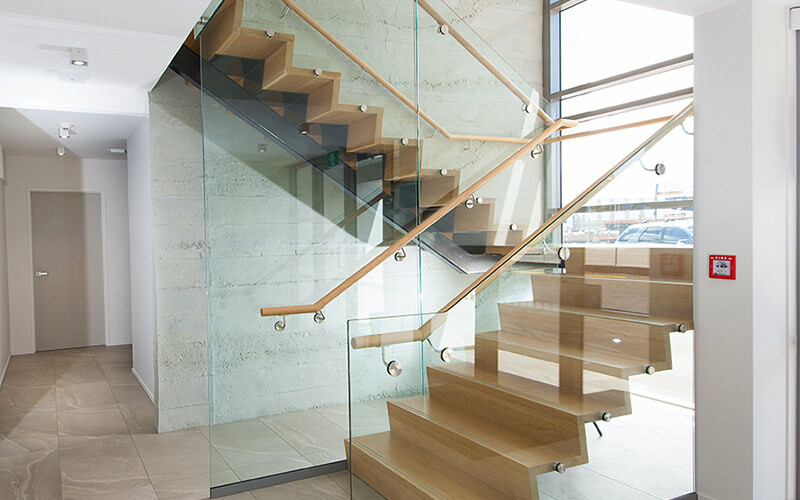 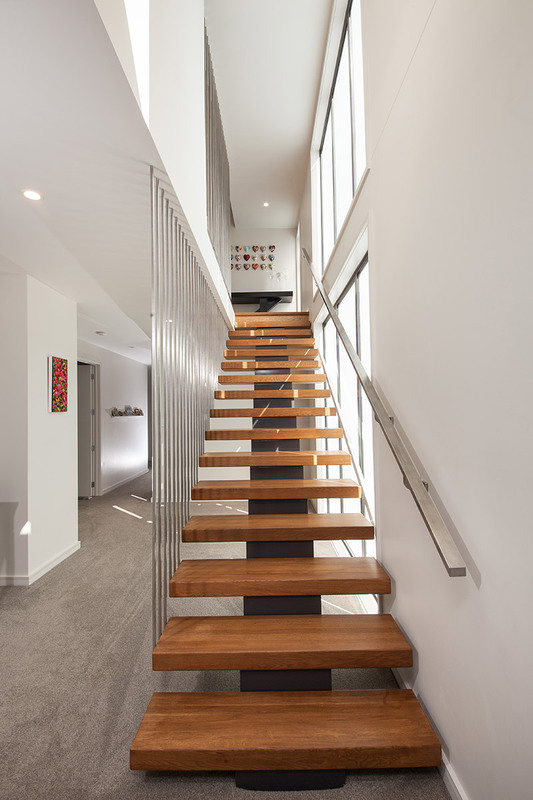 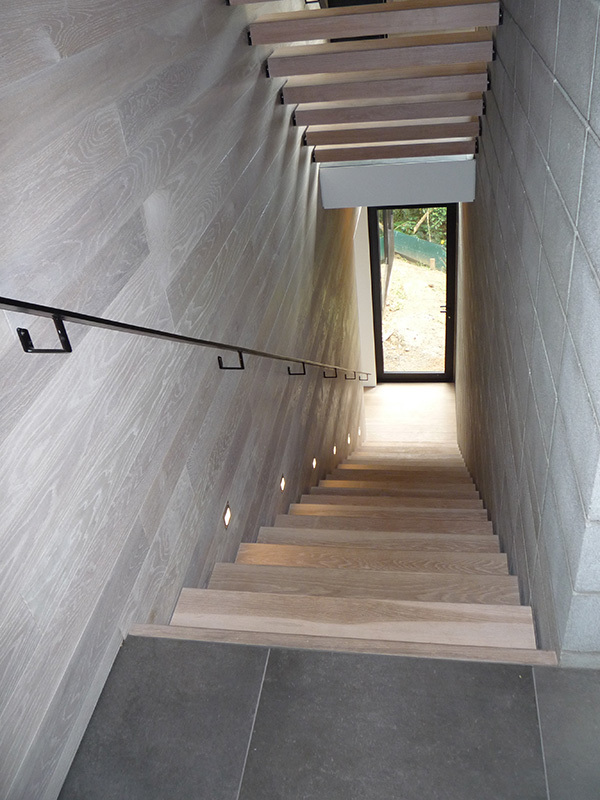 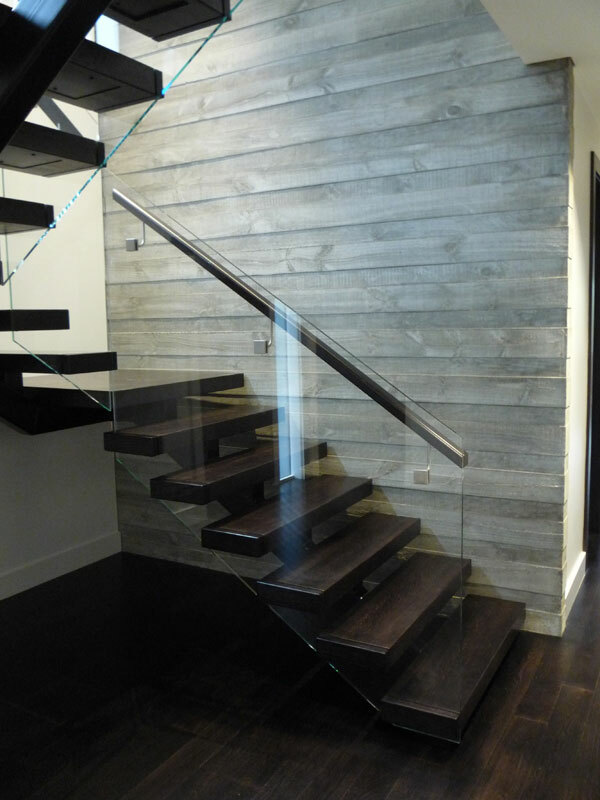 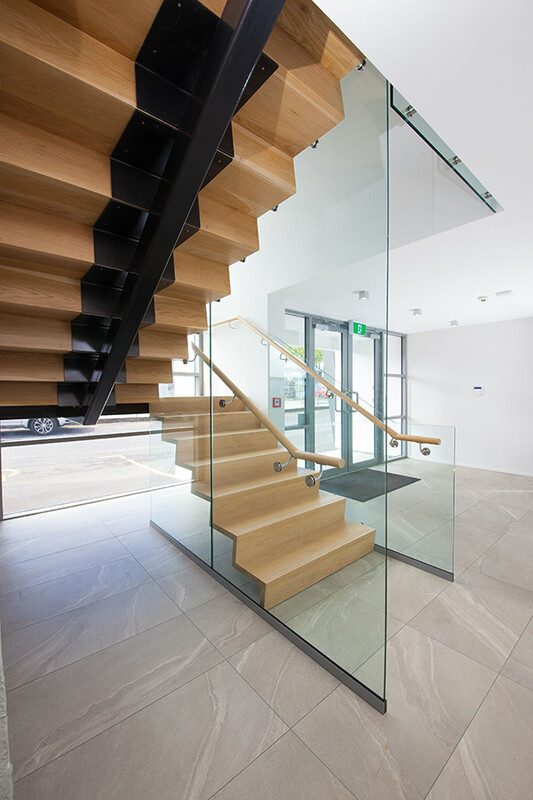 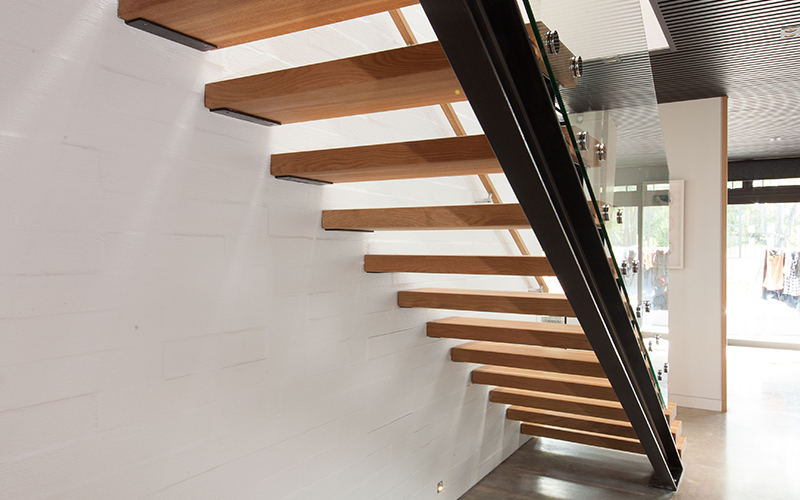 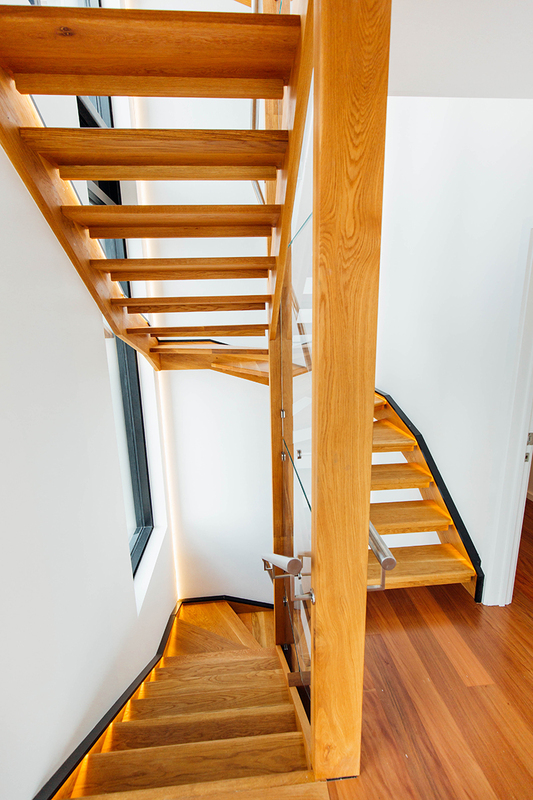 Our Suspendo design uses cantilevered treads— choose between solid timber and granite or stone overlay — that have their stringers hidden in the wall to give this staircase a modern minimalistic look. 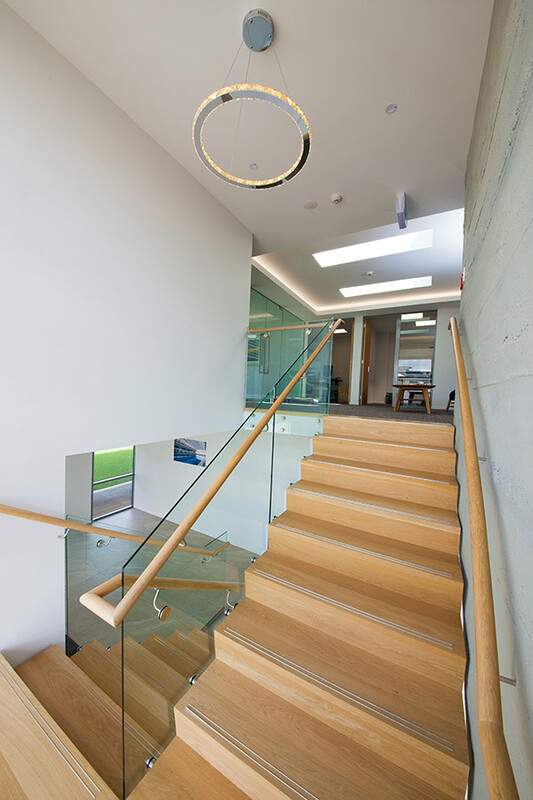 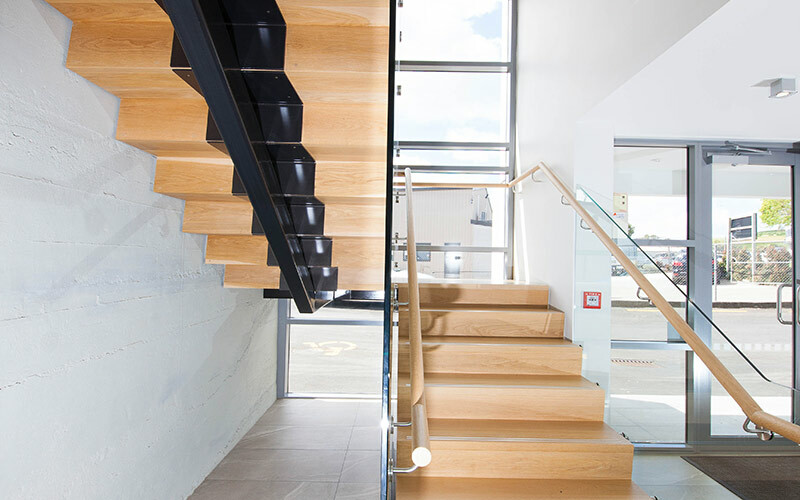 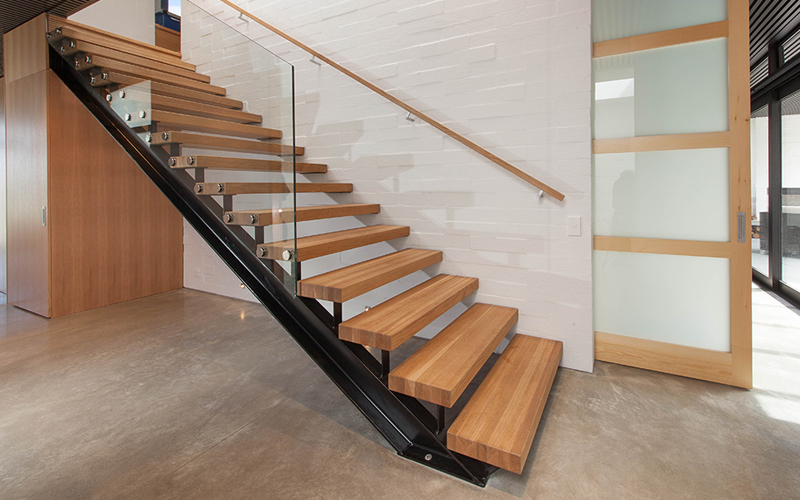 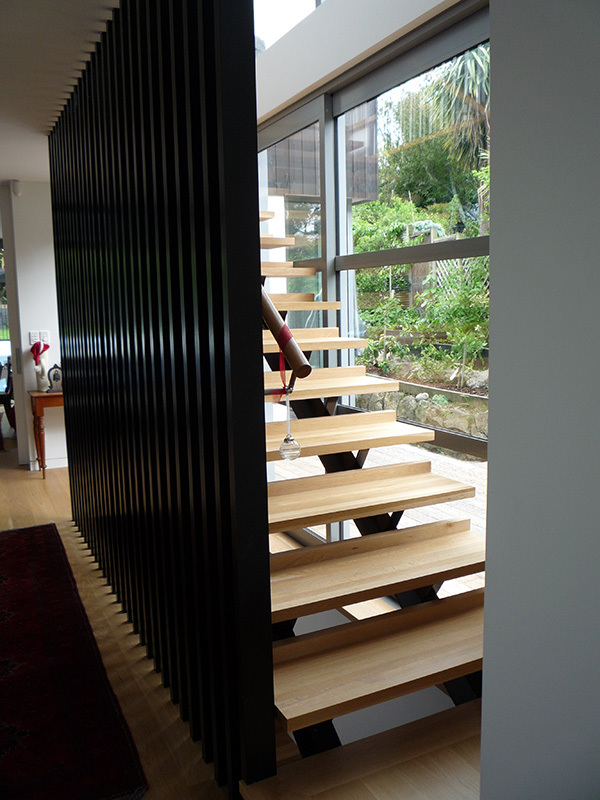 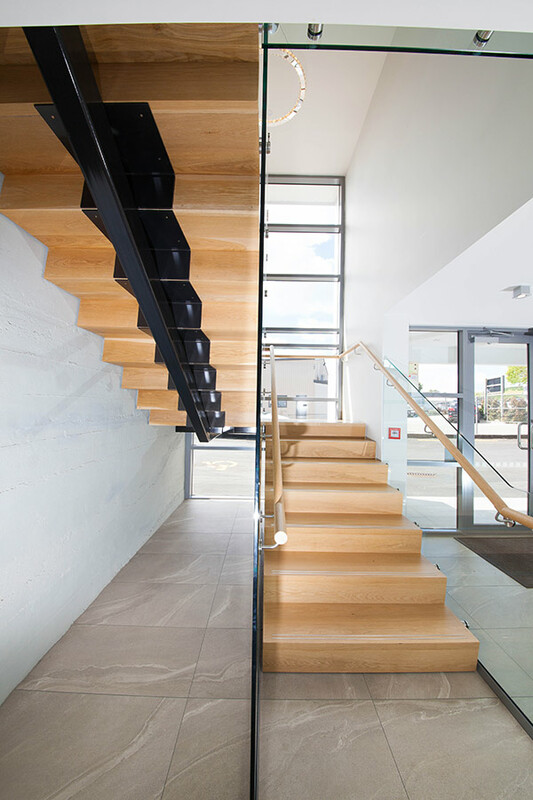 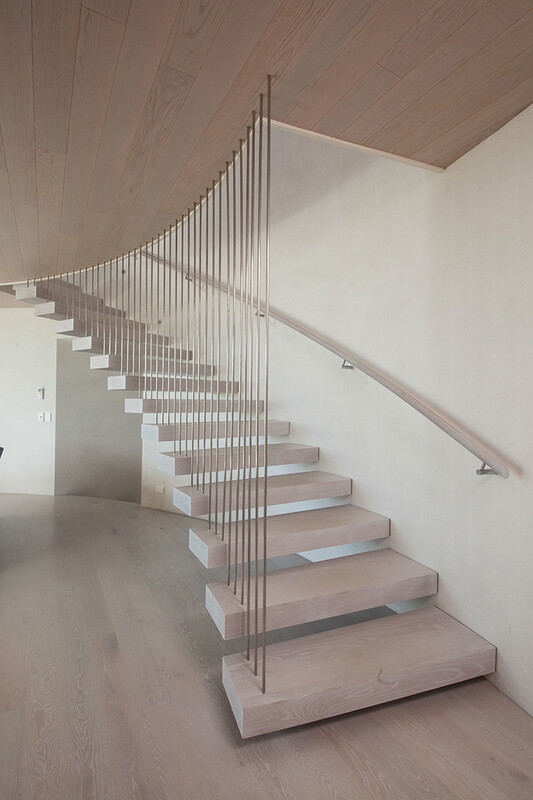 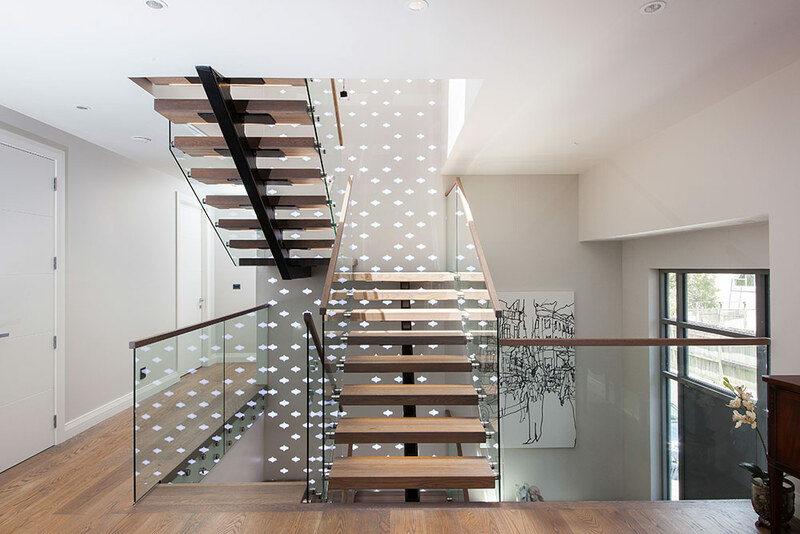 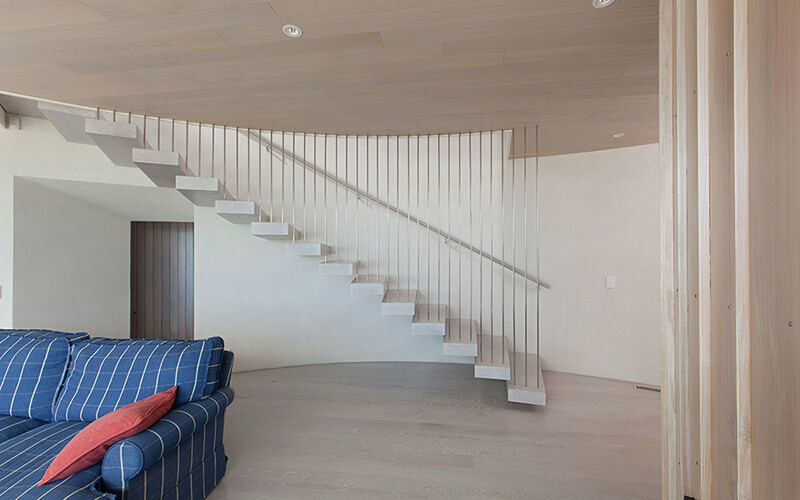 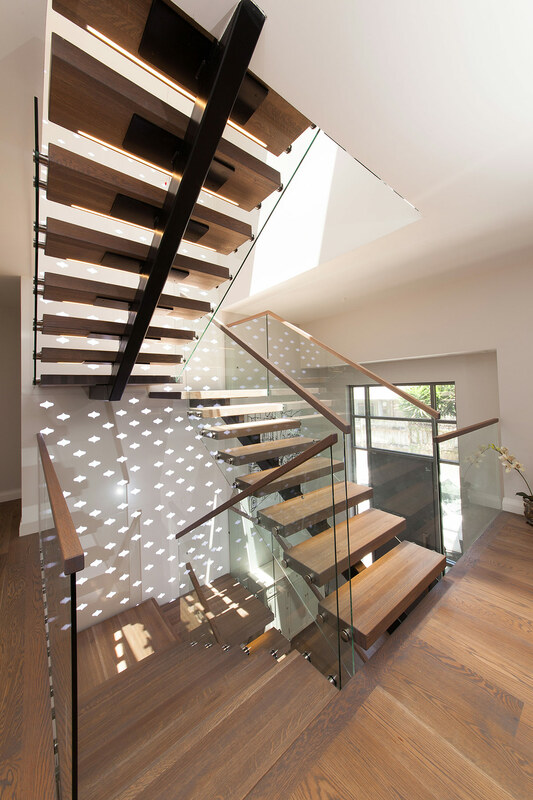 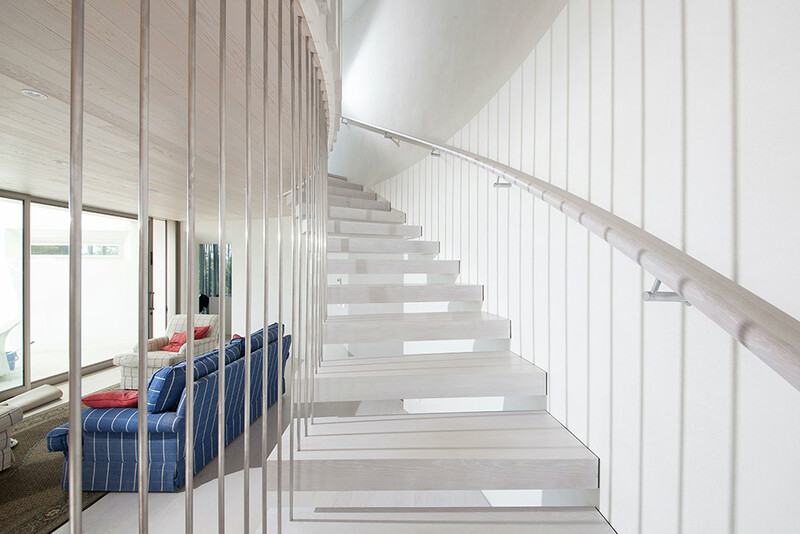 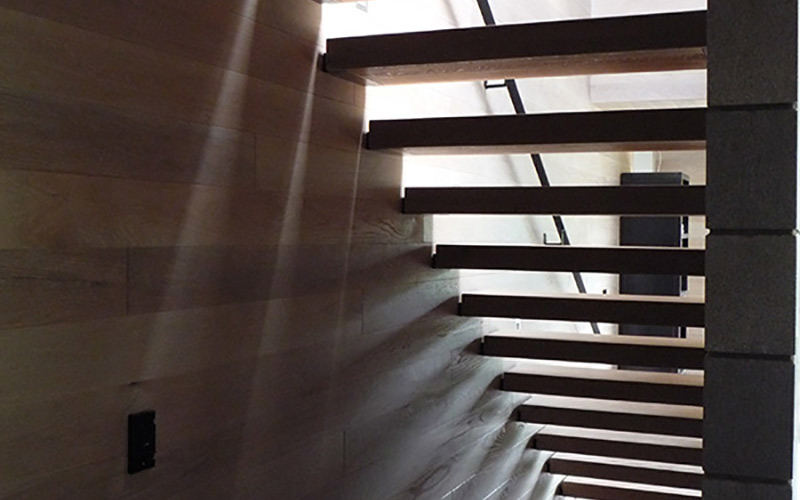 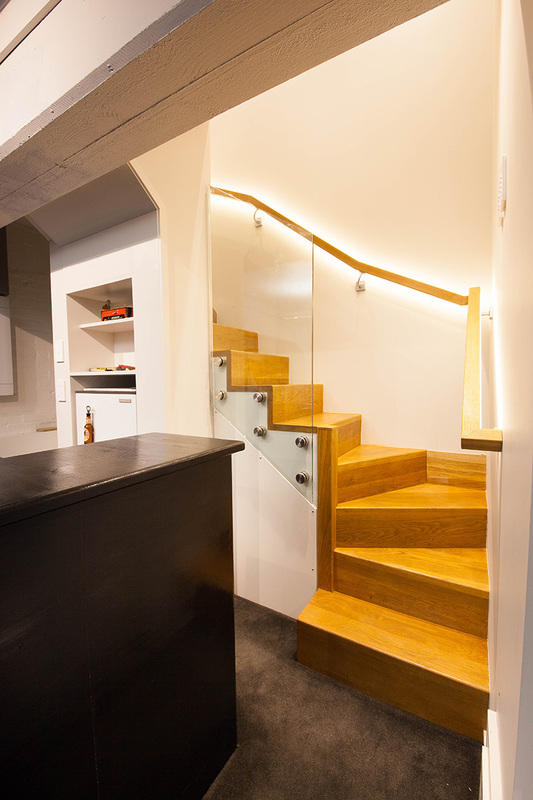 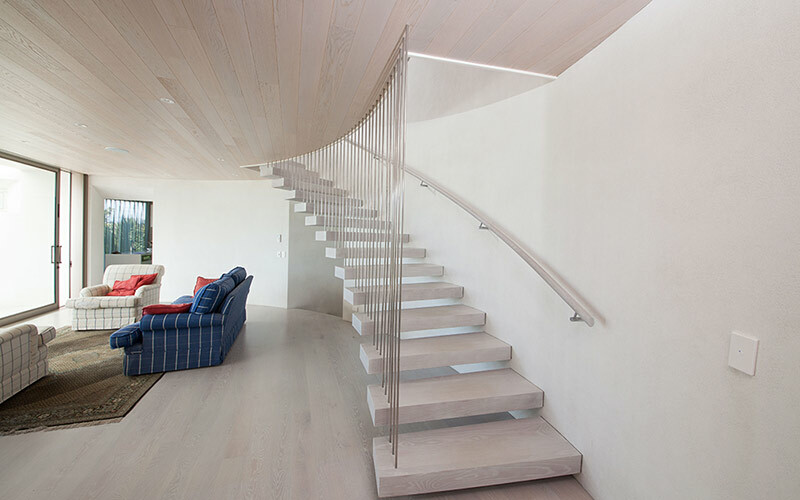 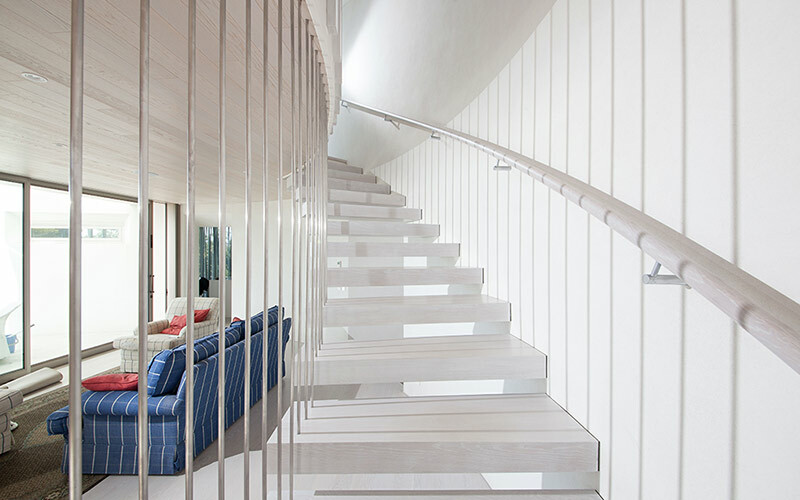 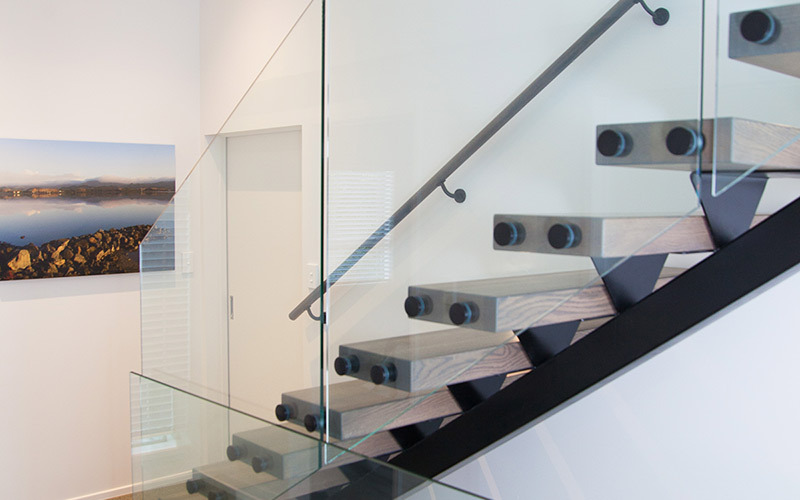 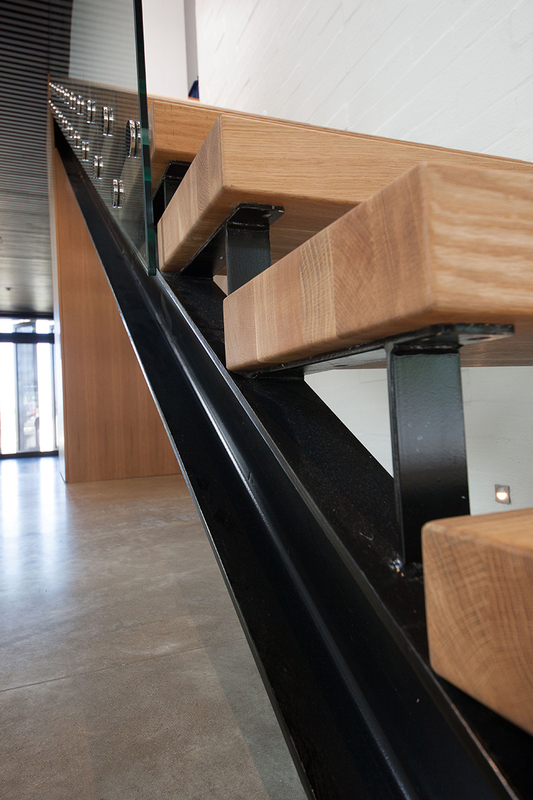 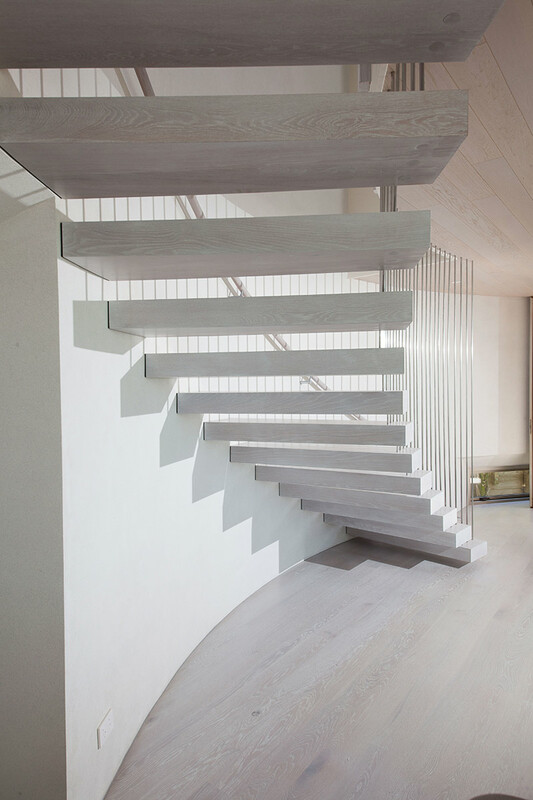 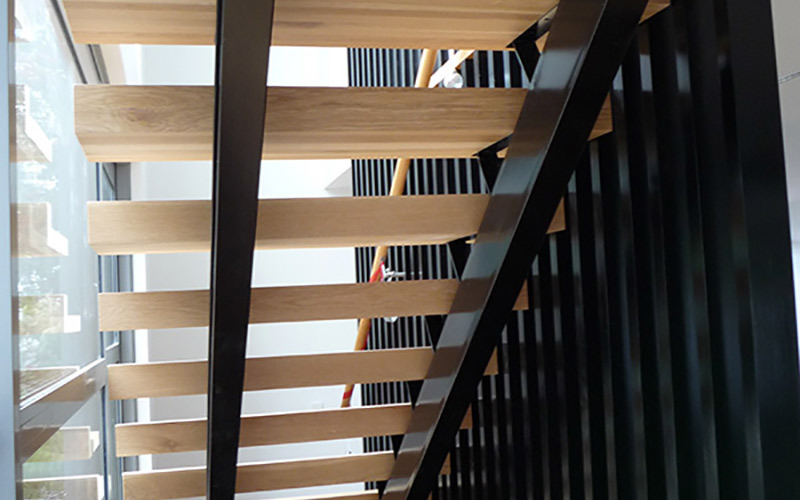 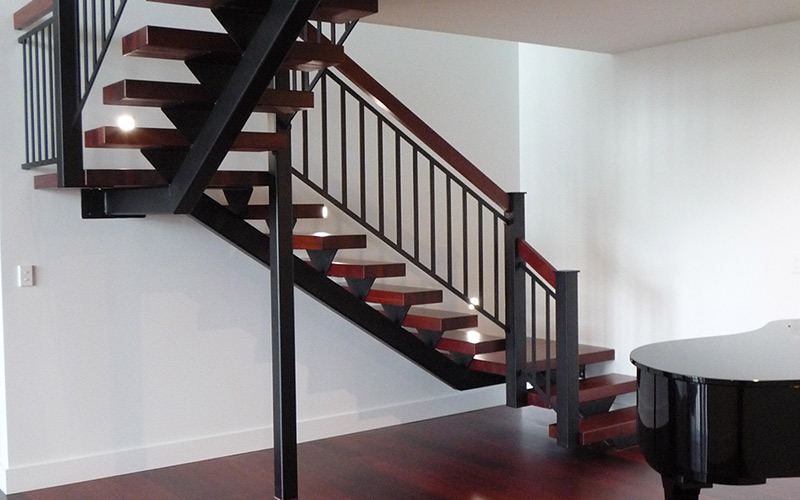 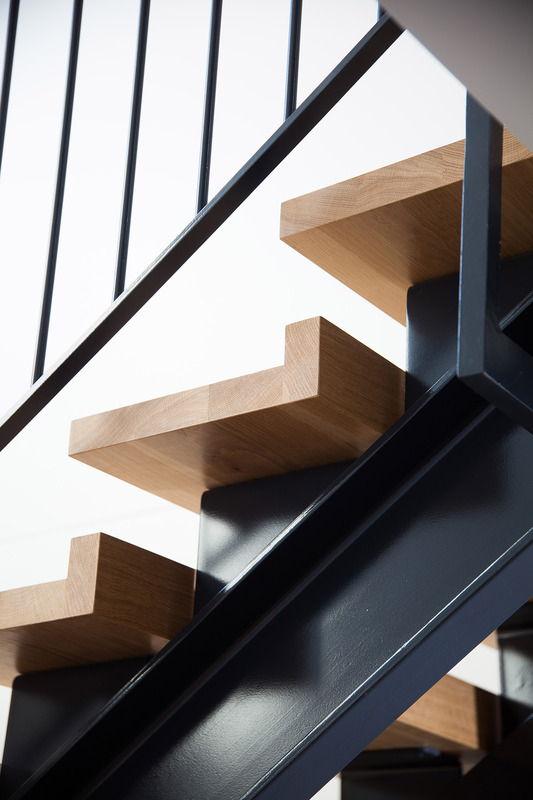 For a more robust design, our Dualis staircase uses two steel stringers underneath. 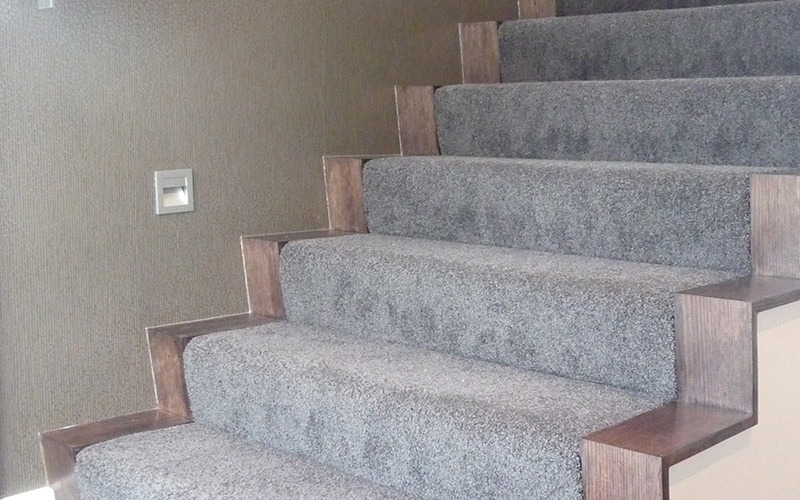 This gives it a sturdier look that works well with treads with a granite overlay. 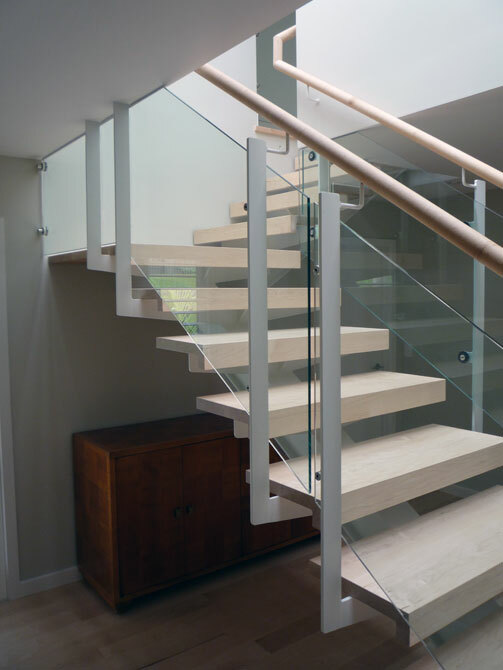 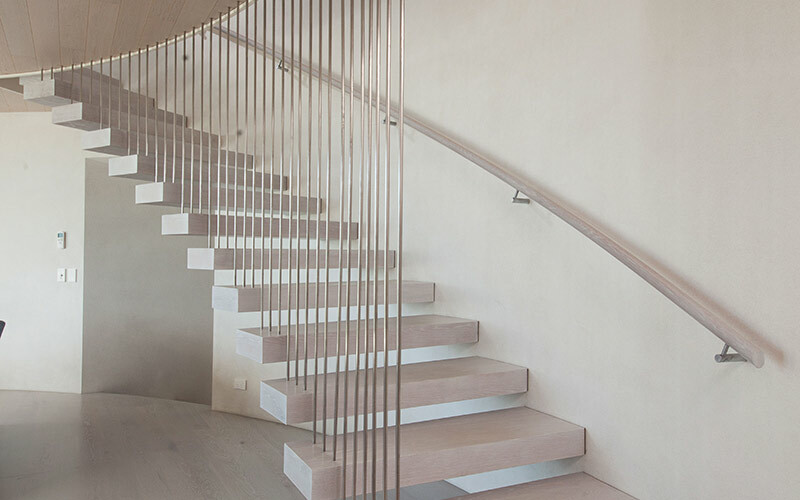 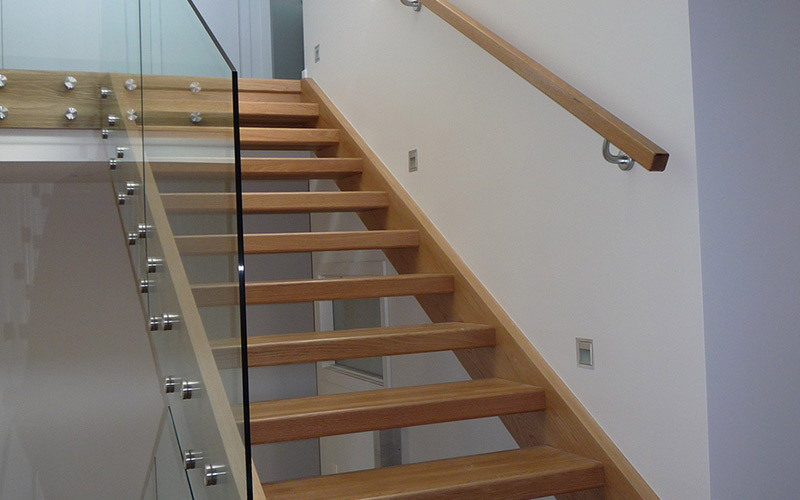 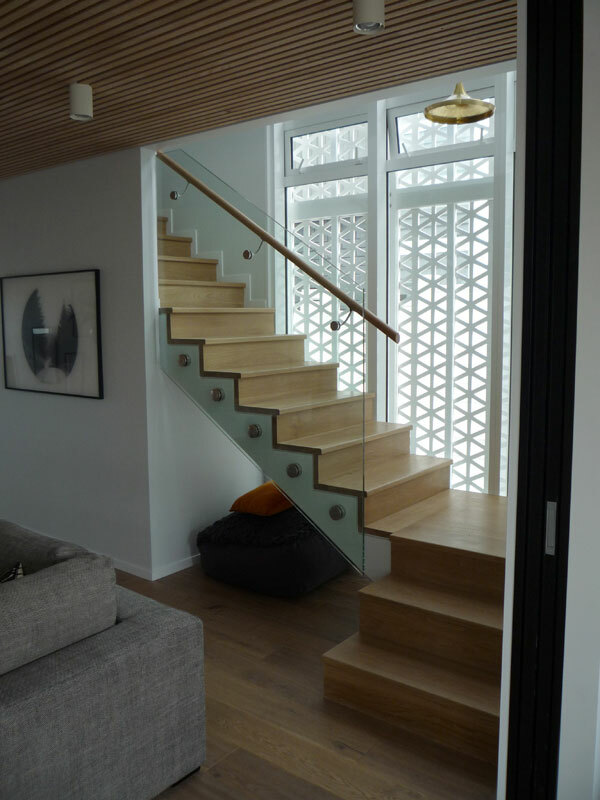 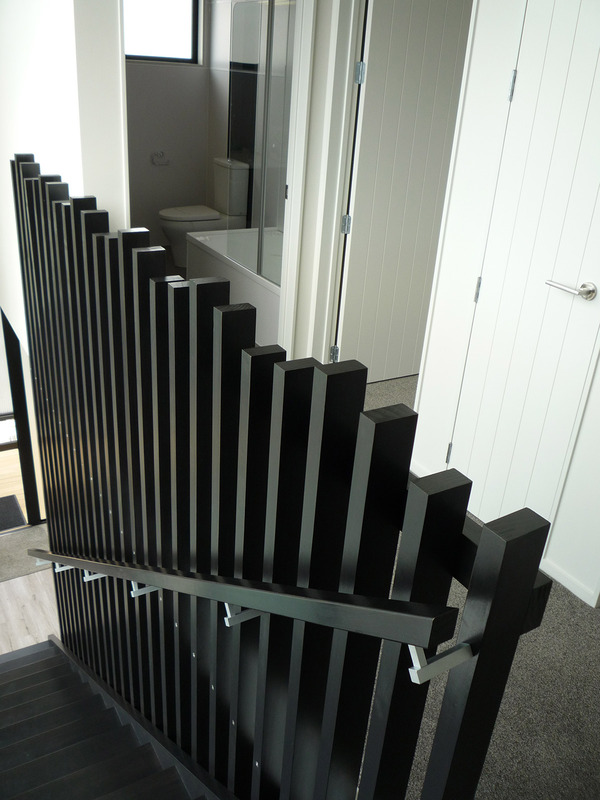 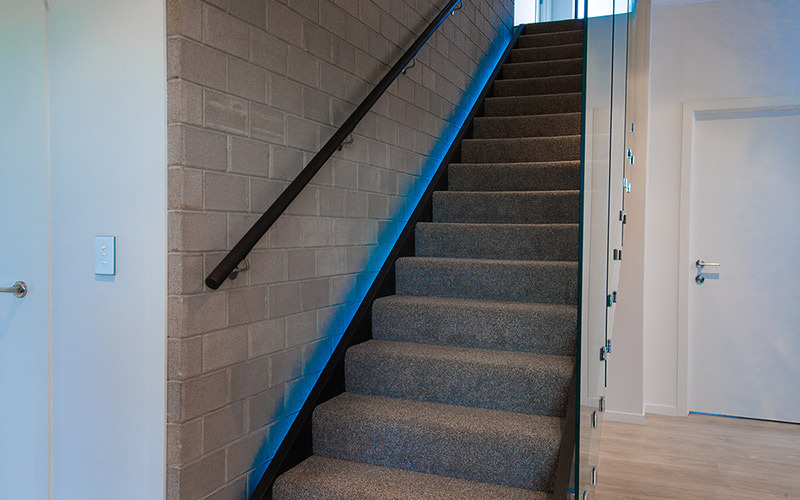 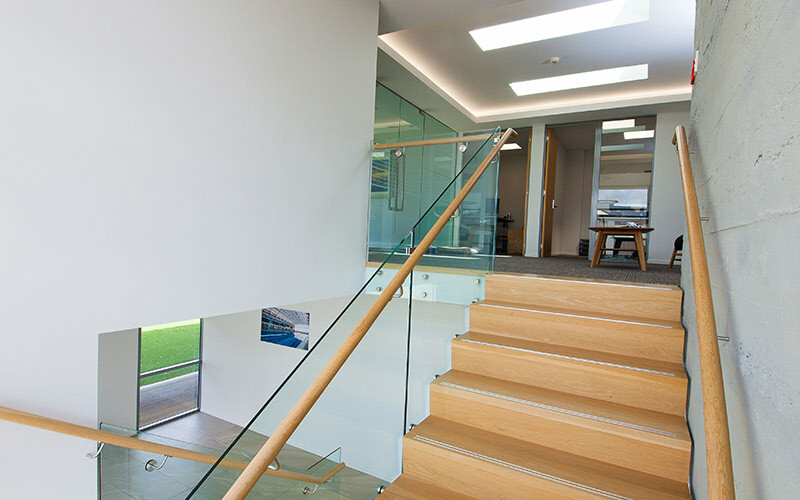 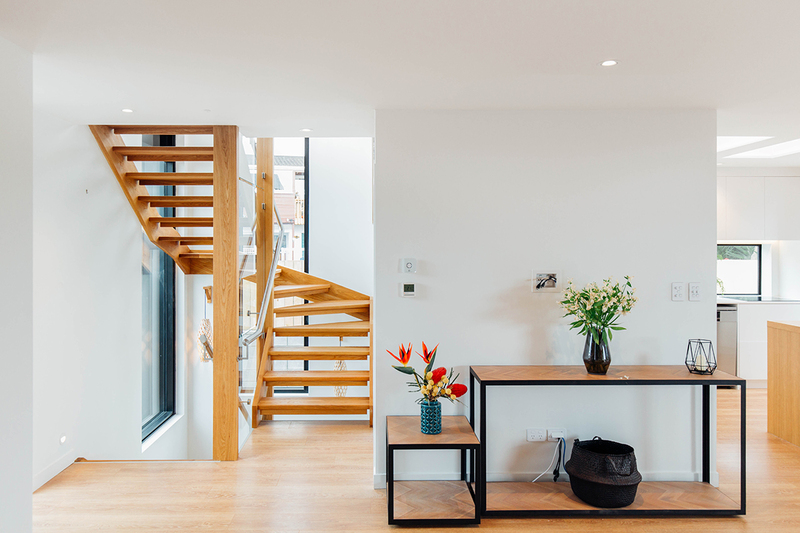 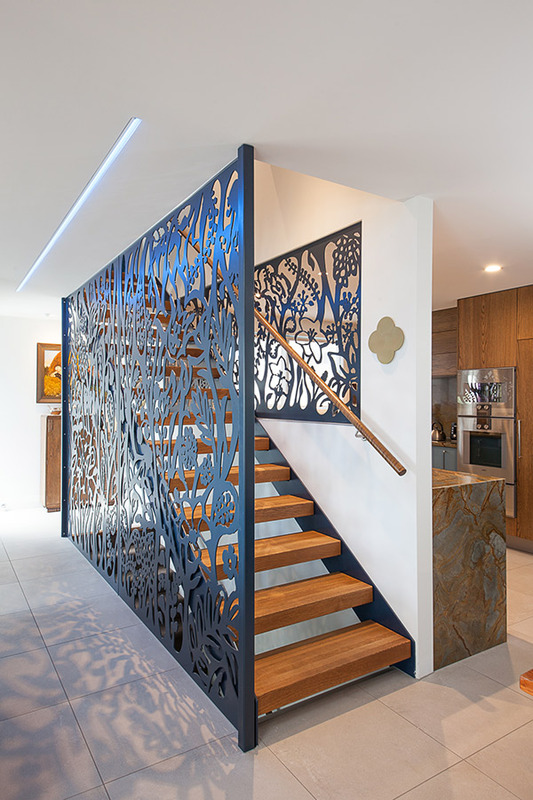 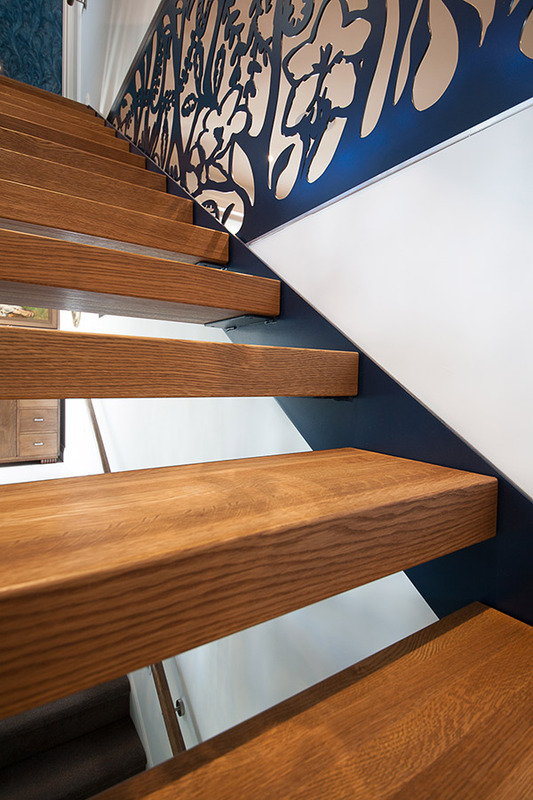 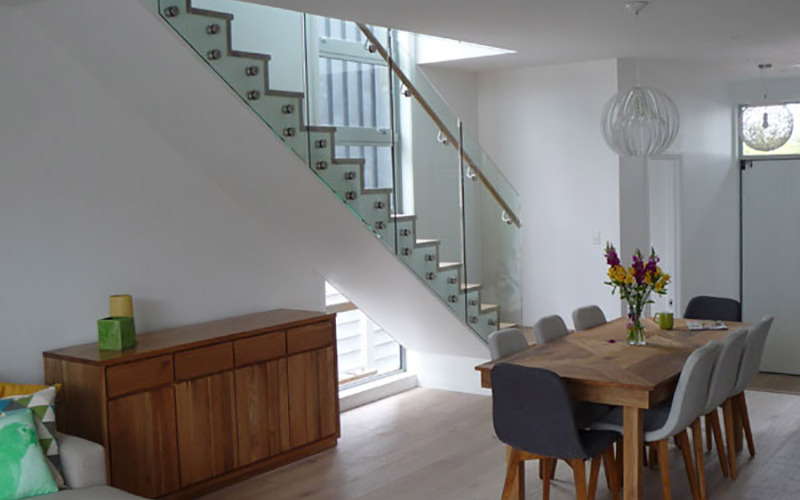 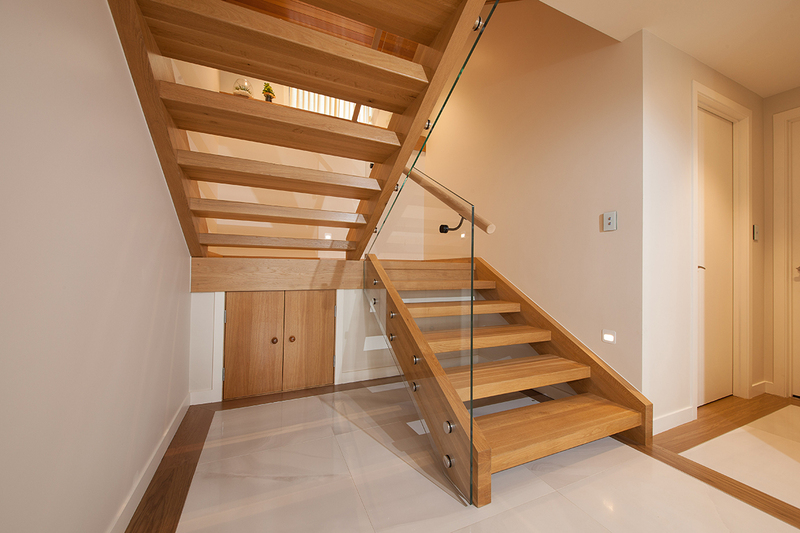 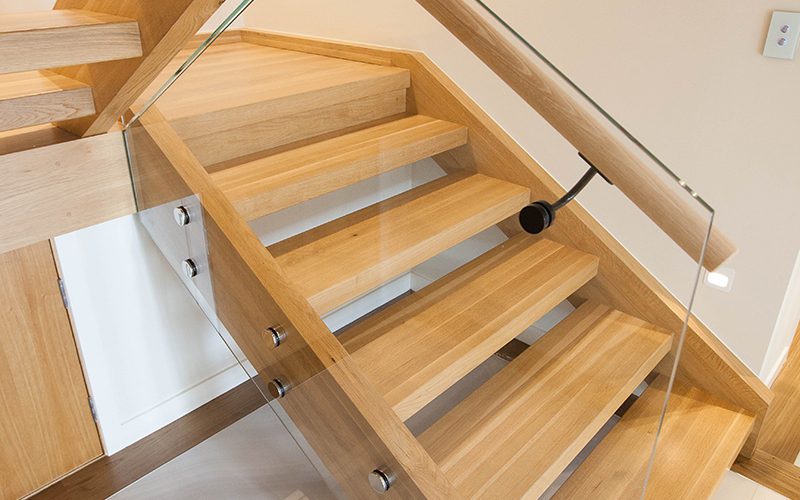 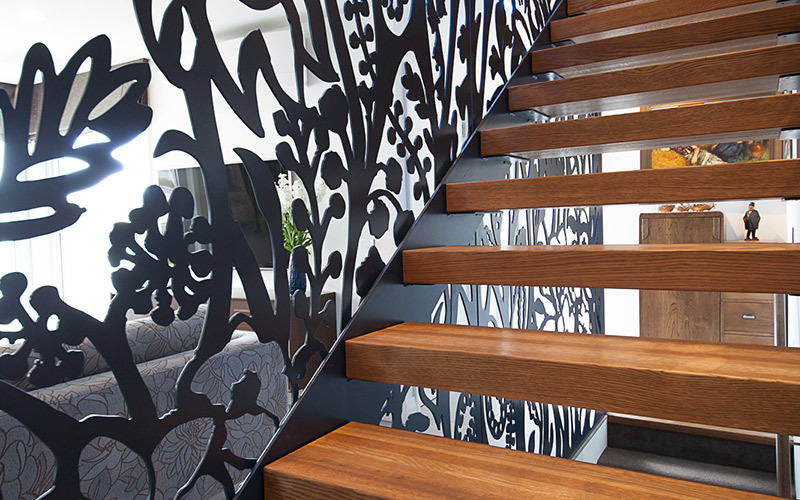 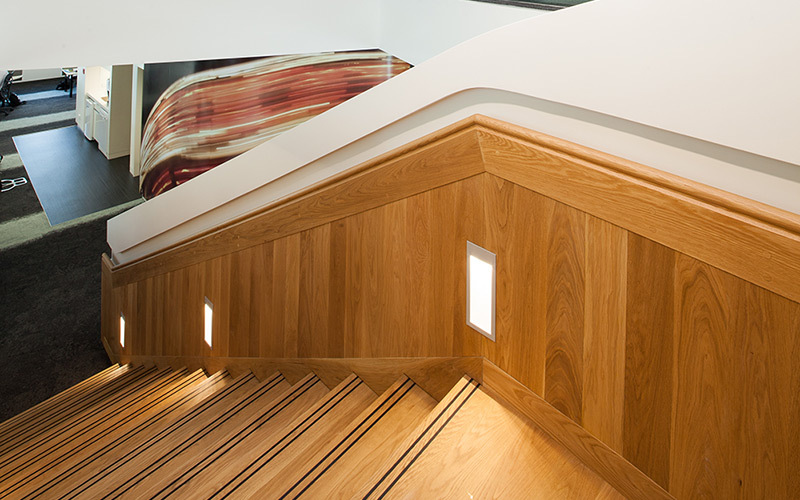 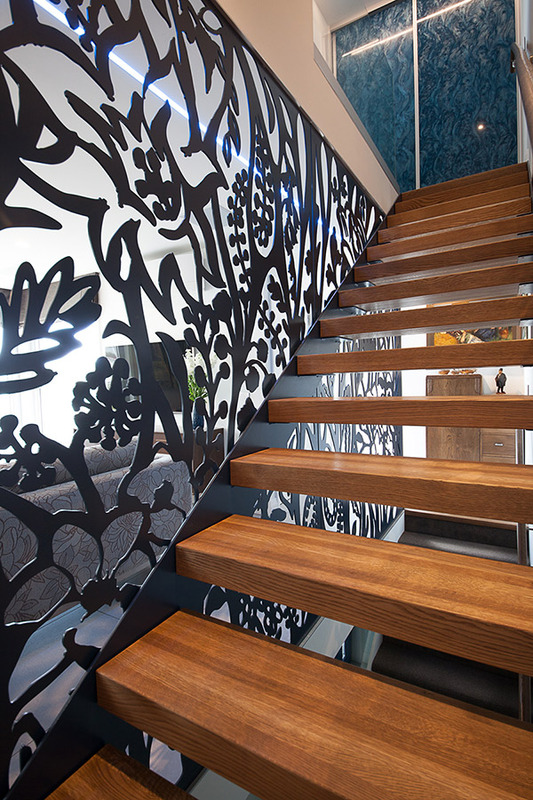 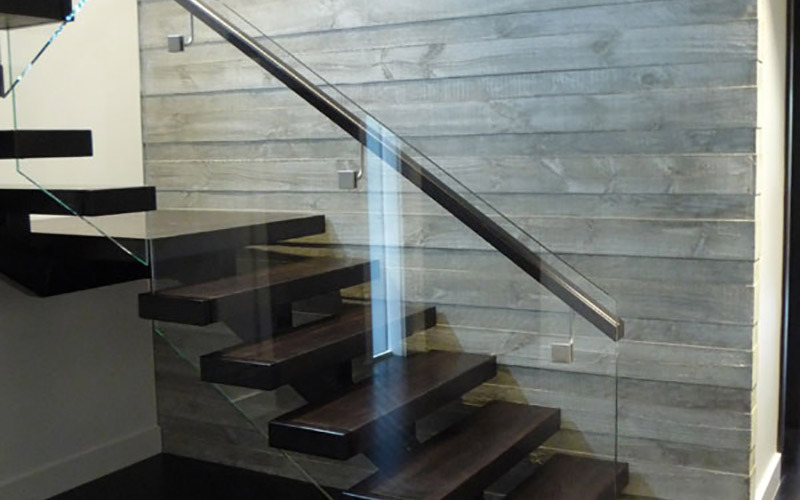 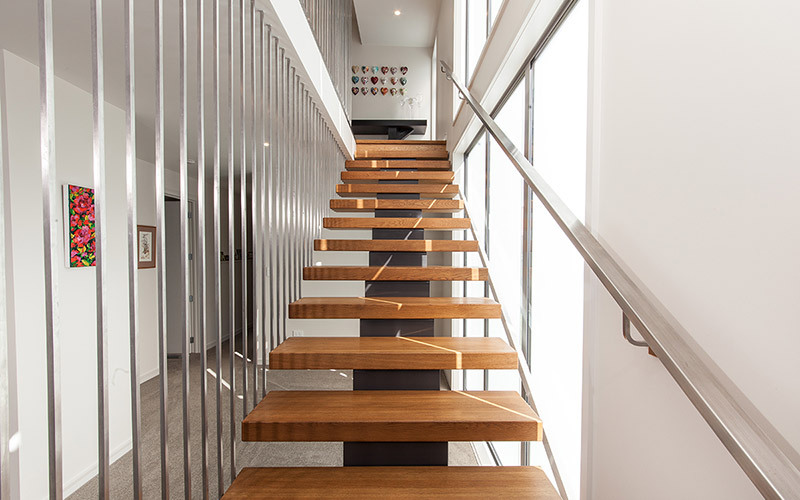 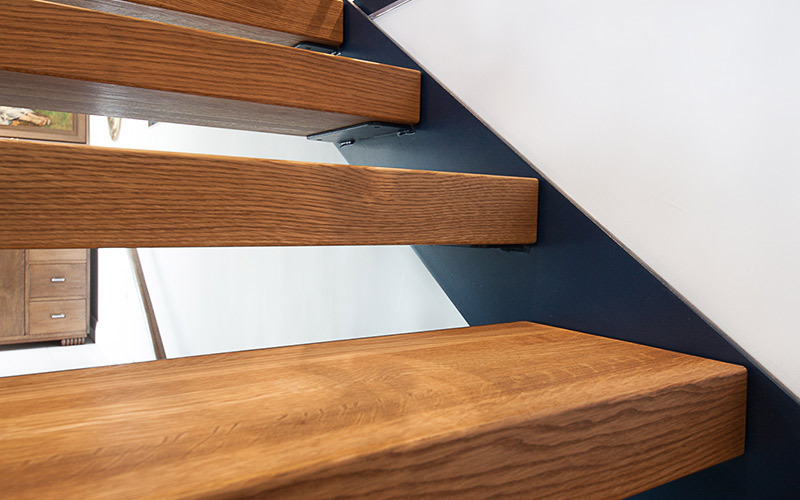 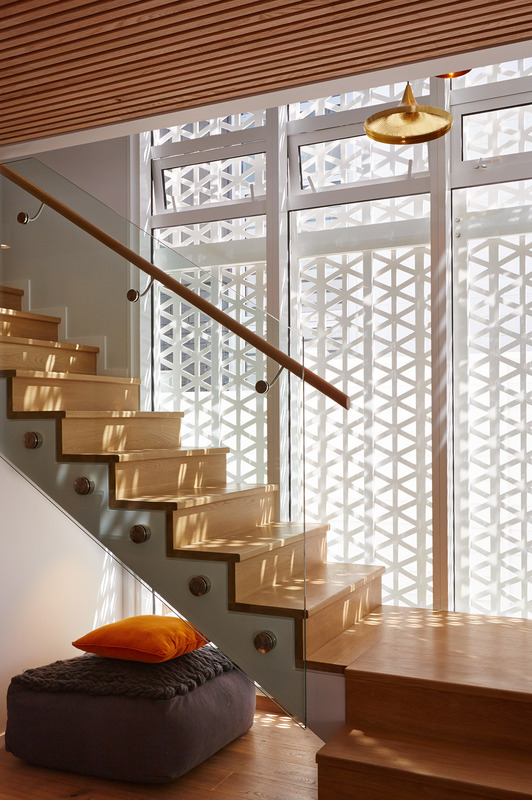 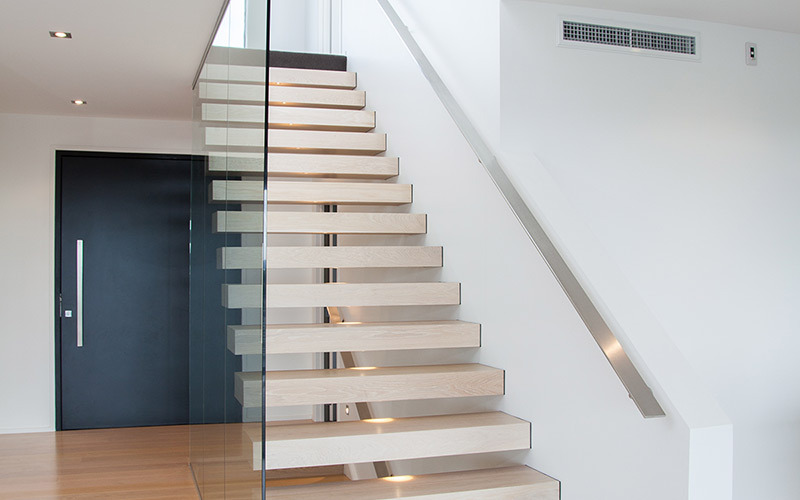 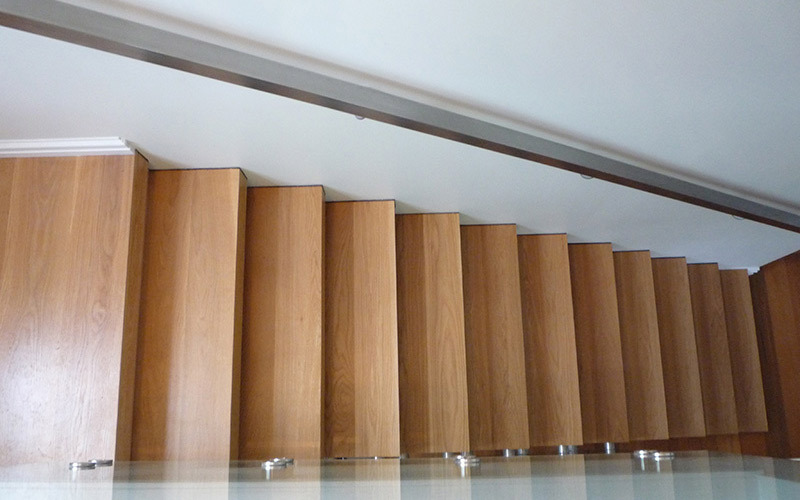 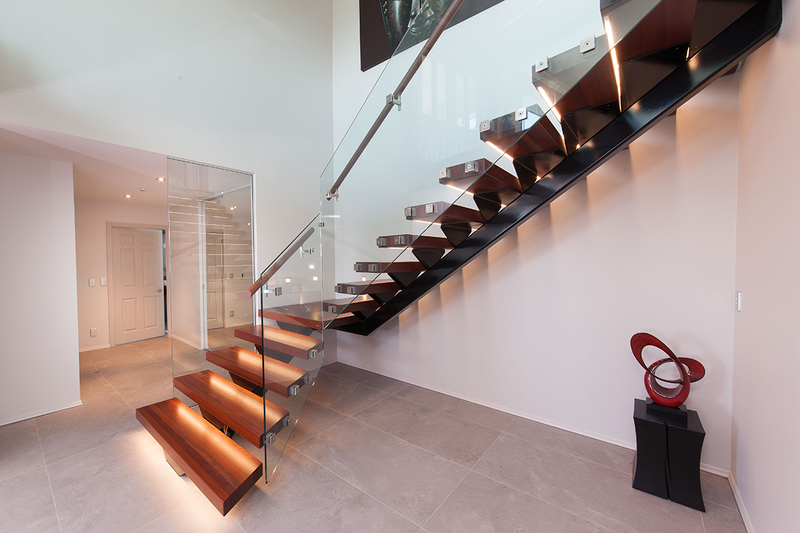 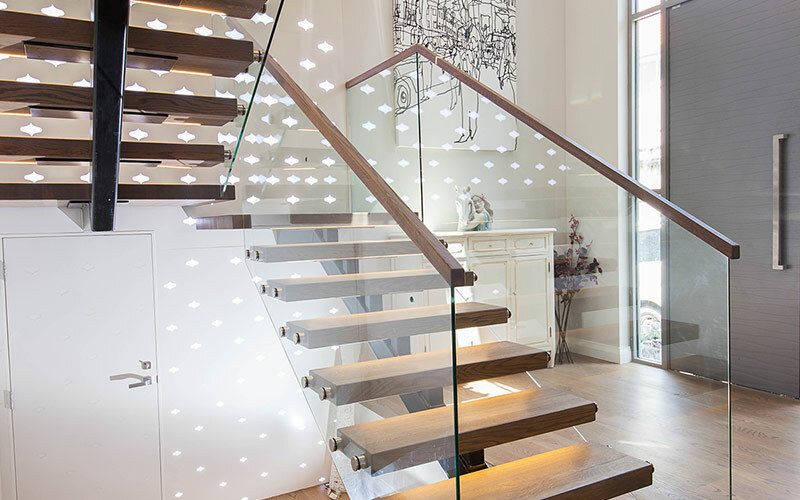 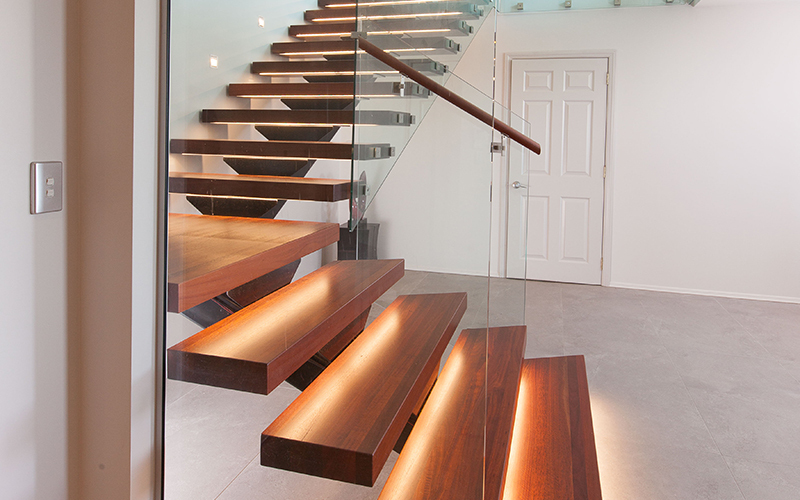 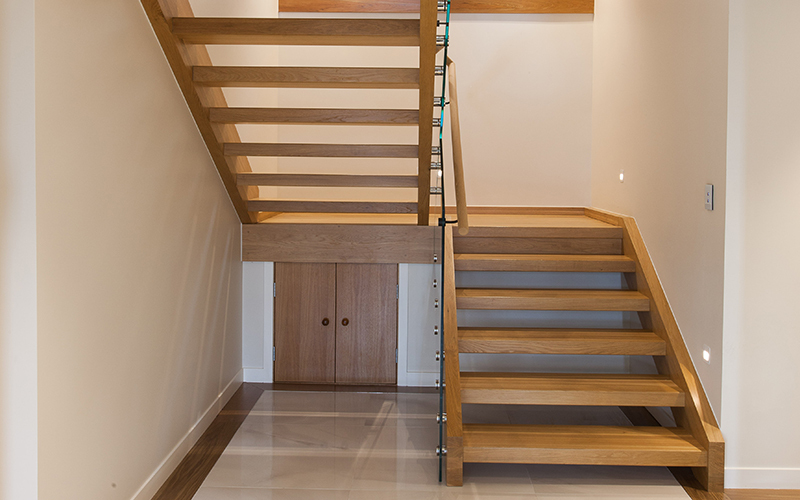 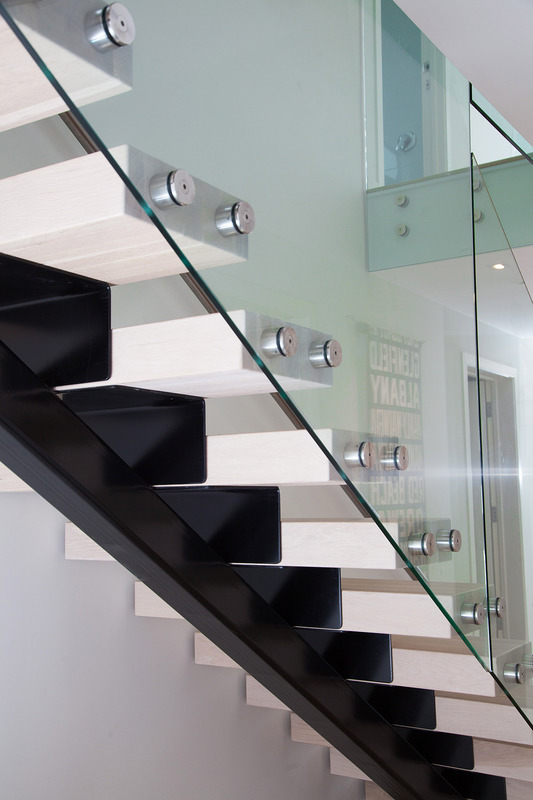 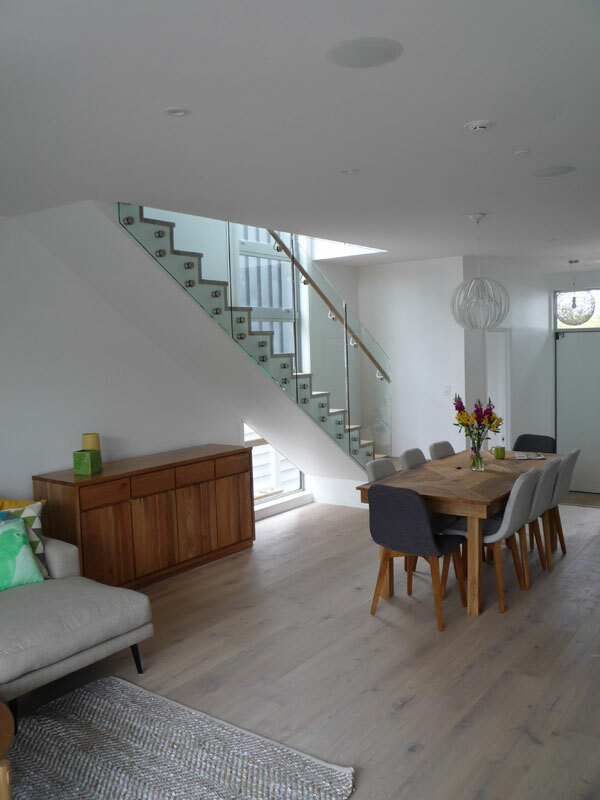 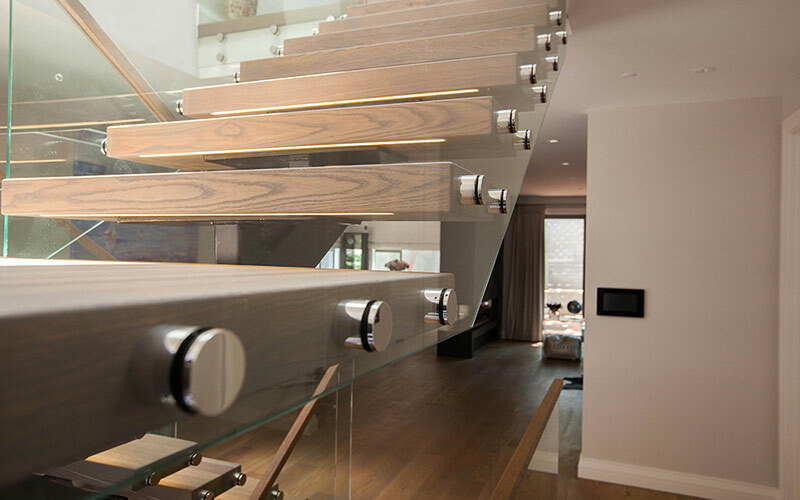 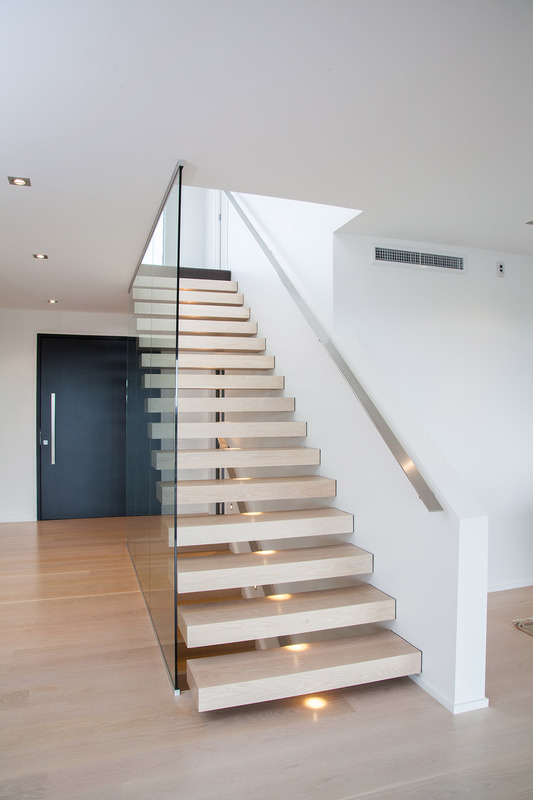 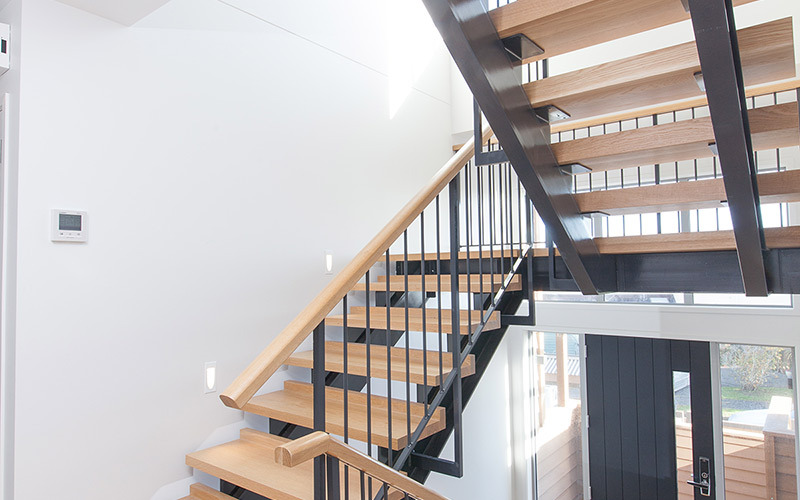 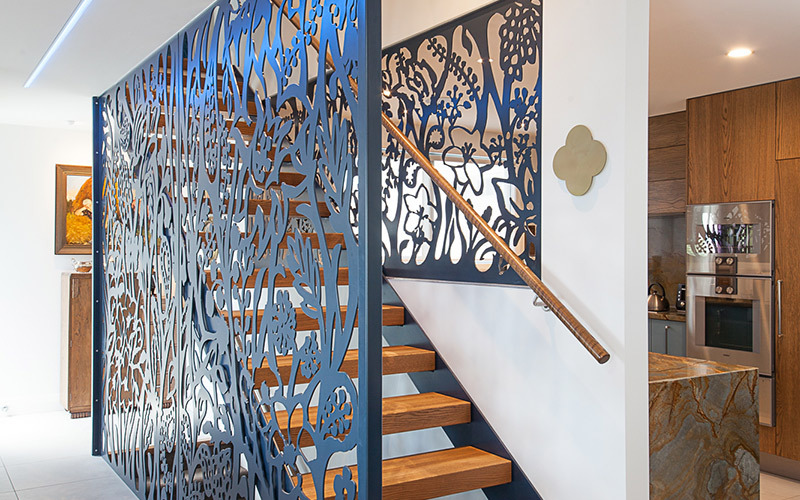 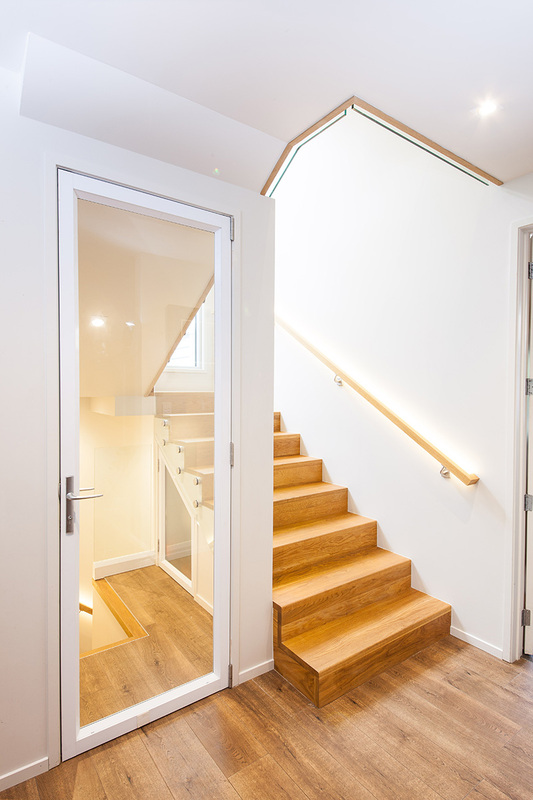 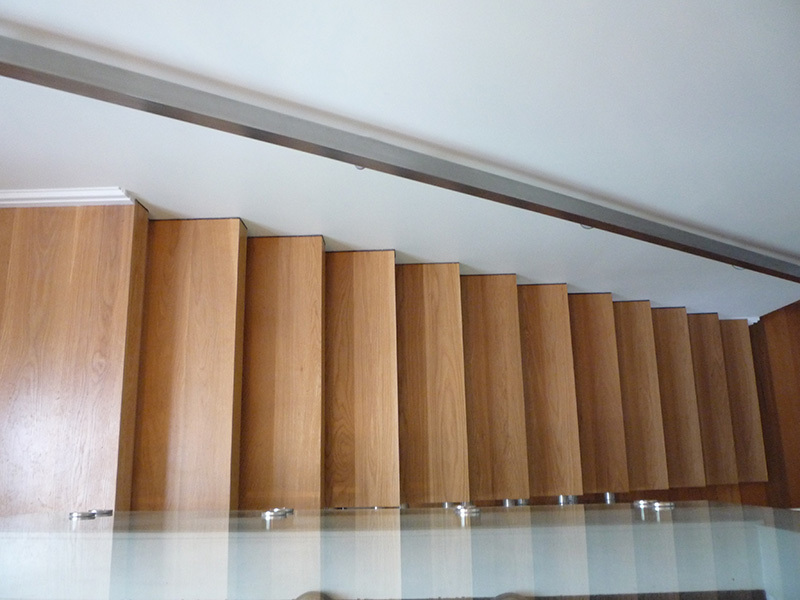 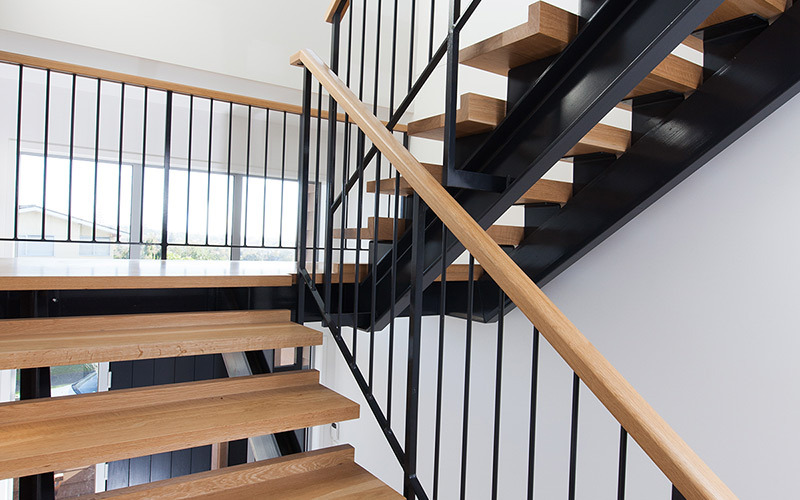 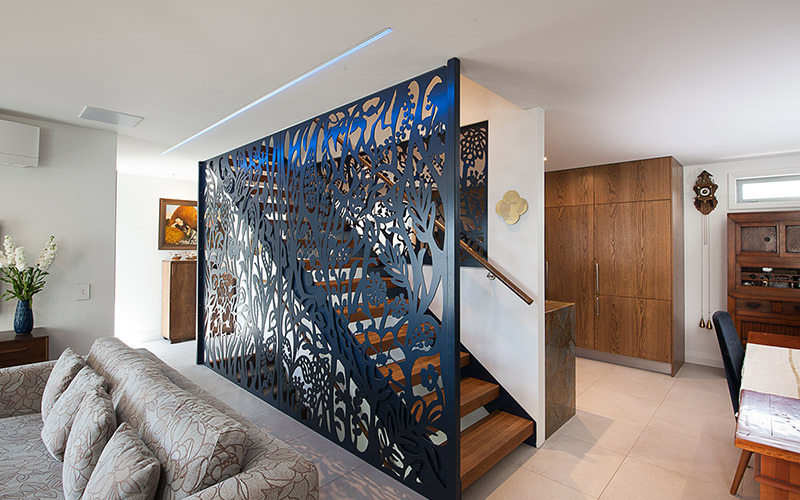 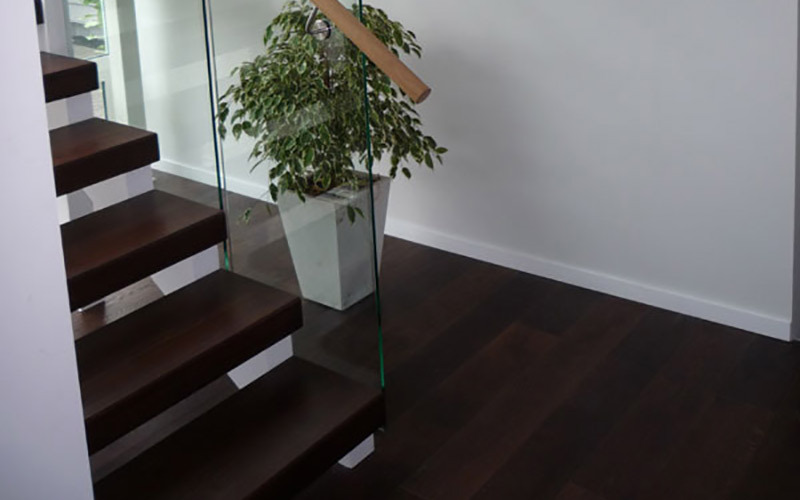 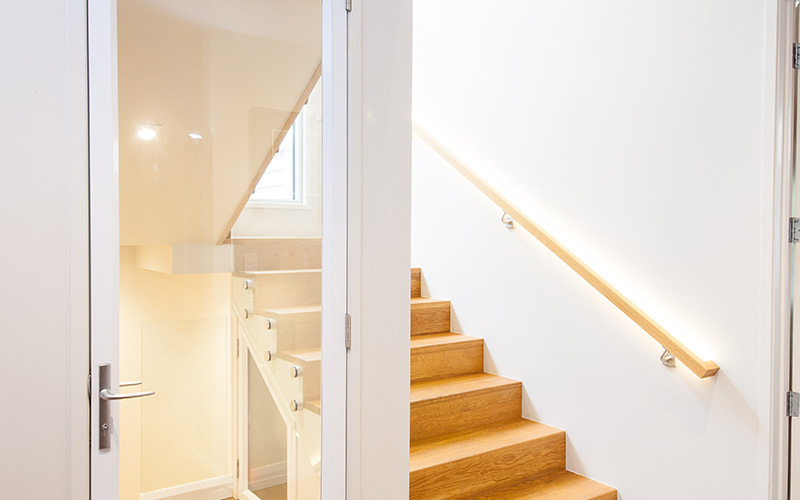 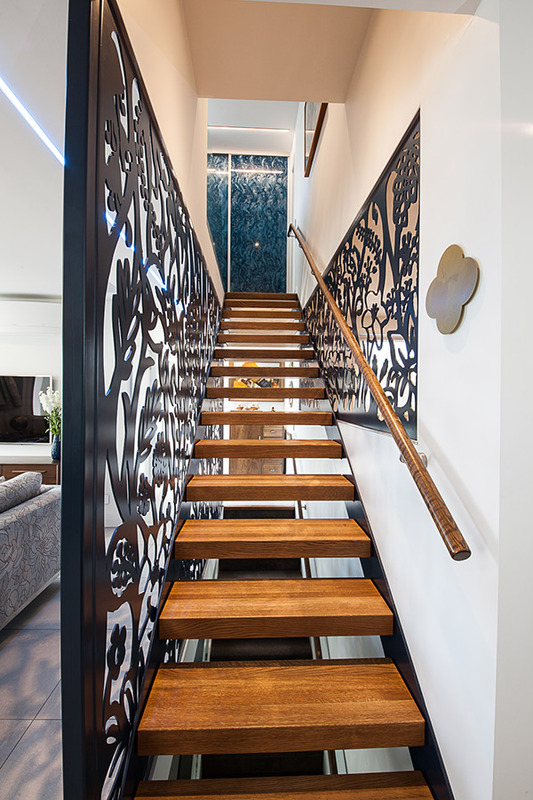 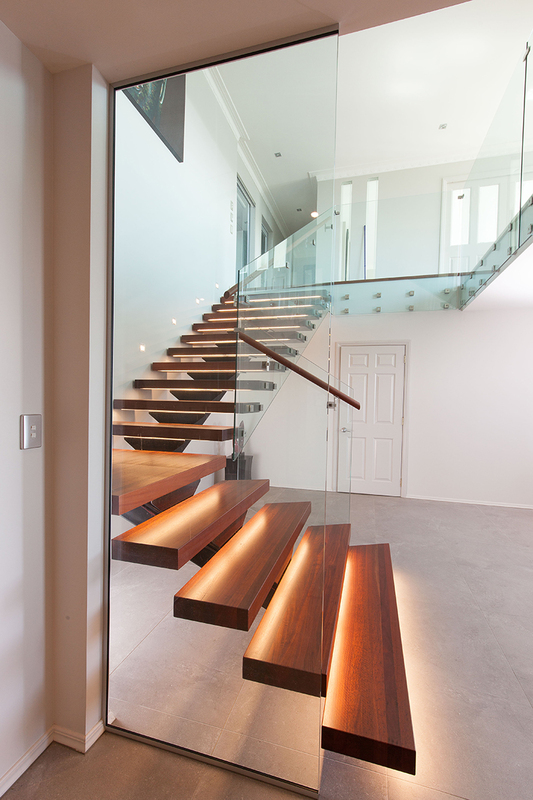 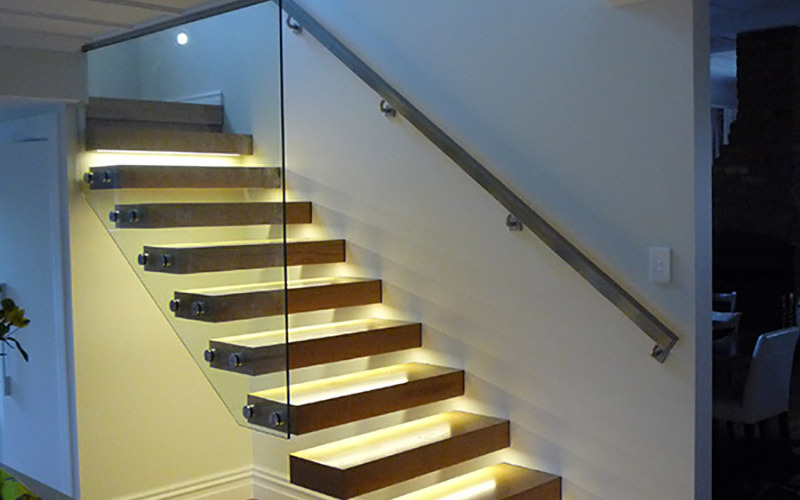 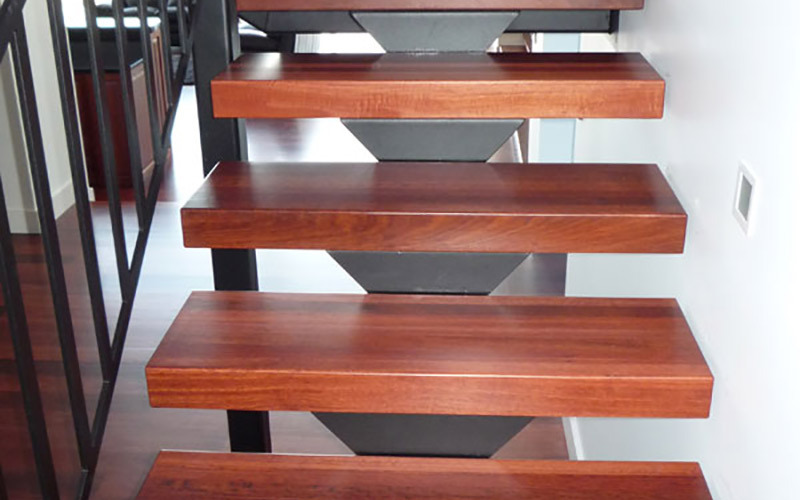 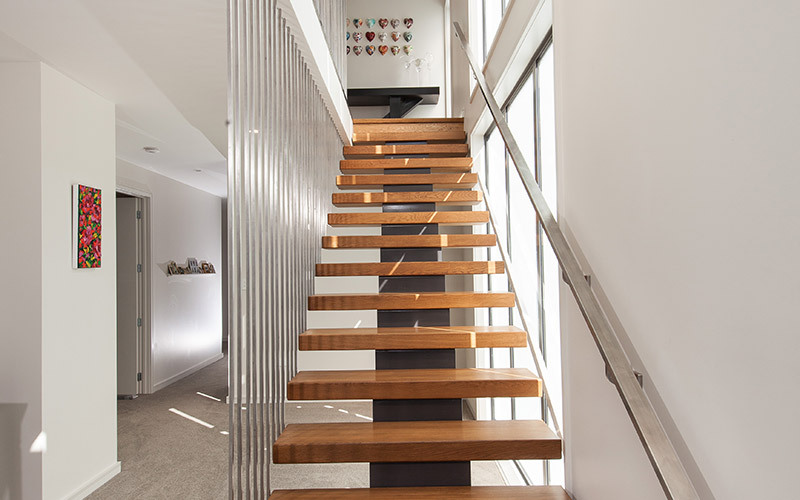 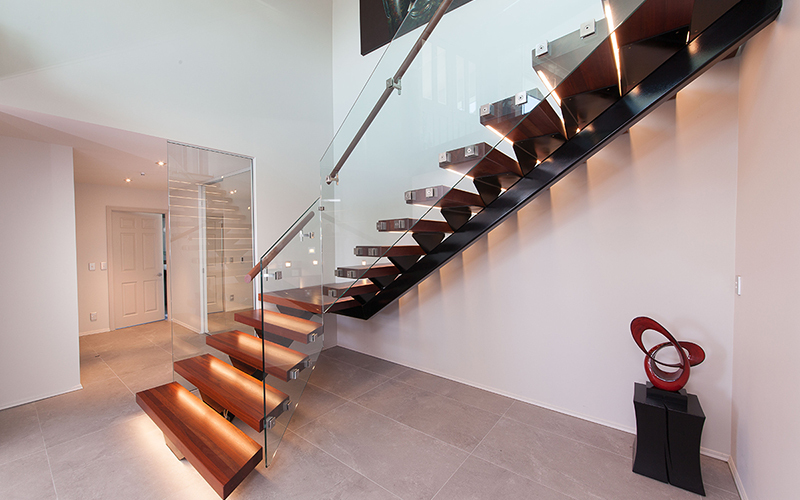 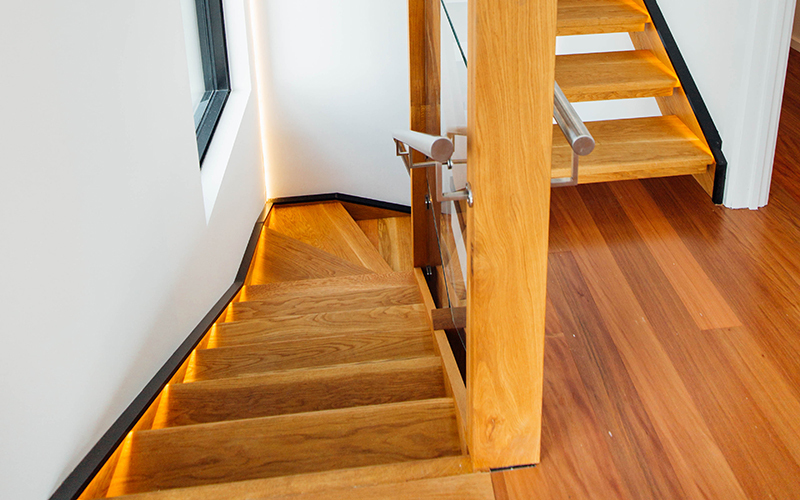 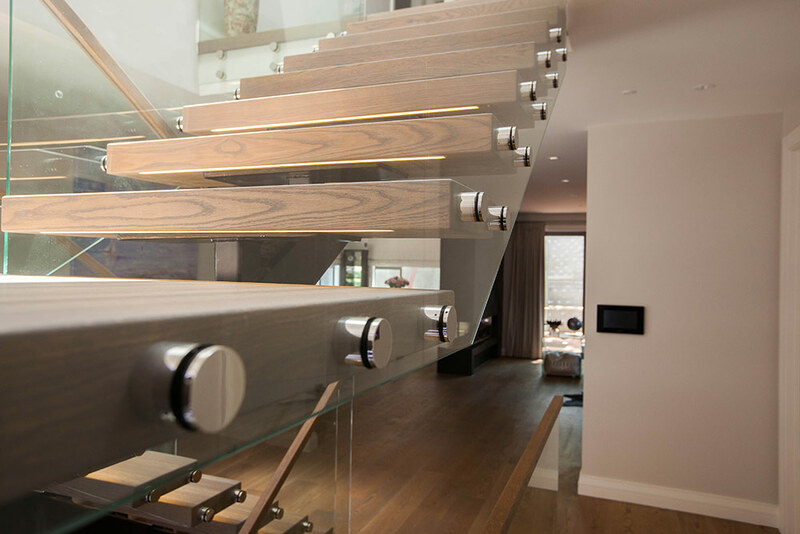 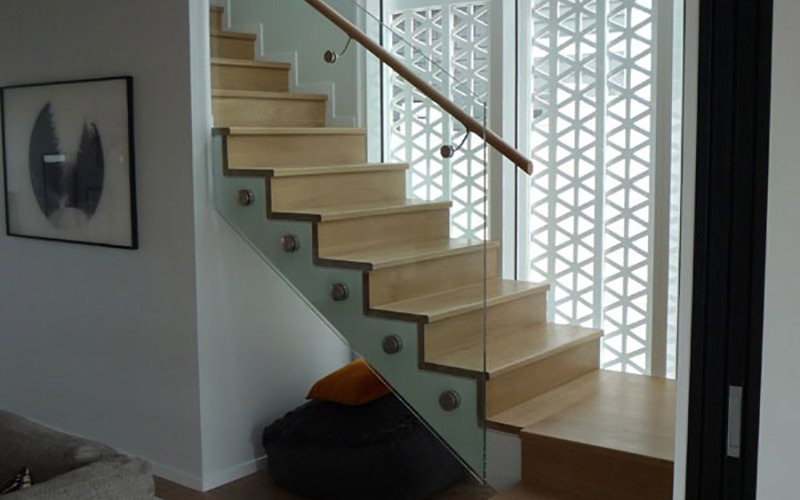 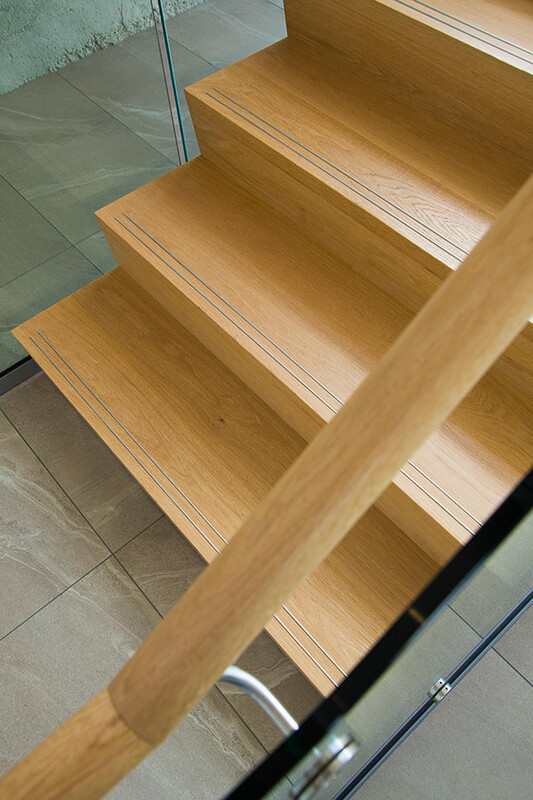 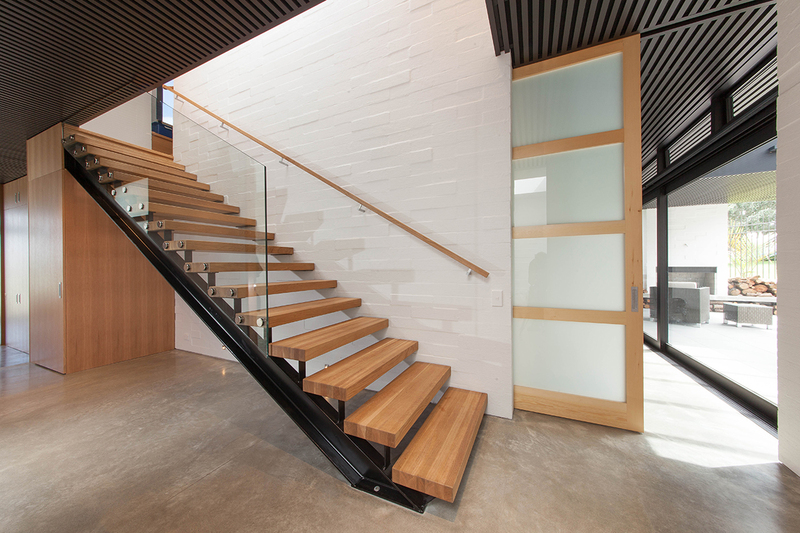 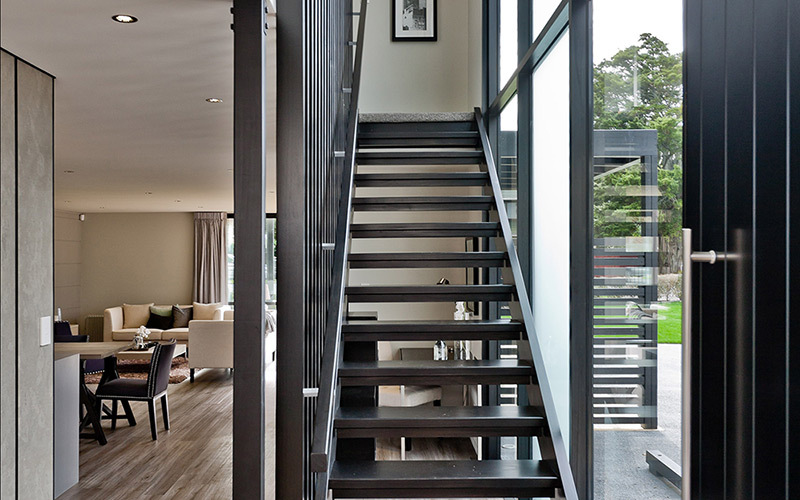 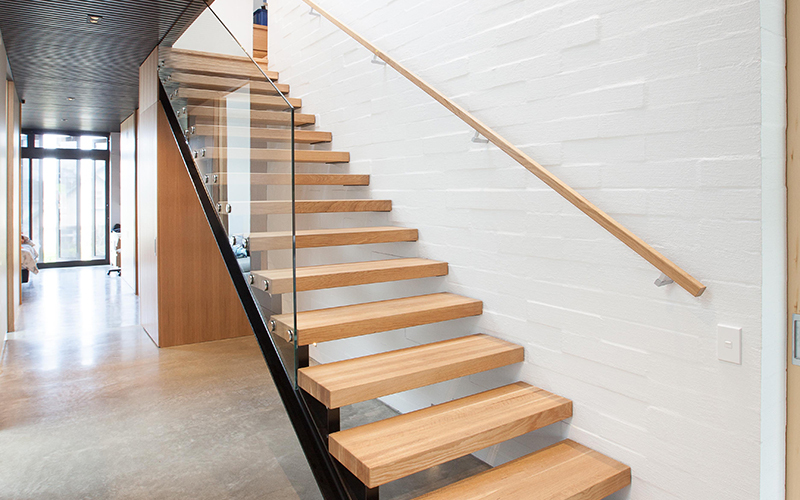 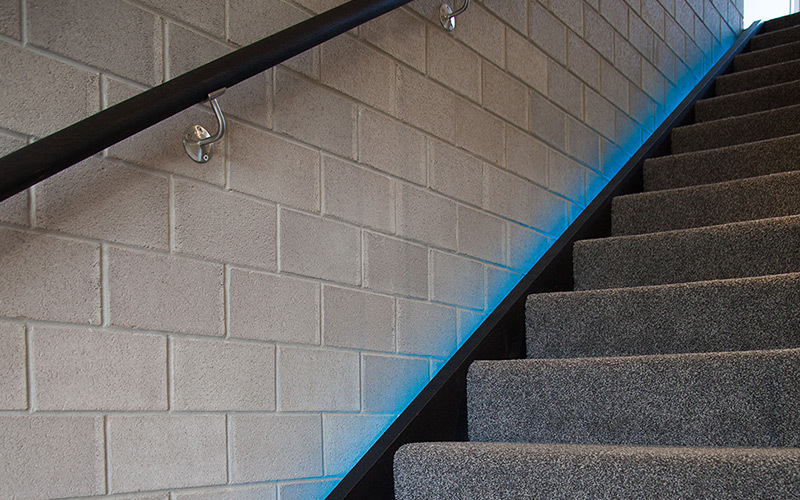 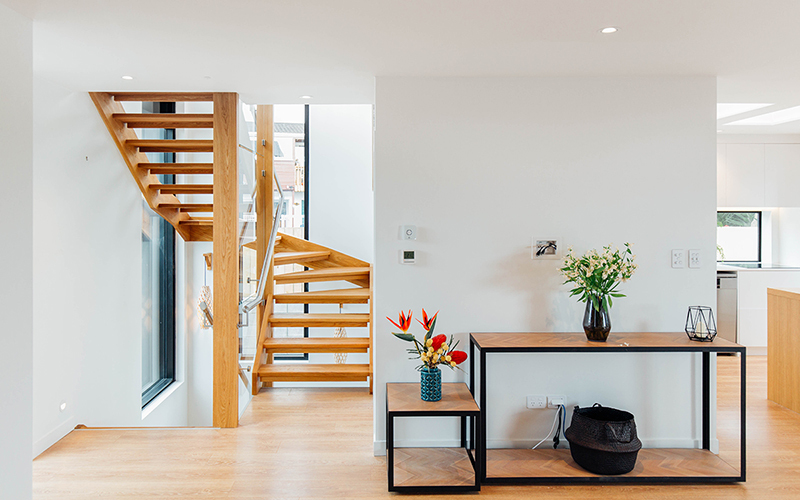 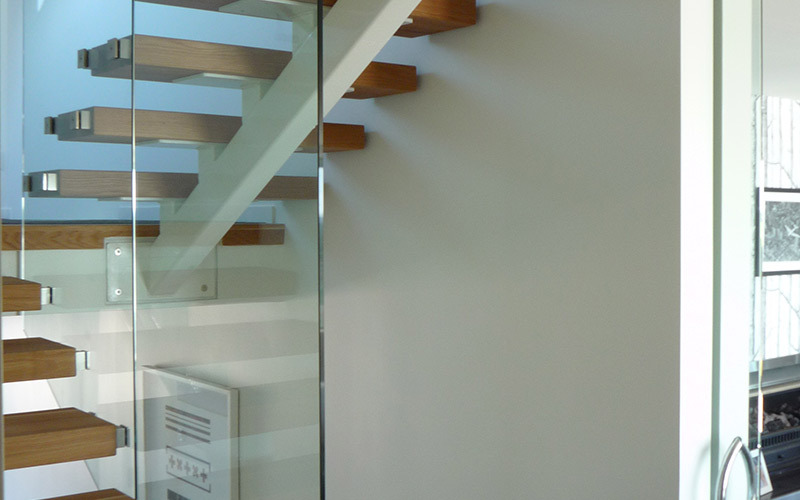 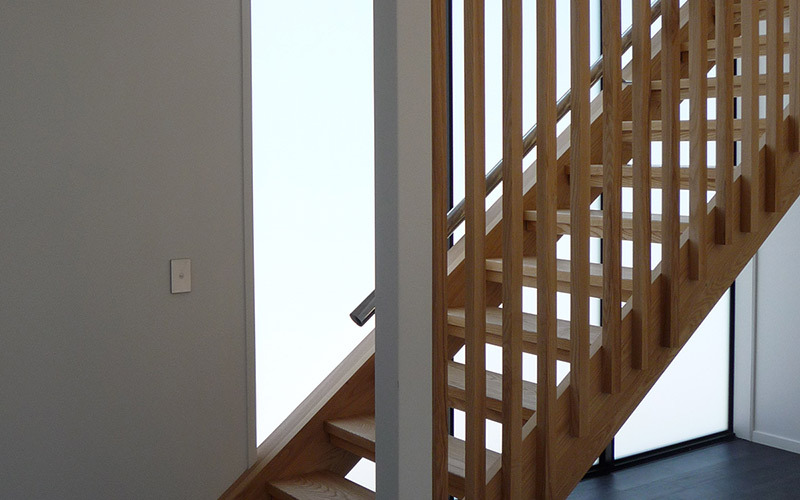 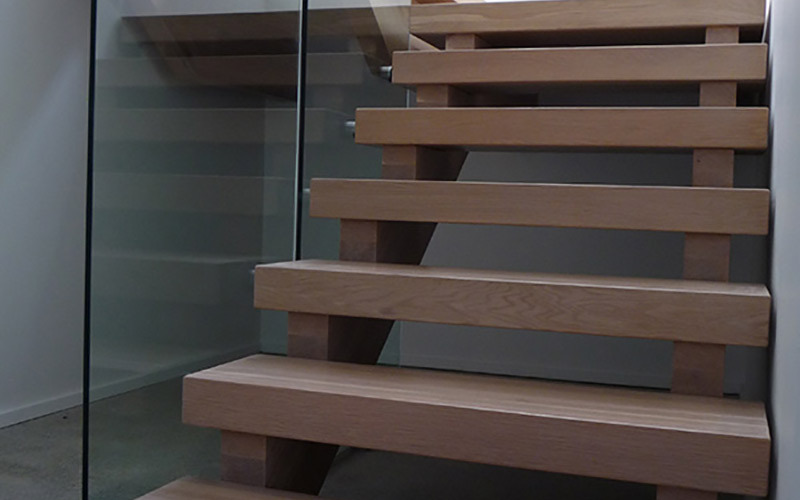 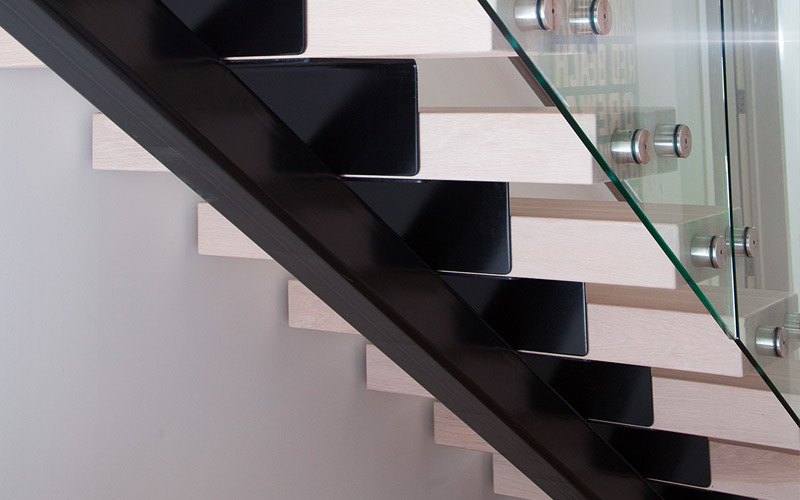 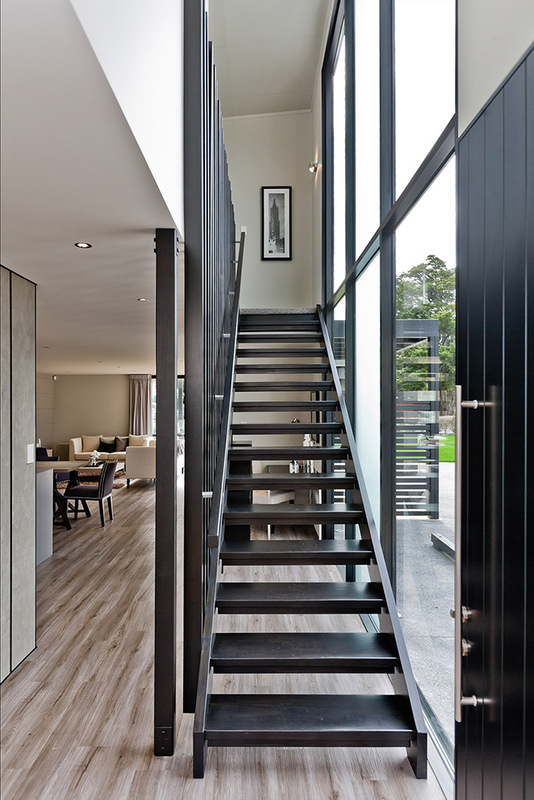 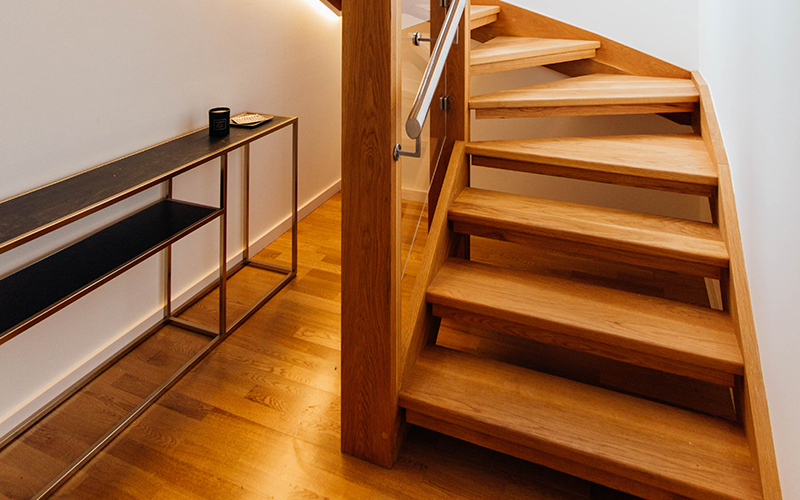 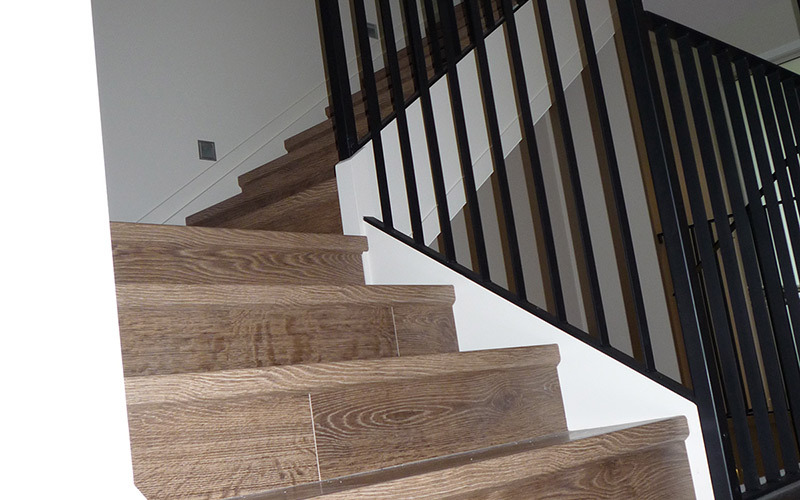 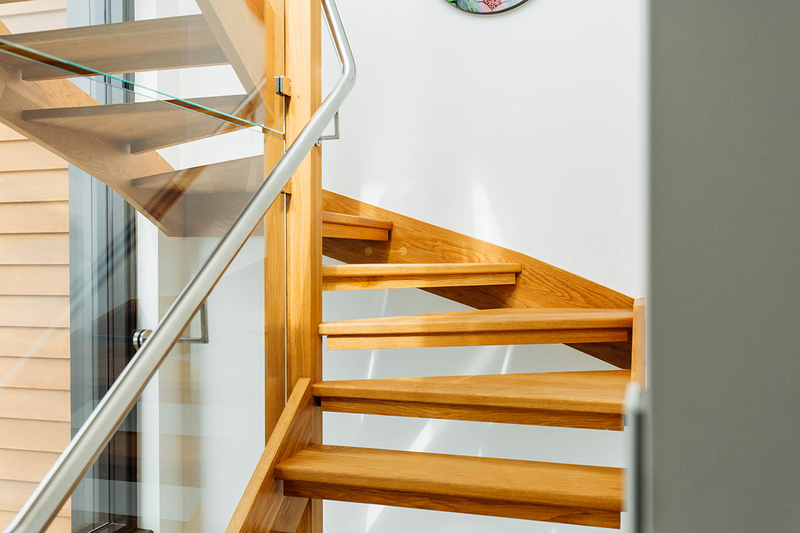 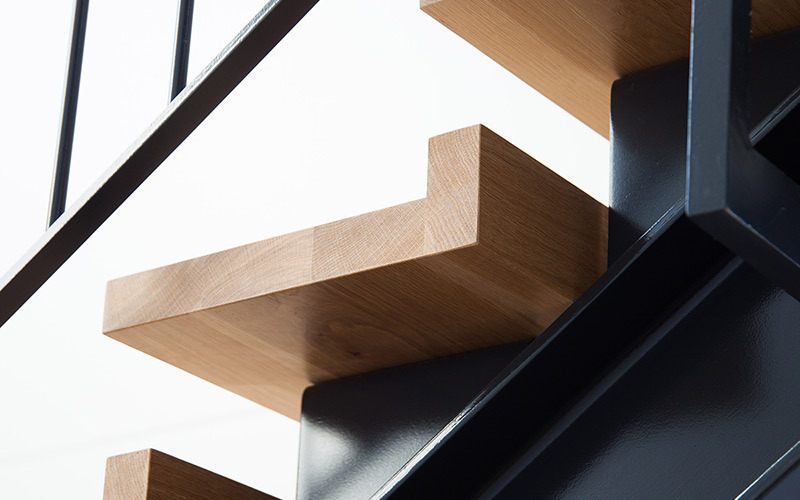 With our Lateralis design, plate steel stringers support your choice of stair treads from the sides, giving the staircase an elegant look that works well with modern spaces. 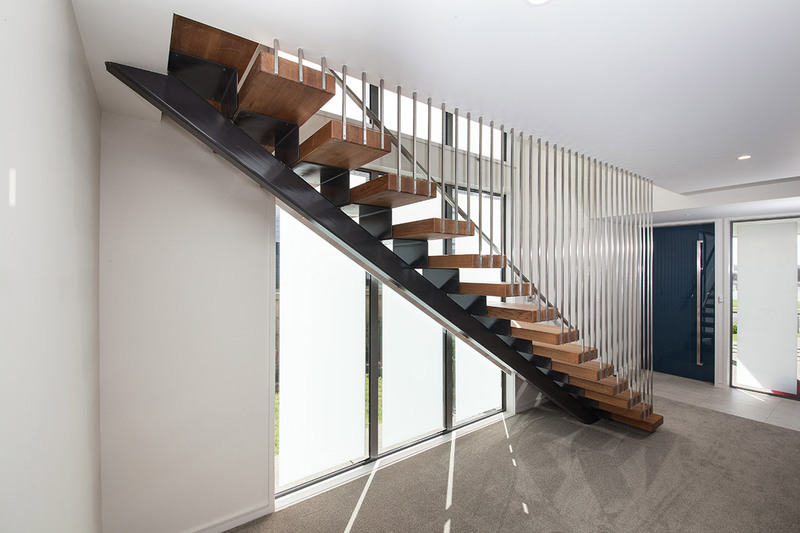 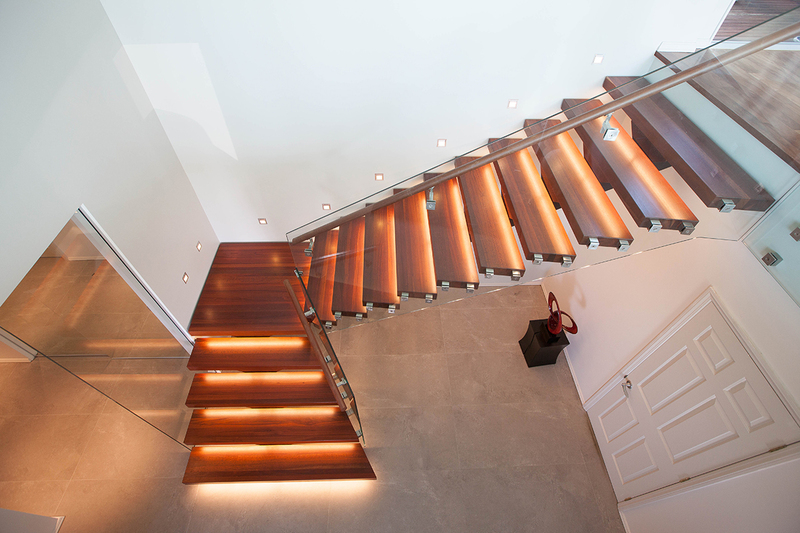 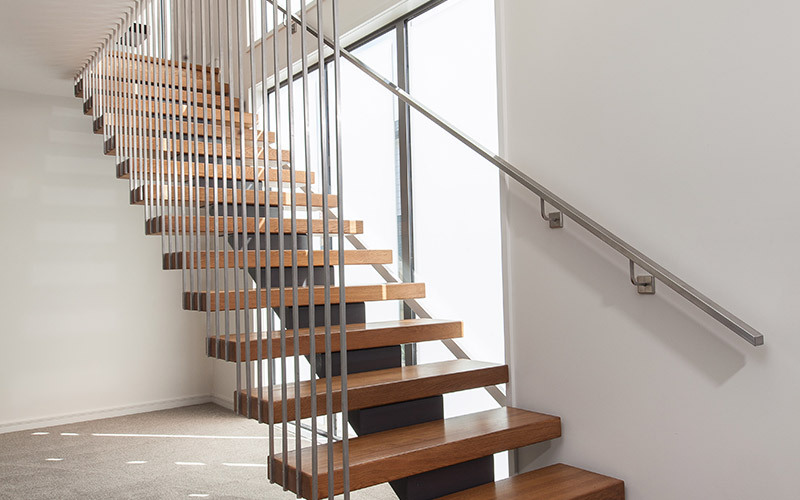 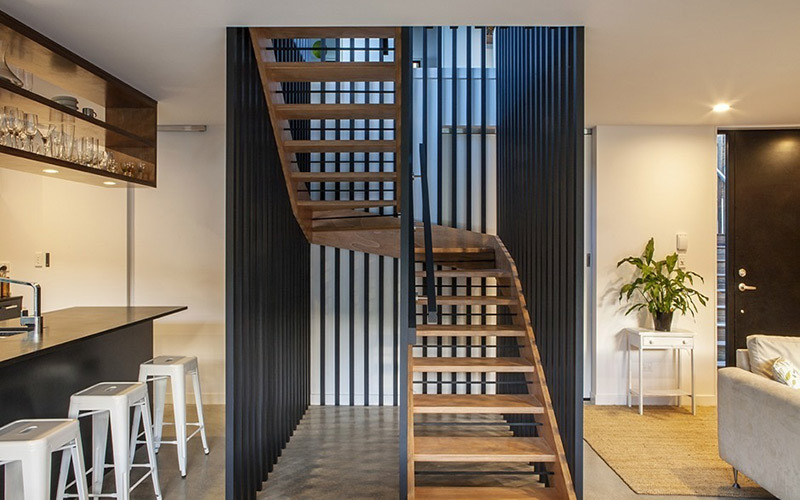 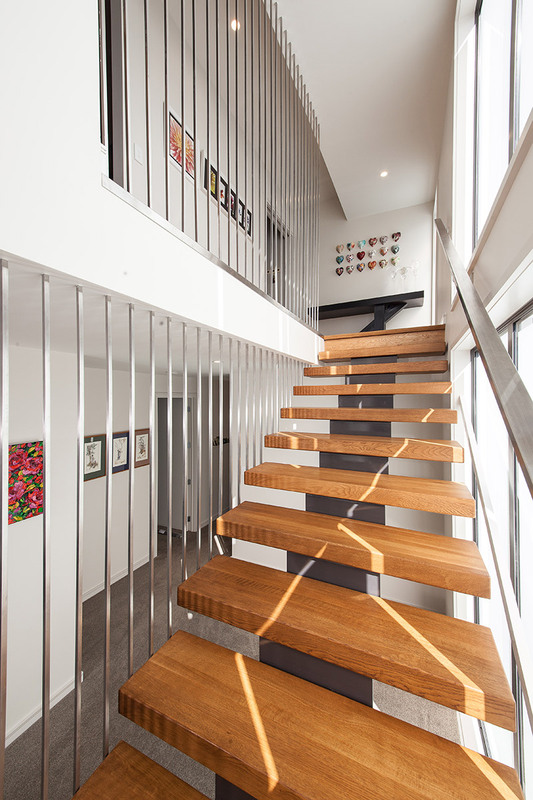 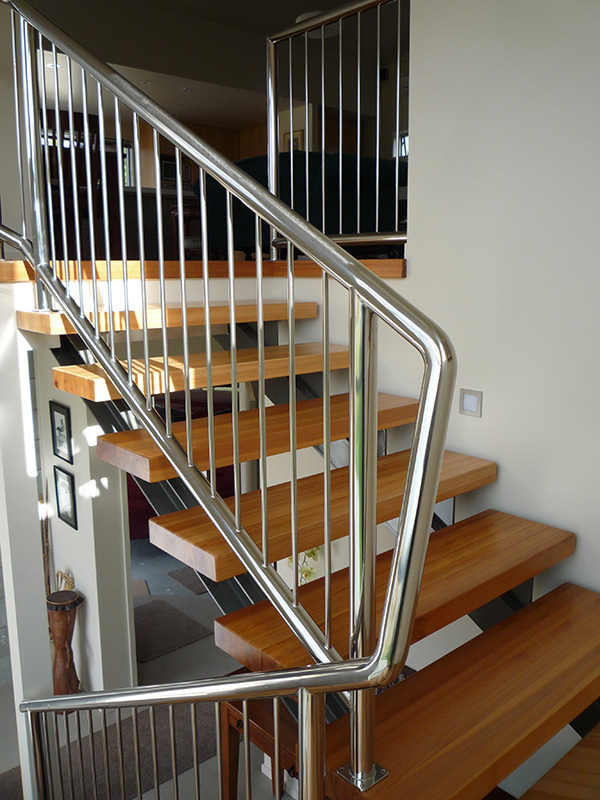 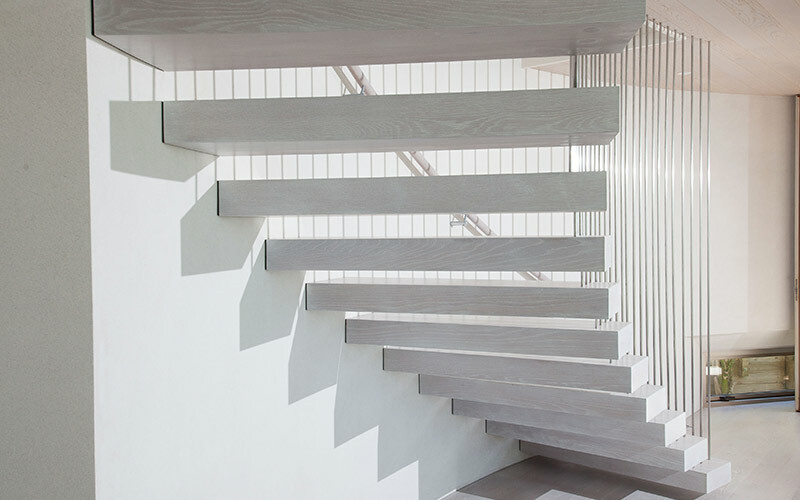 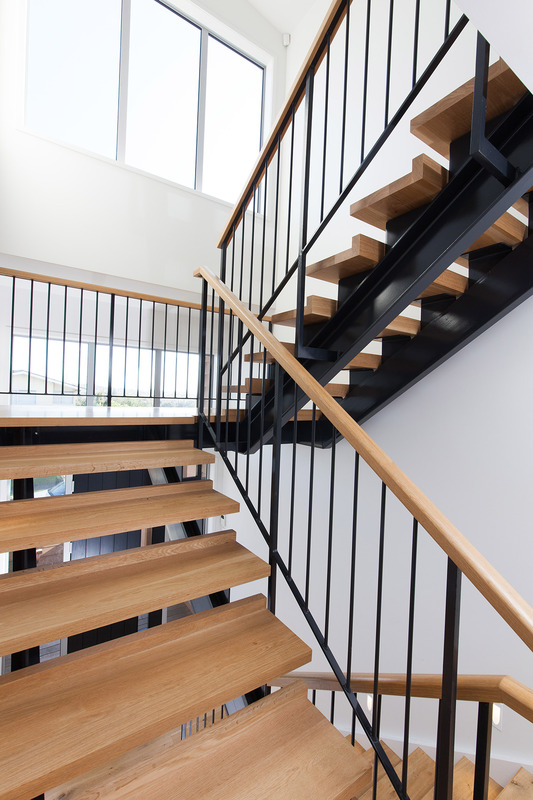 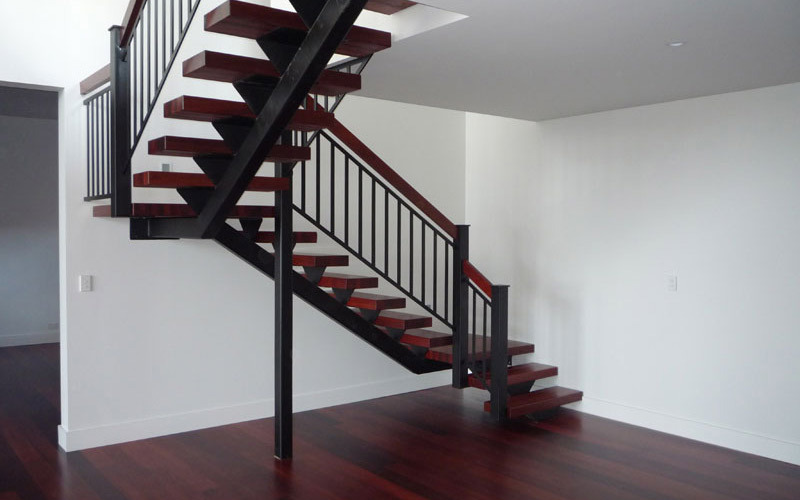 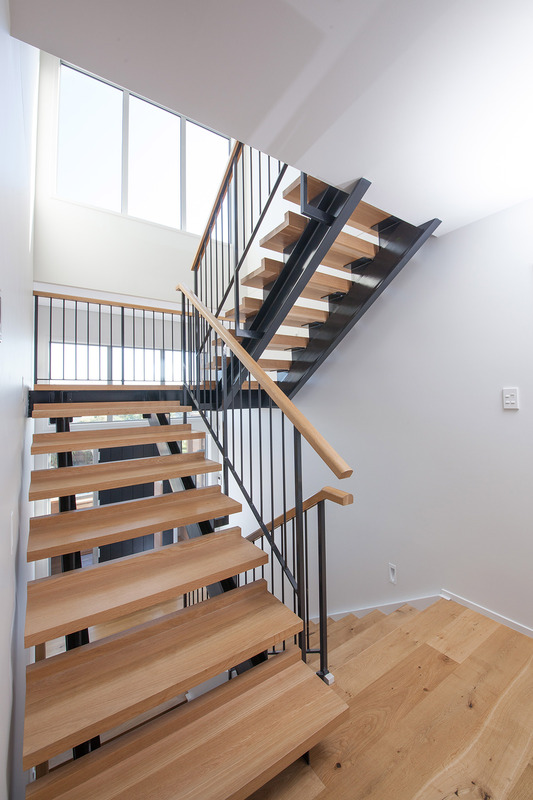 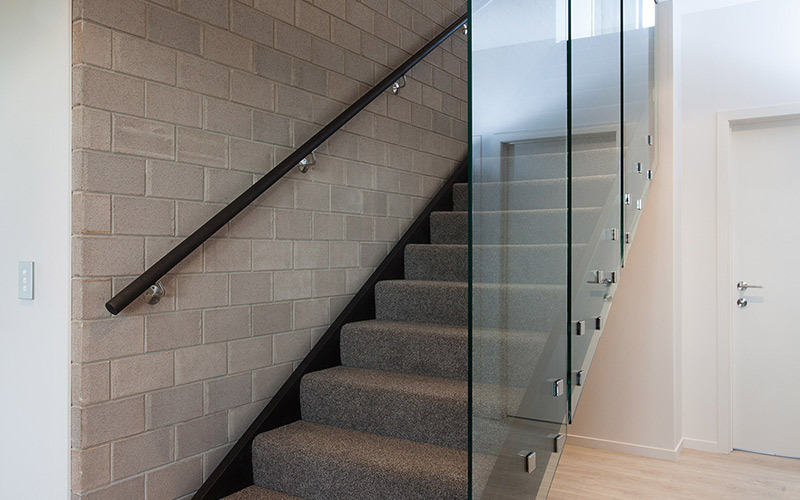 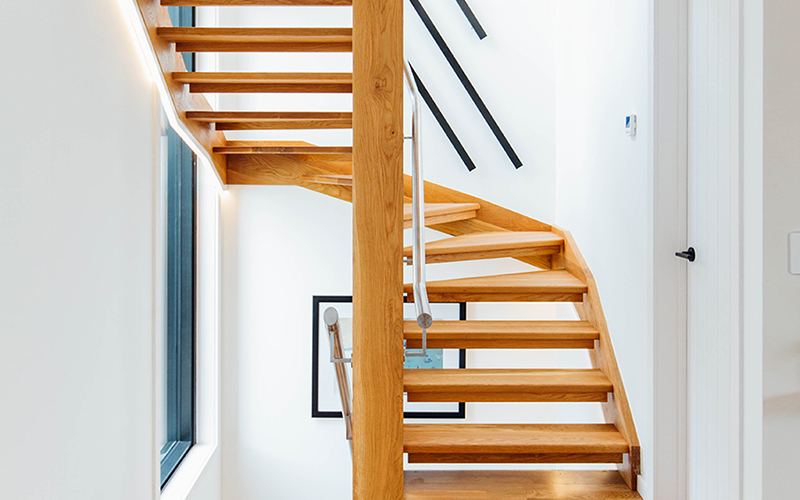 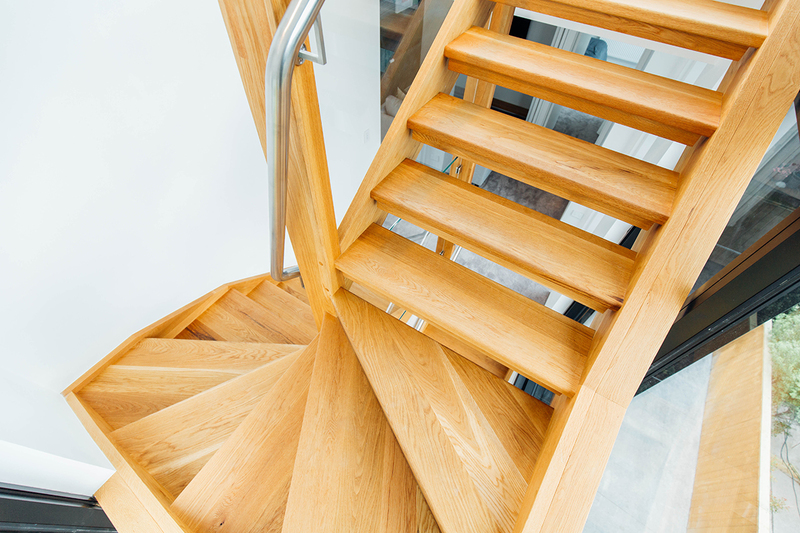 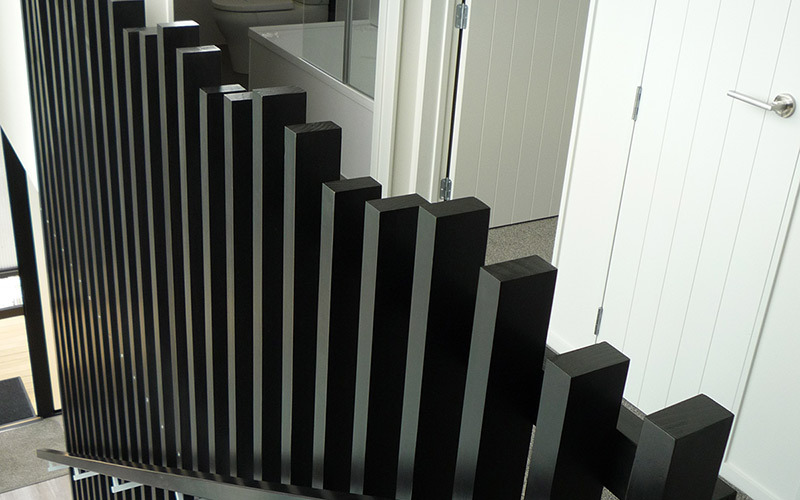 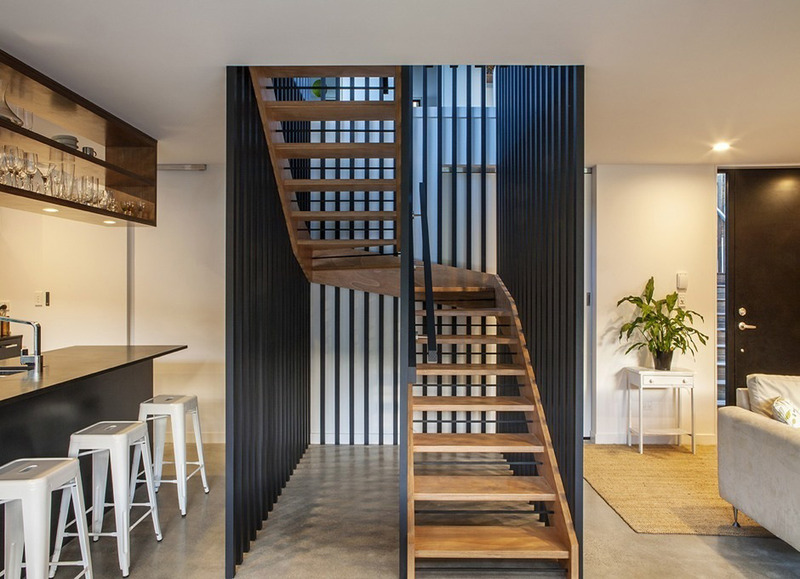 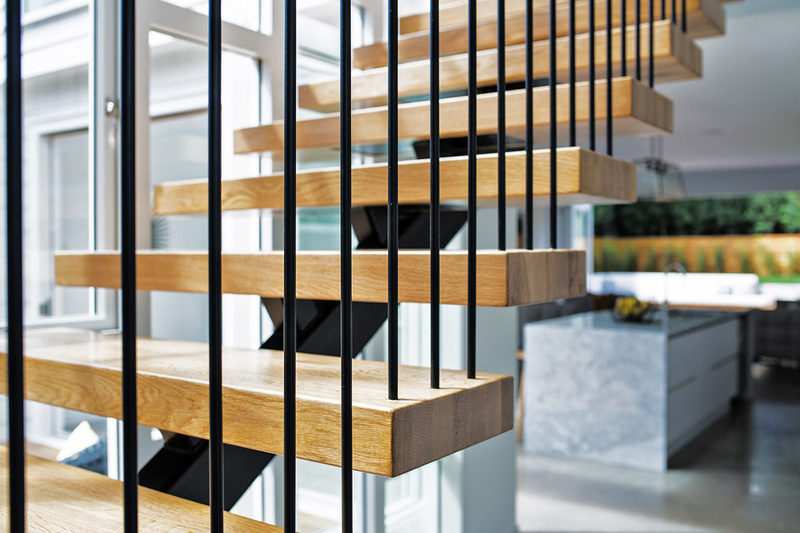 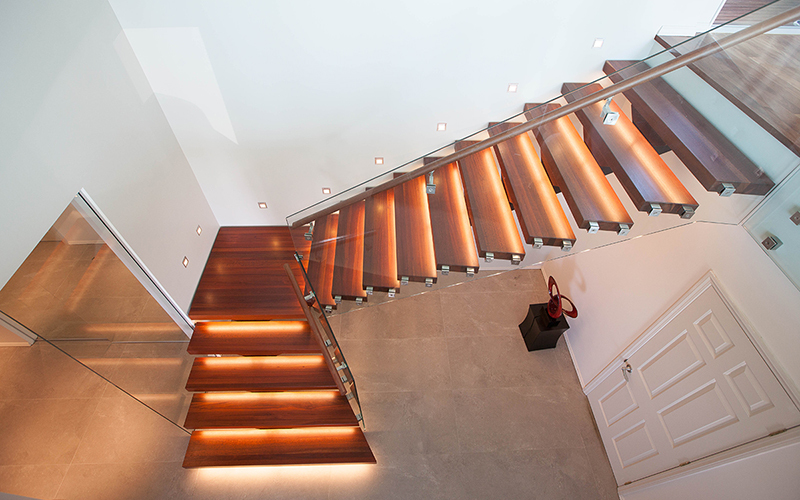 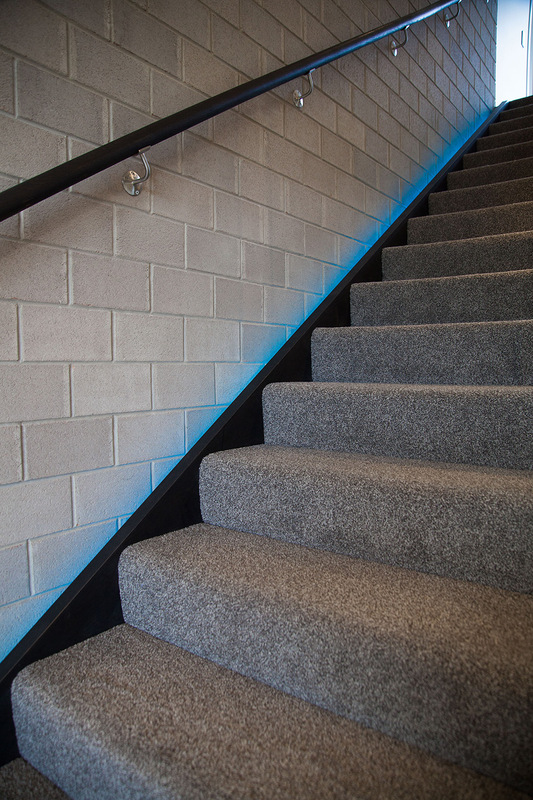 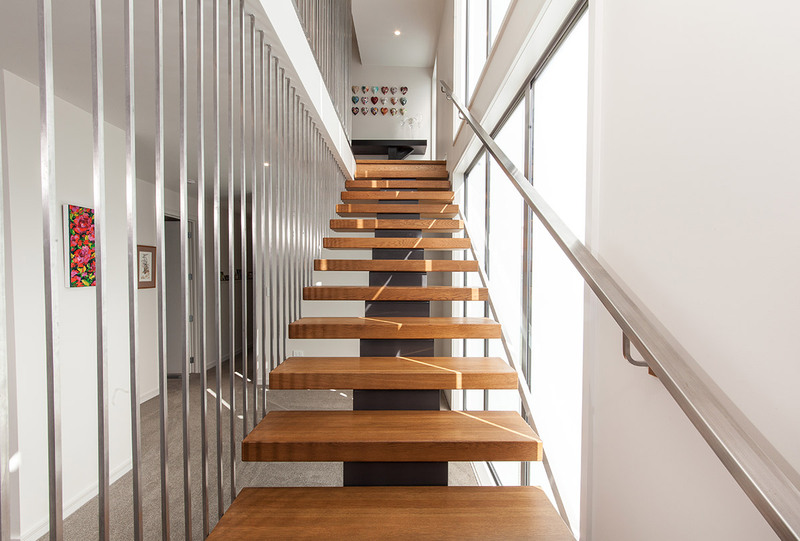 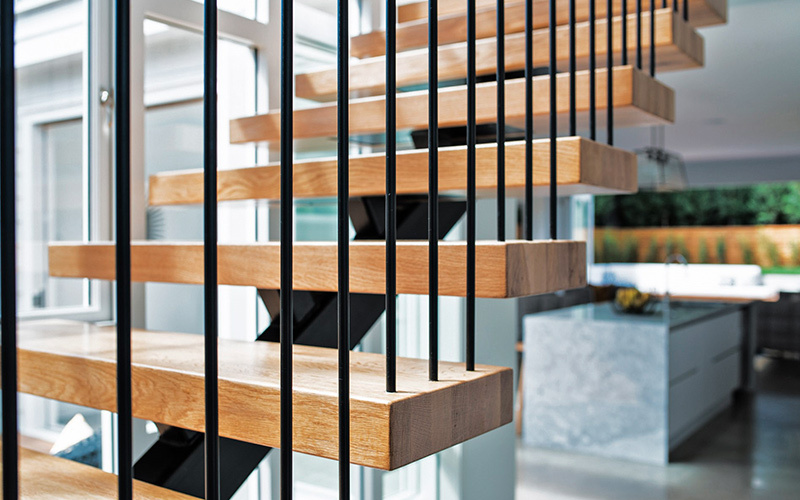 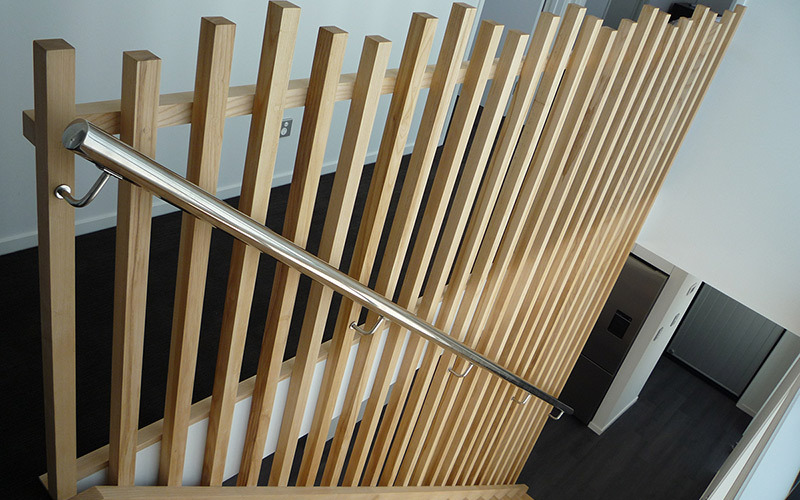 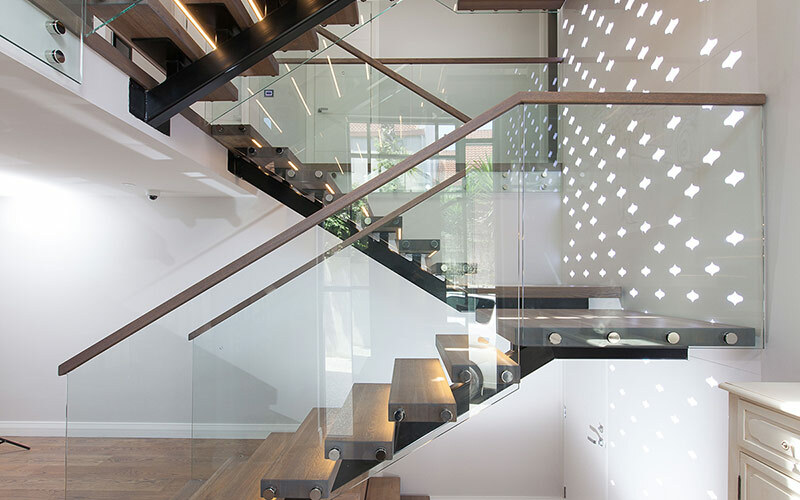 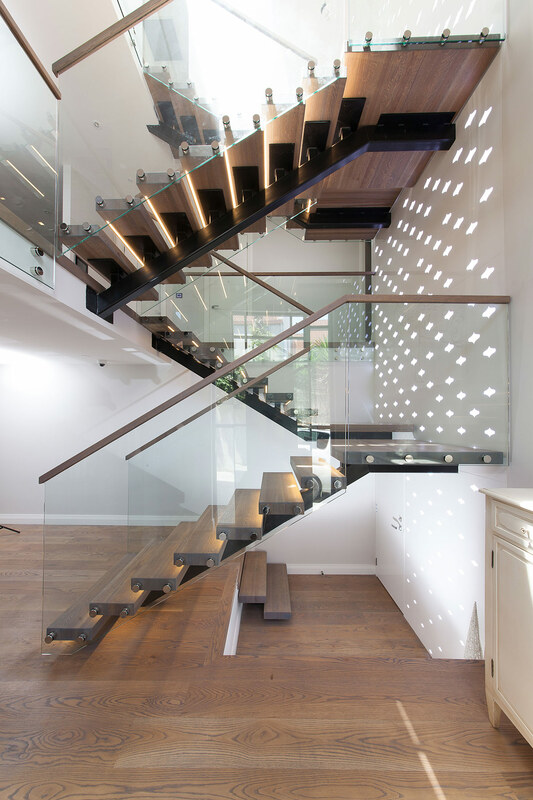 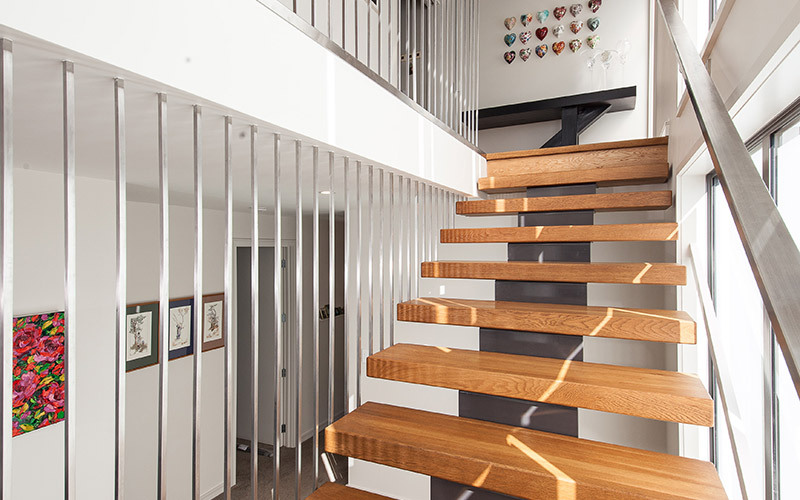 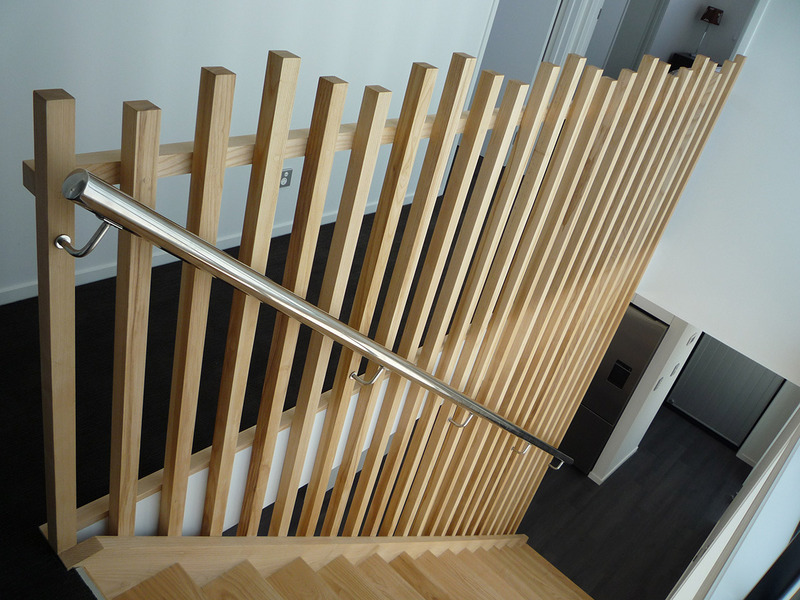 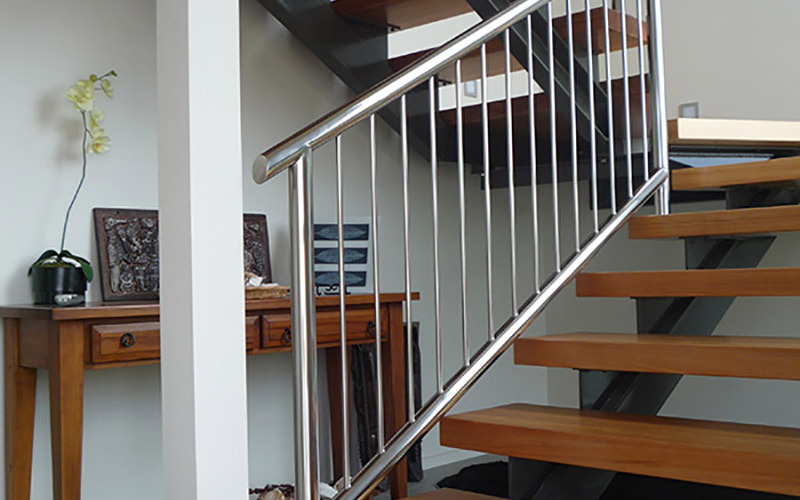 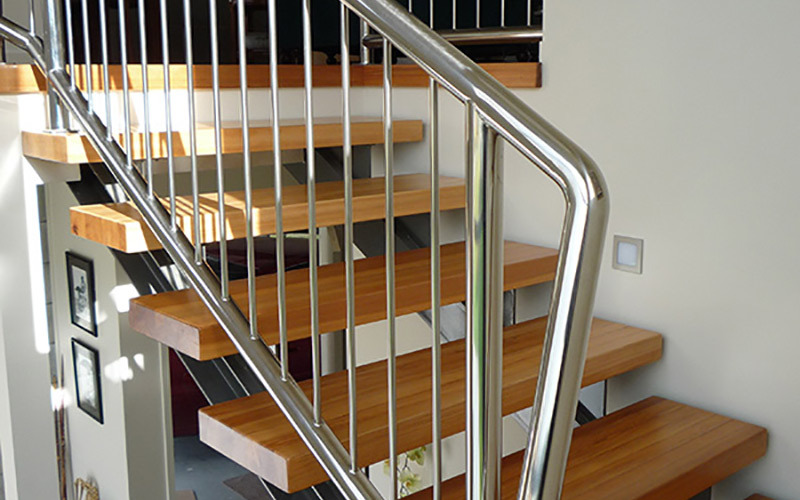 Our Serratus design uses serrated steel stringers that follow the shape of the staircase’s step treads, creating a zigzag effect that looks sleek and adds dimension to your stairwell. 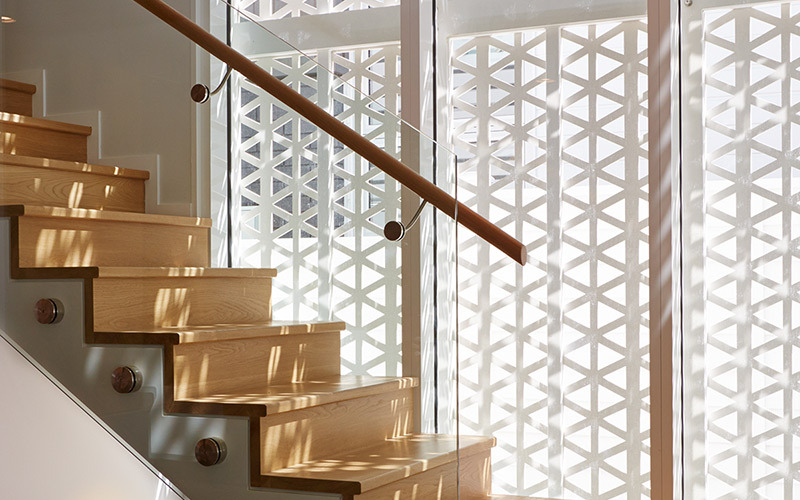 Enjoy how light seeps through the open risers of our Separare design. 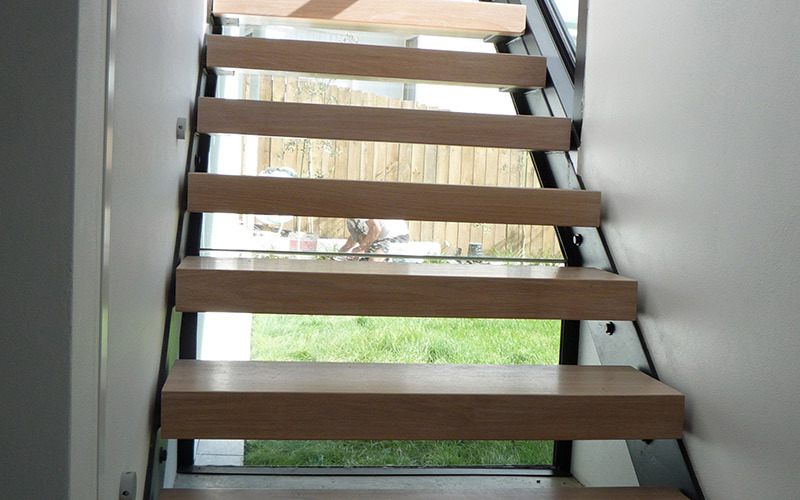 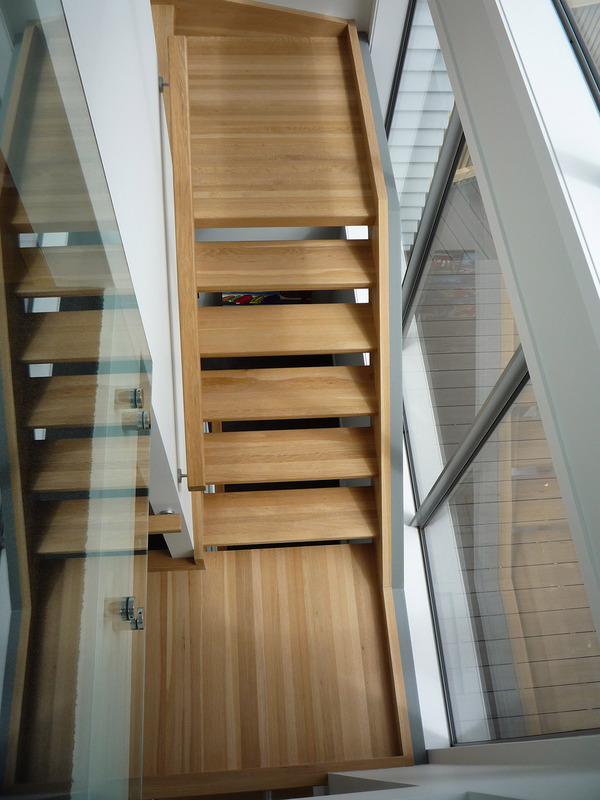 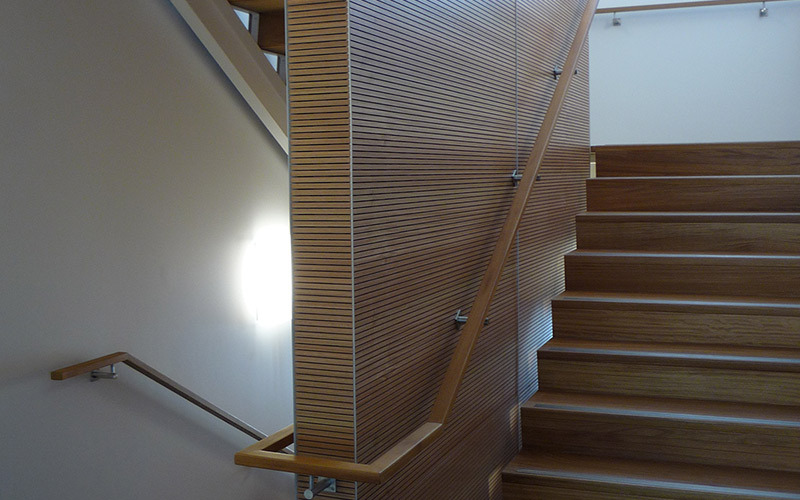 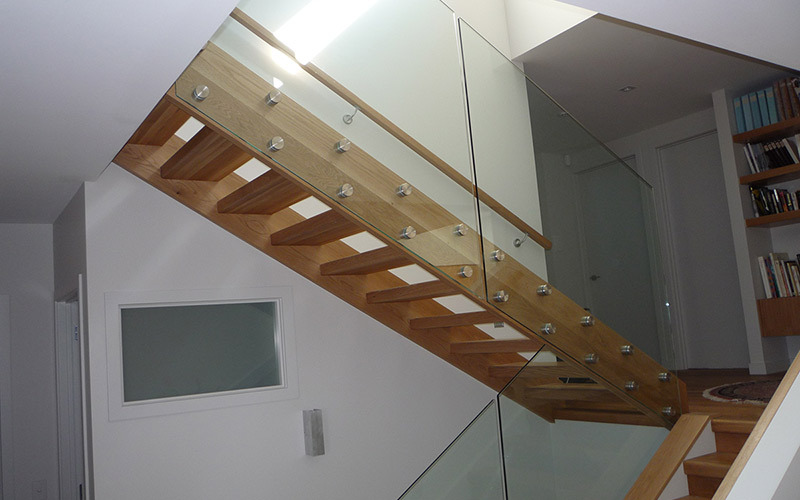 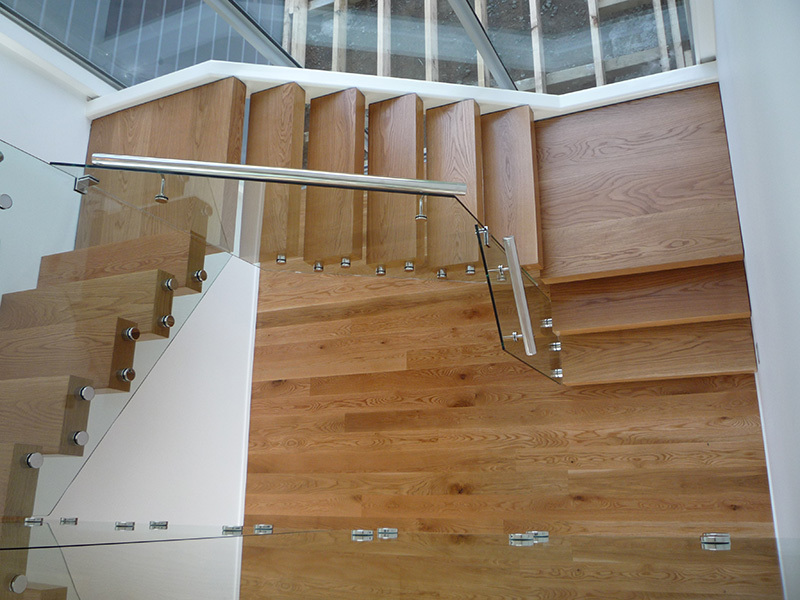 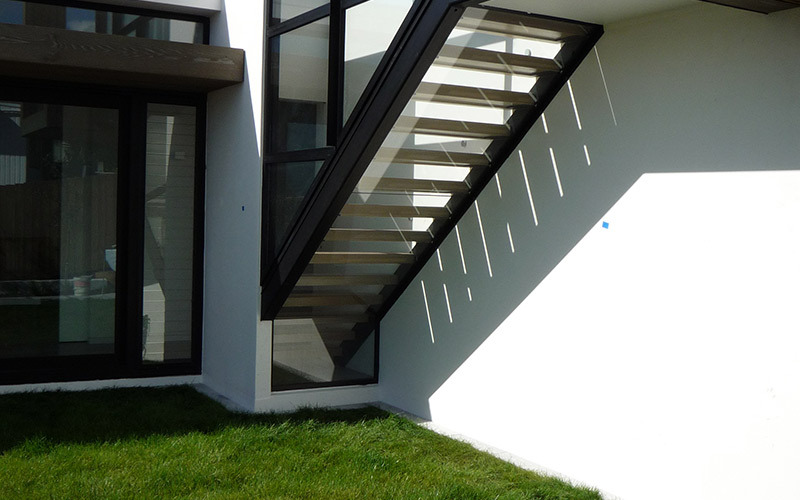 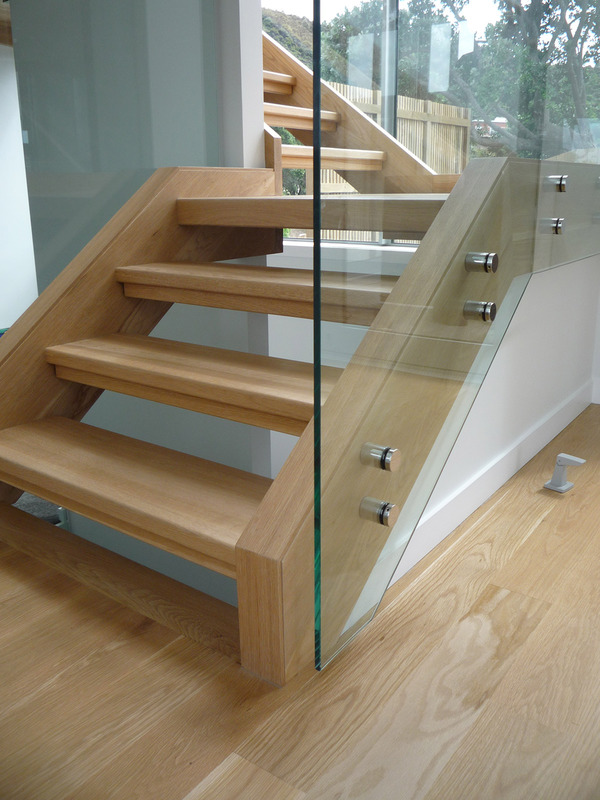 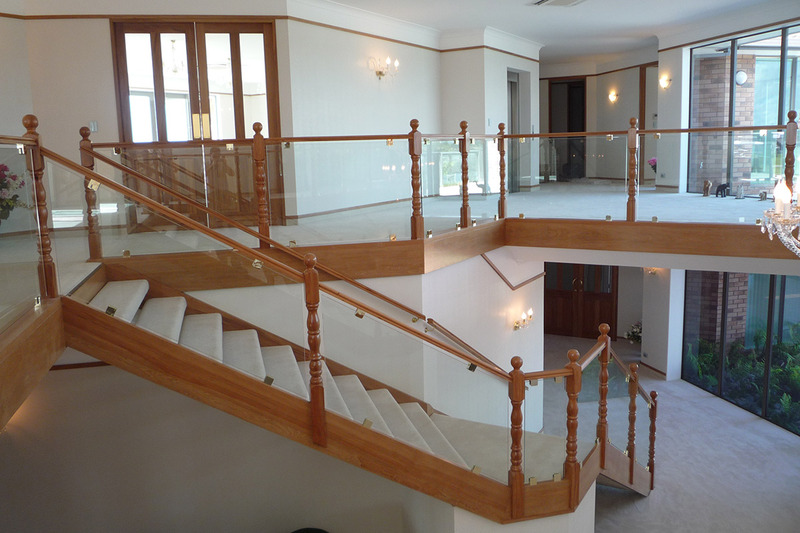 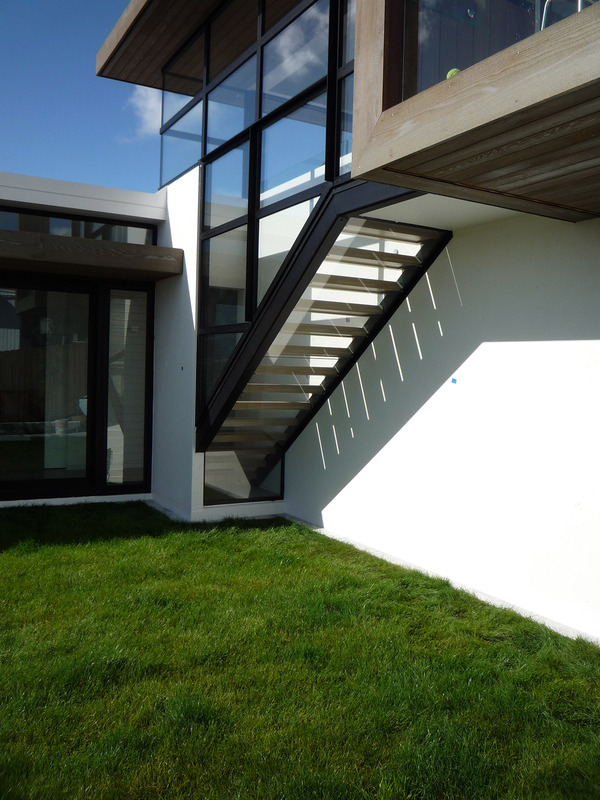 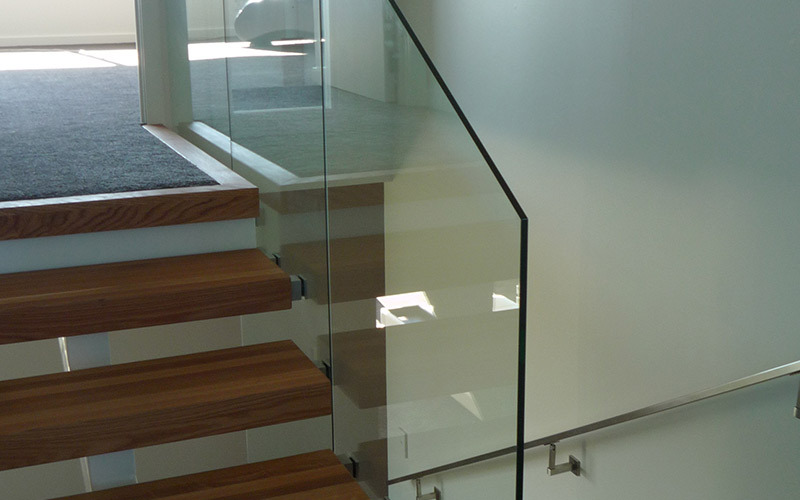 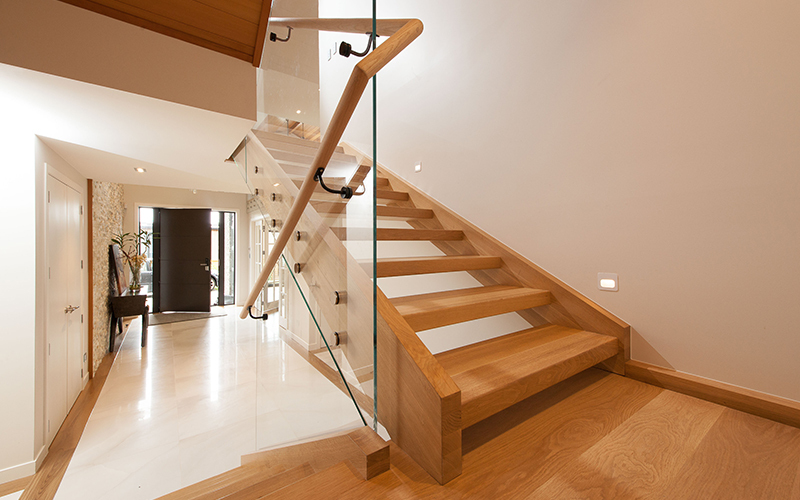 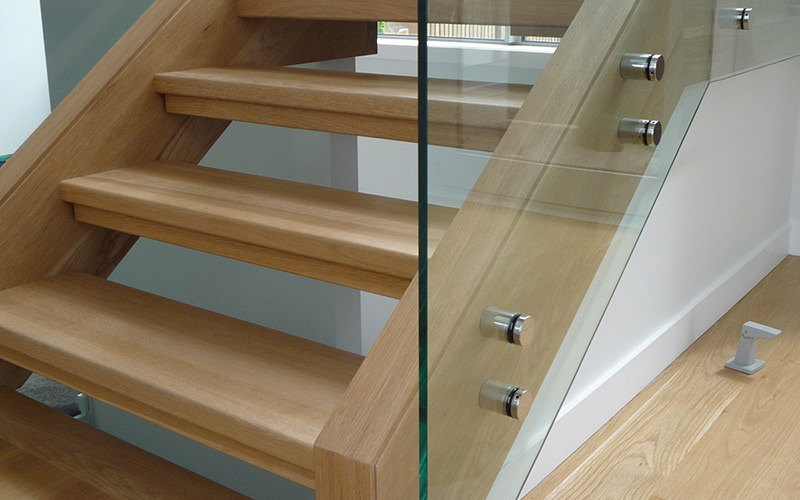 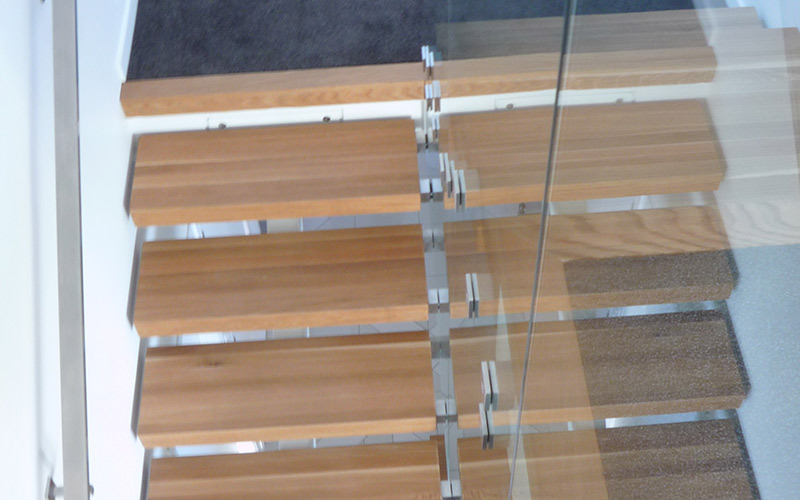 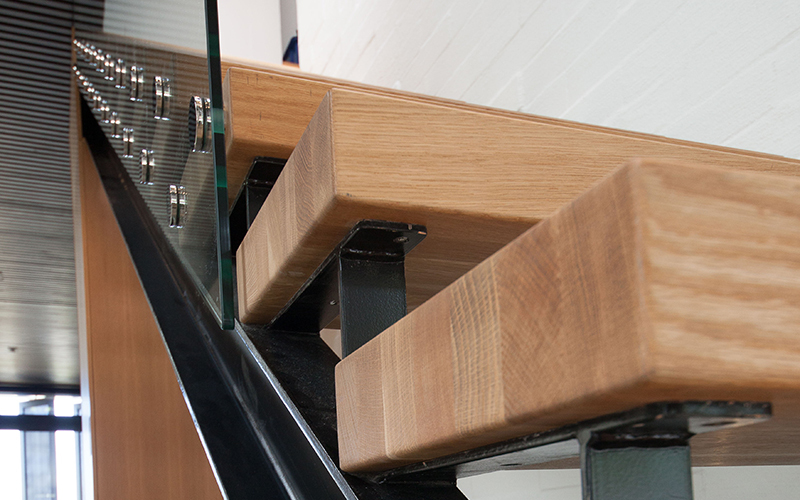 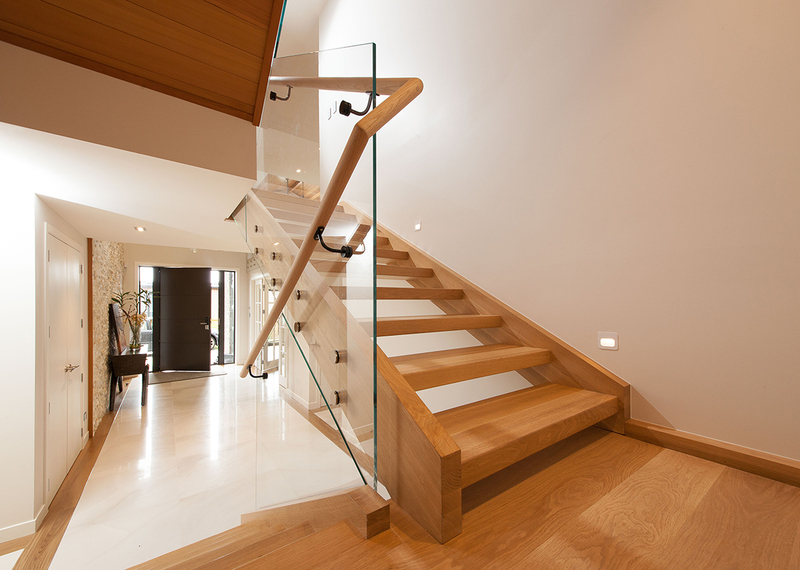 The stringers are strategically placed on the sides so they can seamlessly integrate with your chosen balustrades. 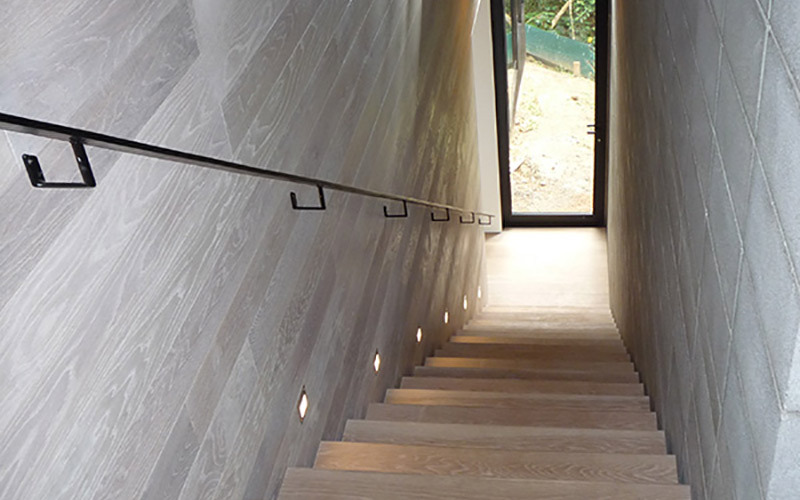 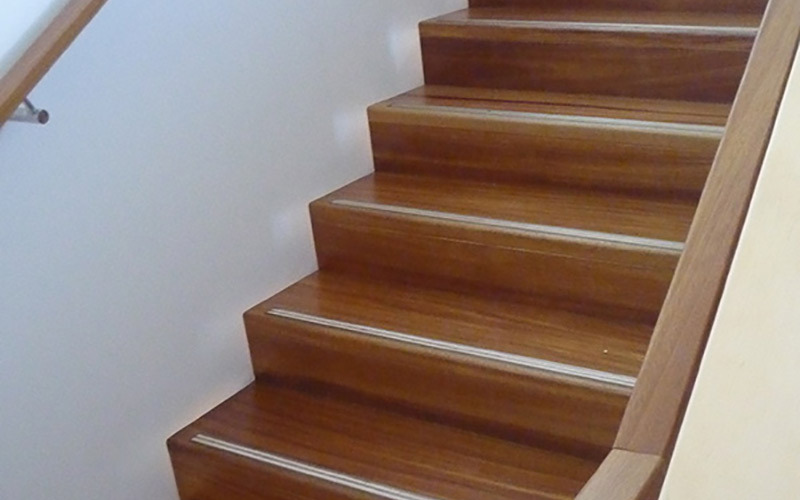 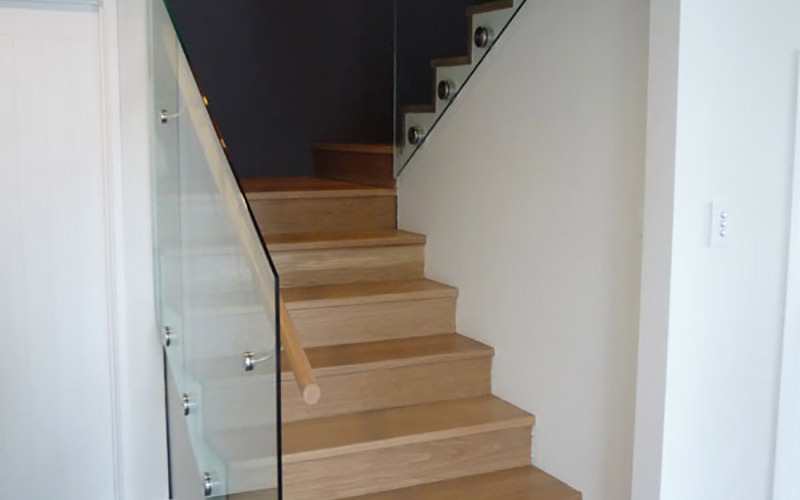 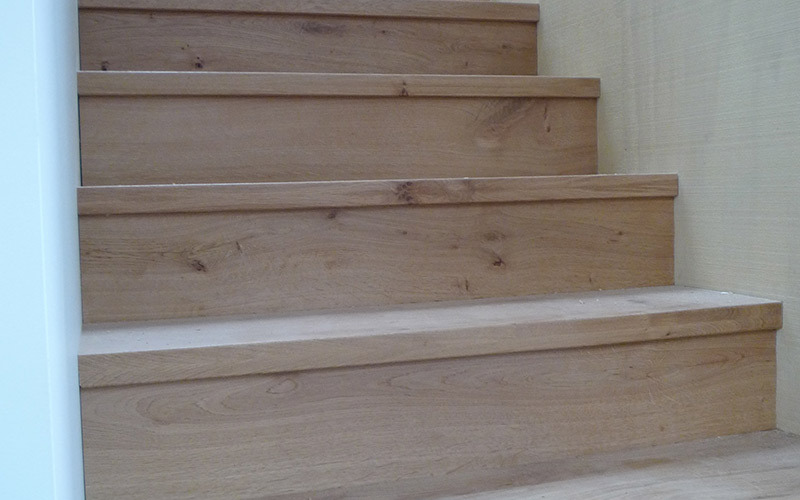 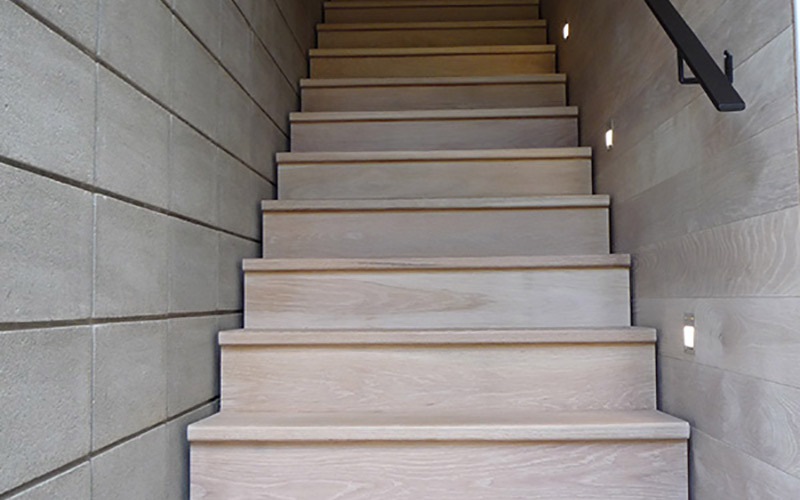 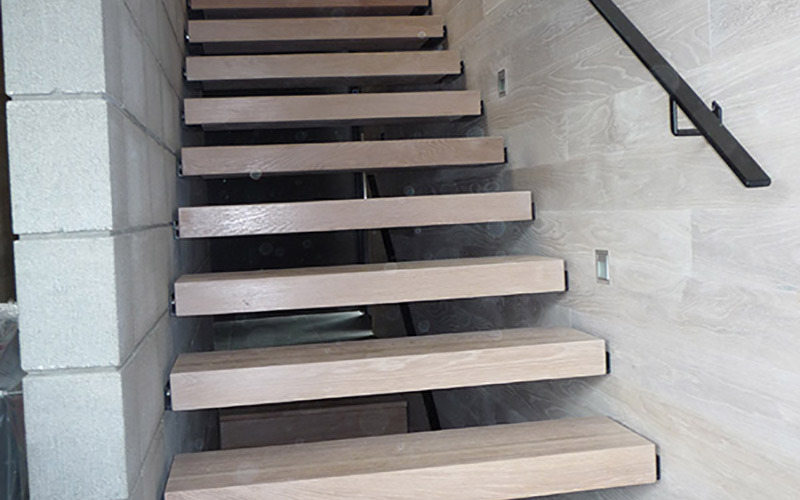 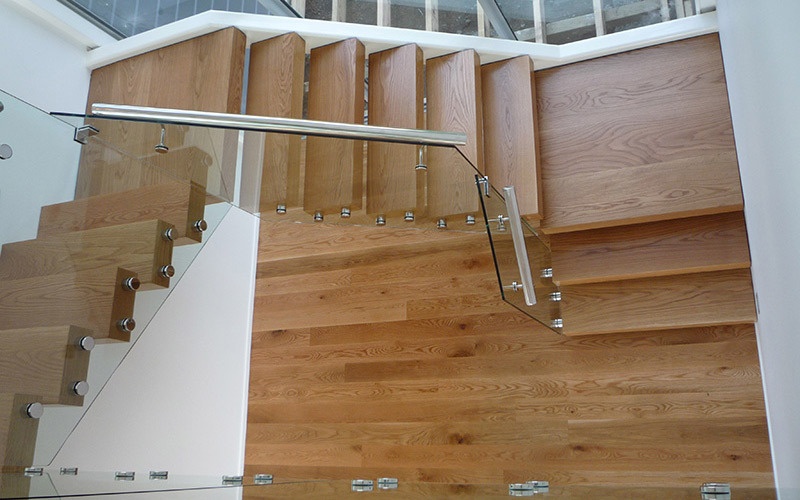 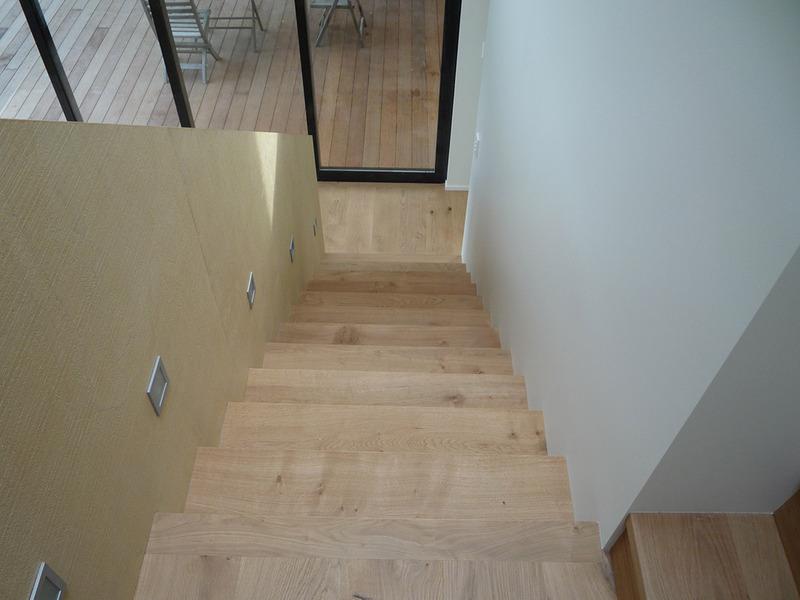 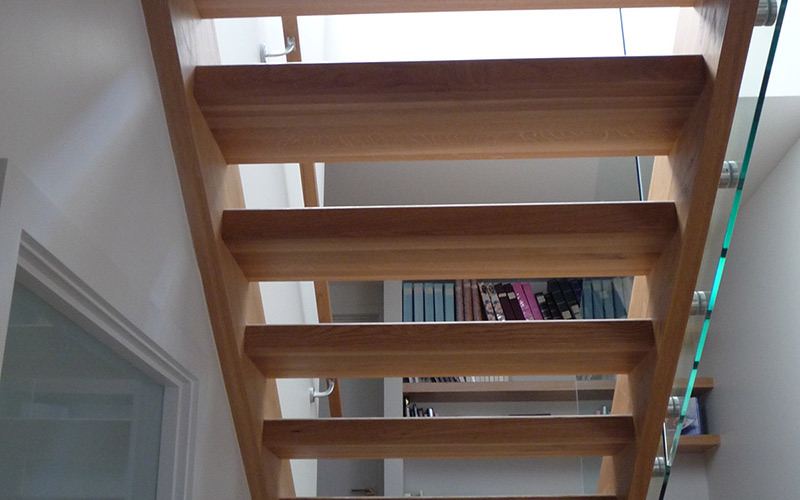 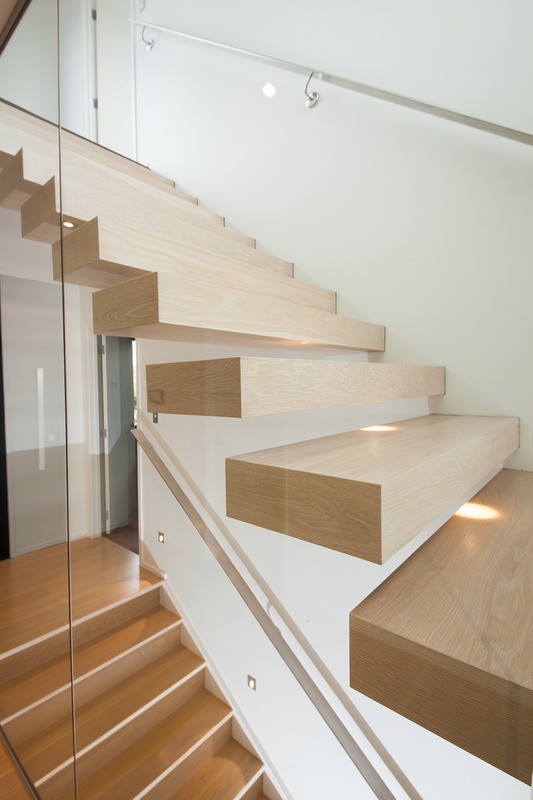 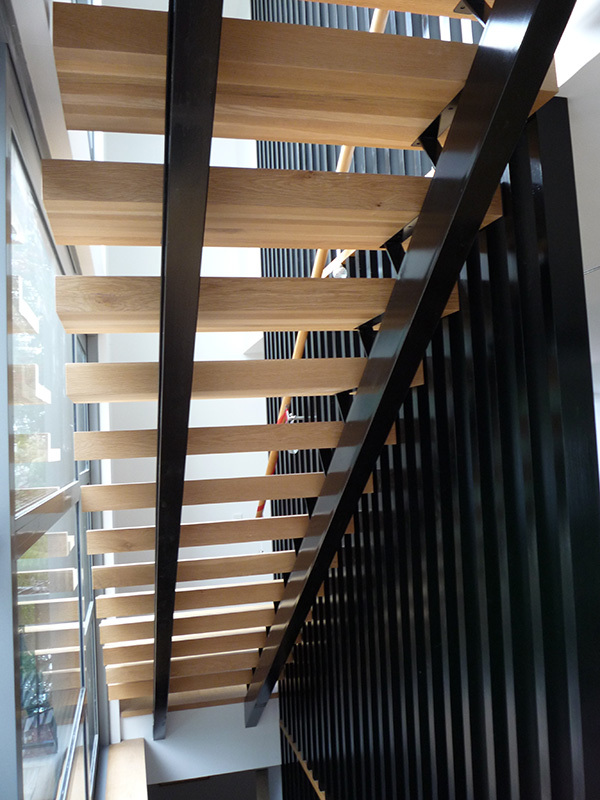 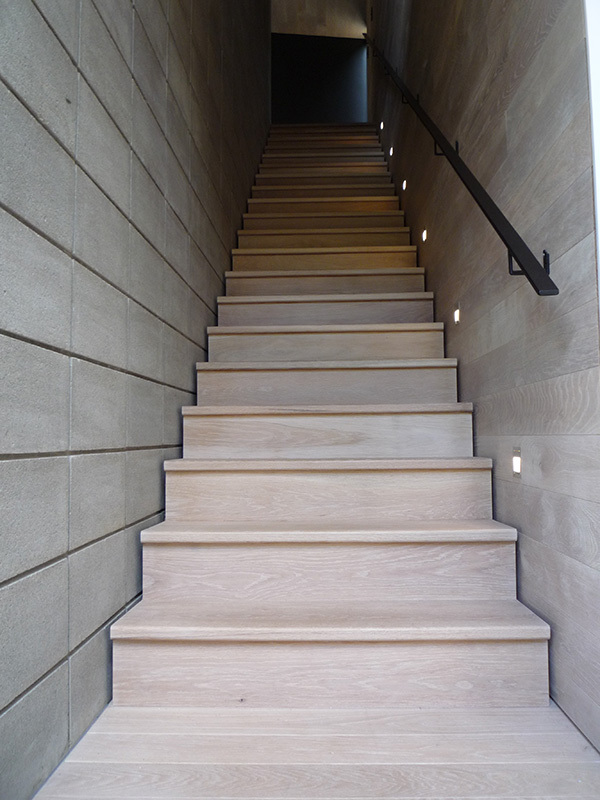 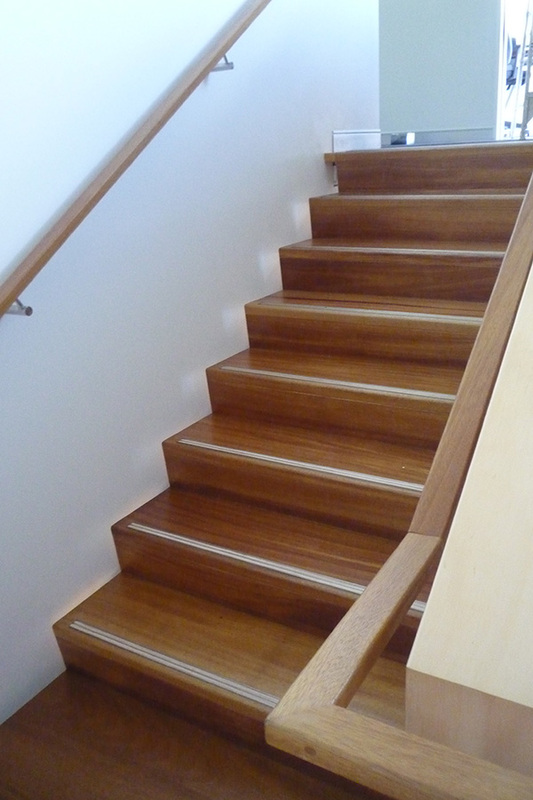 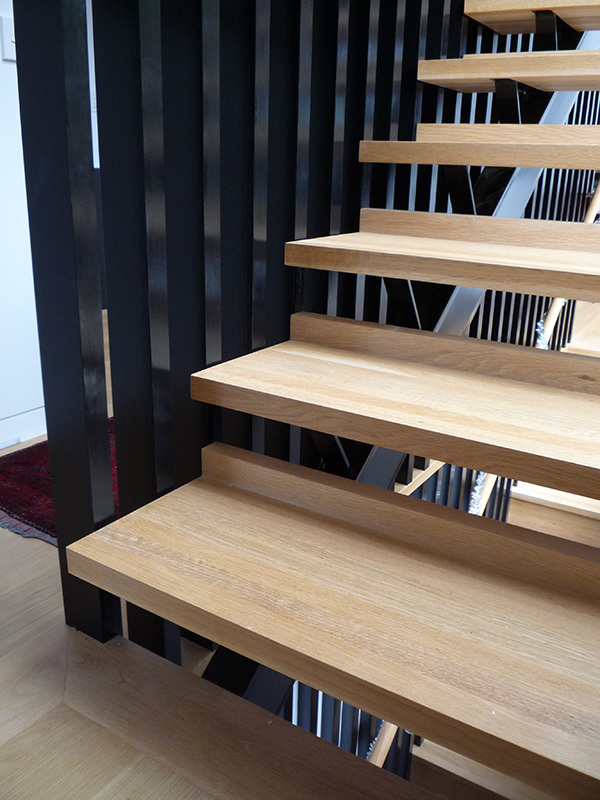 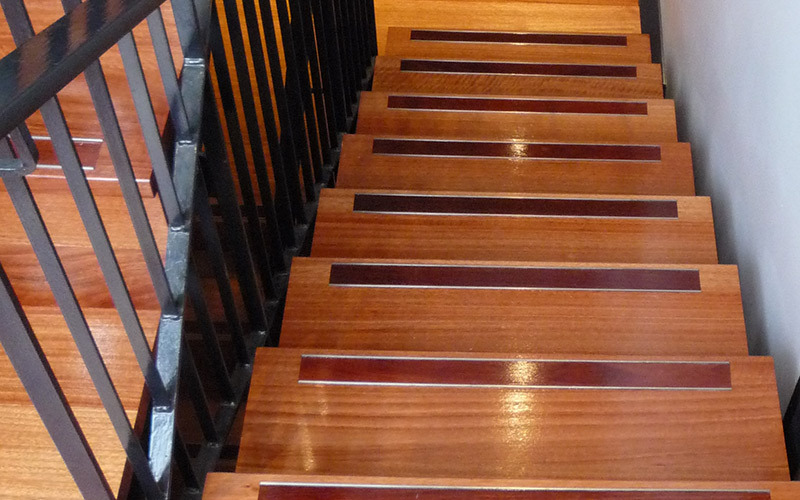 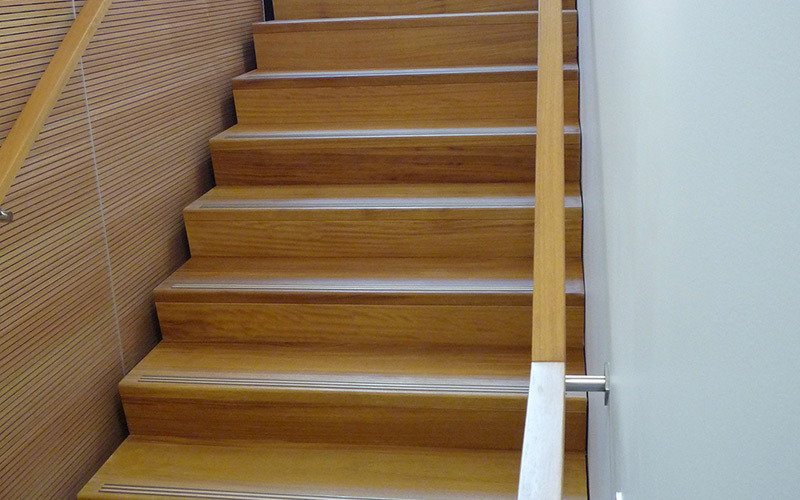 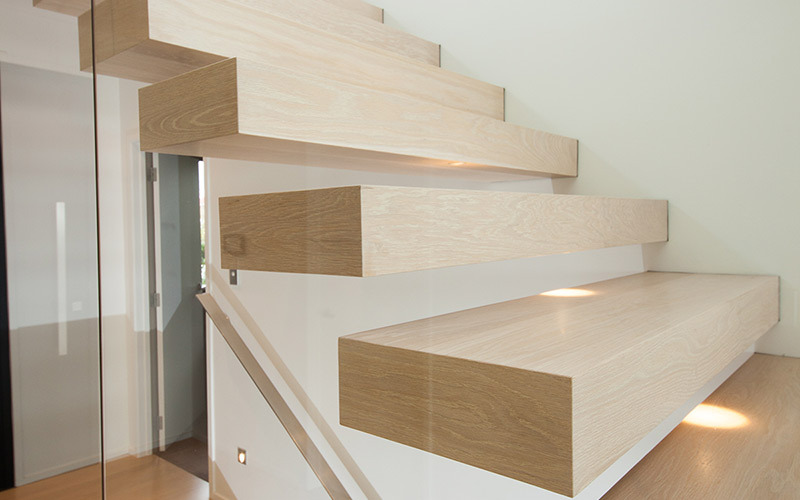 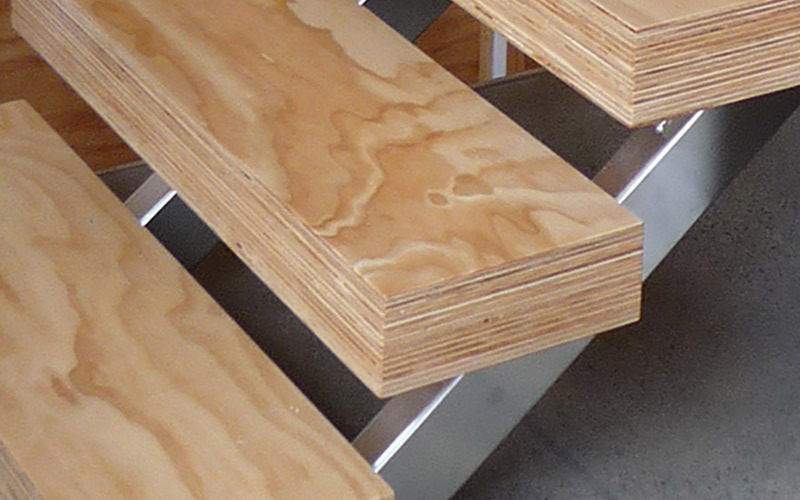 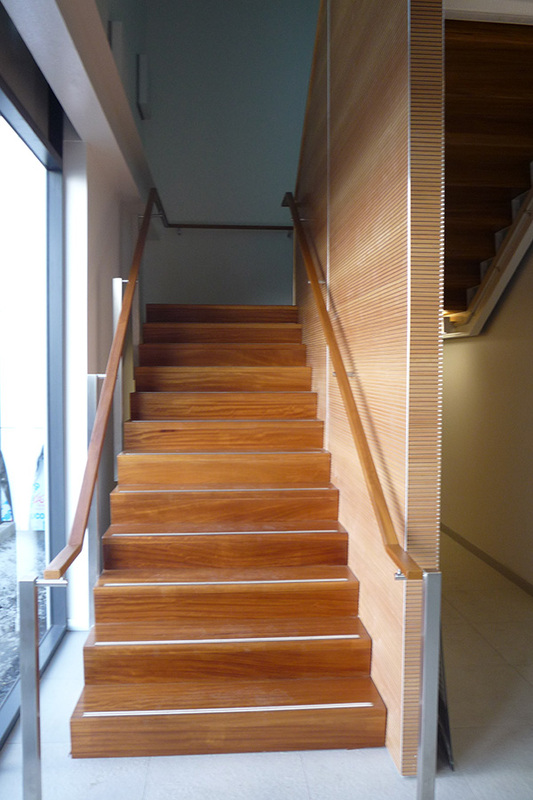 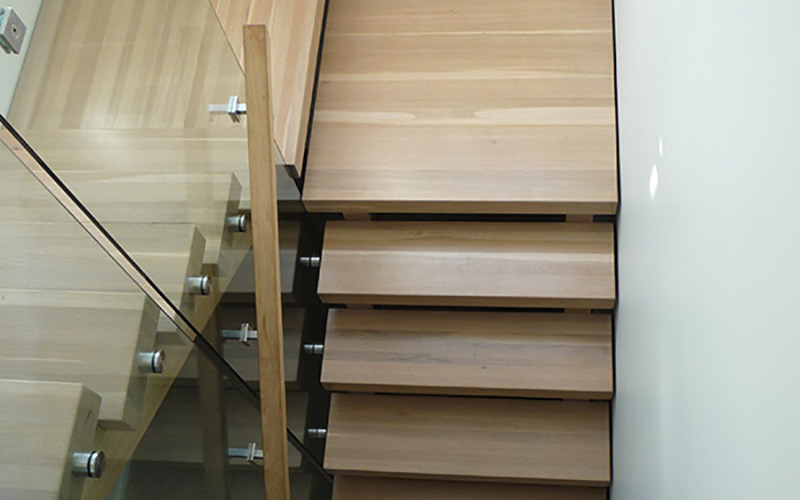 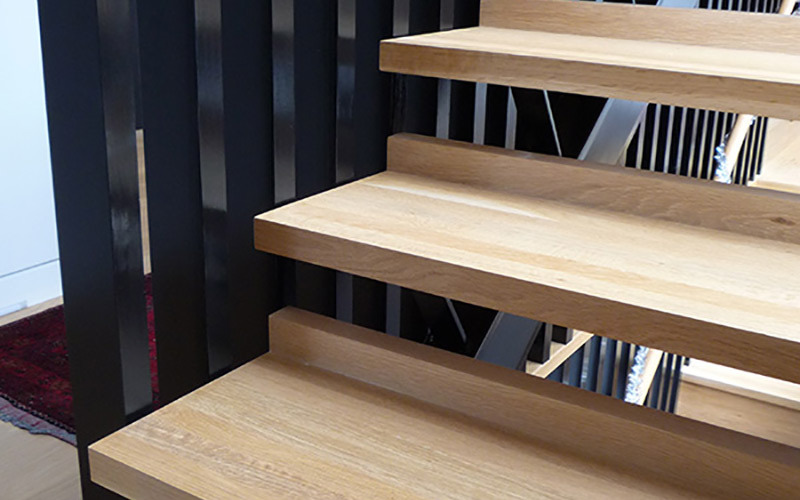 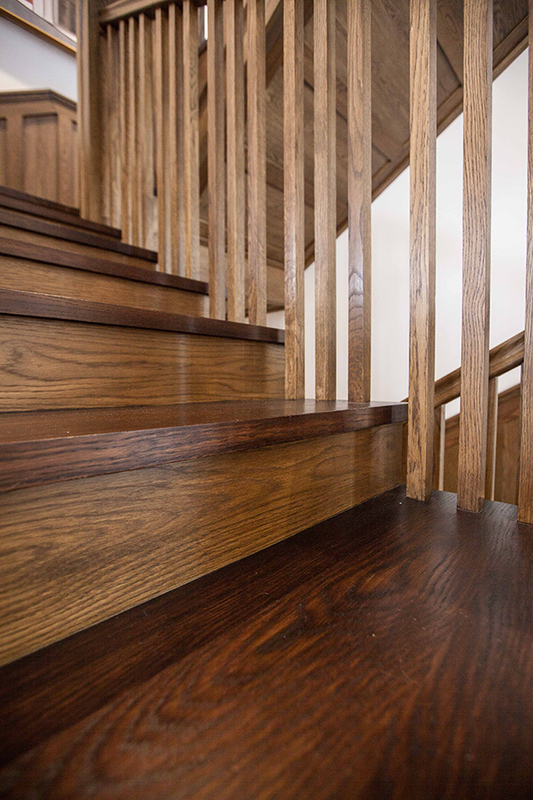 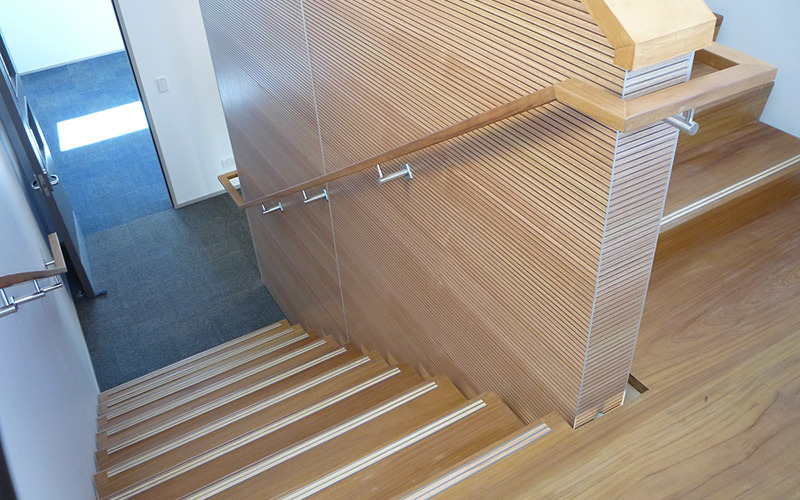 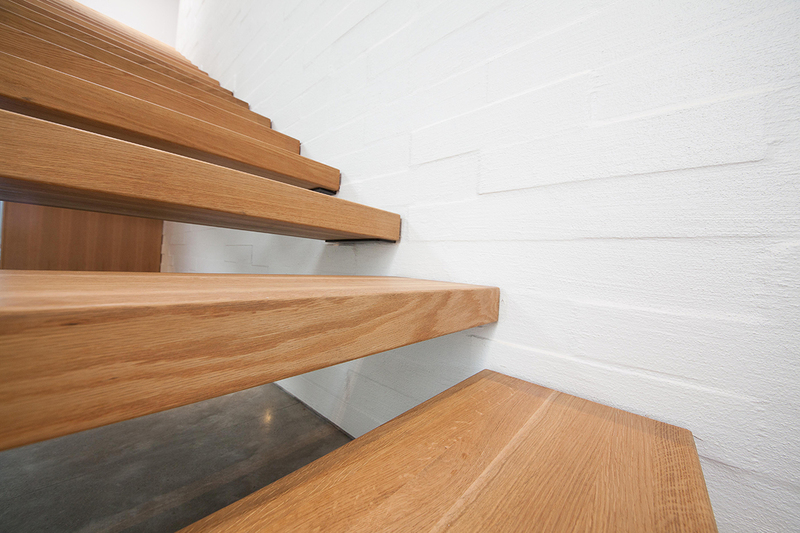 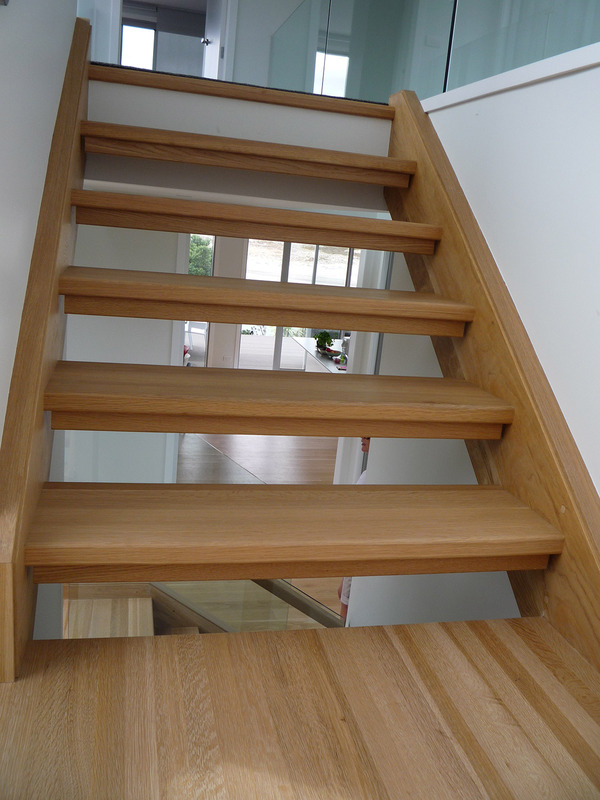 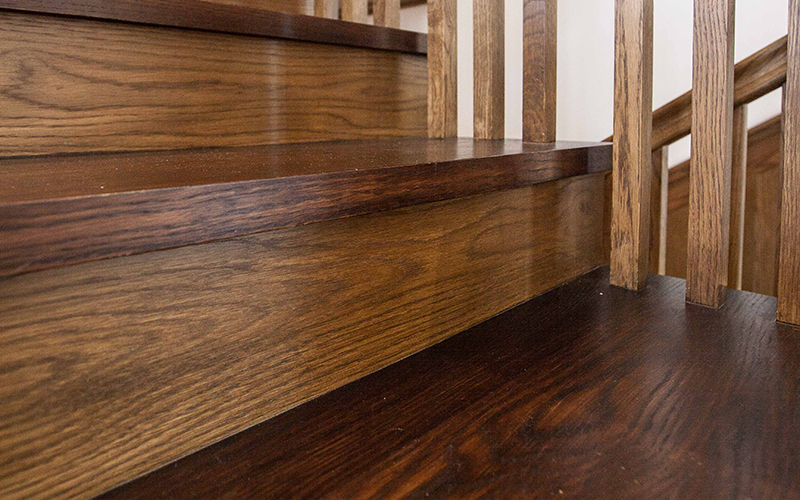 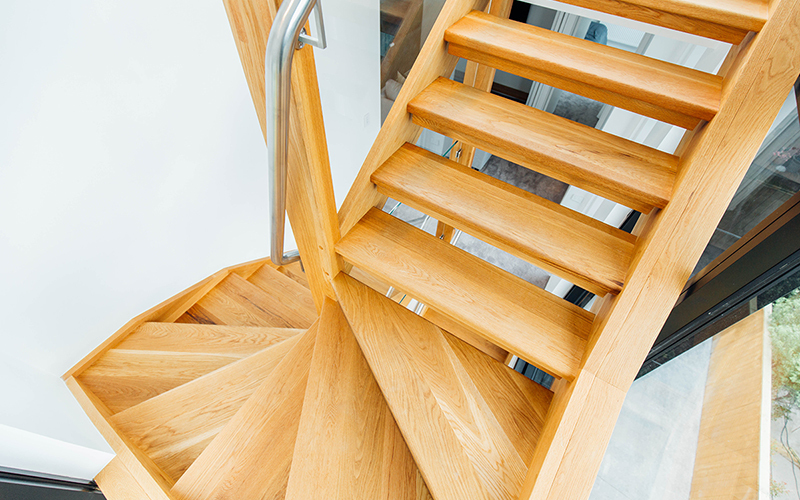 To bring more focus to your well-chosen stair treads, consider our Concelare design for its undercut timber stringers. 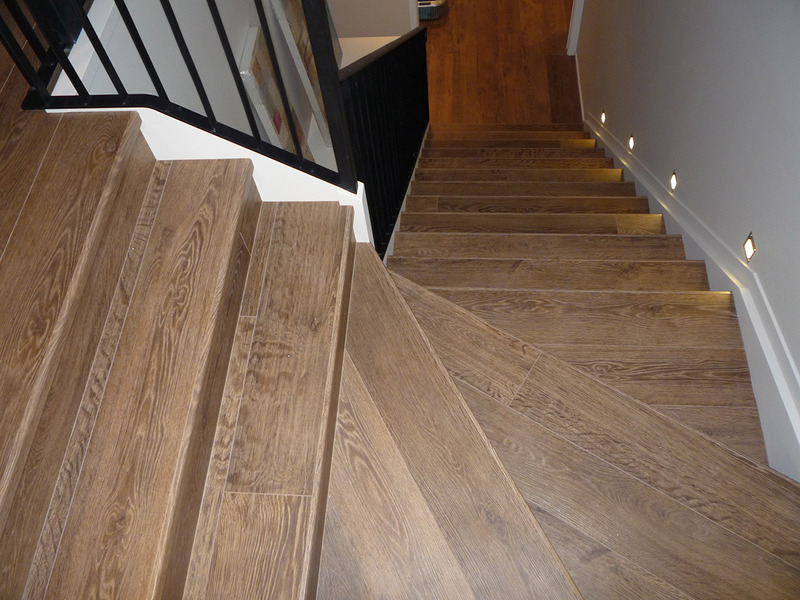 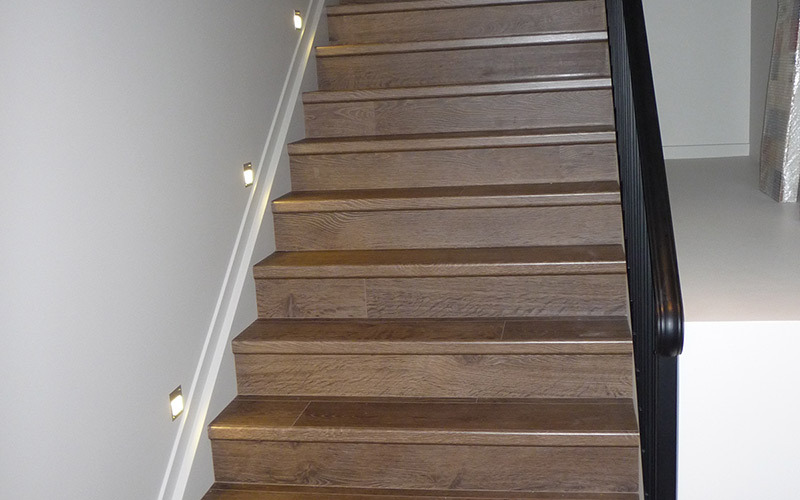 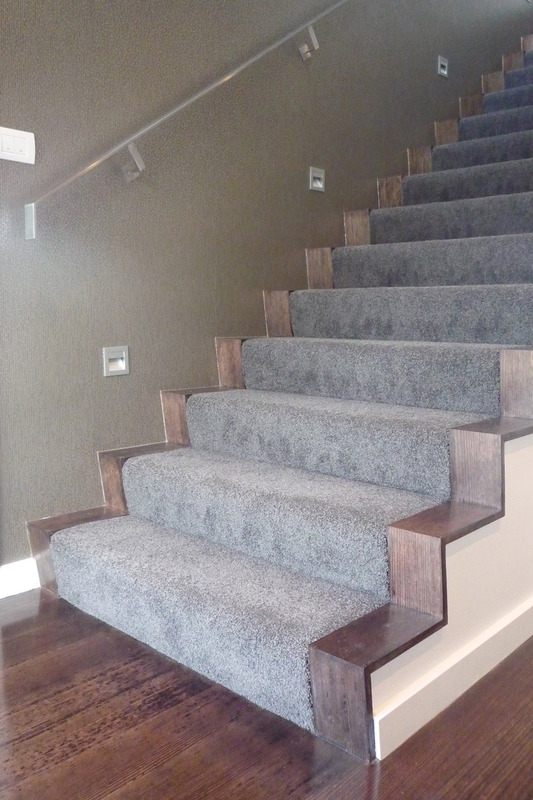 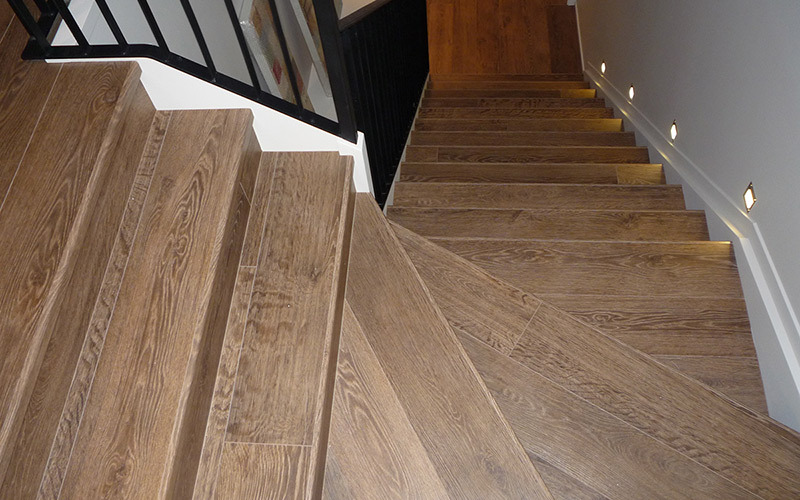 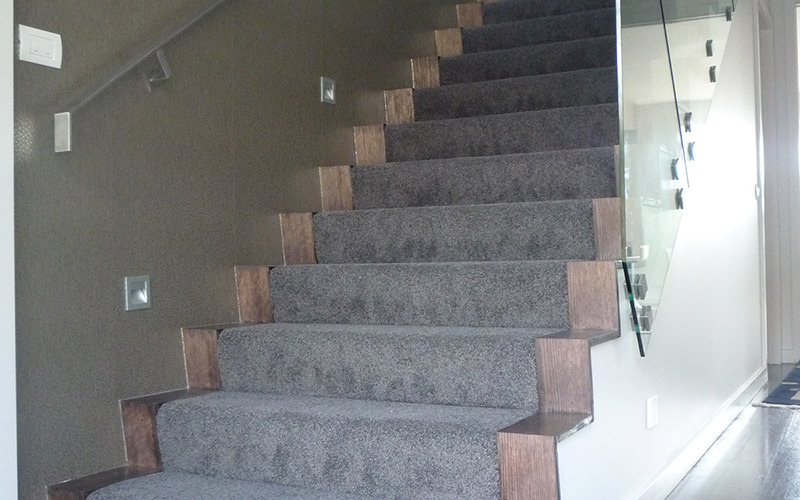 The stringers can be stained in a contrasting colour to add emphasis to the treads. 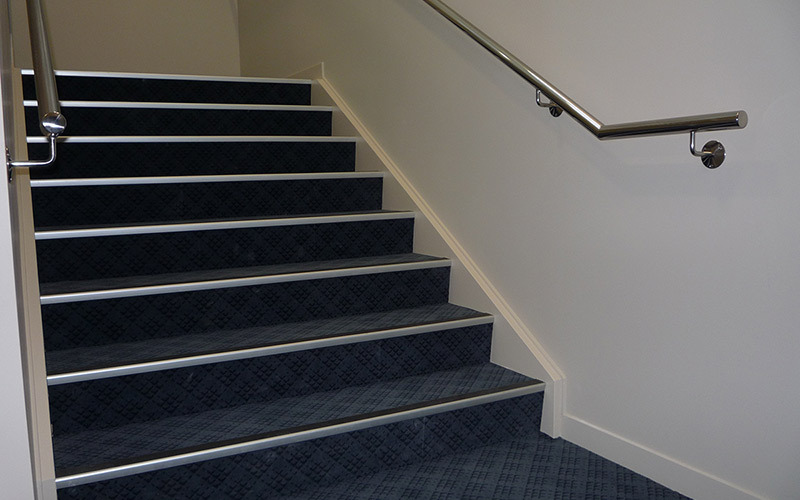 Commercial establishments have more stringent safety regulations for stairs. 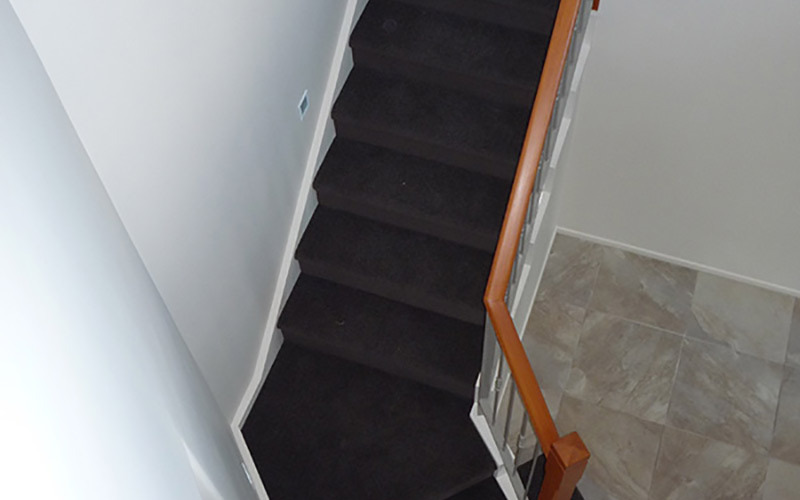 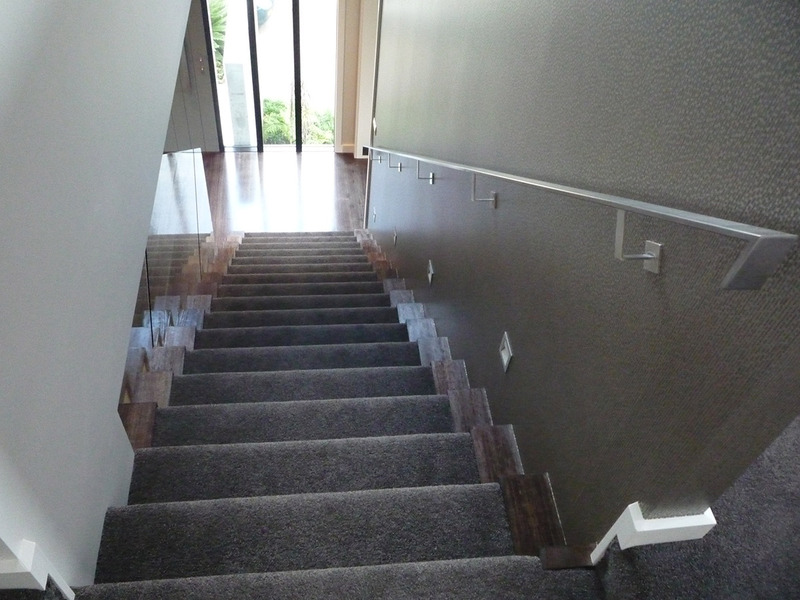 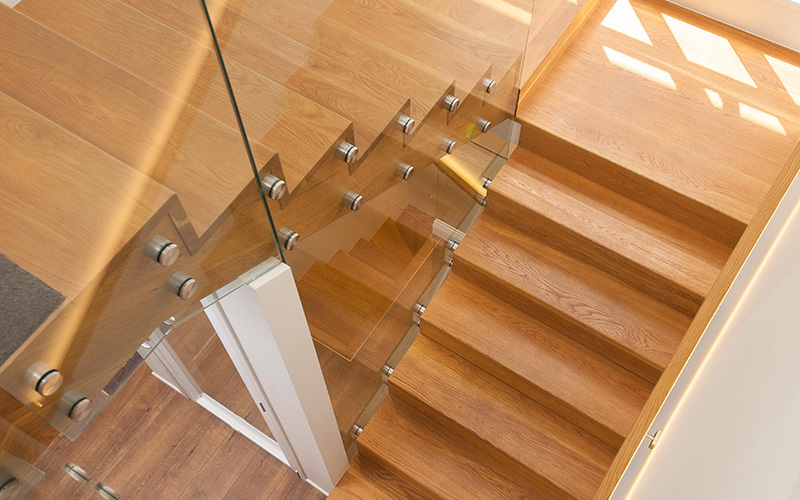 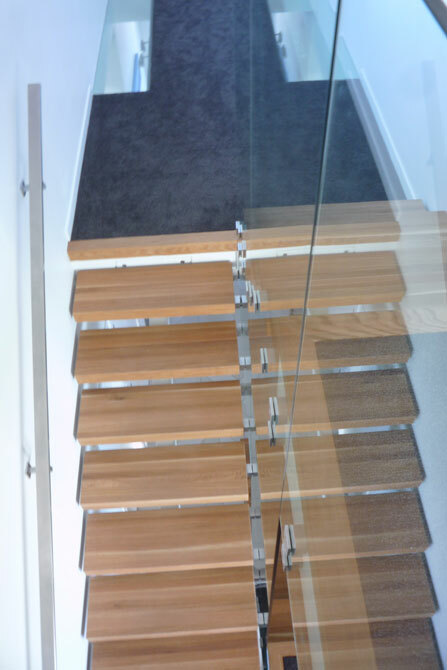 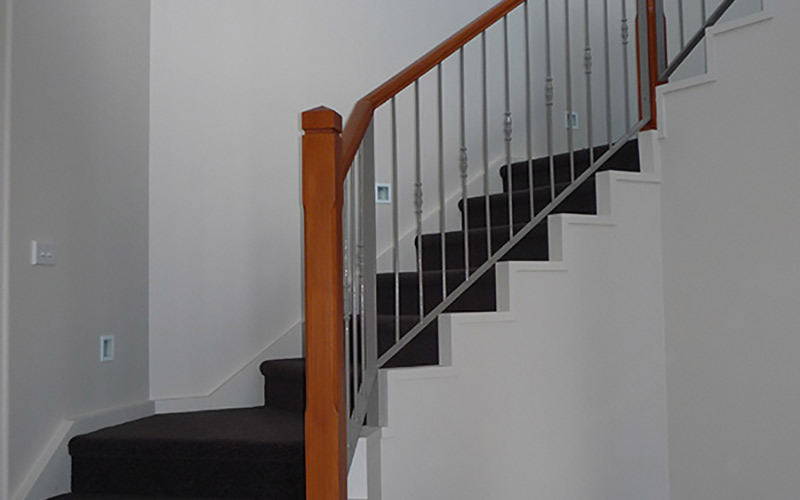 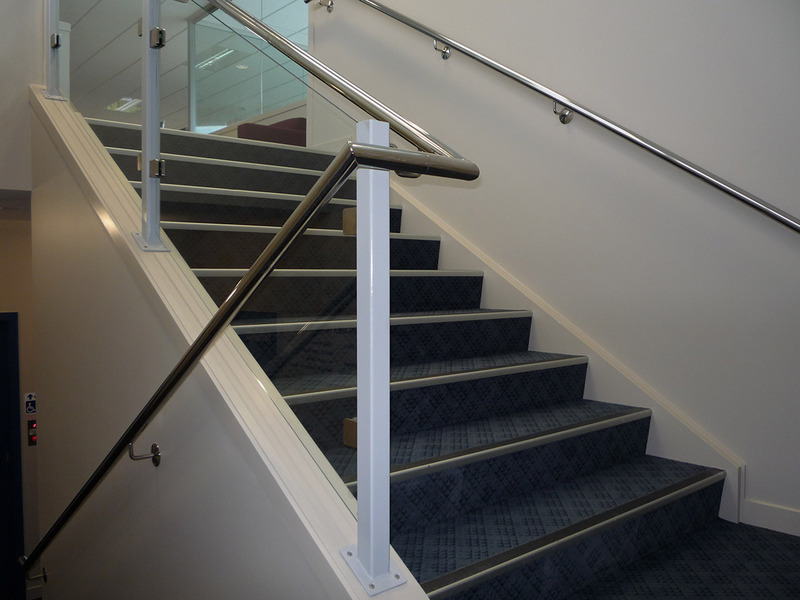 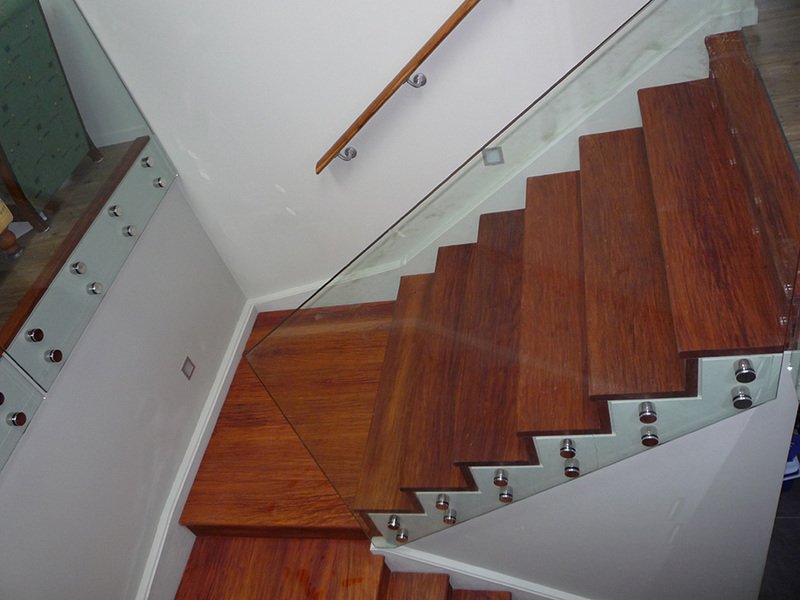 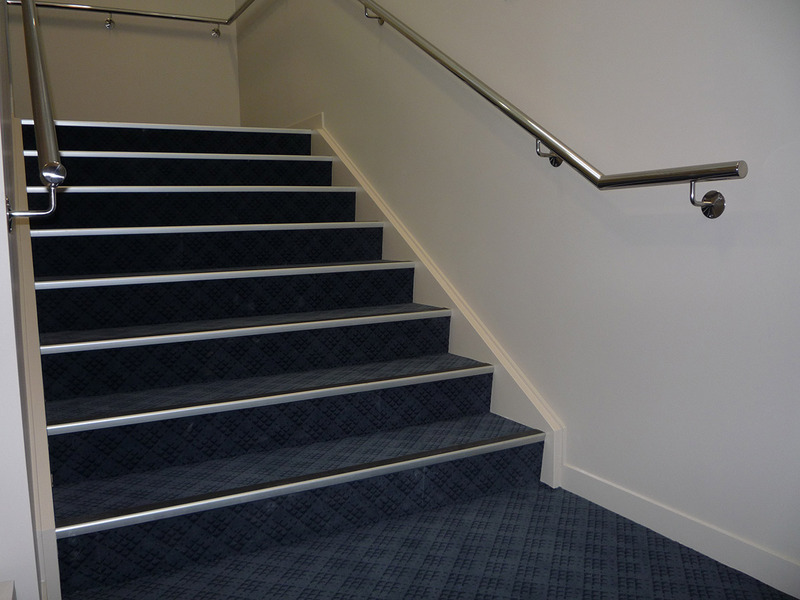 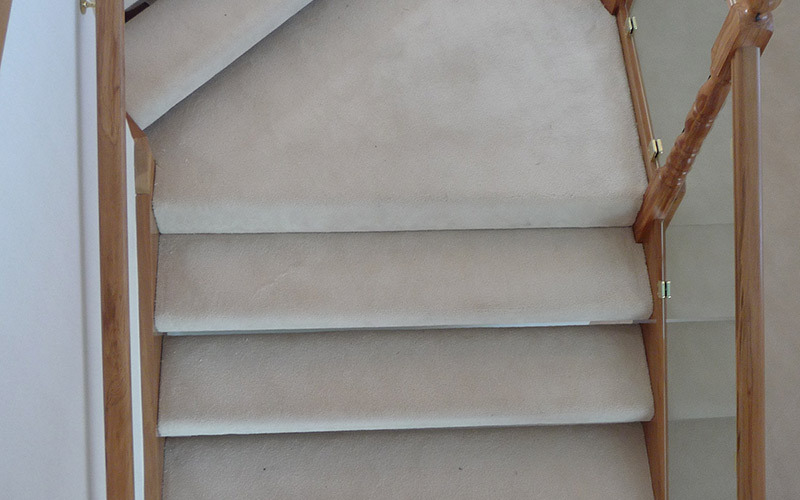 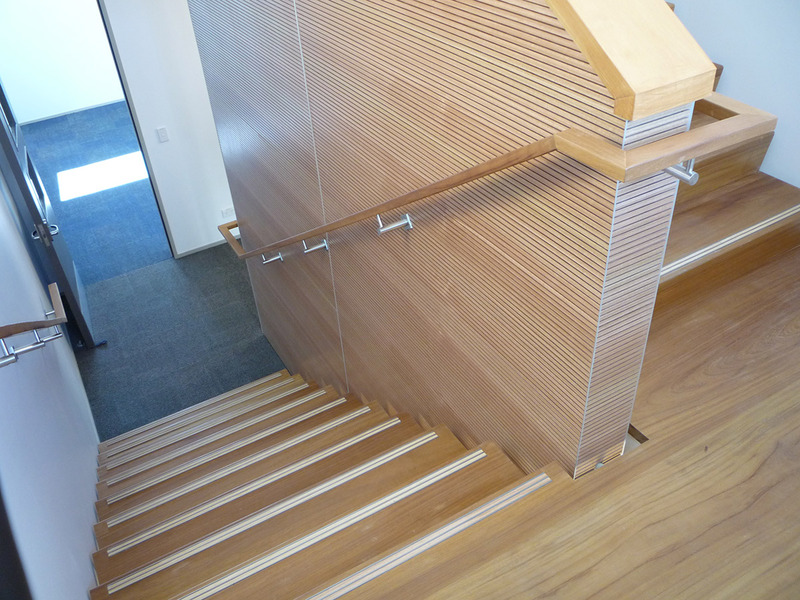 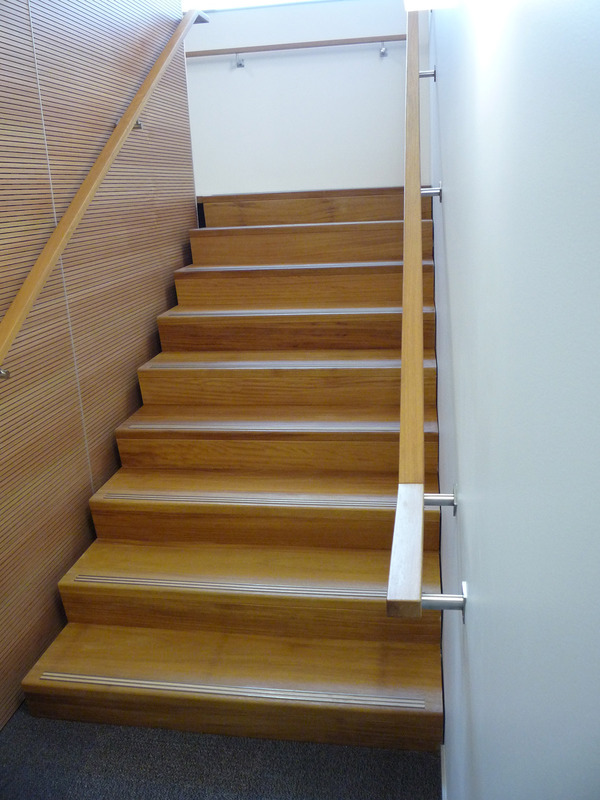 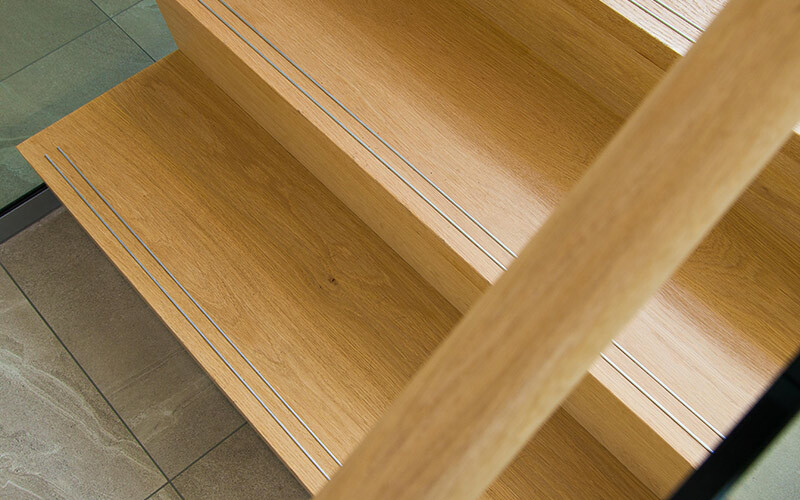 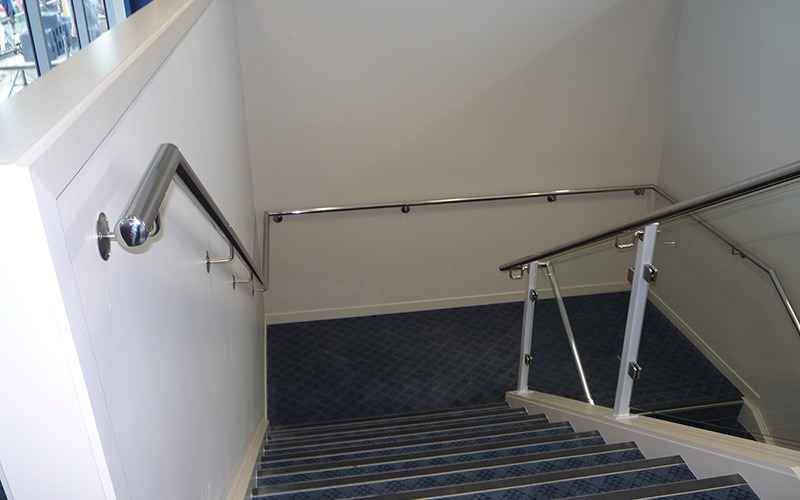 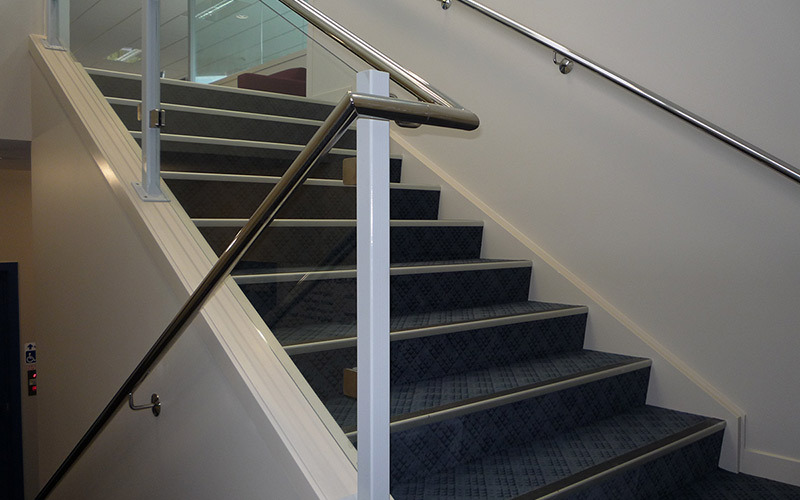 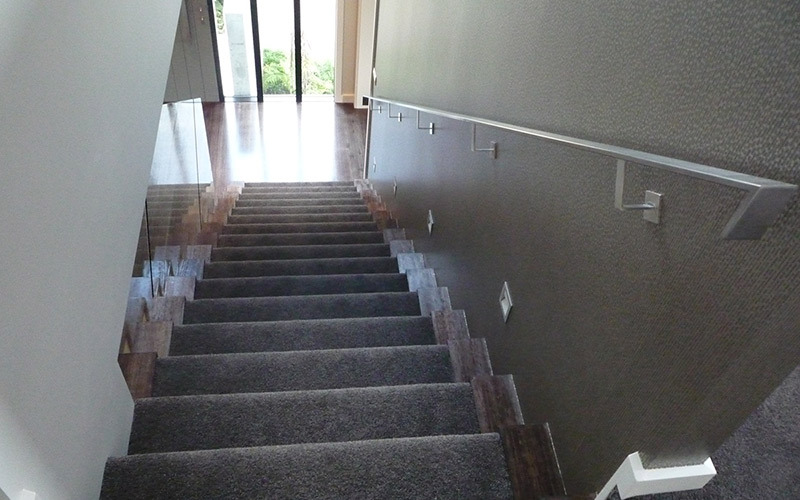 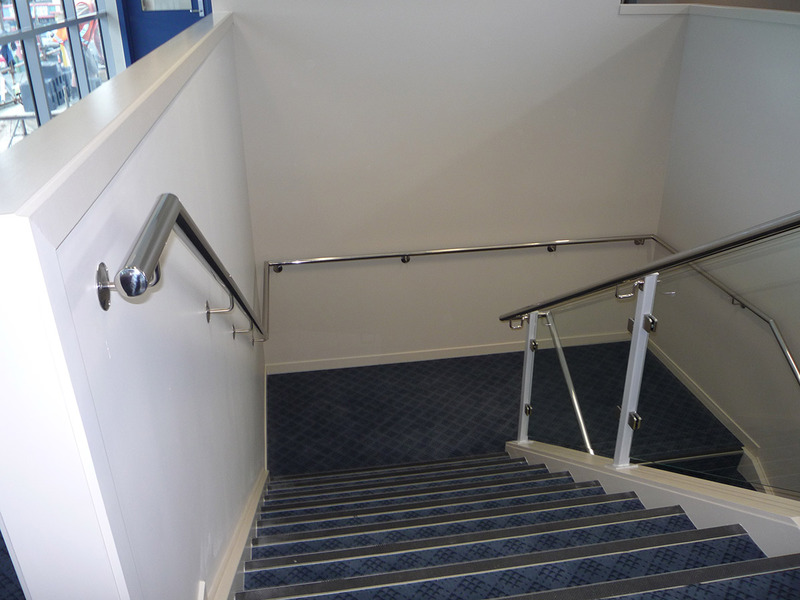 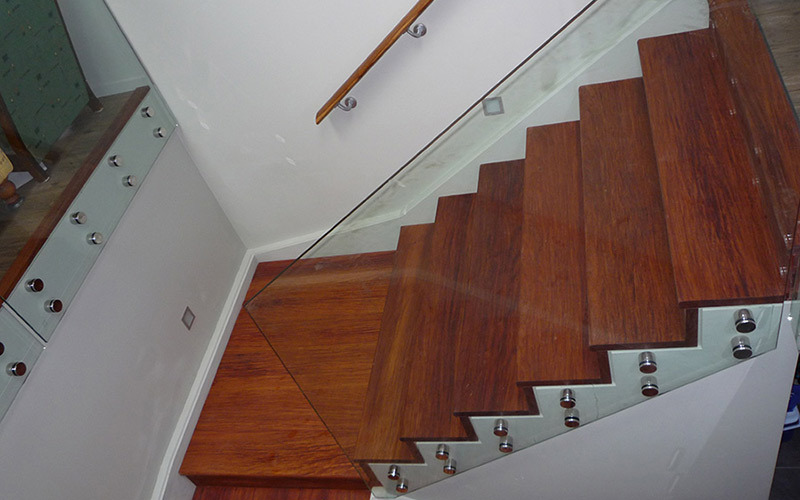 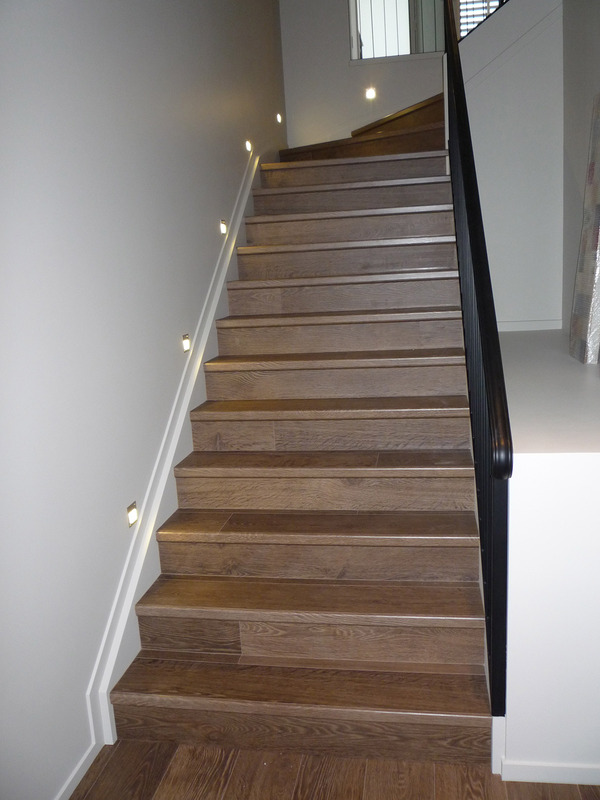 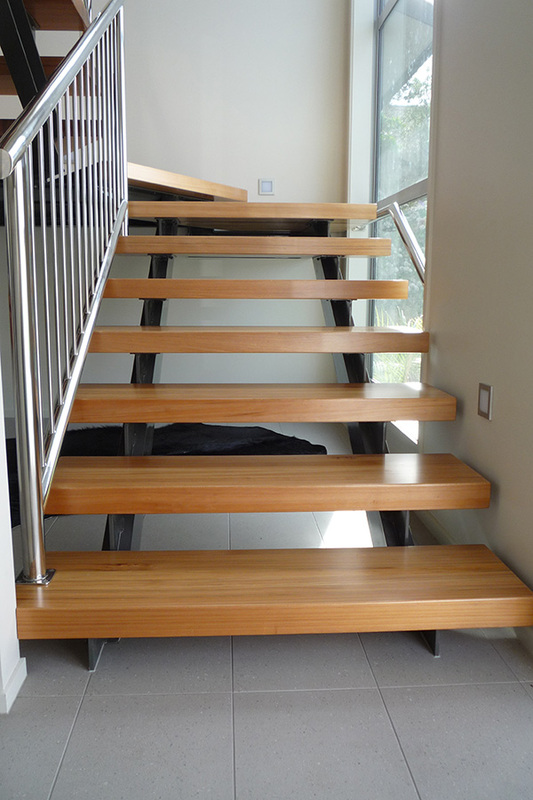 To help you adhere to these regulations, we can install stainless steel strips set at 2mm above the stair tread. 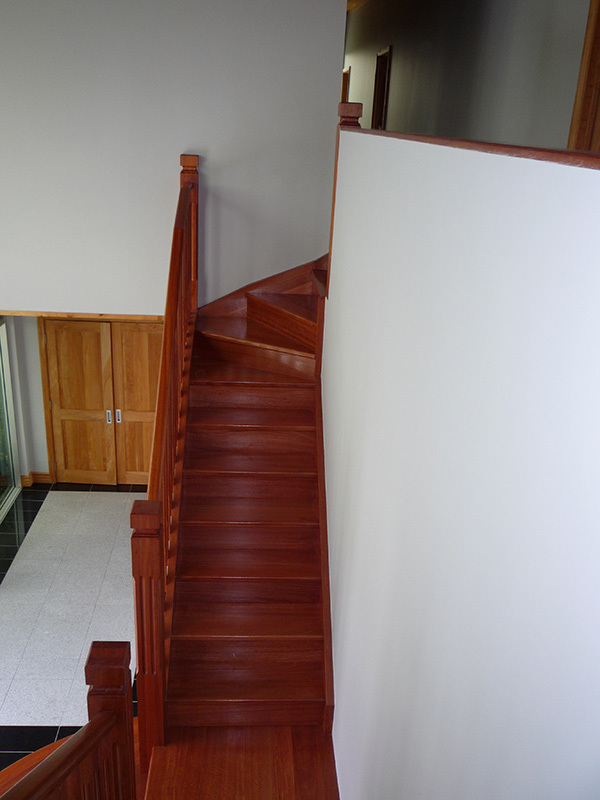 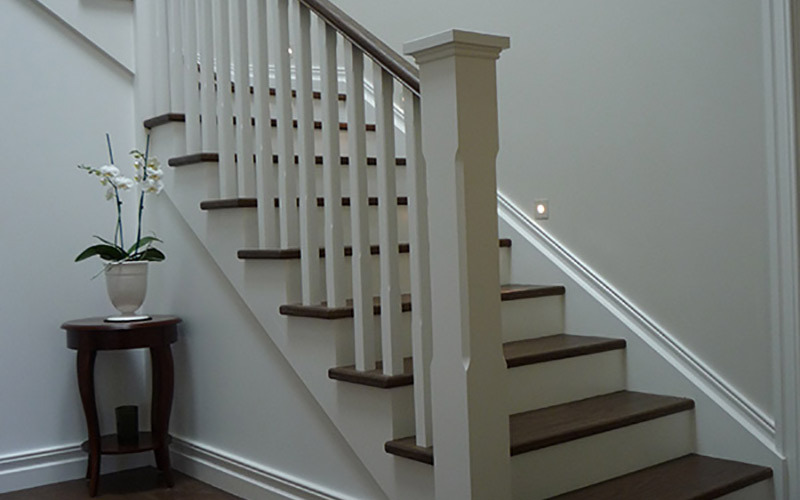 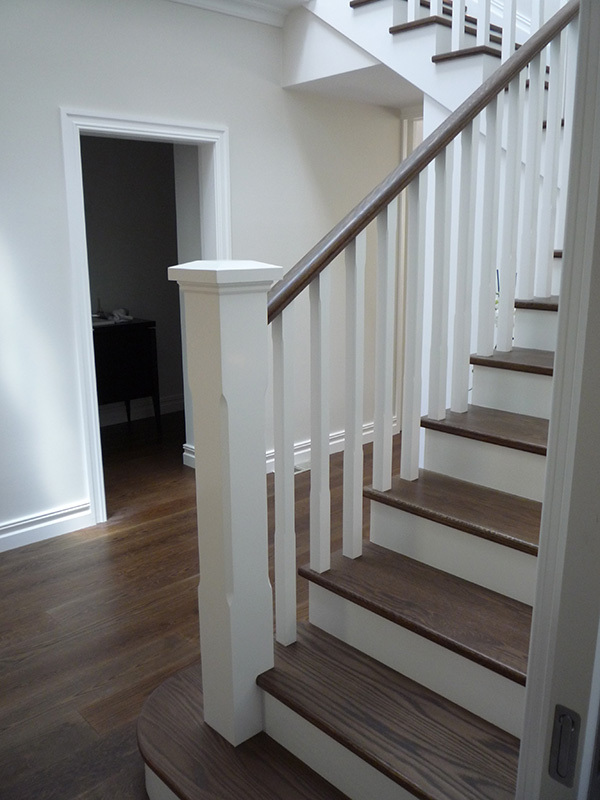 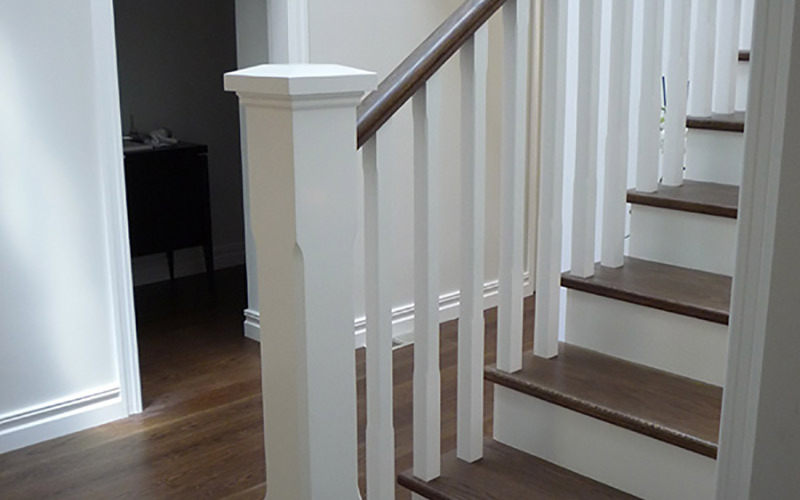 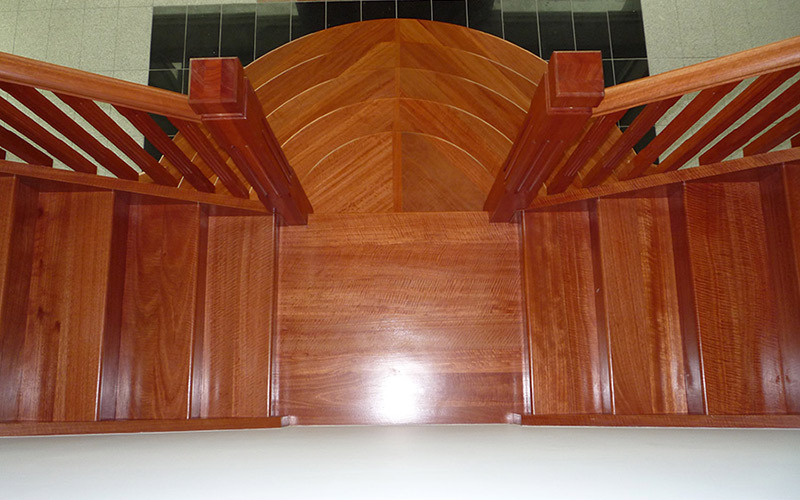 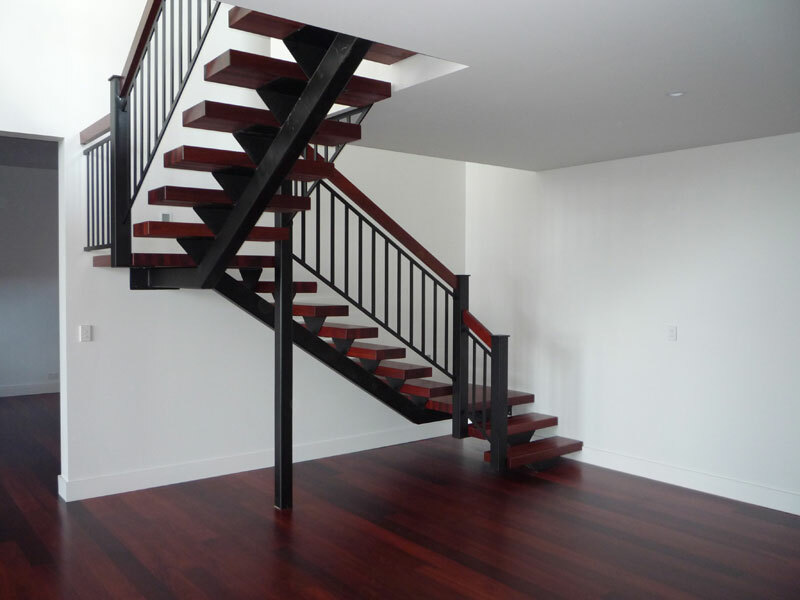 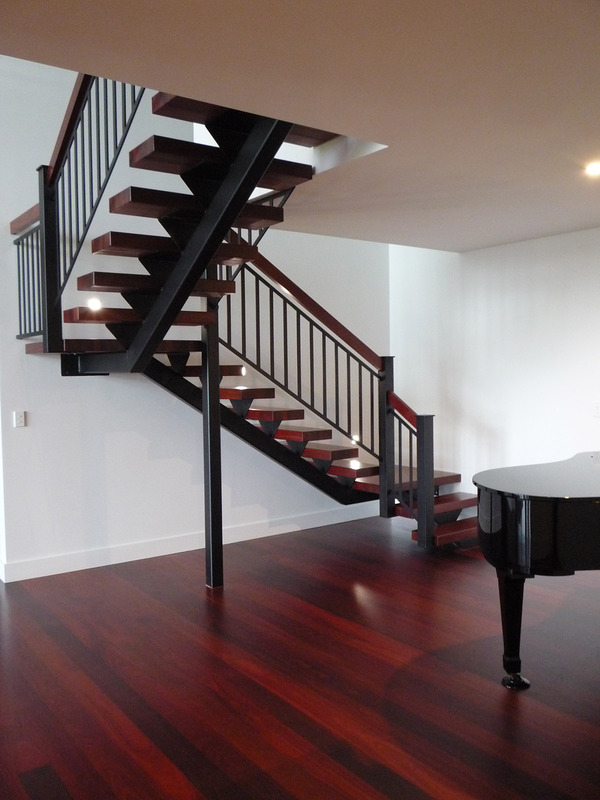 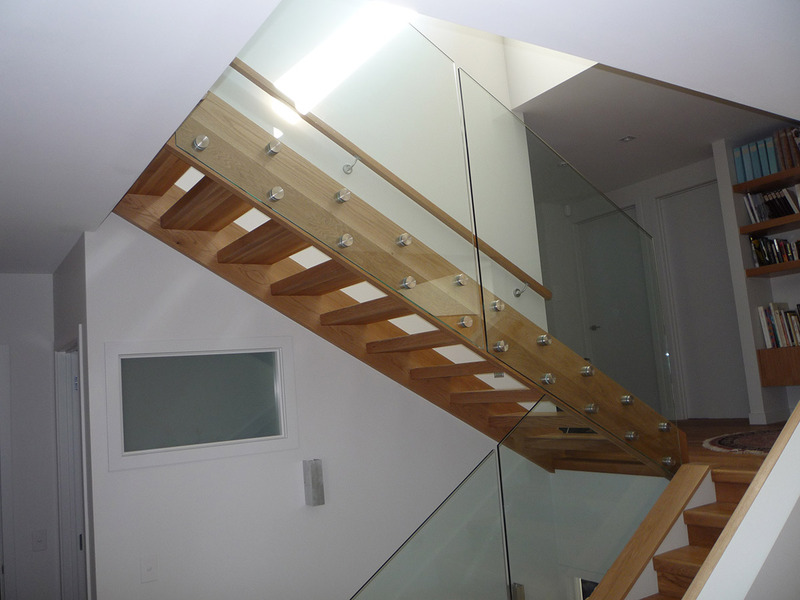 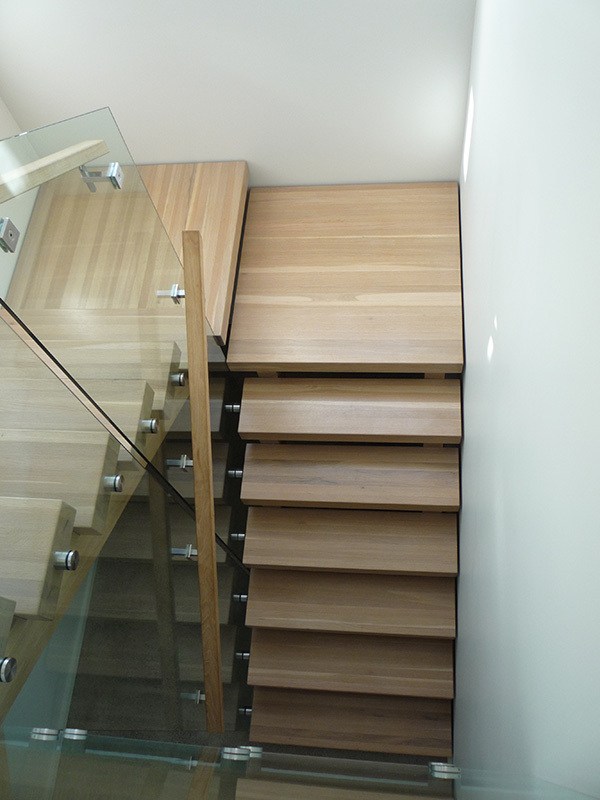 While we offer a number of different staircase designs, we can also custom-make a design especially for your space. 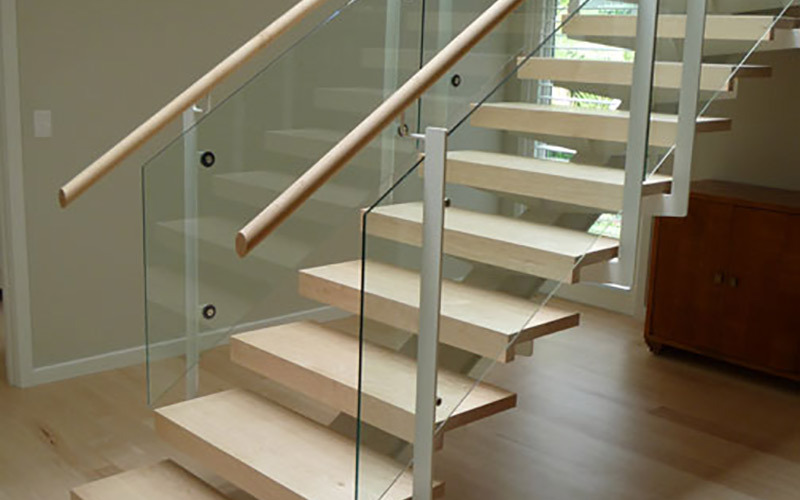 Contact us to learn more about the options available to you. 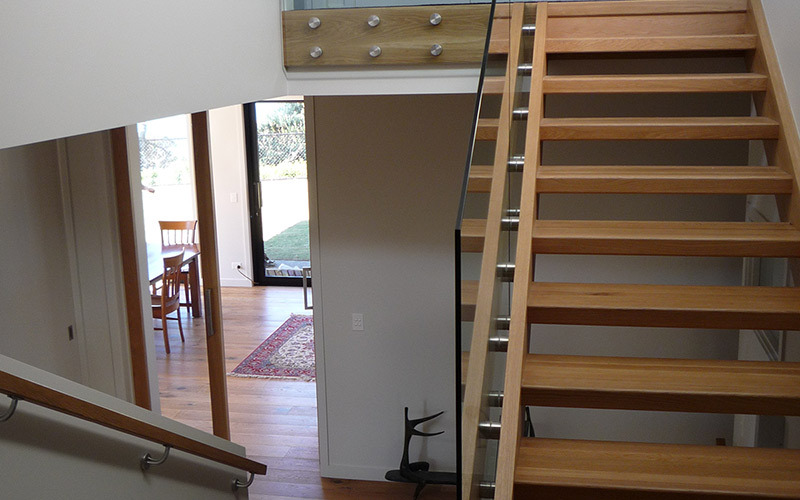 Timber is a versatile building material that can look simple yet sophisticated. 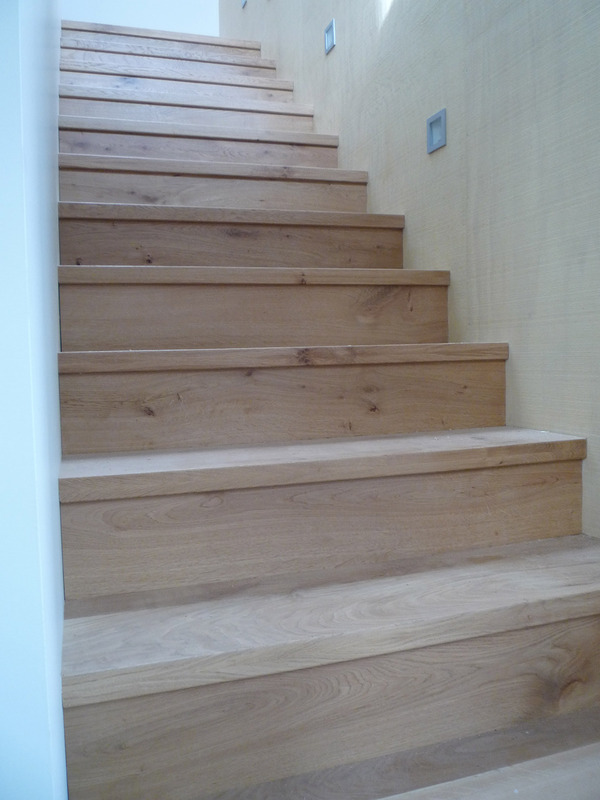 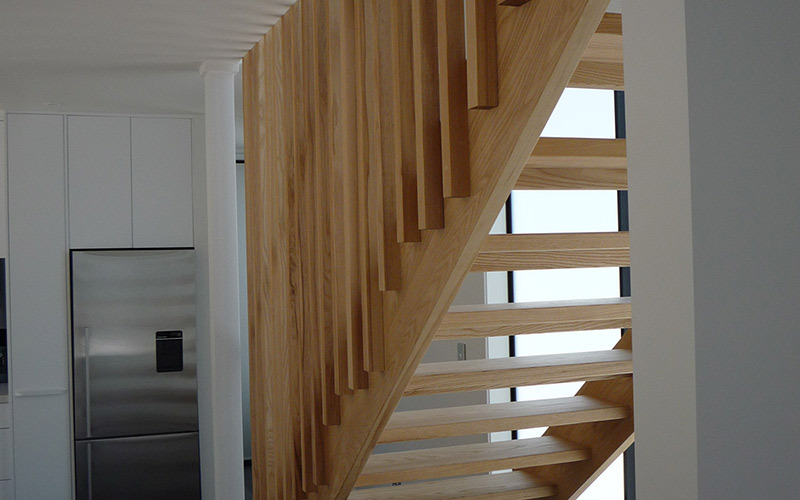 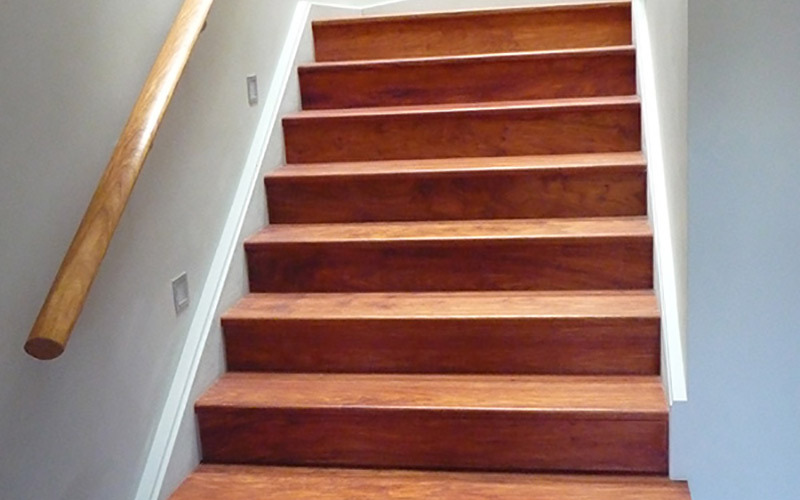 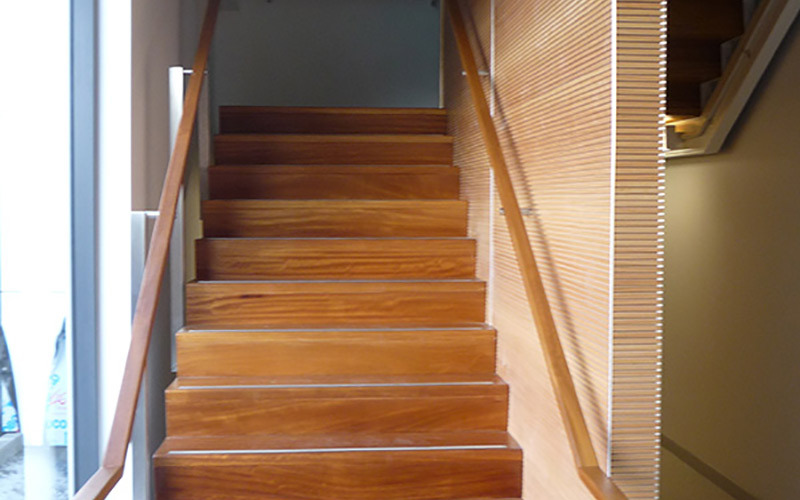 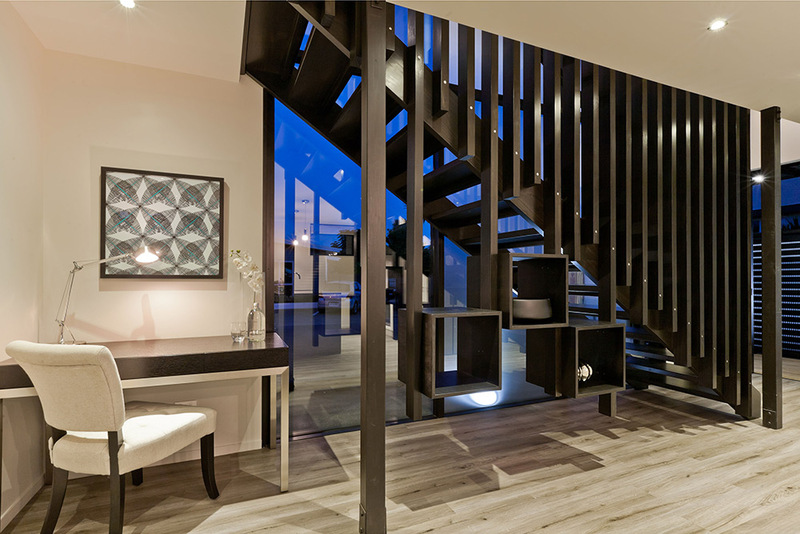 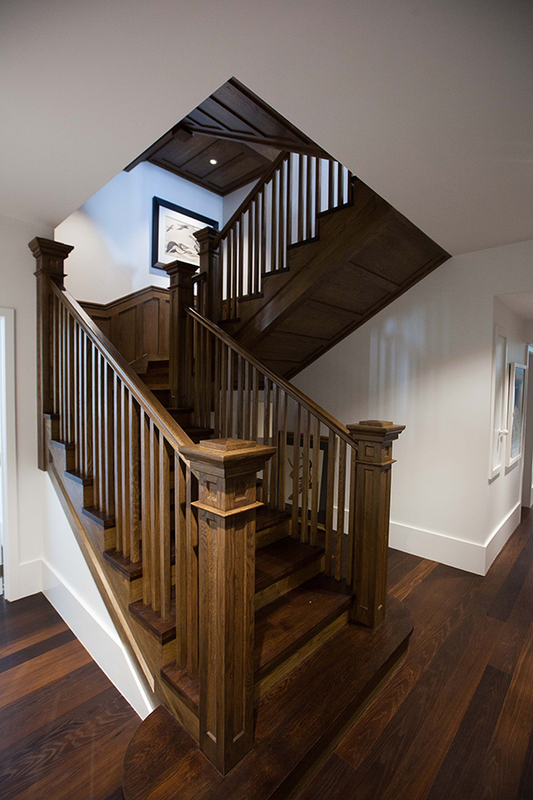 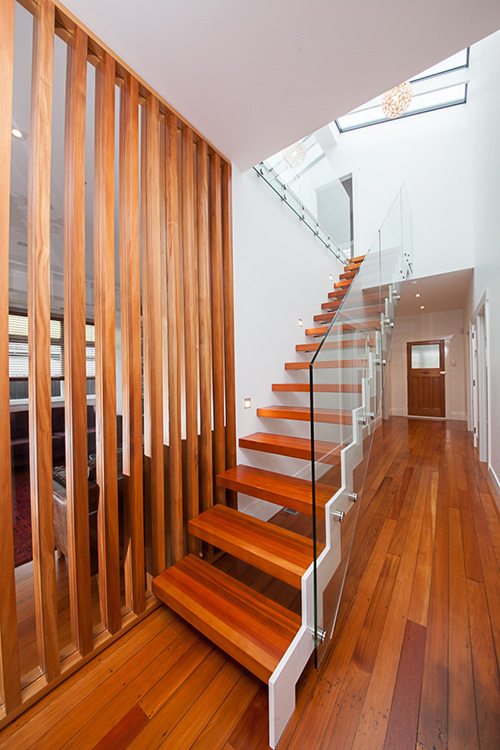 Staircases made of timber or those that have wooden accents bring an air of elegance to any space. 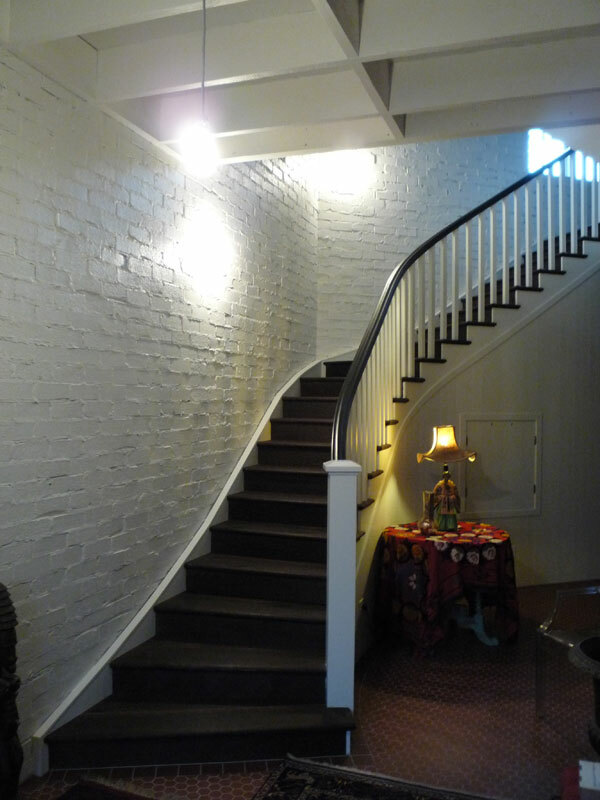 We at Ackworth House believe that sometimes, nothing beats a classic. 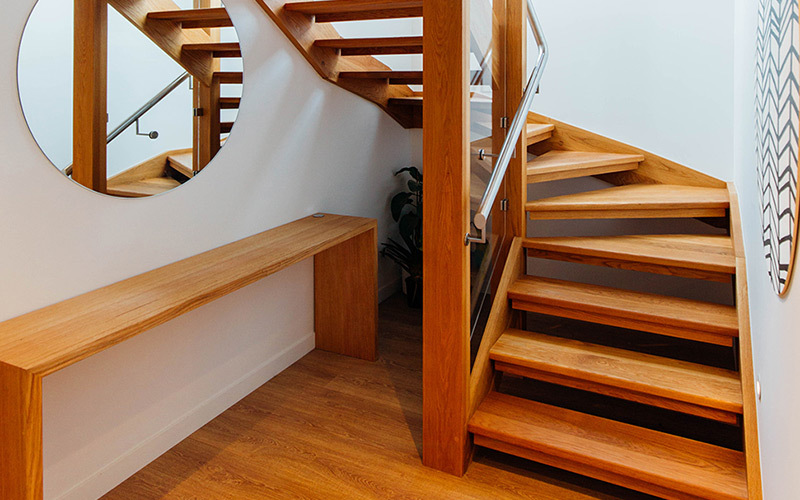 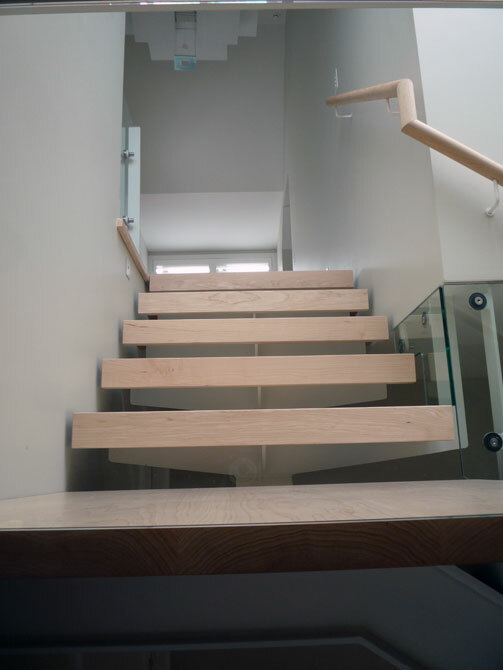 Aside from our range of floating stairs, we also create conventional stairs that are designed to be perfectly attuned to your current architecture. 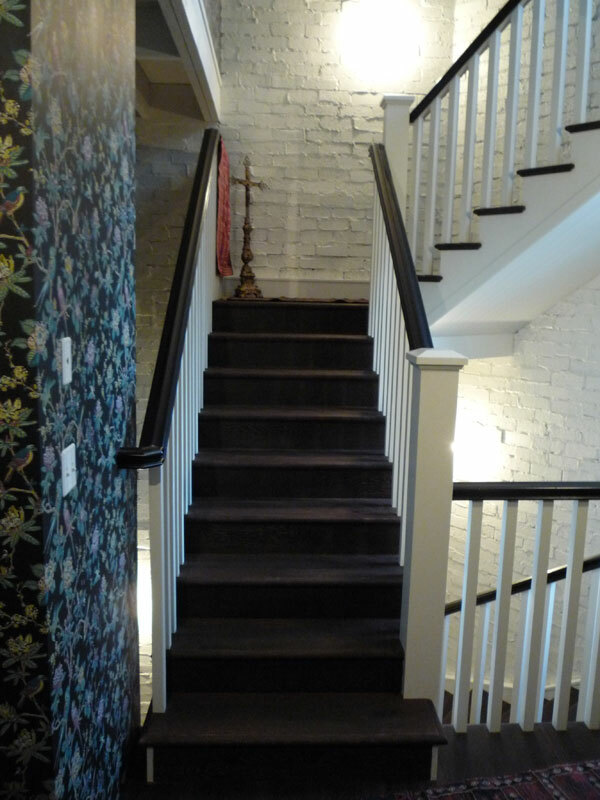 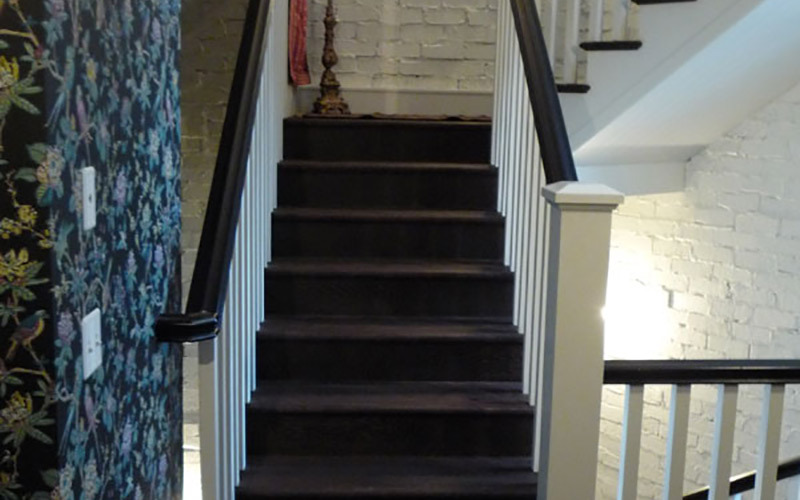 Stairs have been used in books, movies, and TV shows as a stage for important events. 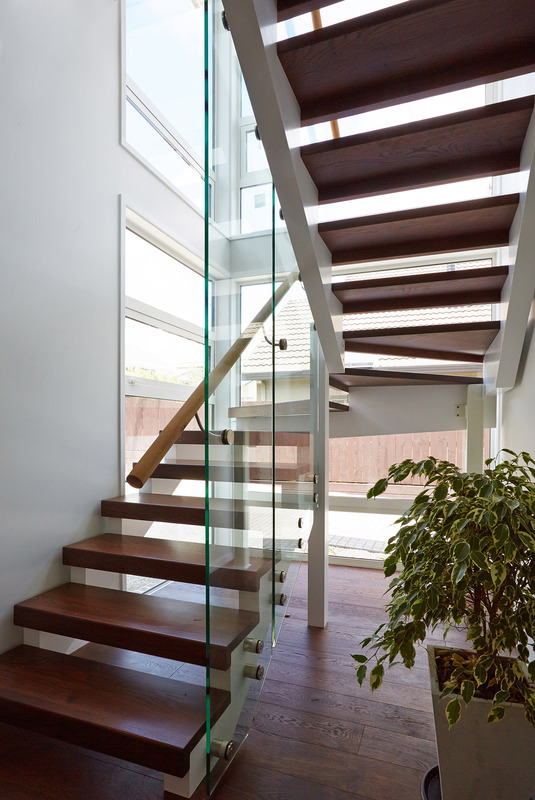 The use of this structure in this way is attributed to its role as a transition element in architecture. 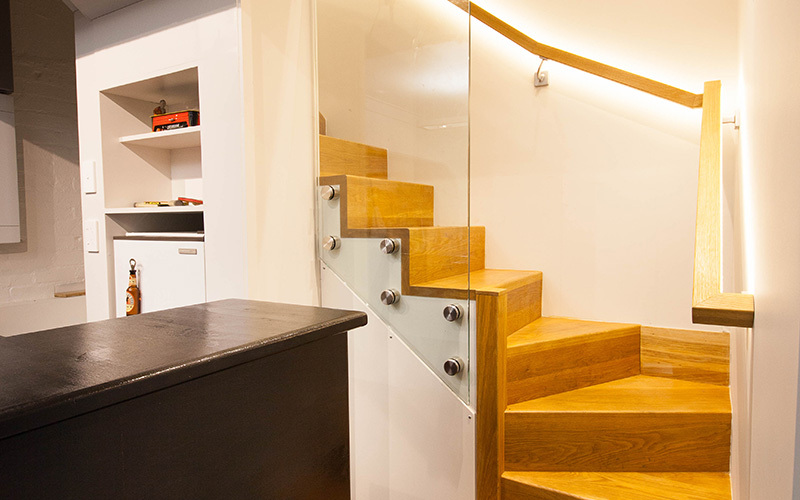 Its purpose of connecting two separate spaces together has made it an important feature in most spaces. 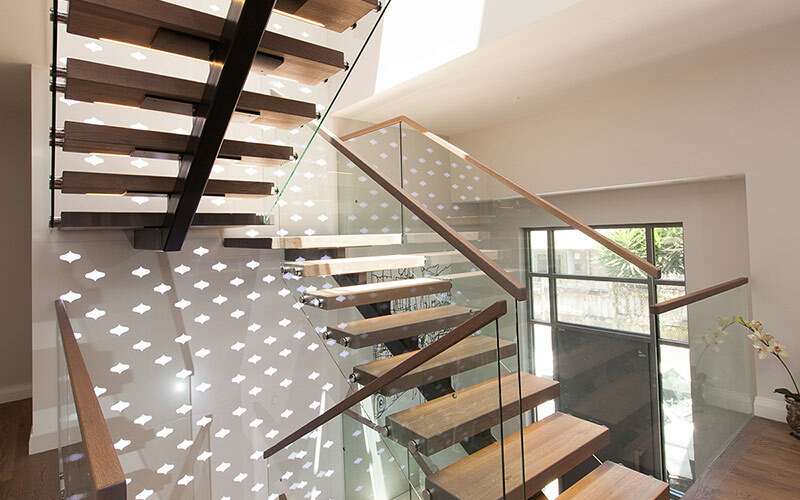 Over the years, staircases have taken on a number of designs to fit the overall architecture of the space they are built in. 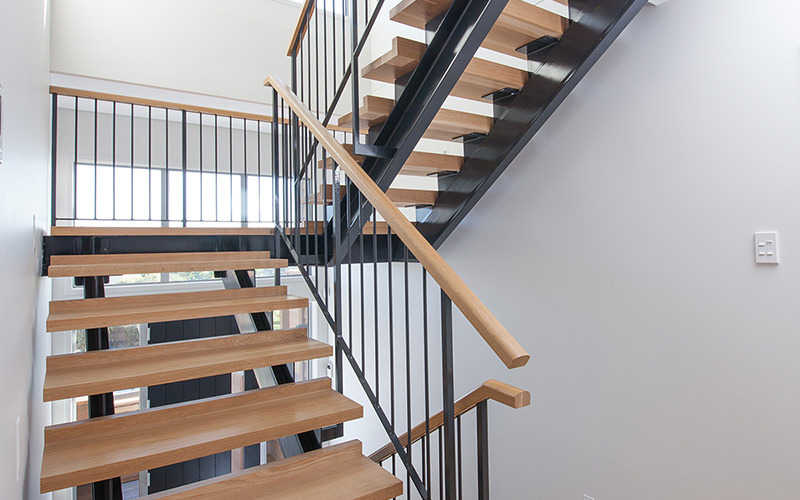 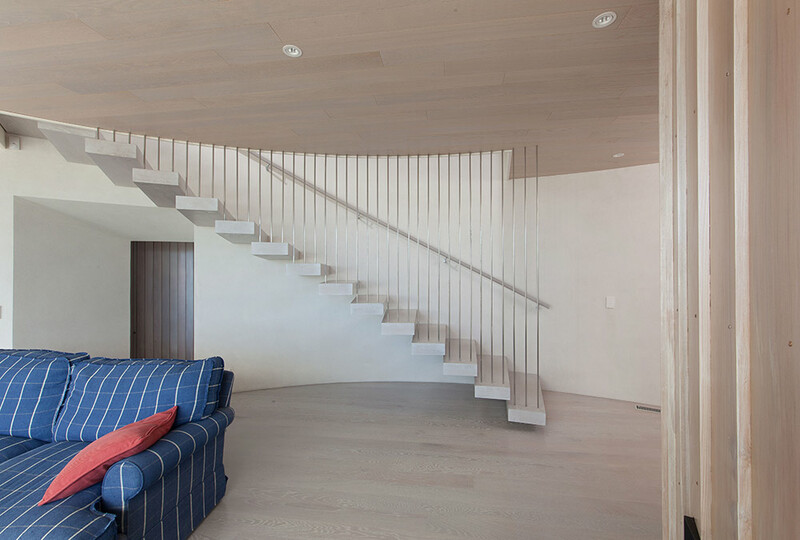 From grand staircases that demand your attention to conventional ones that are made for their functionality and whose presence you’ll only truly appreciate when you are using them, the options for these structures are almost limitless. 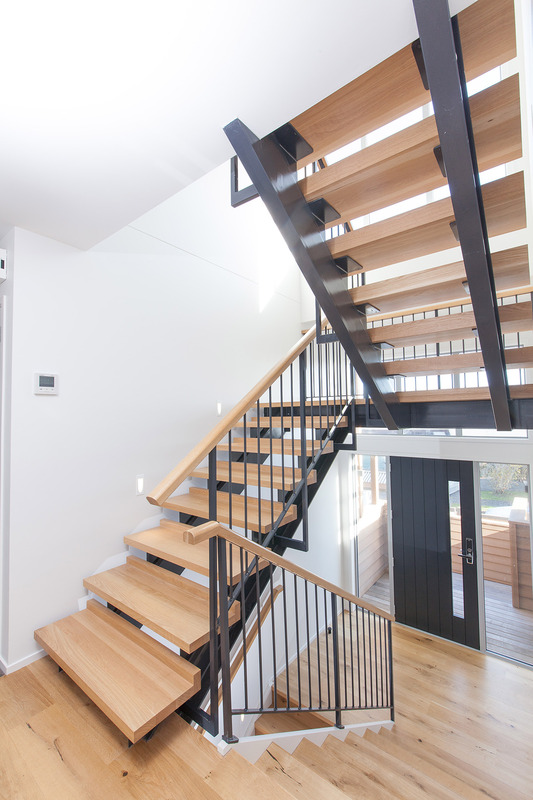 Often when a house or any building is designed using the latest trends, they will look dated and out of place in the near future. 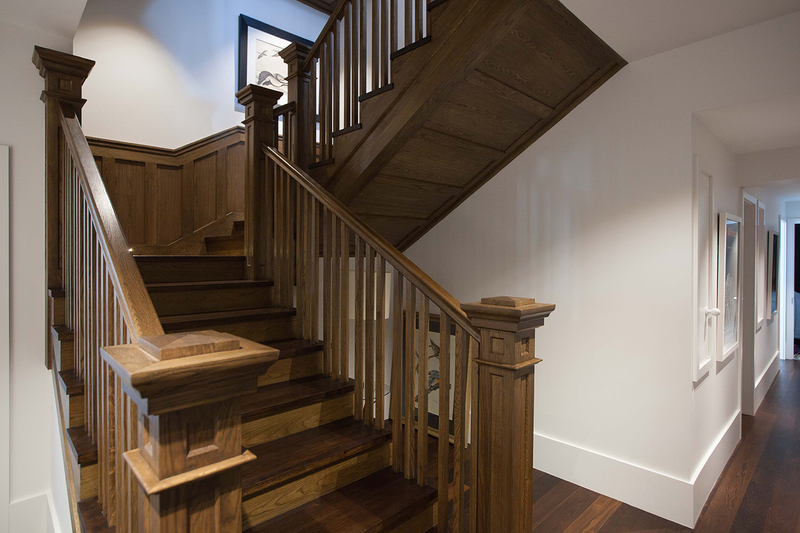 To achieve a timeless look, you should keep three design aspects in mind when drafting your blueprint — these are simplicity, durability, and adaptability. 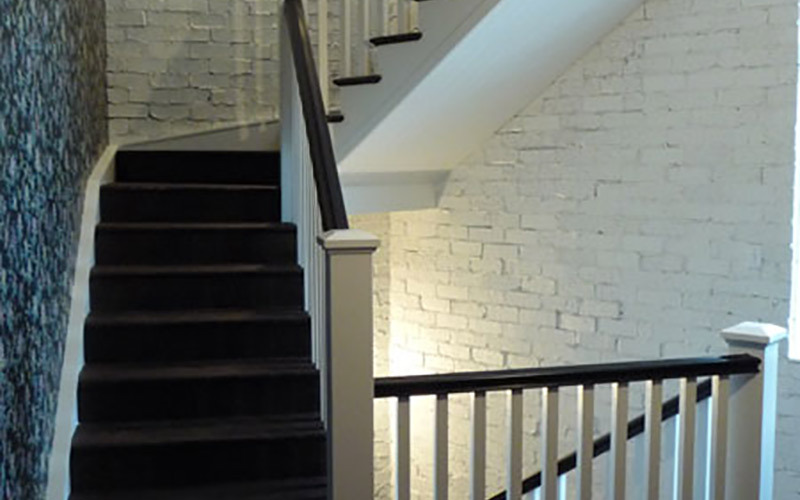 These three basic design elements will guide you creating a building that is timeless. 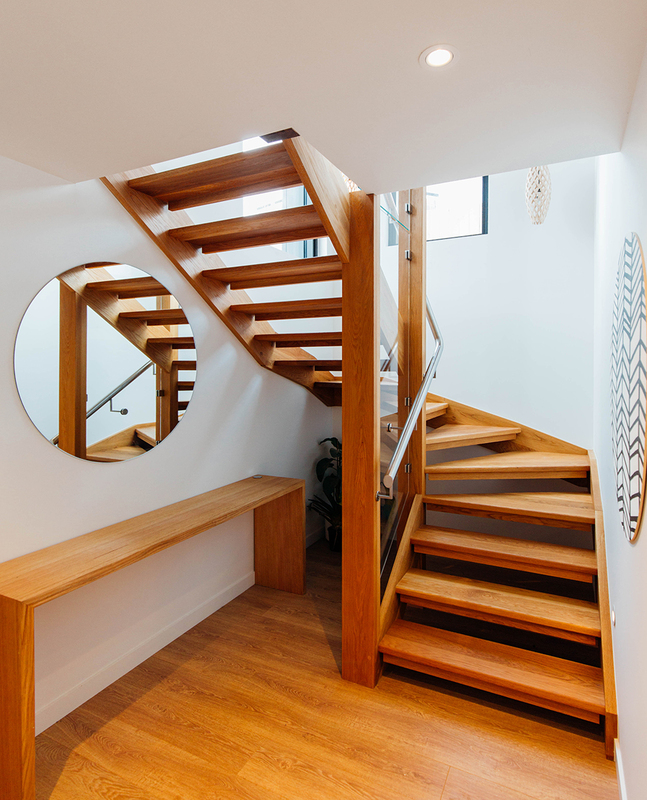 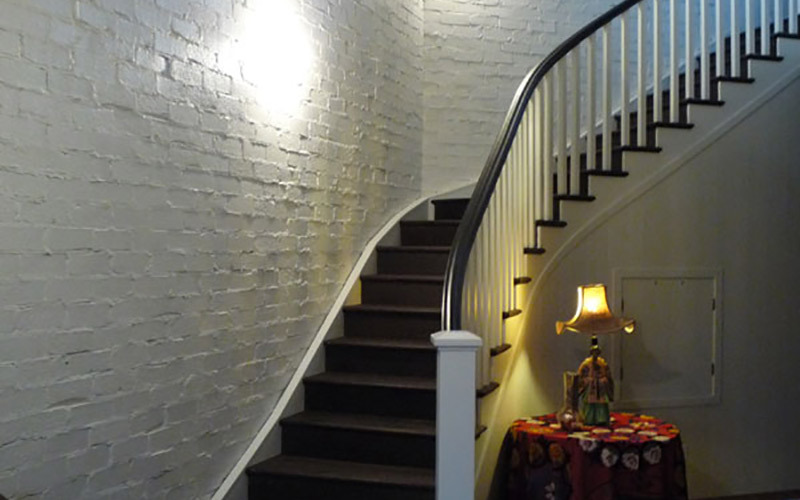 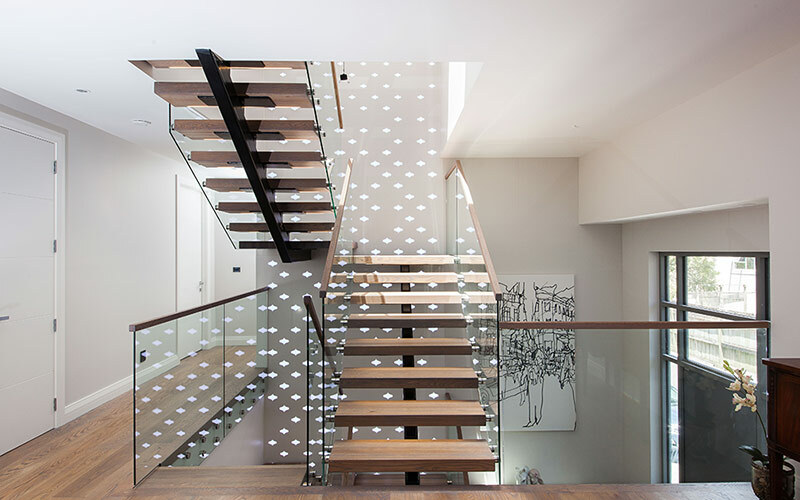 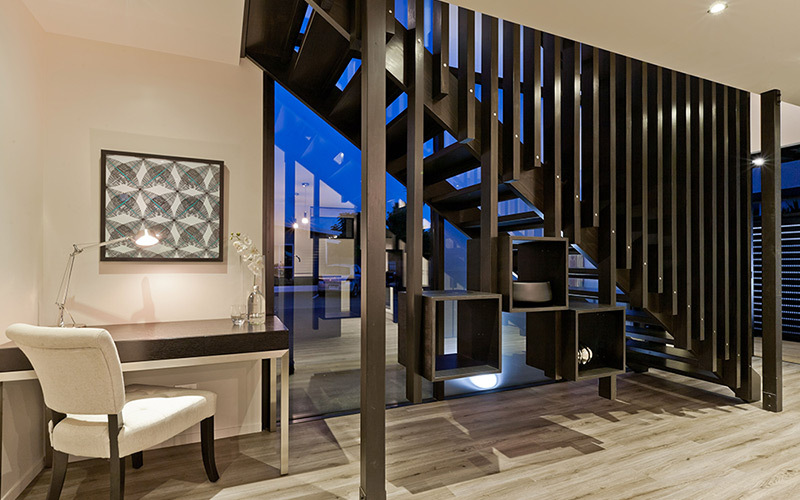 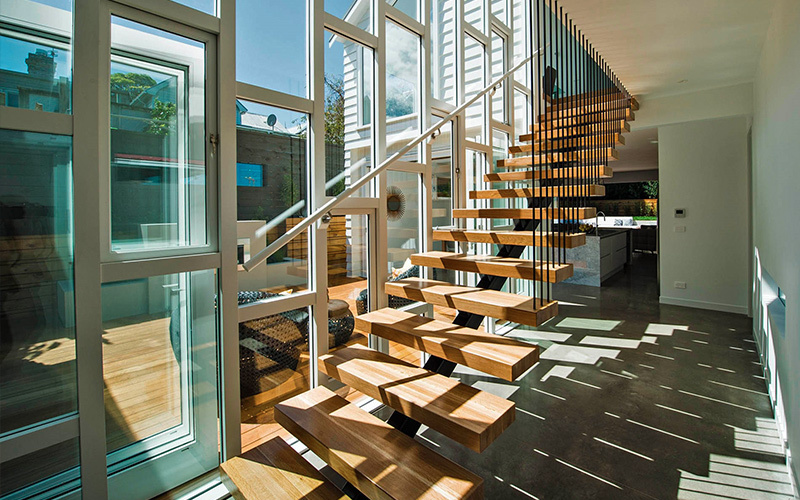 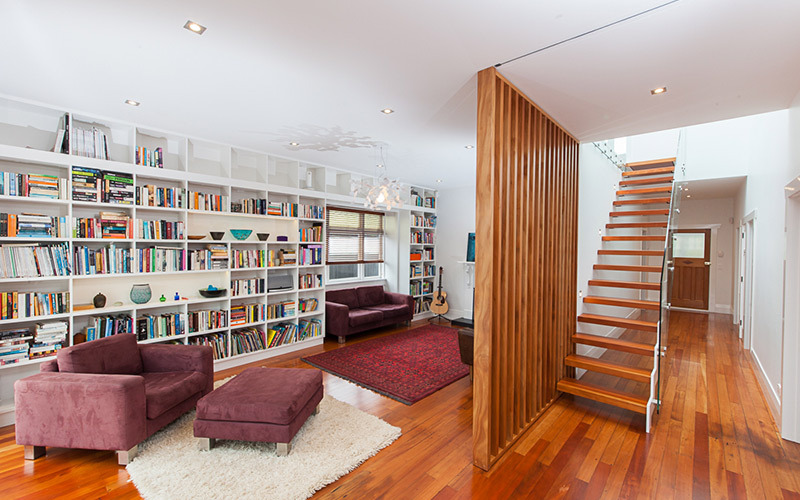 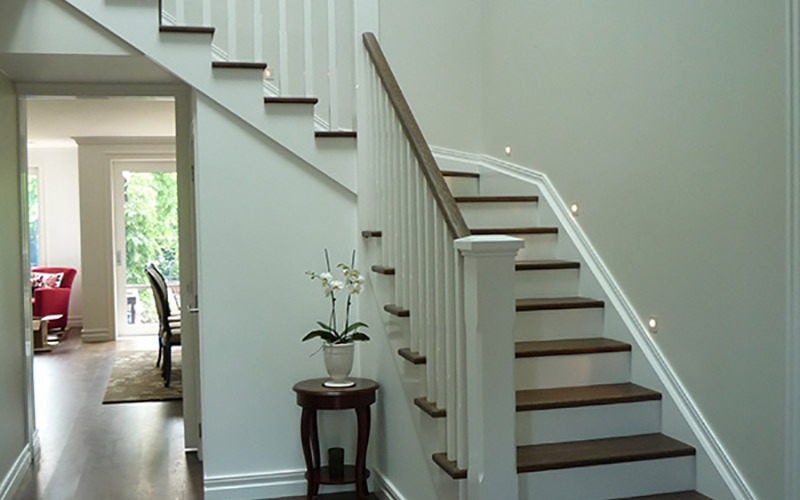 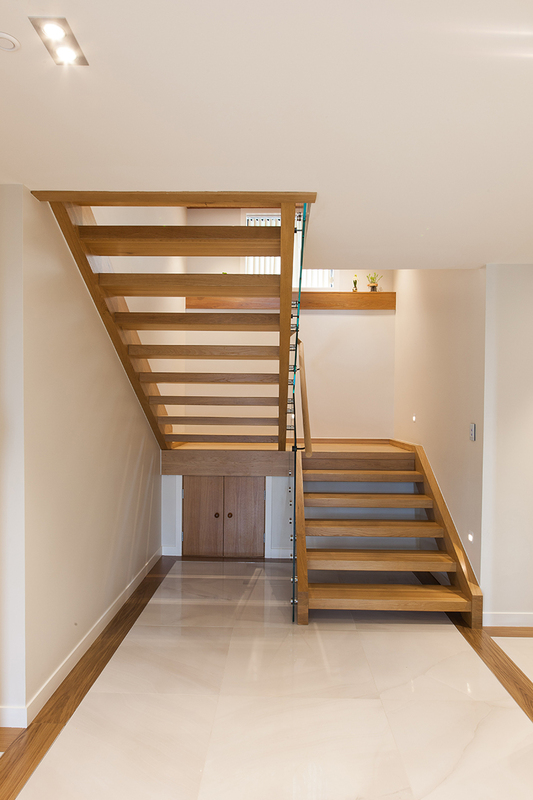 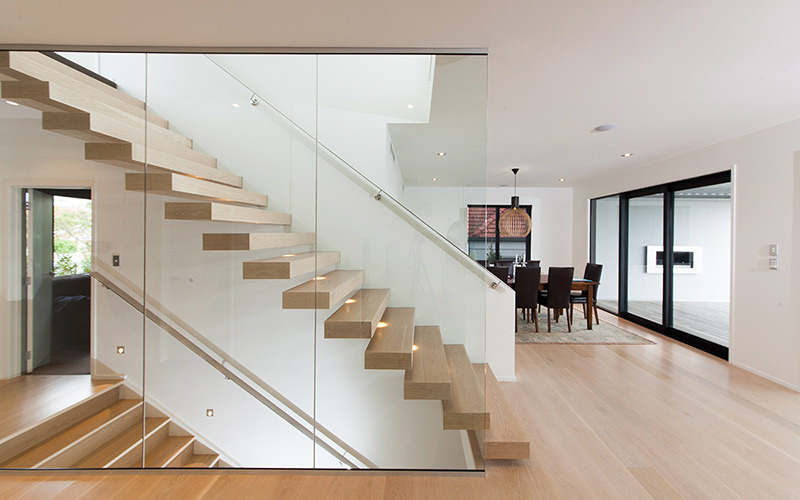 A staircase, when designed accordingly, can become the focal point of any space. 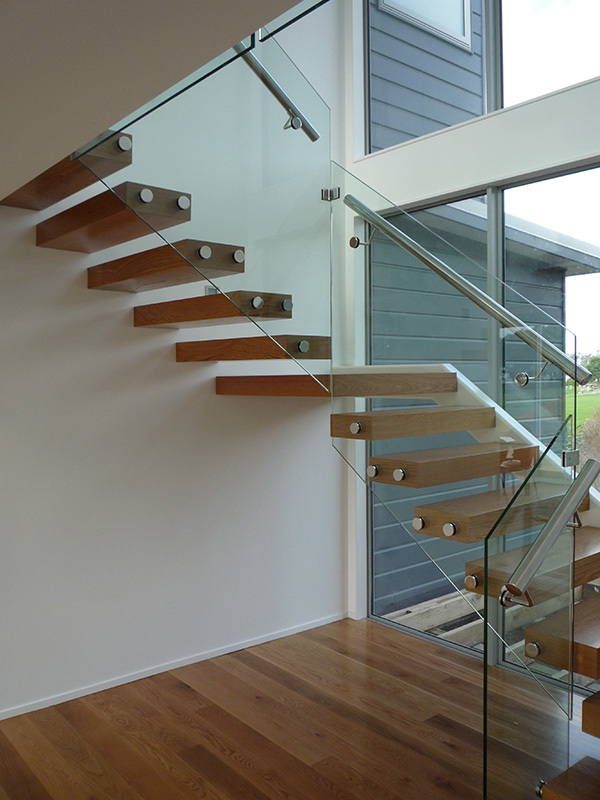 It is just a matter of designing your staircase with the three elements stated earlier. 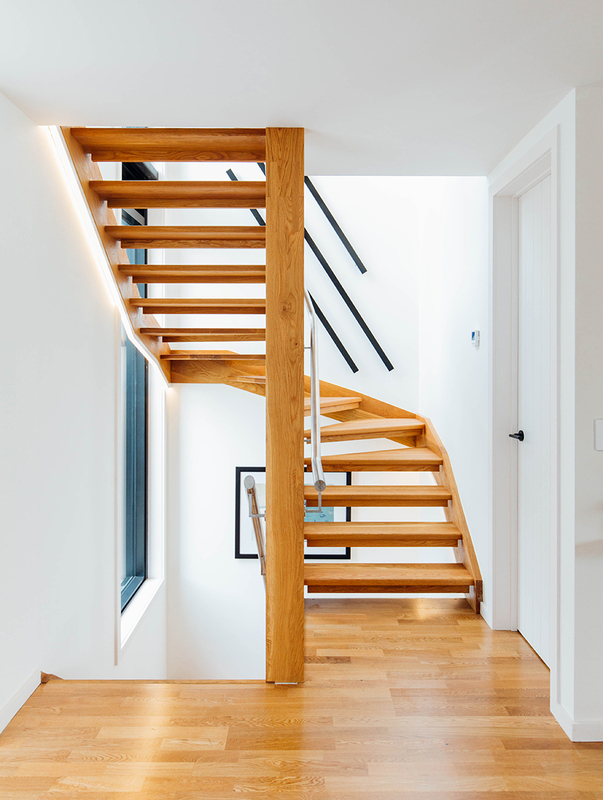 Keeping simplicity, durability, and adaptability in mind also allows you to incorporate trends without them overpowering the whole structure. 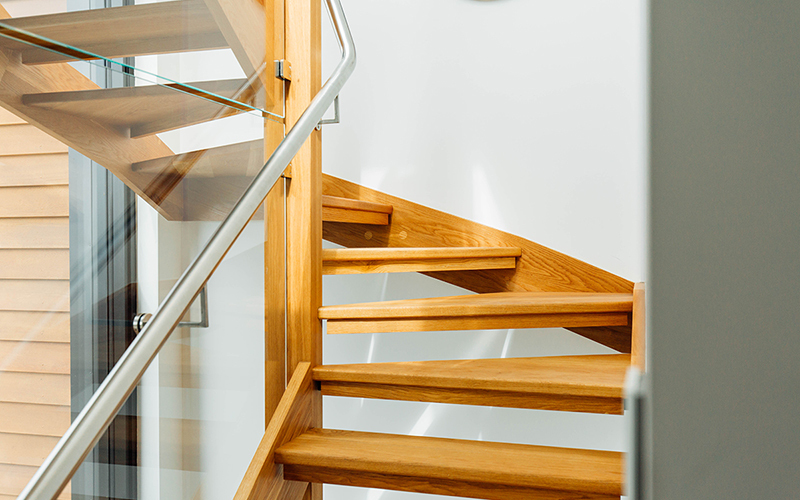 Observing the buildings around you and their staircases helps illustrate which designs are timeless and which ones are outdated. 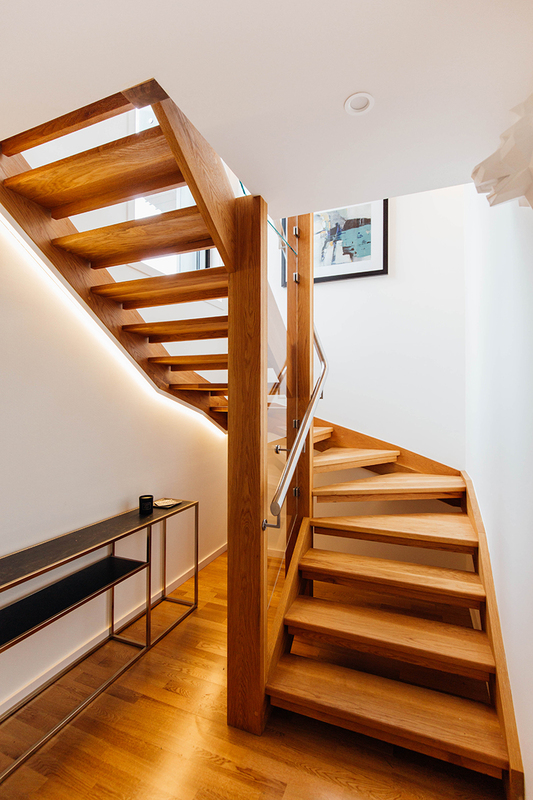 Looking at staircase images online or in architectural magazines can assist you in discerning which styling decisions work. 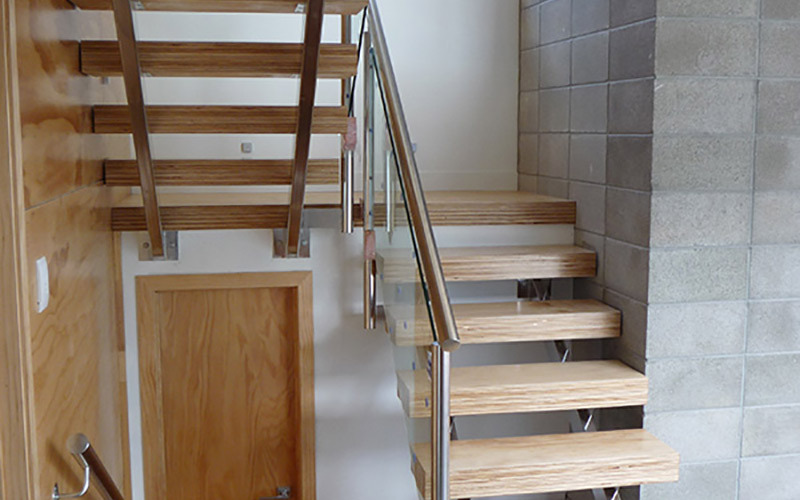 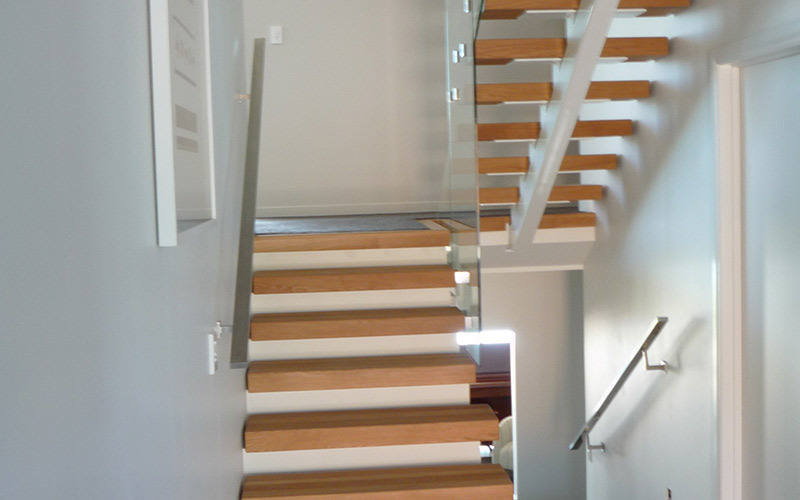 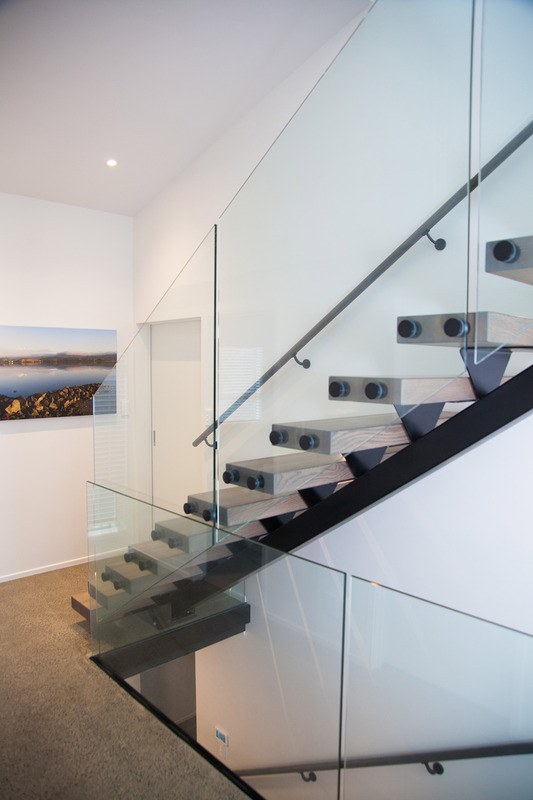 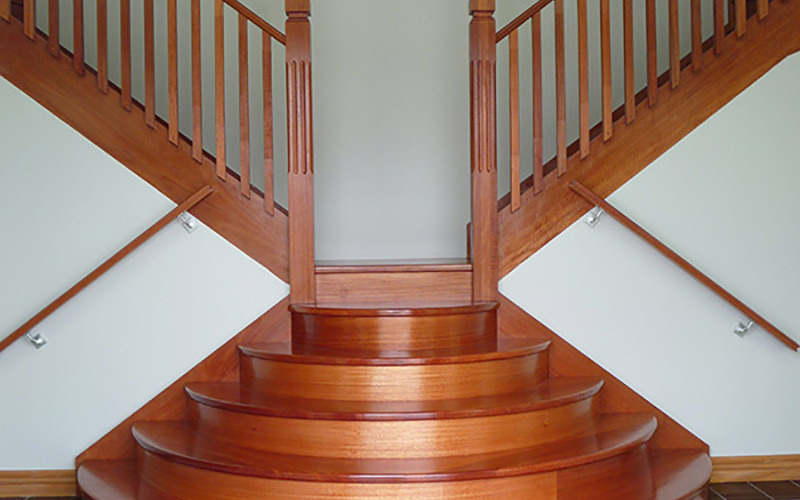 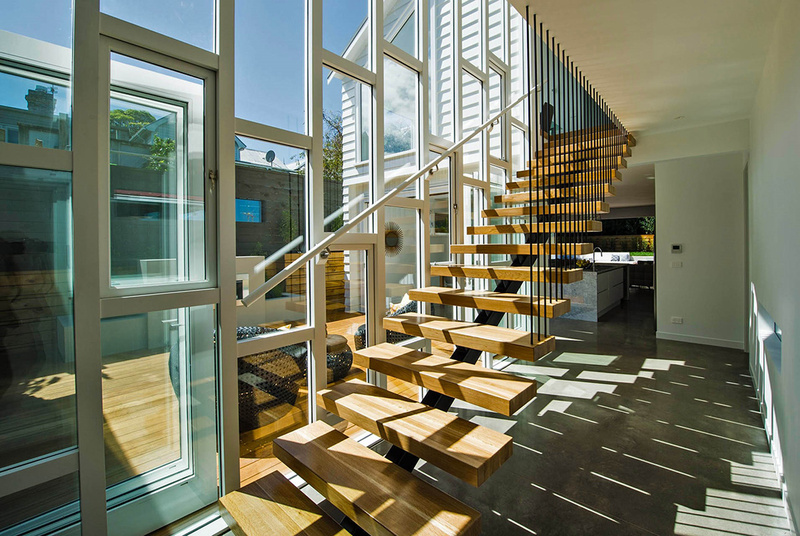 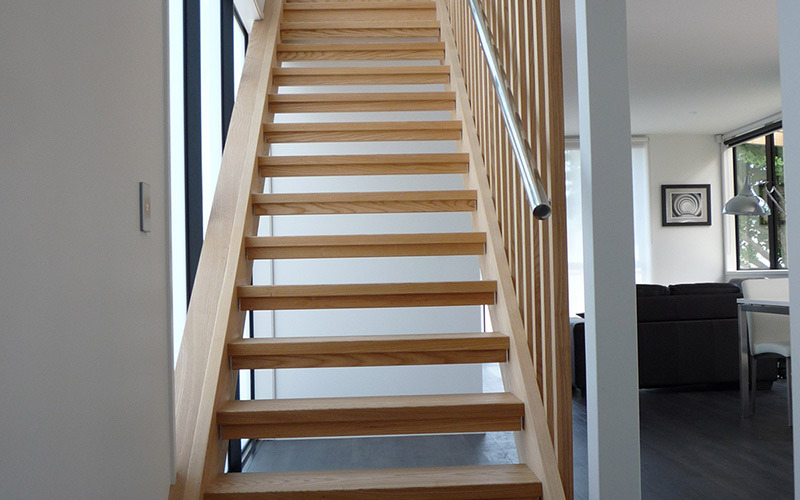 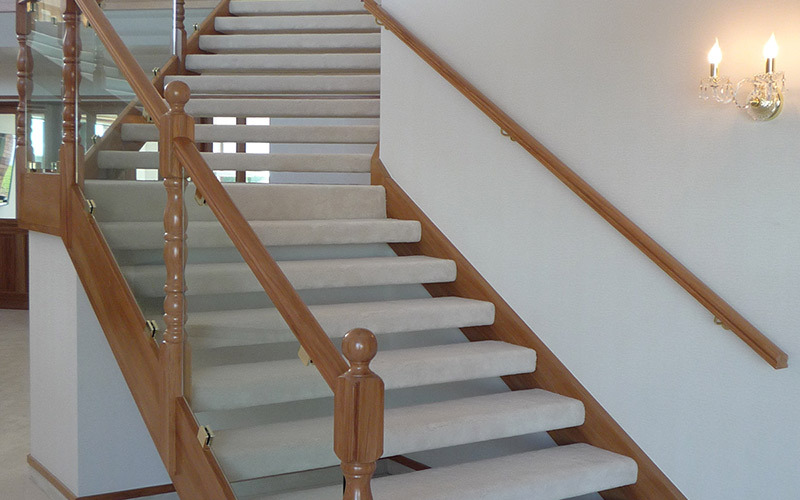 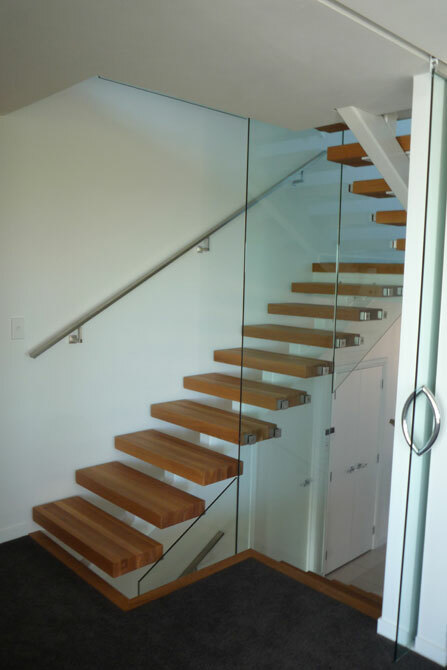 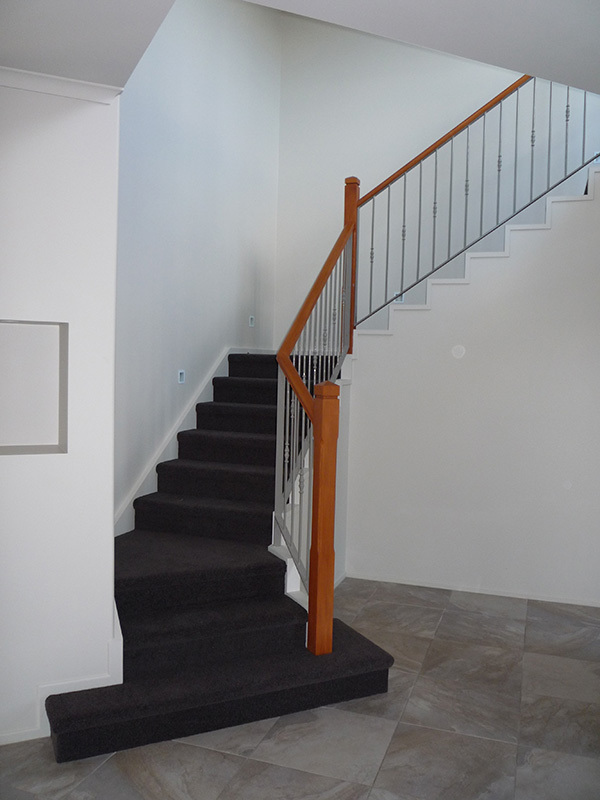 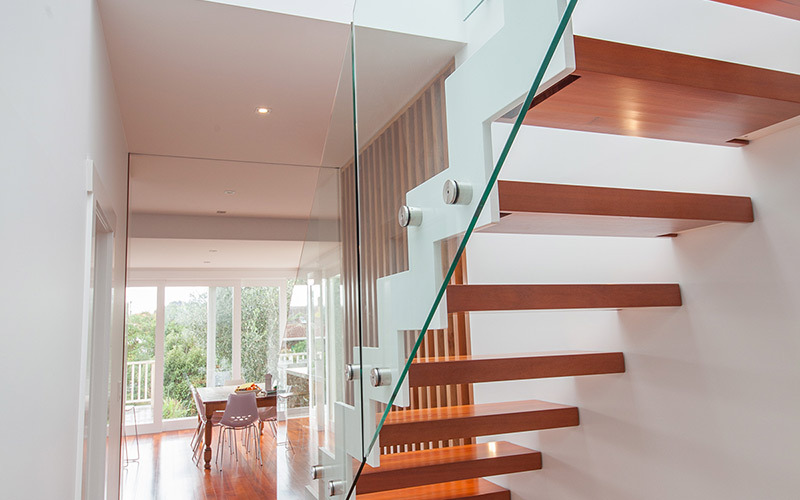 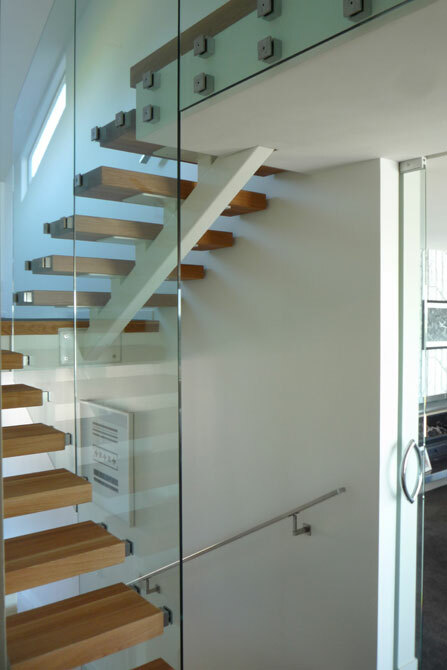 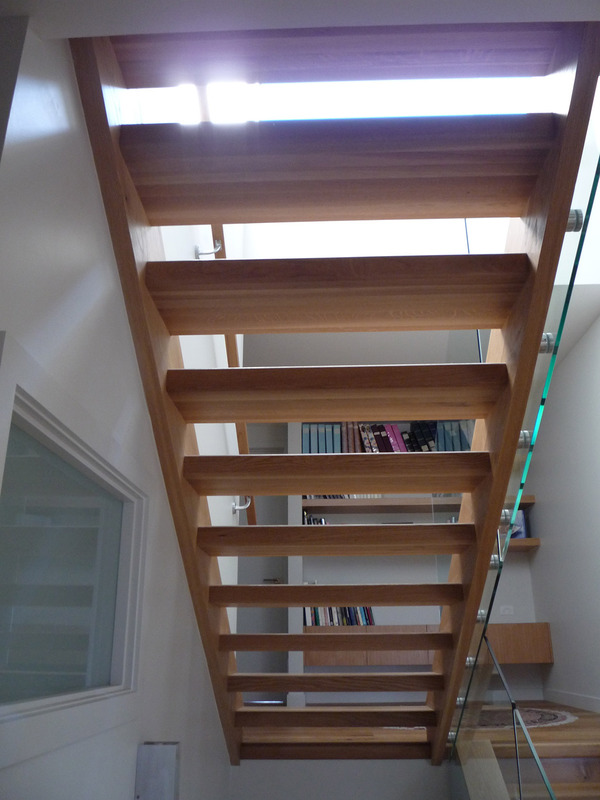 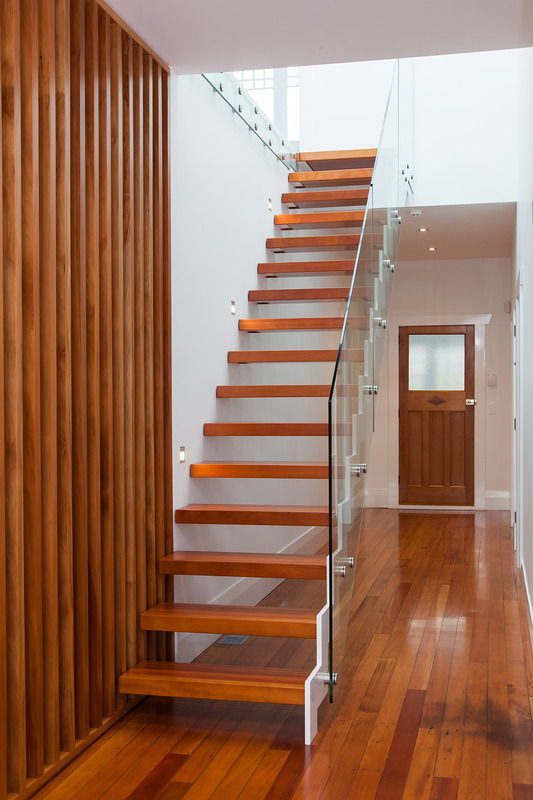 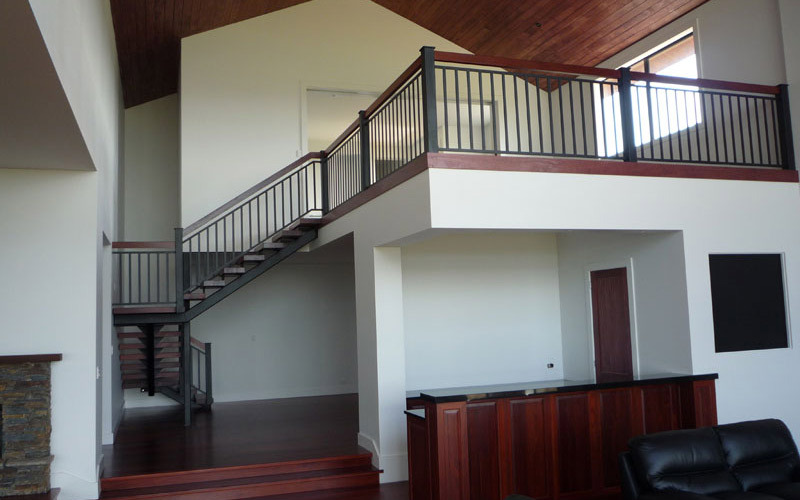 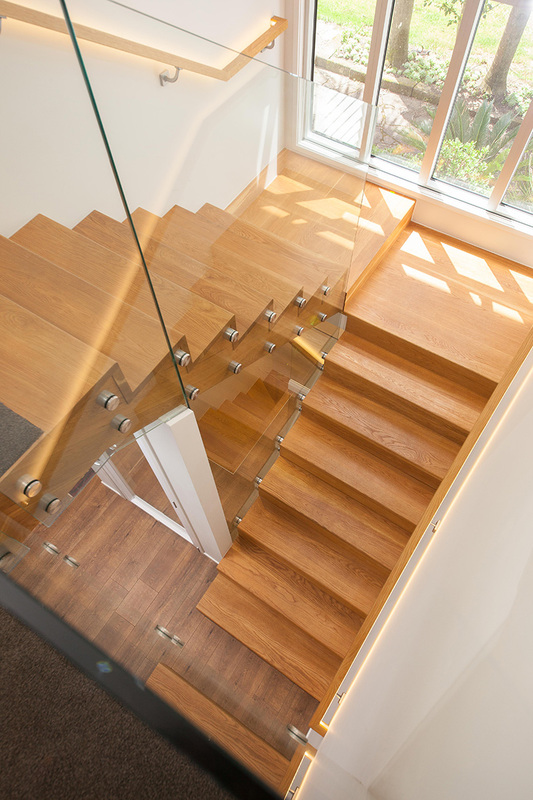 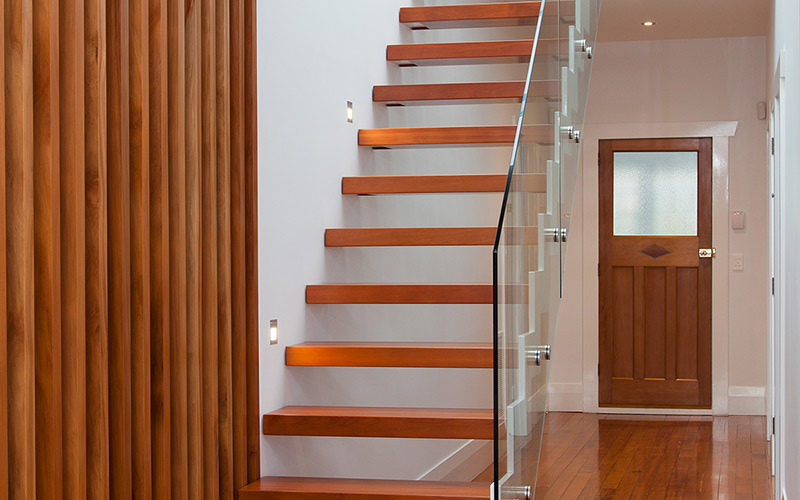 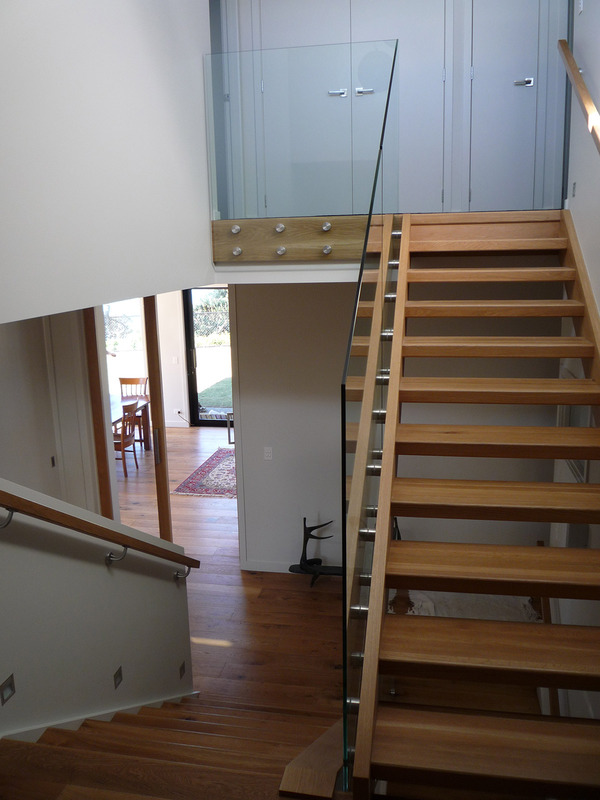 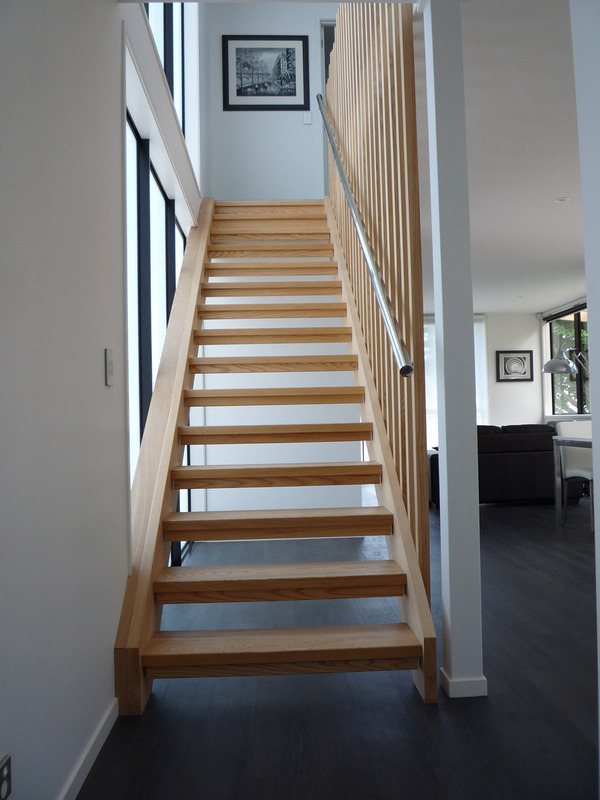 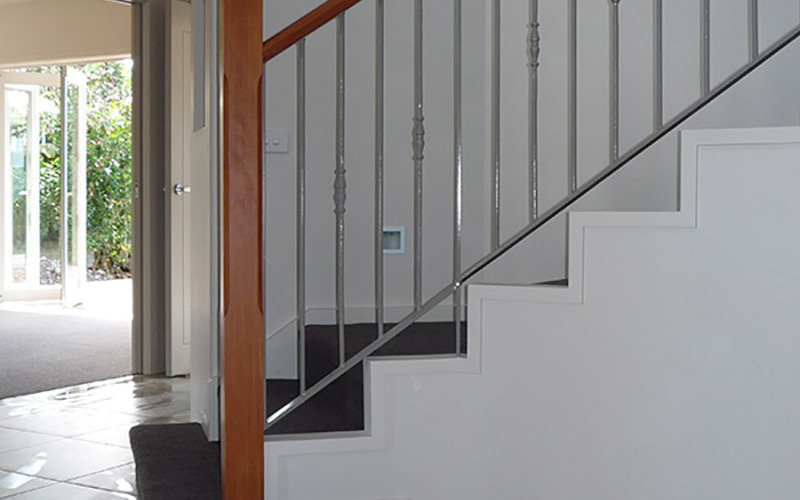 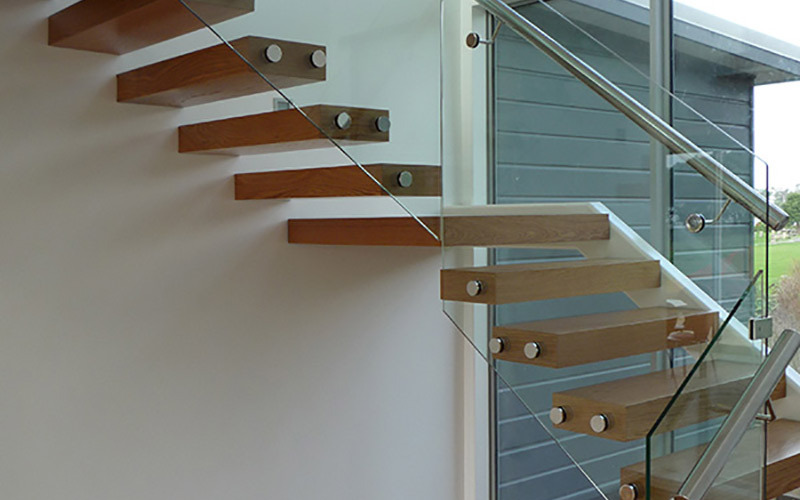 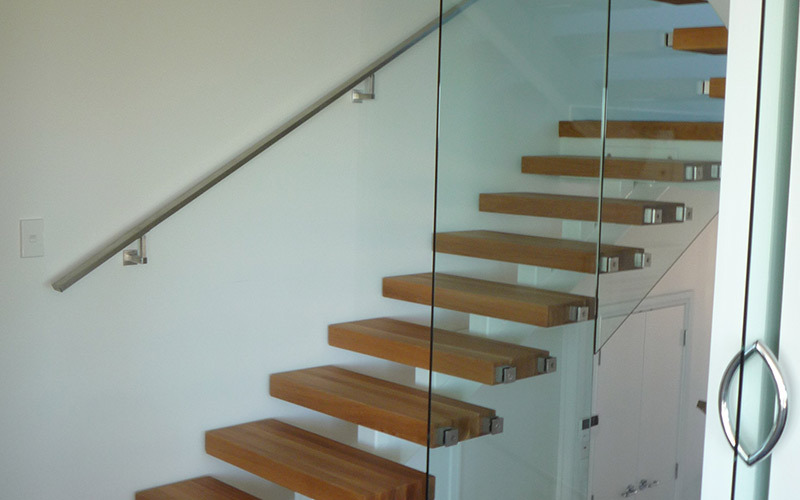 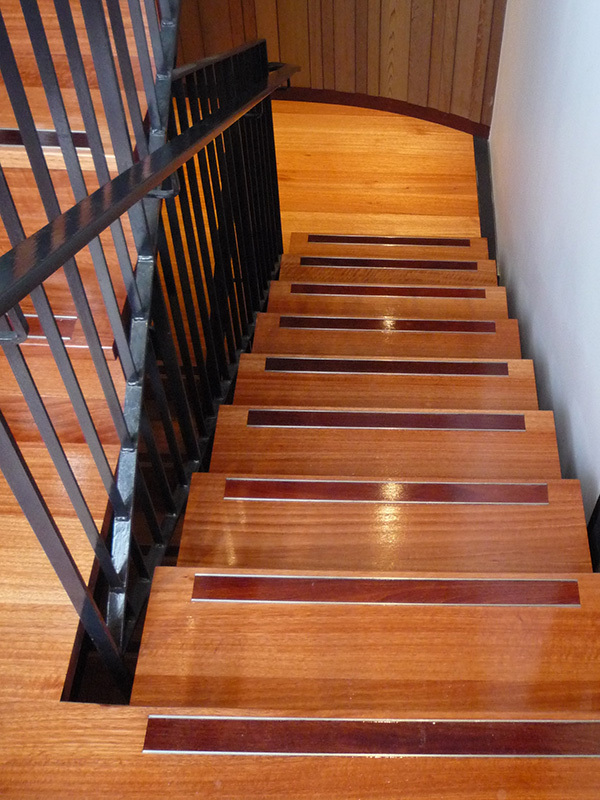 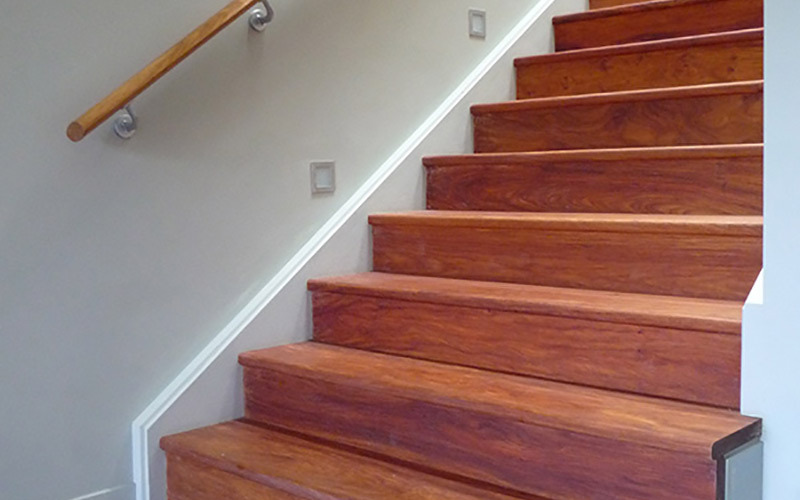 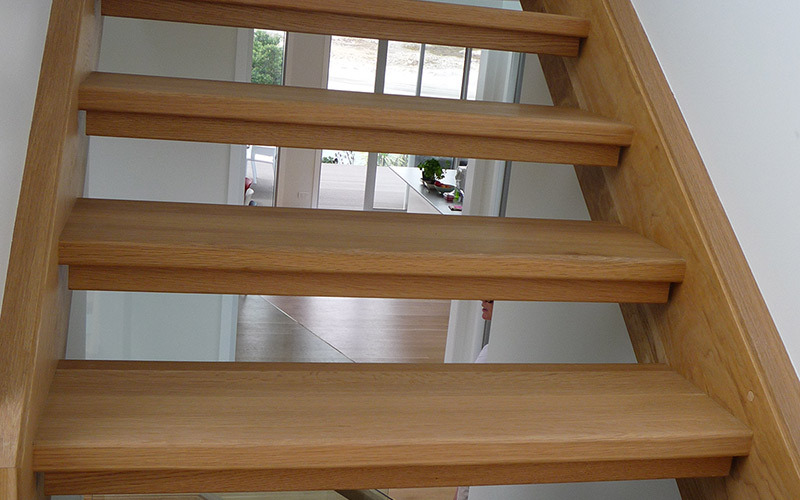 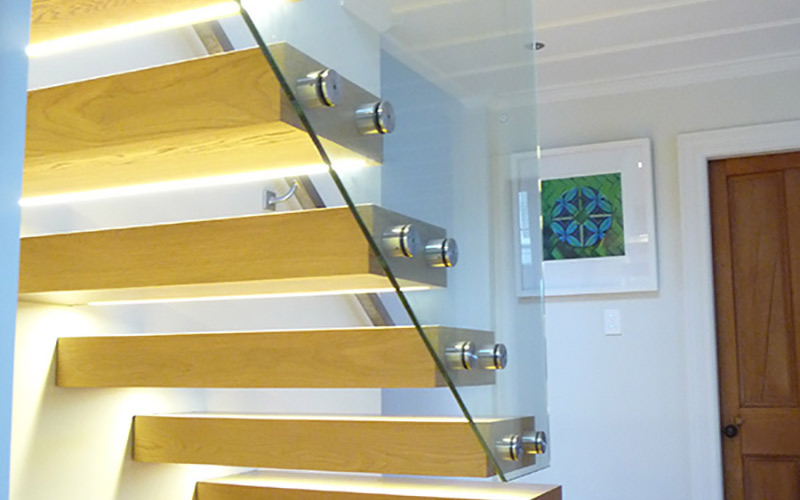 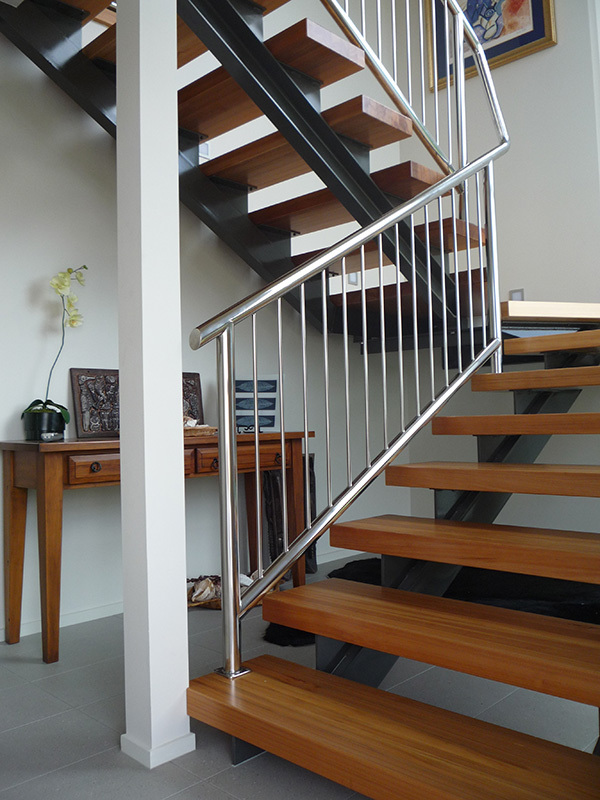 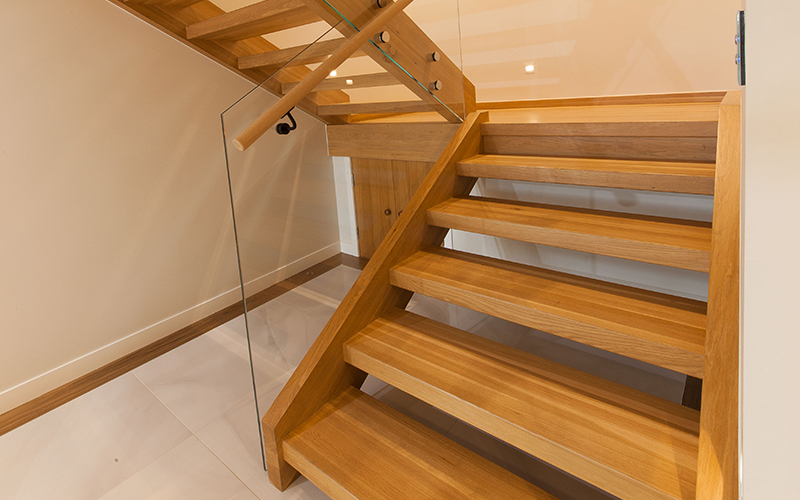 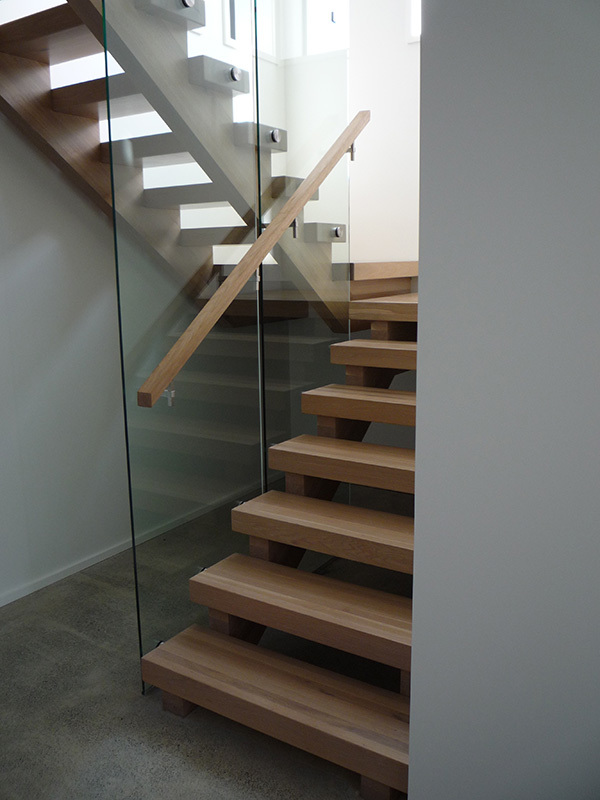 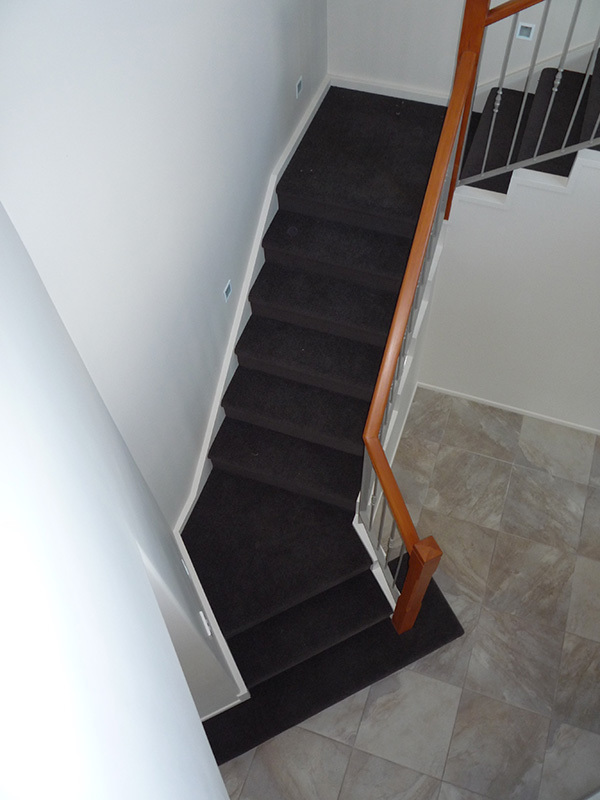 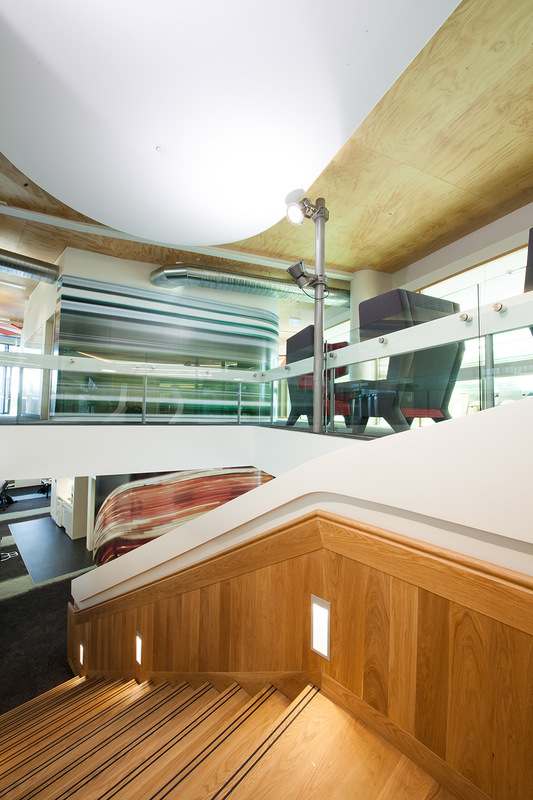 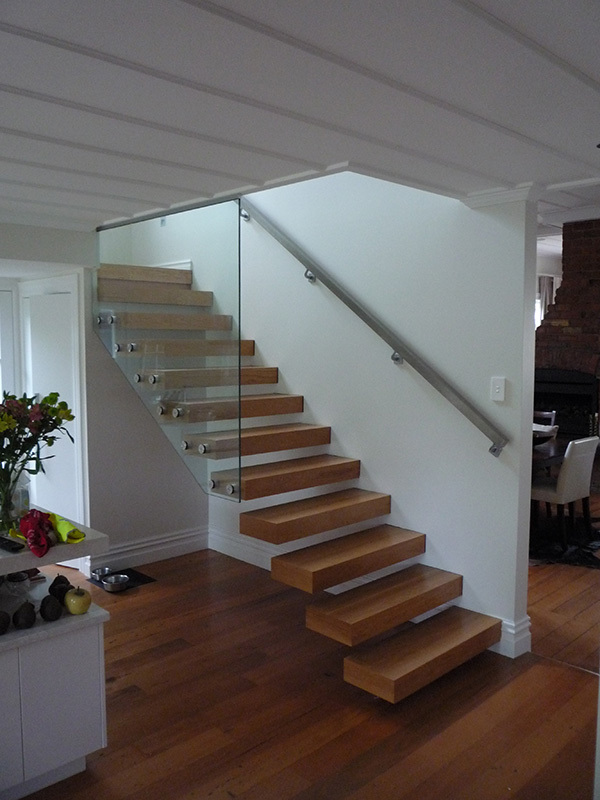 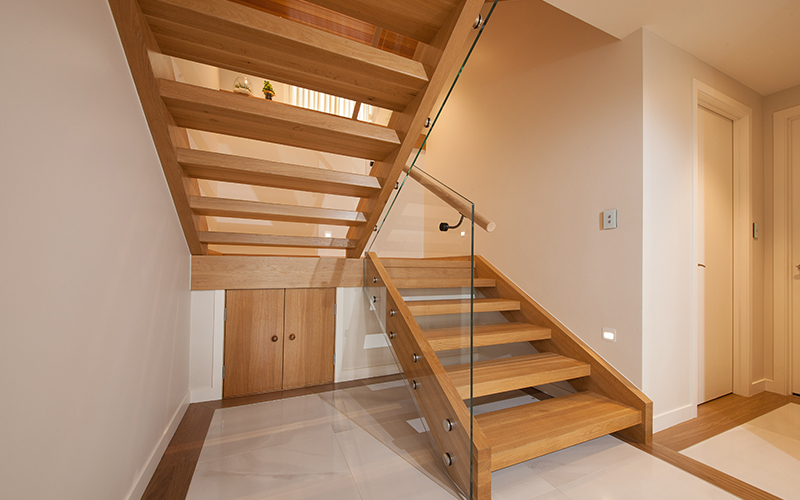 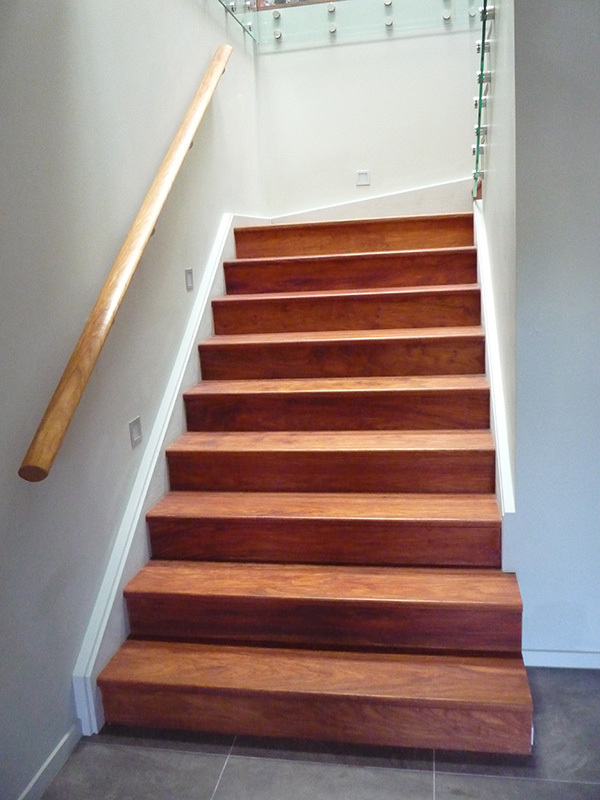 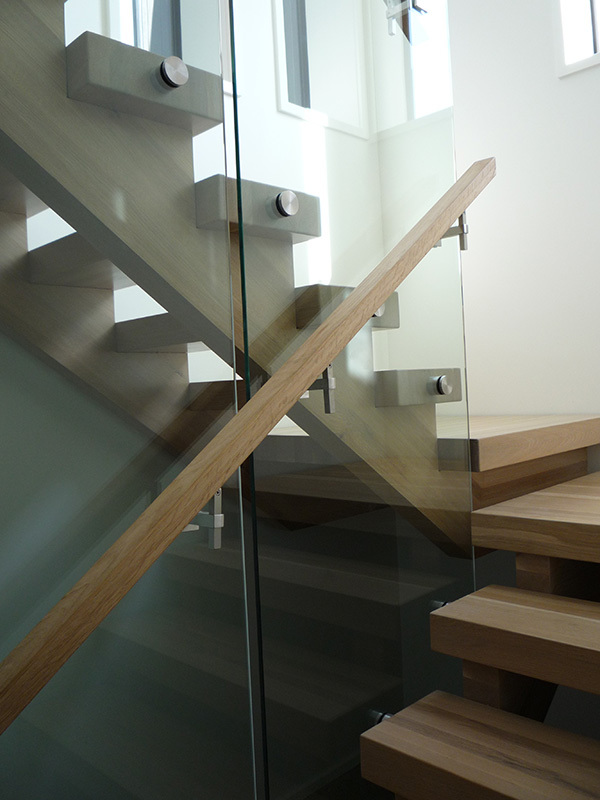 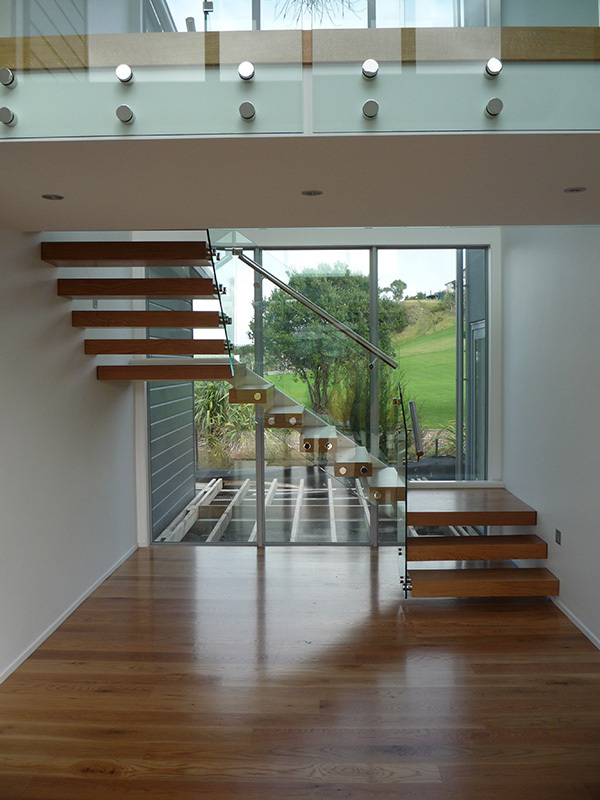 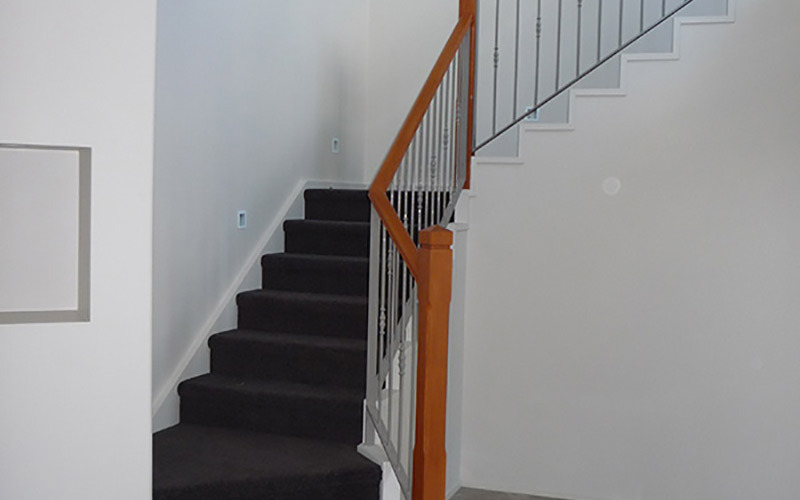 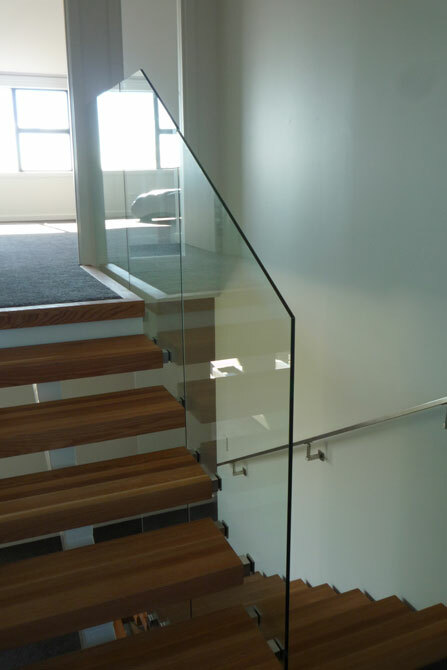 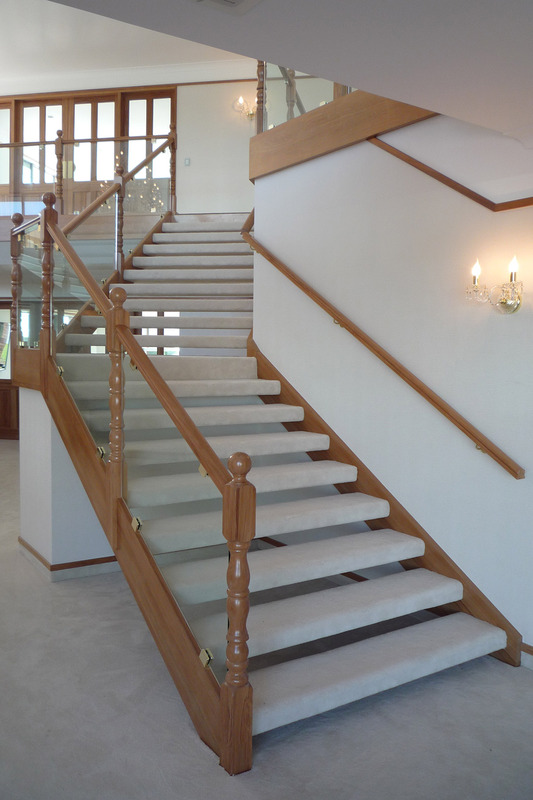 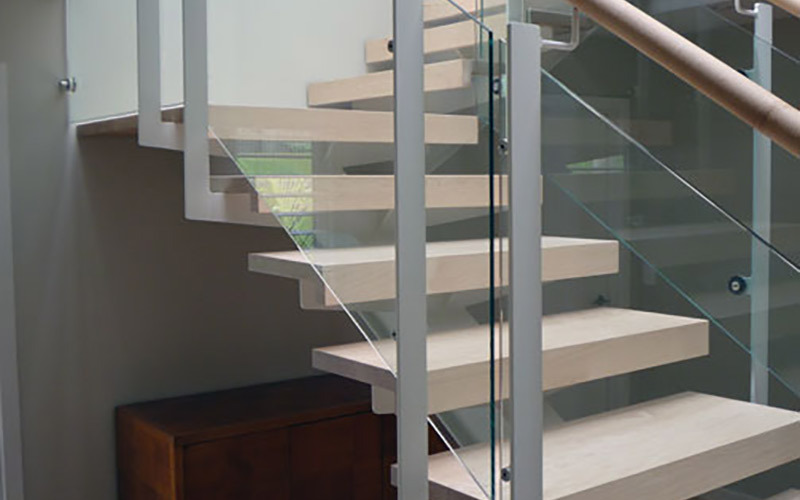 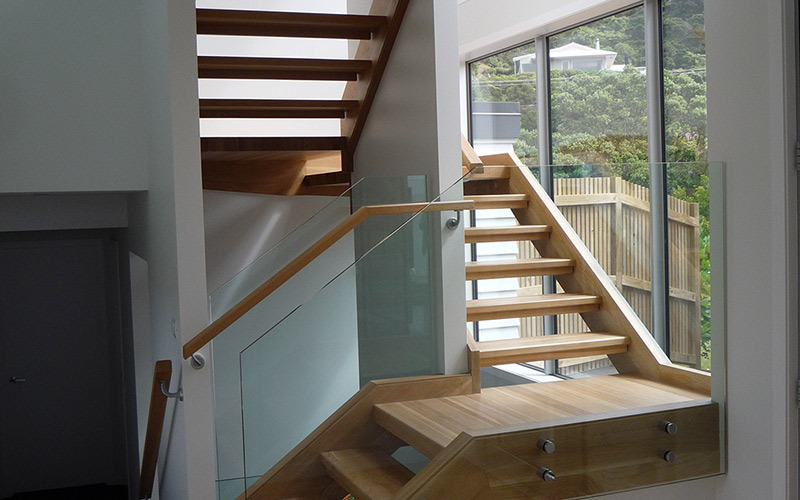 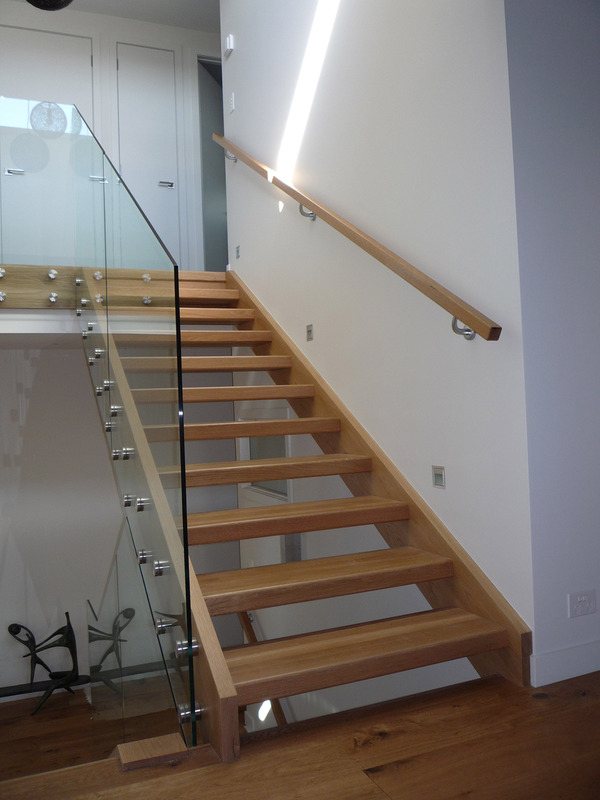 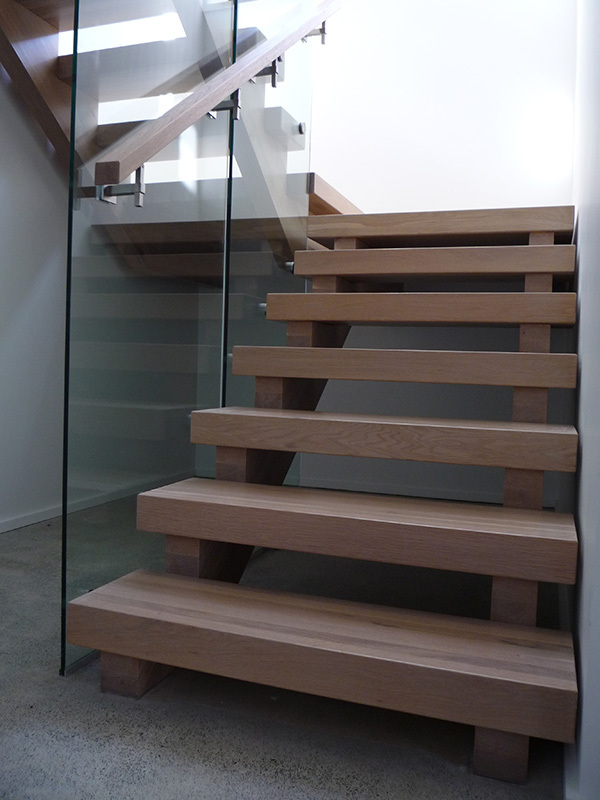 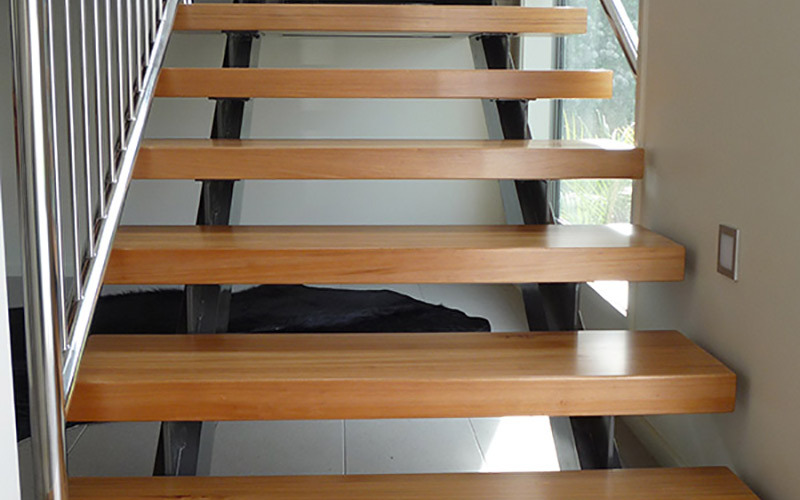 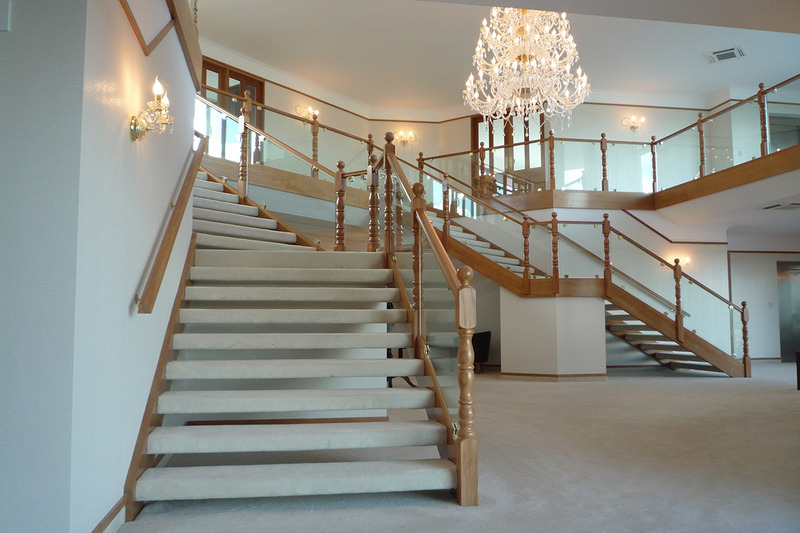 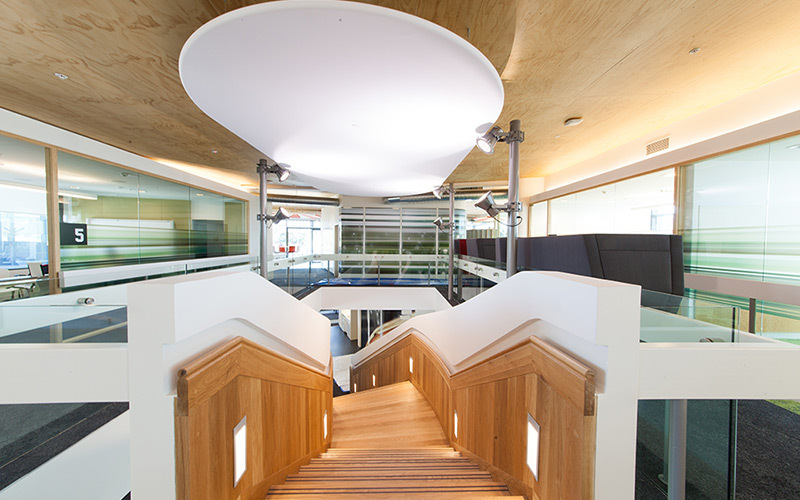 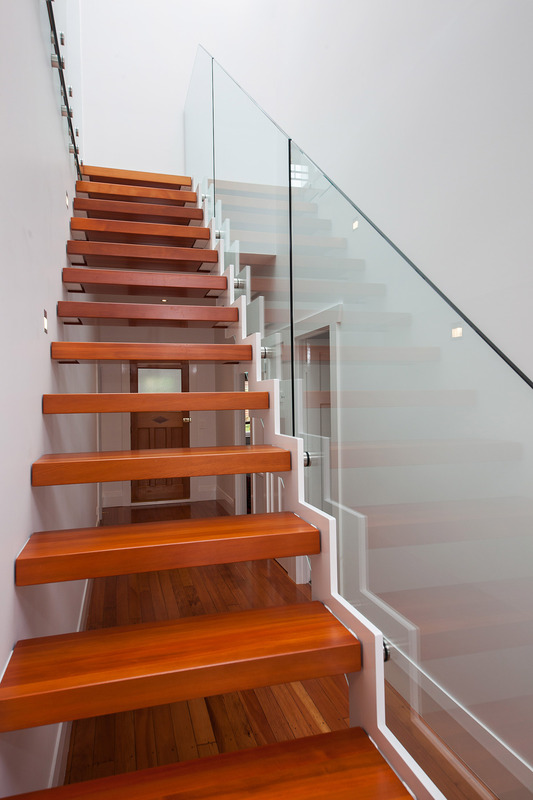 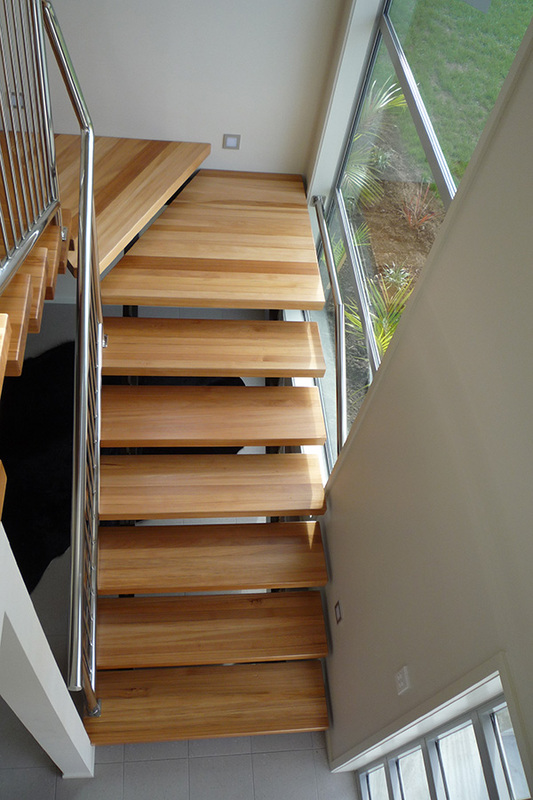 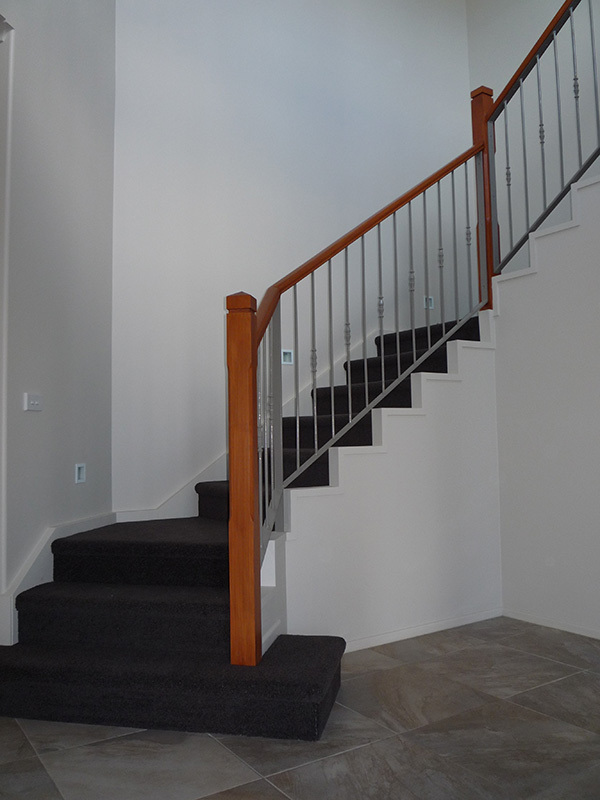 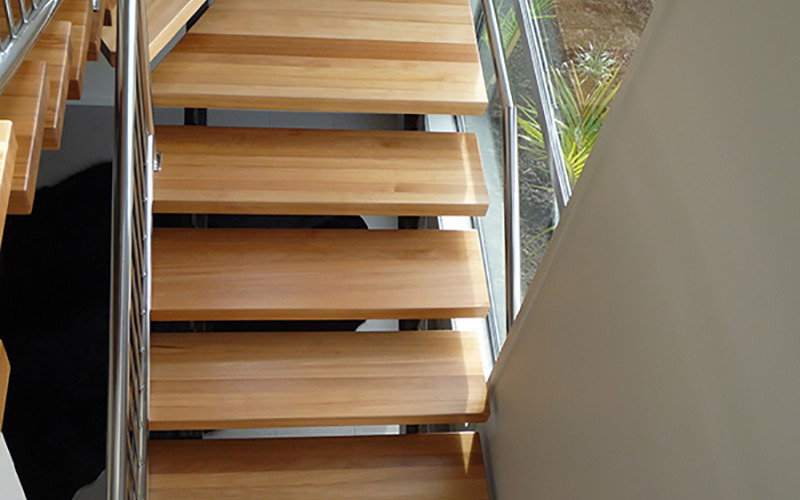 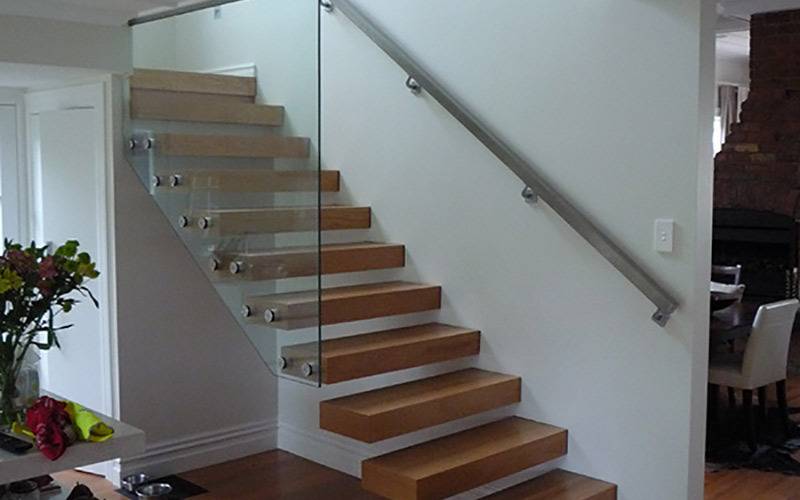 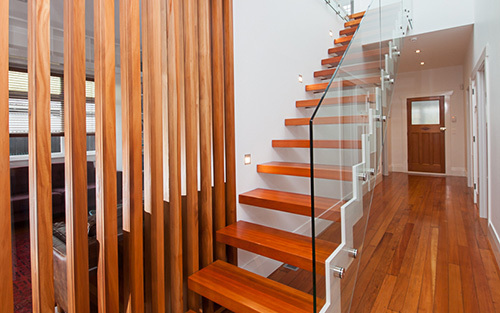 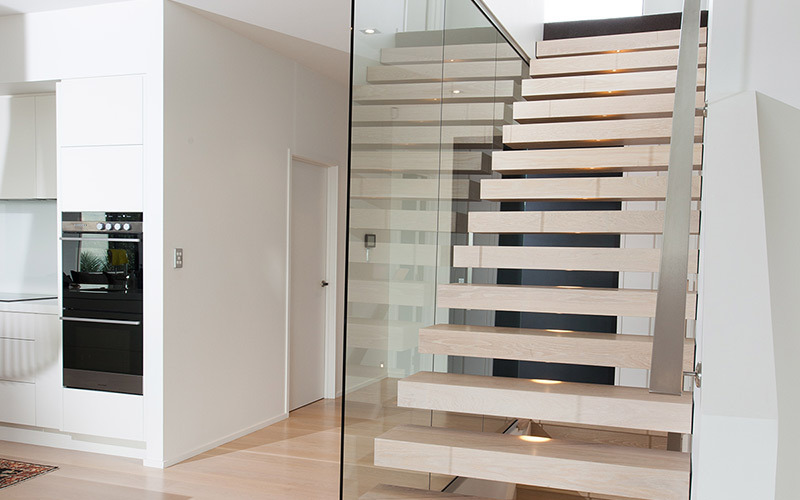 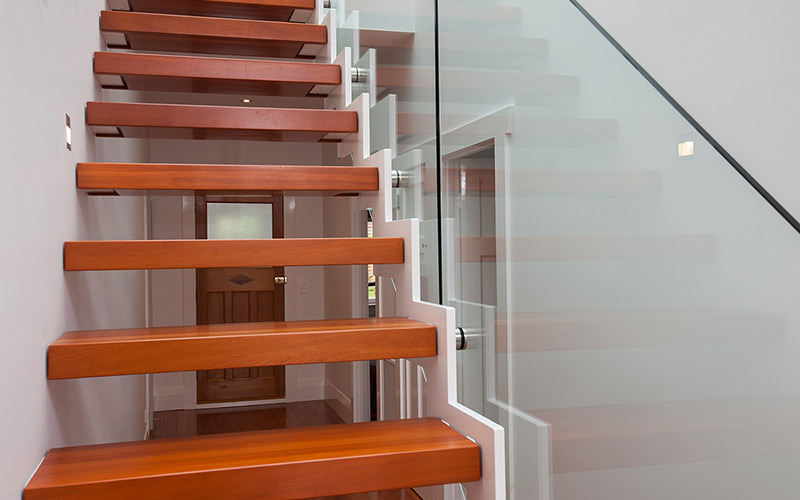 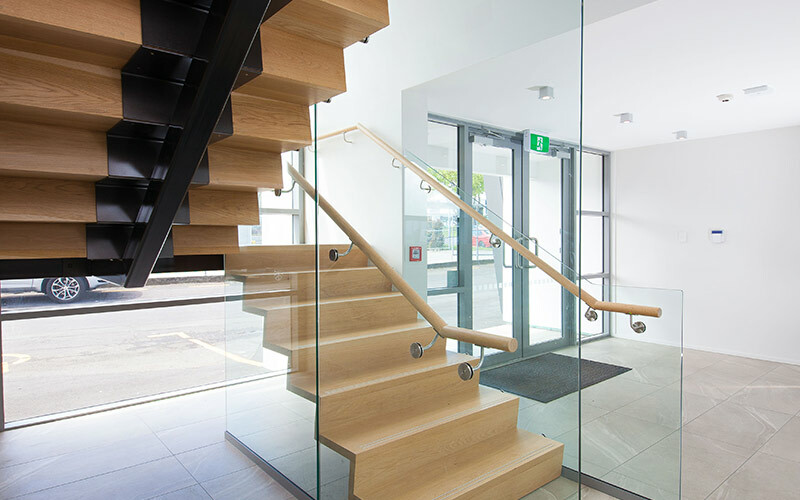 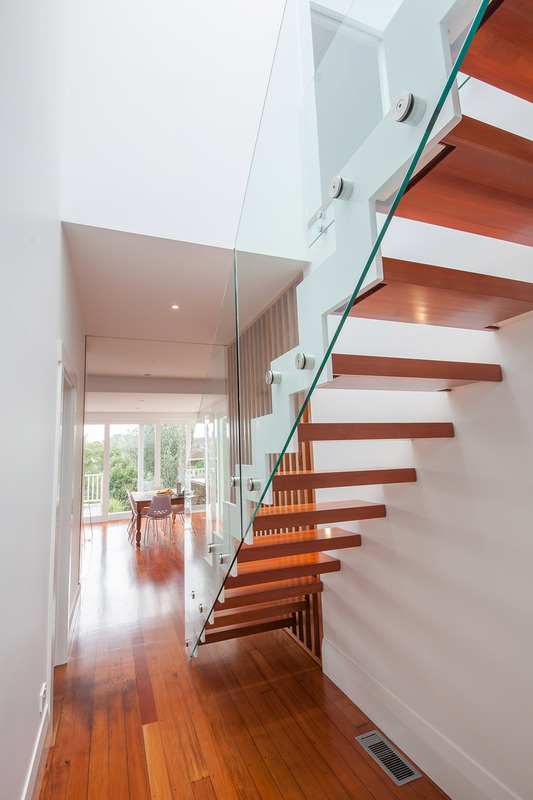 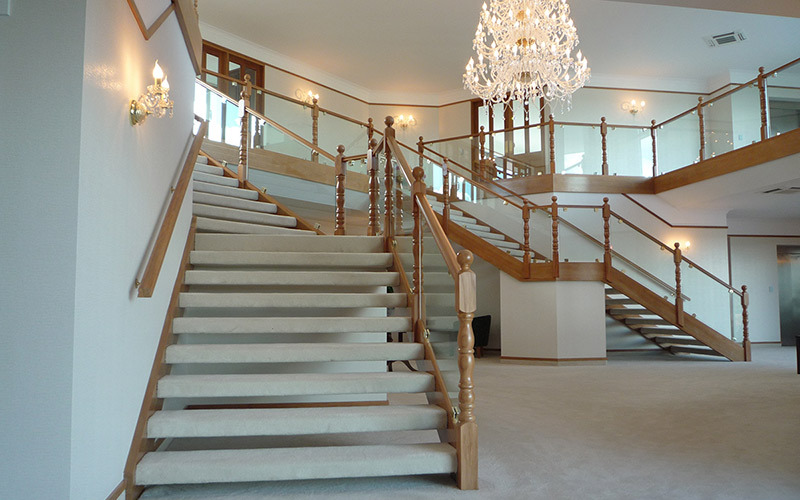 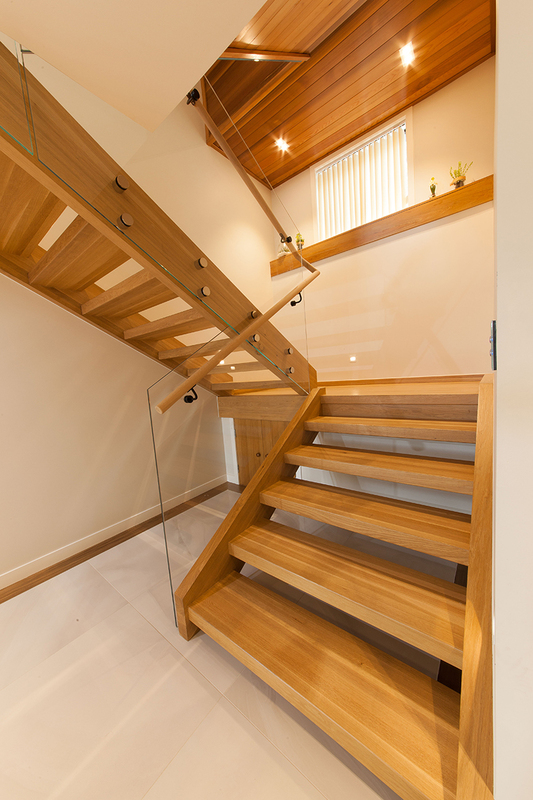 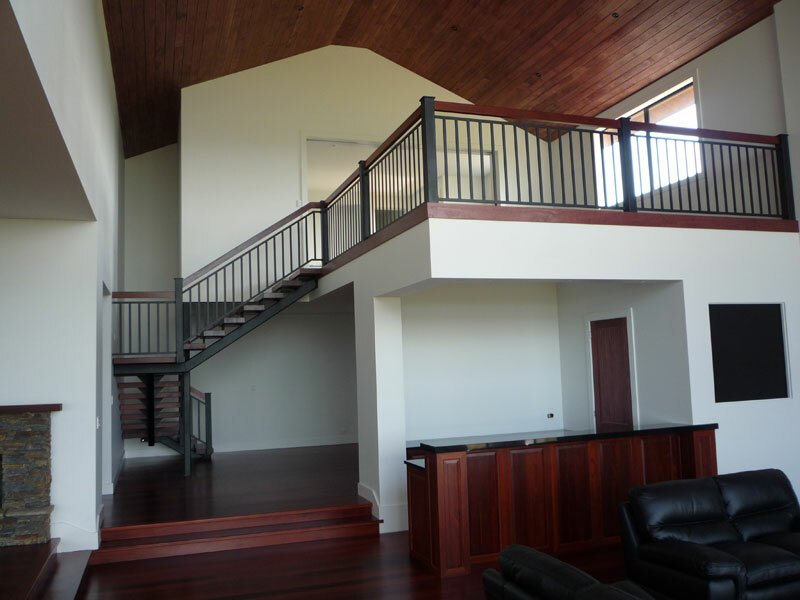 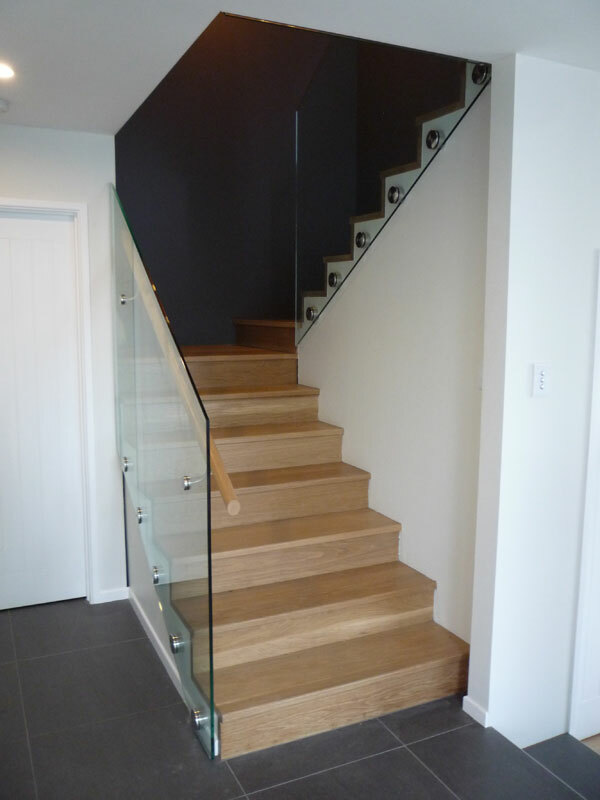 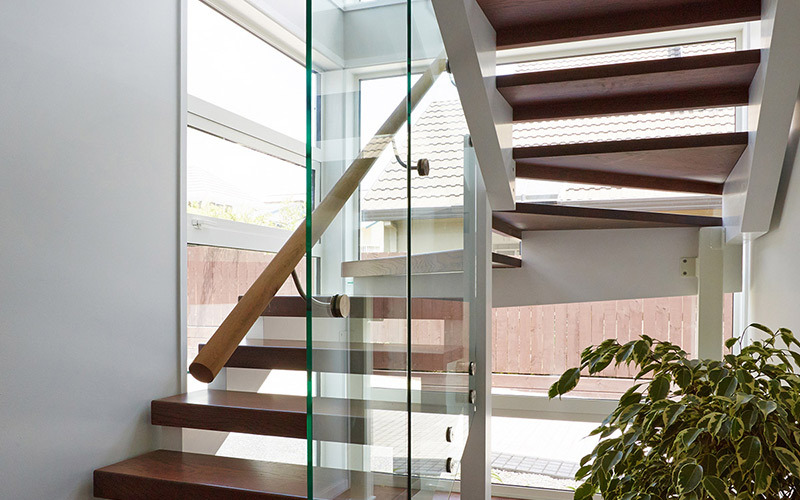 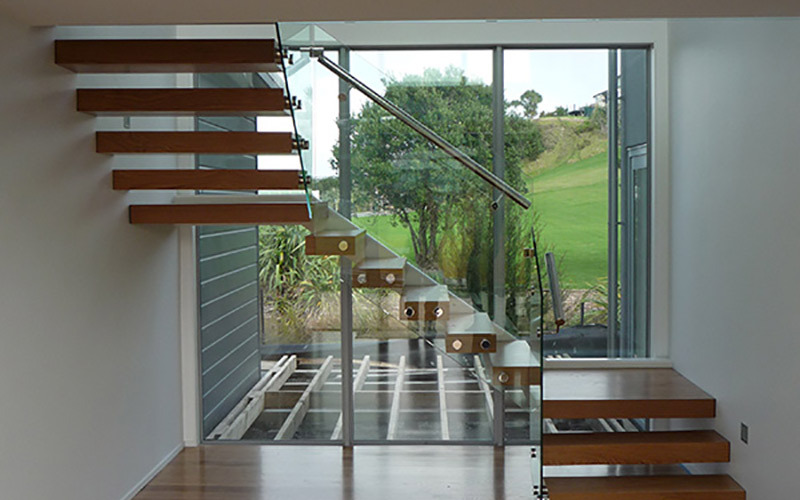 Ackworth House has been designing, manufacturing, and installing staircases in New Zealand for over 40 years. 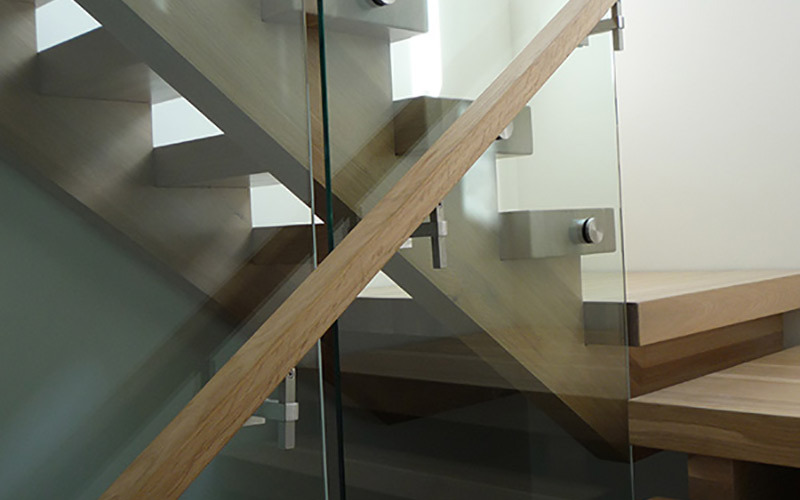 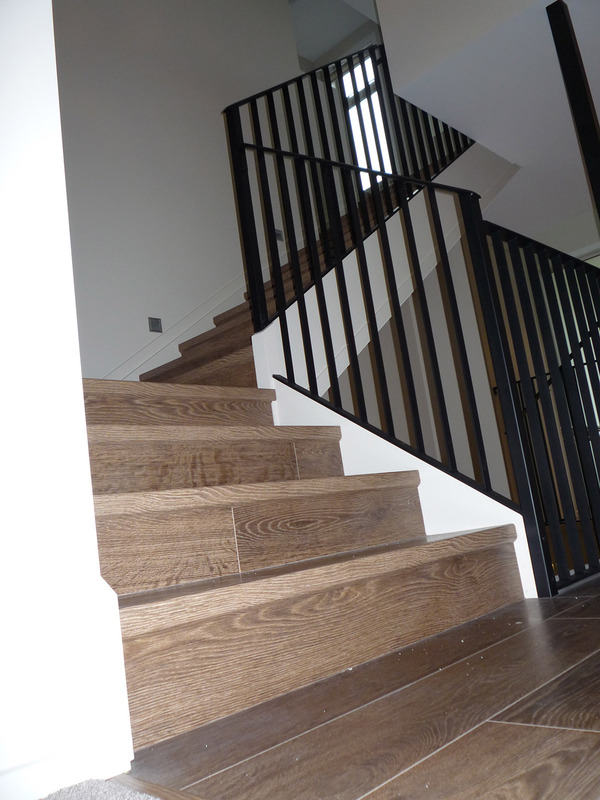 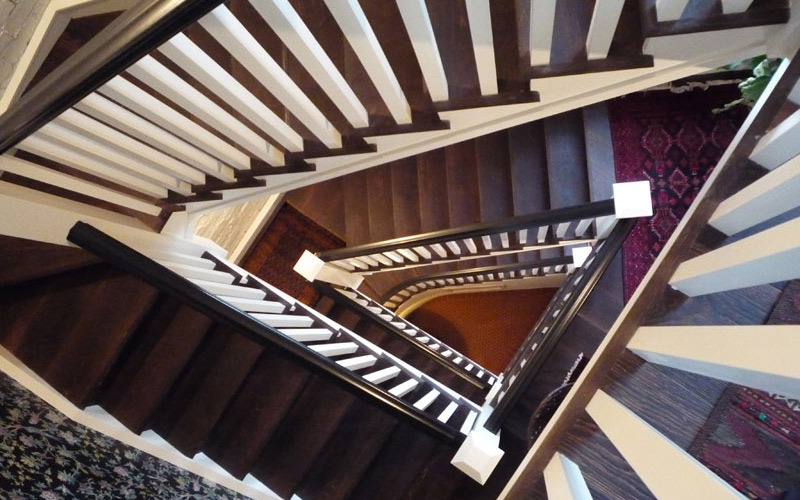 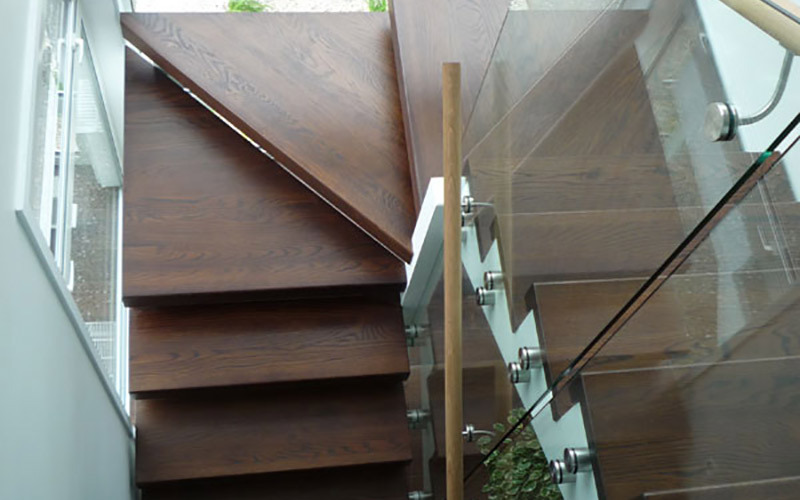 Our team of experts work closely with you to incorporate your staircase design needs into the final plans. 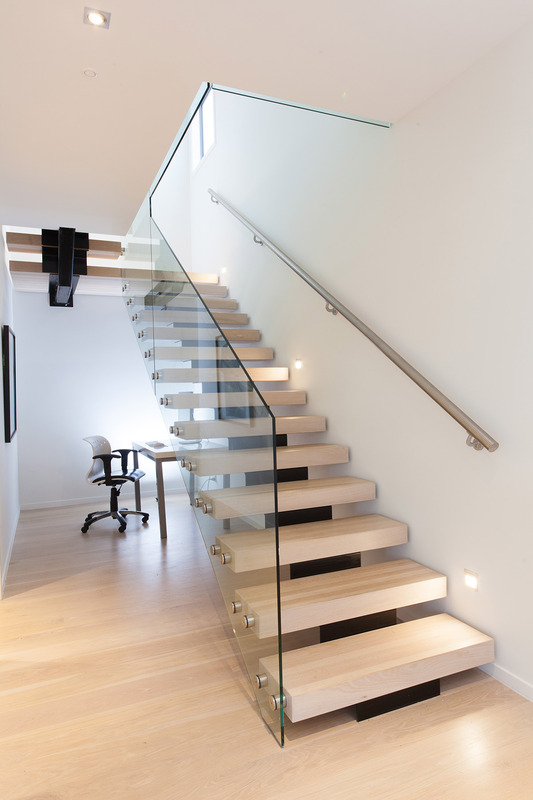 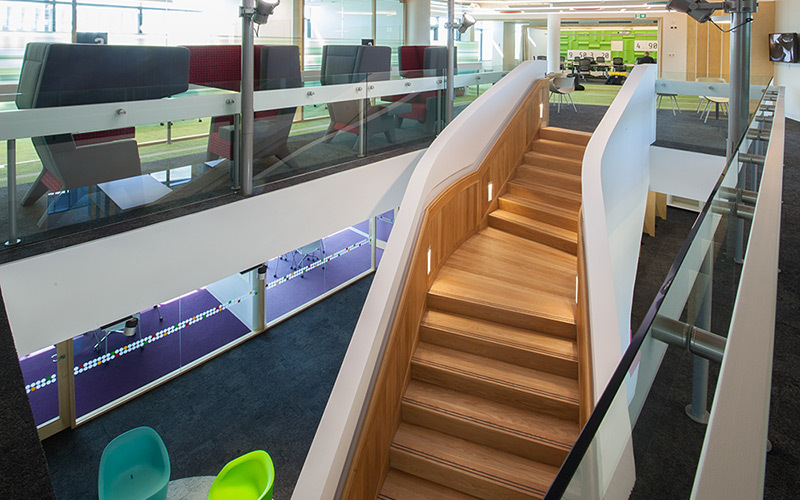 We have a wide array of existing designs to choose from, including our Ascendo series which feature floating staircases. 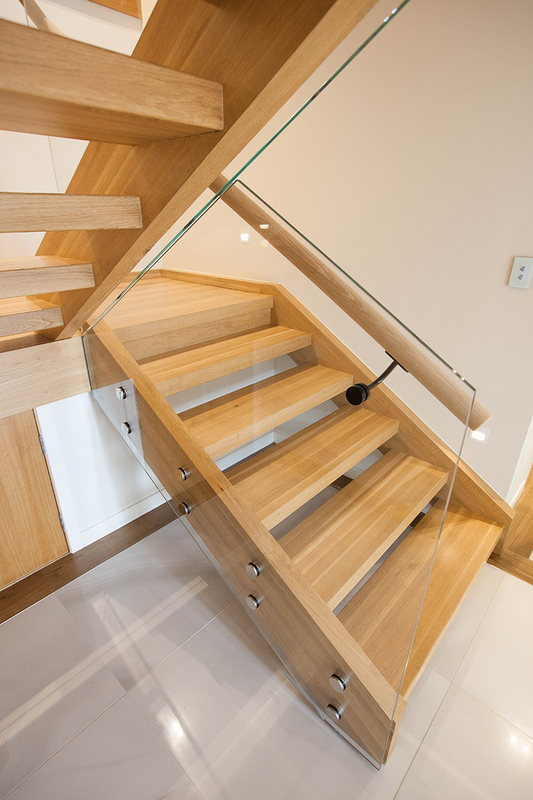 For more information about our different staircase designs, get in touch with us by sending an enquiry here.